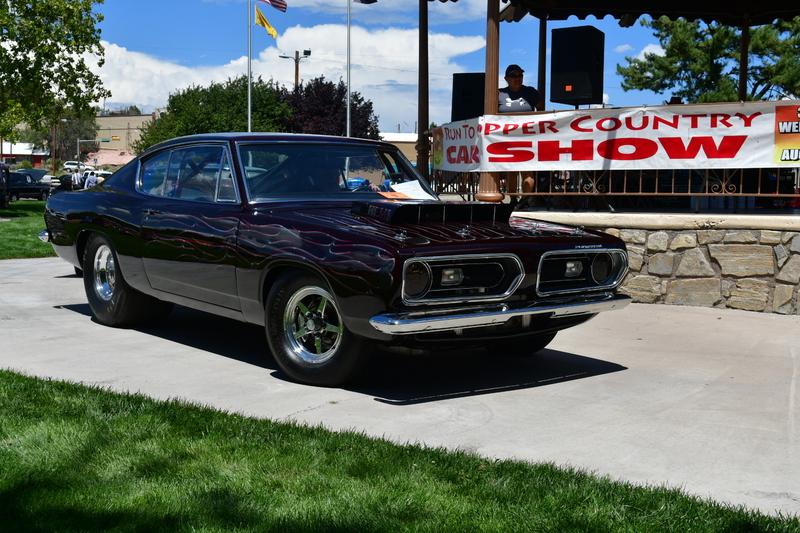 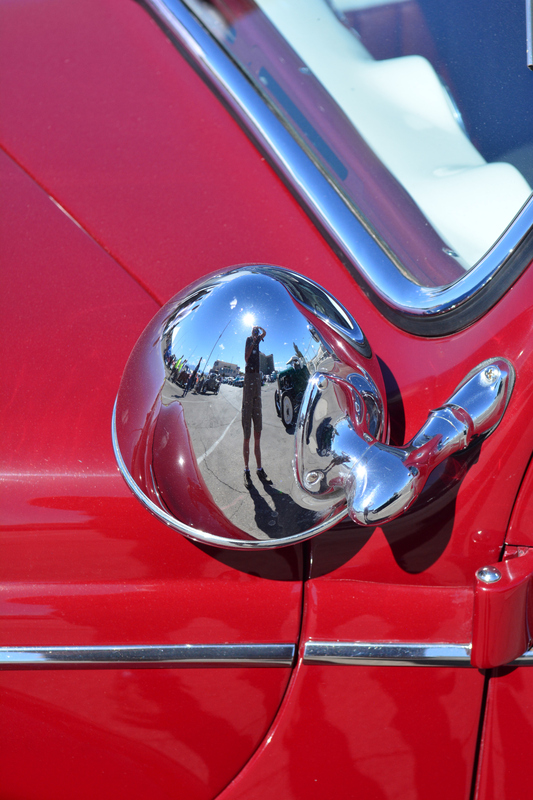 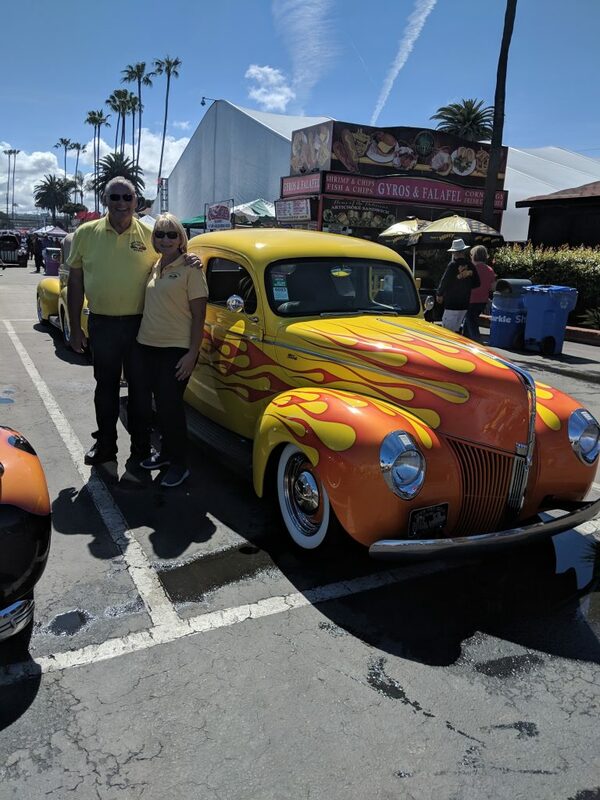 I am generally on the look out for new car shows to attend, since for me the fun of it for me is the going and coming, seeing new places, having new cars to photograph and meeting new friends. 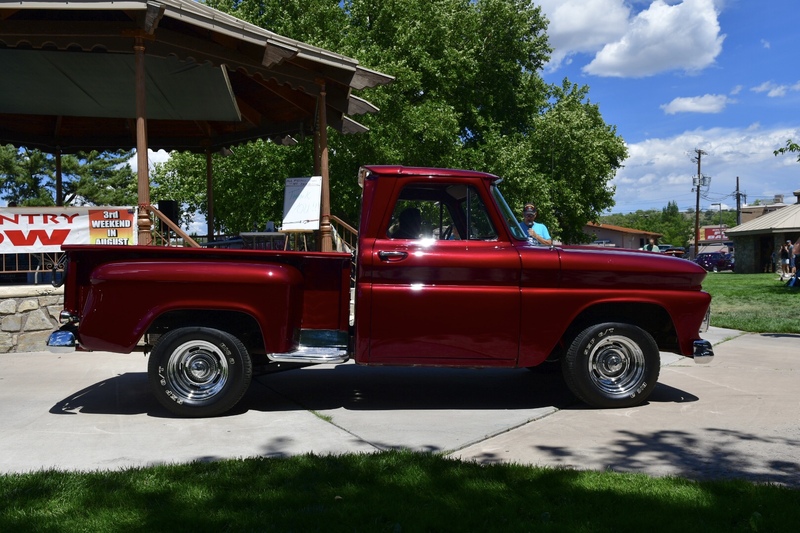 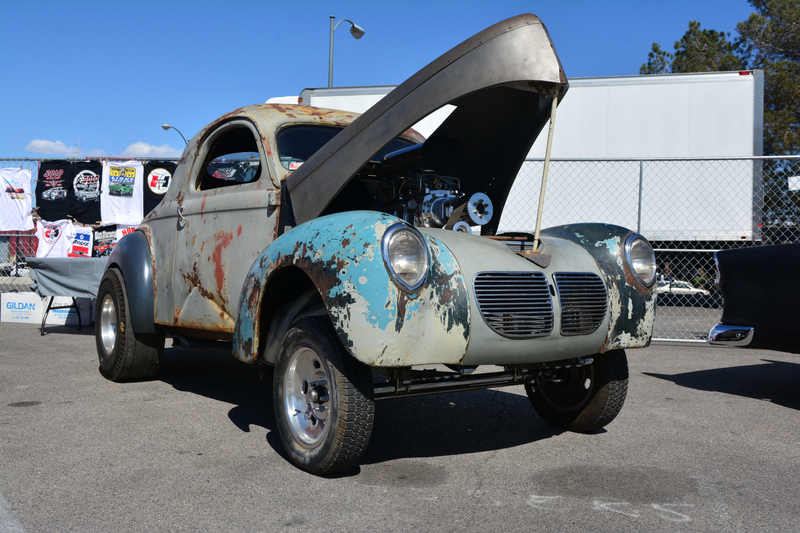 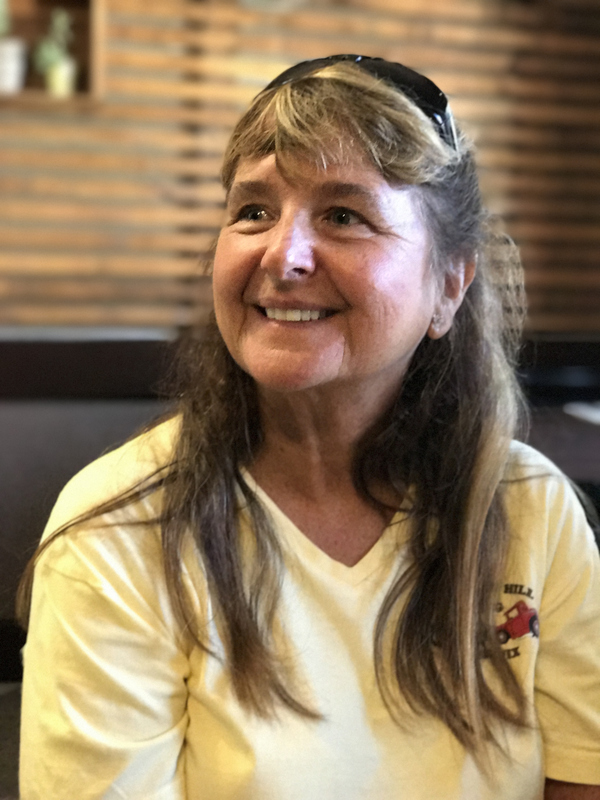 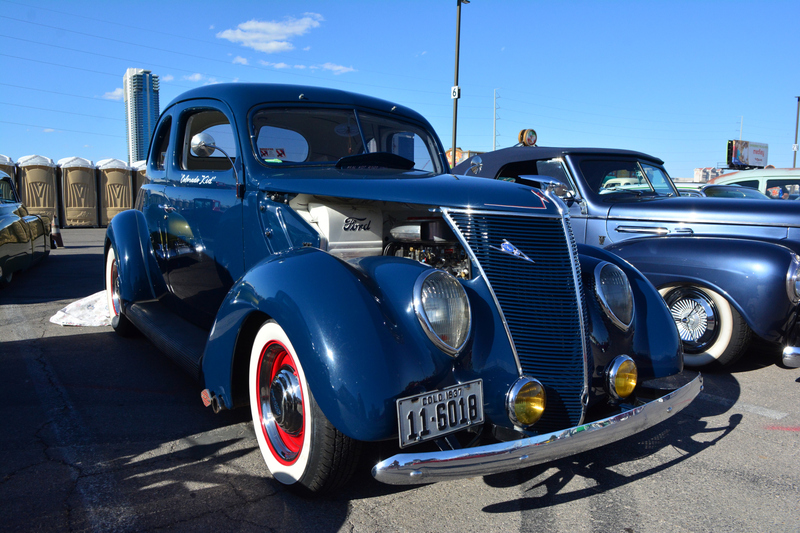 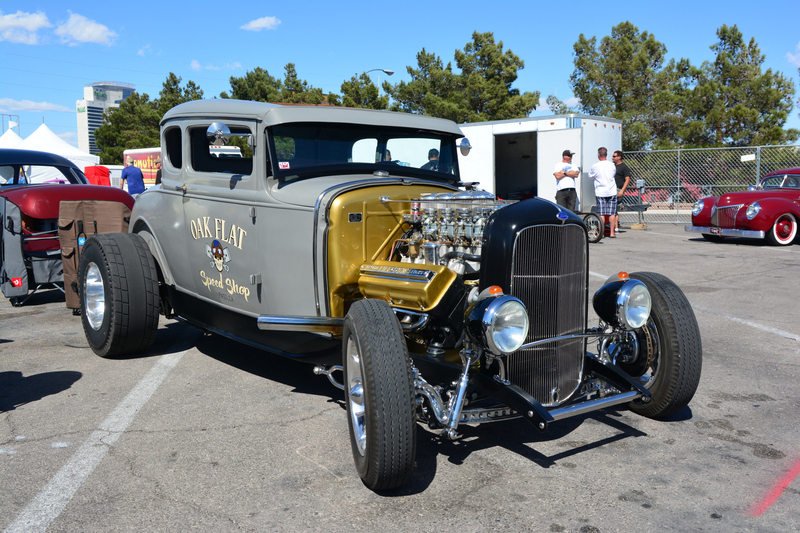 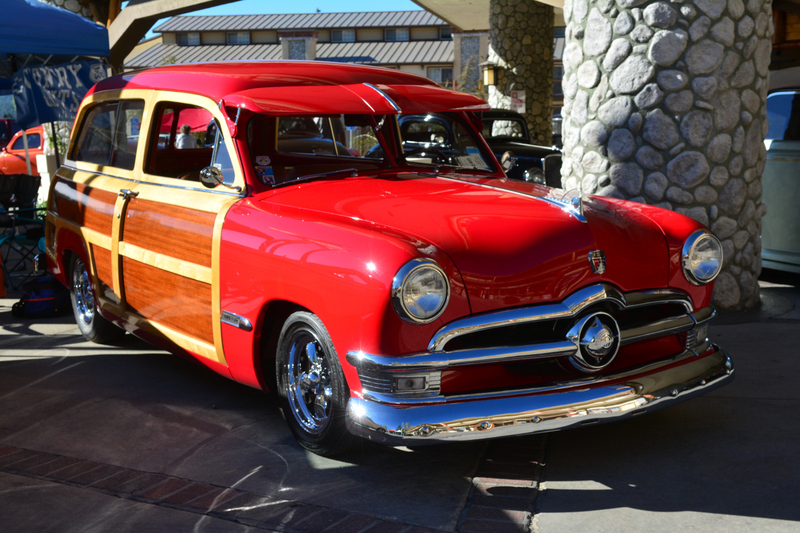 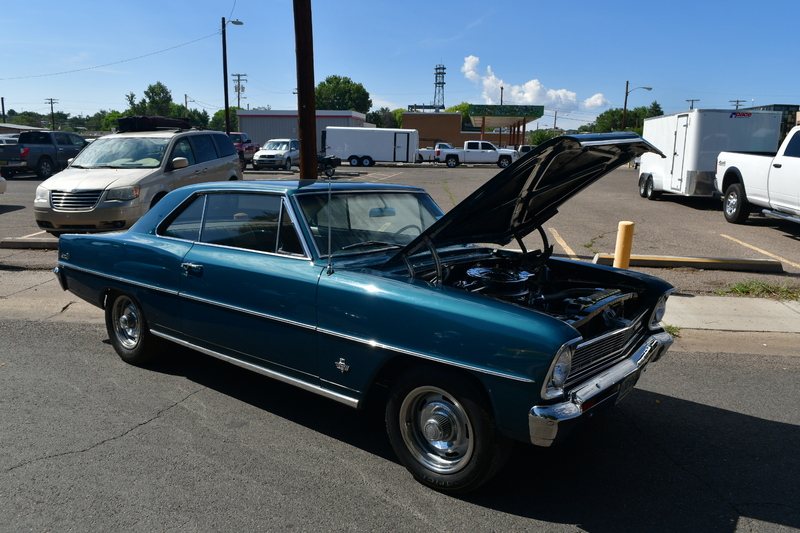 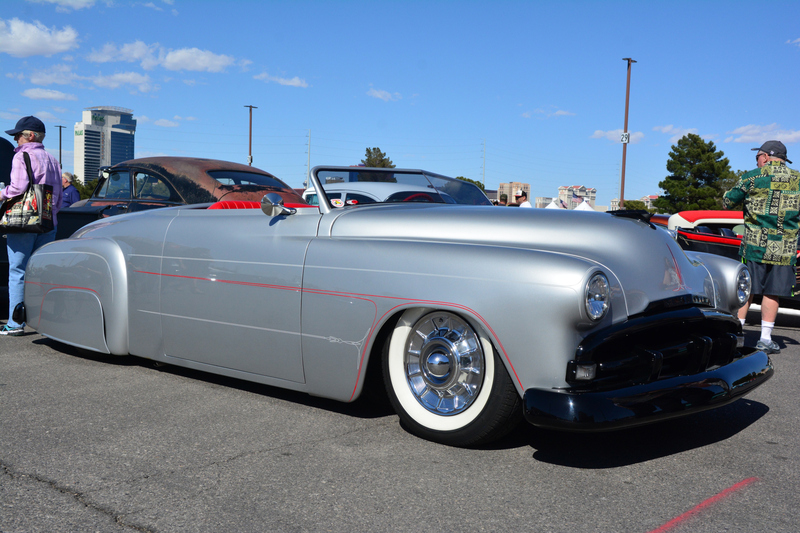 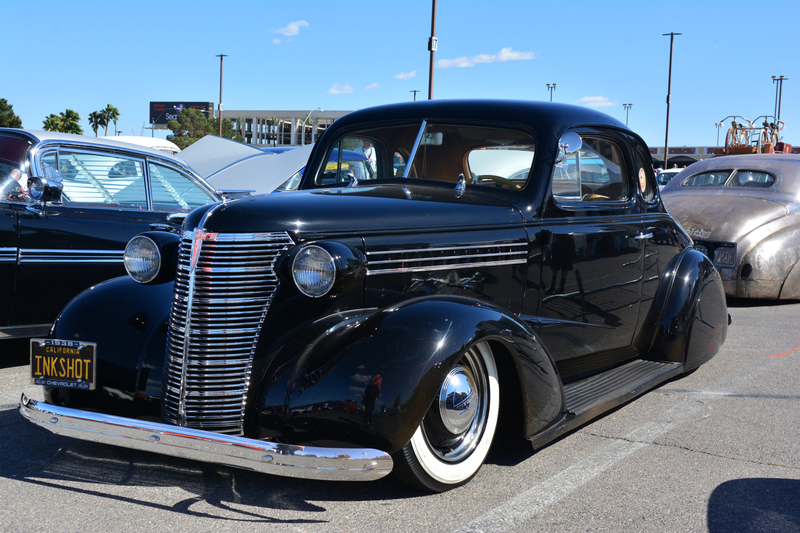 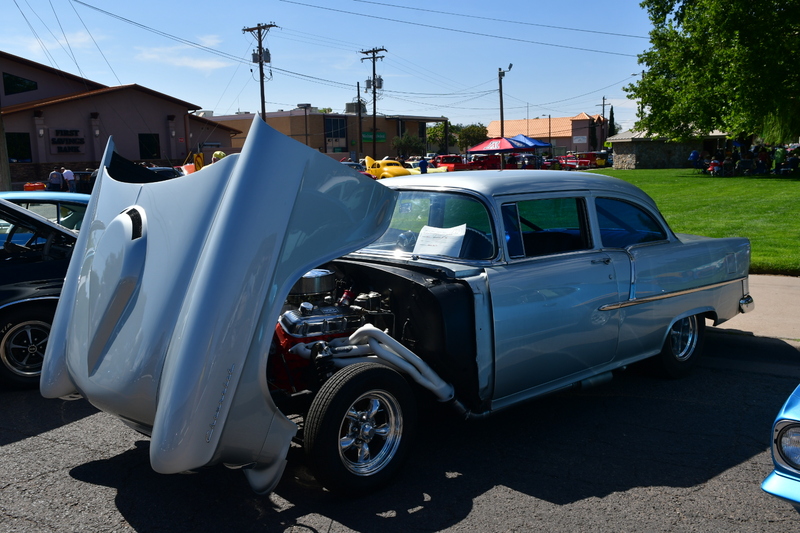 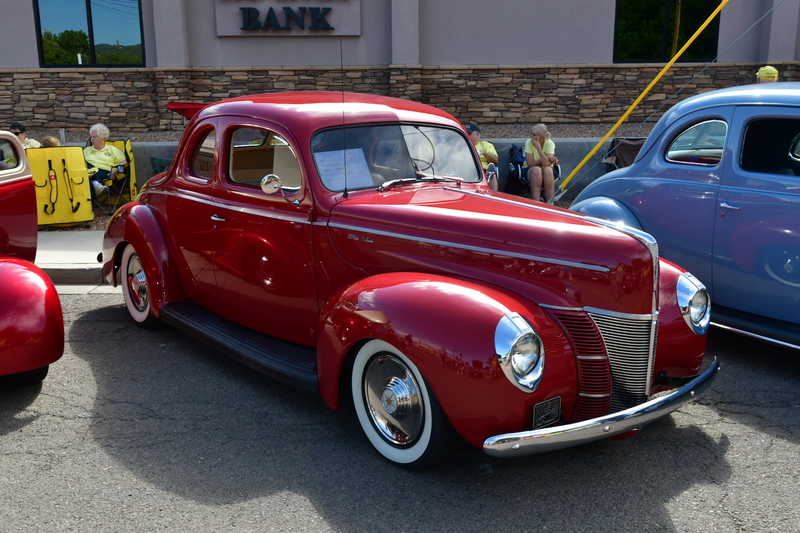 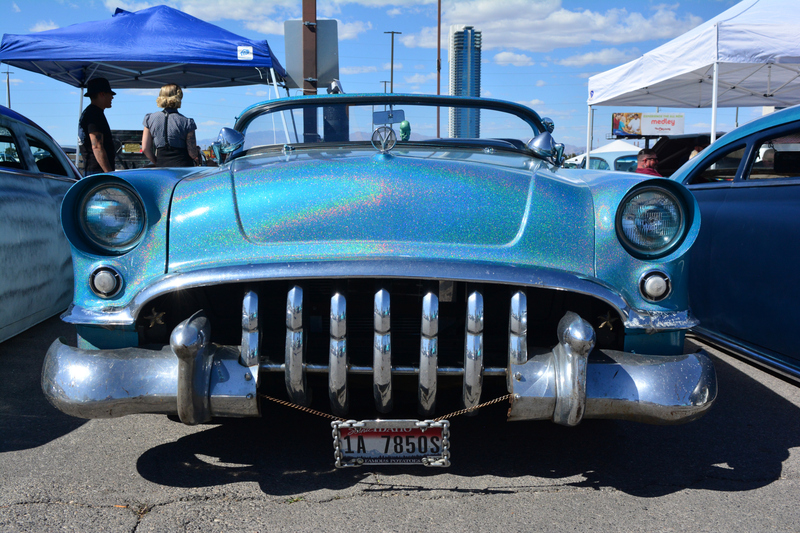 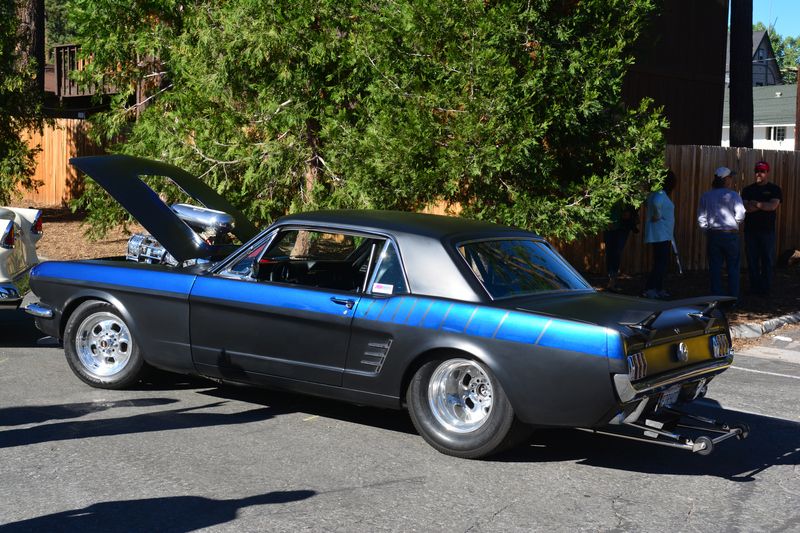 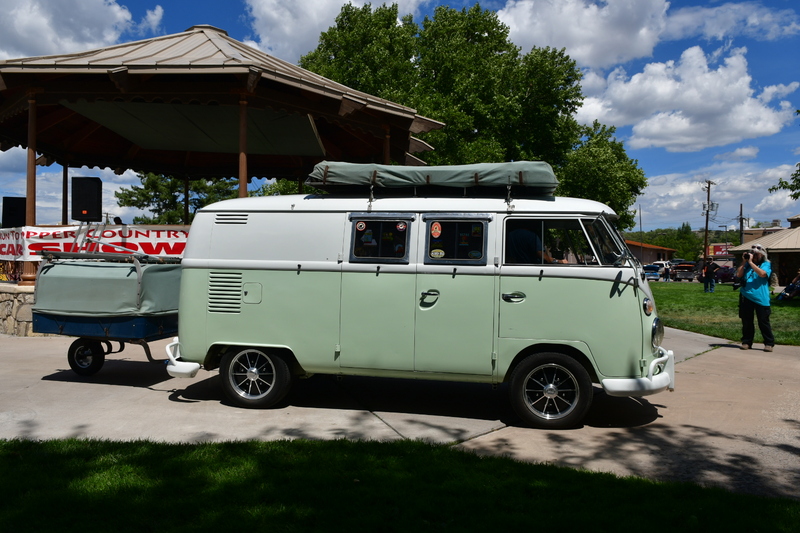 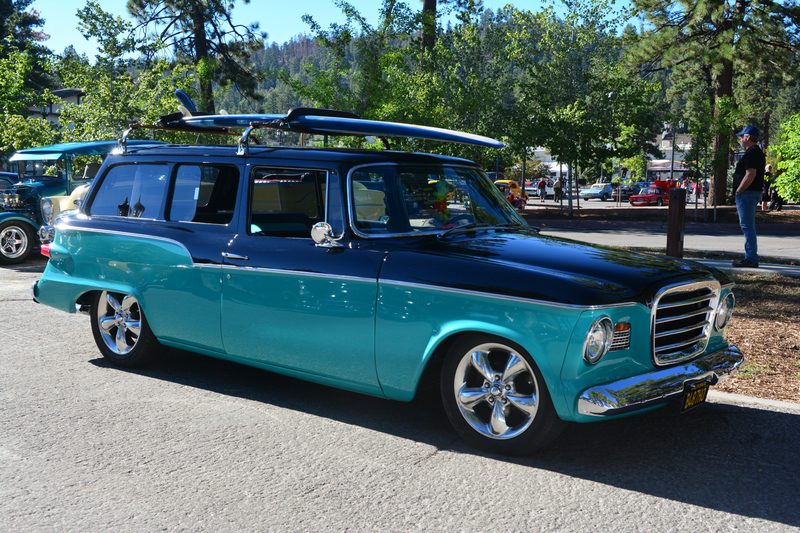 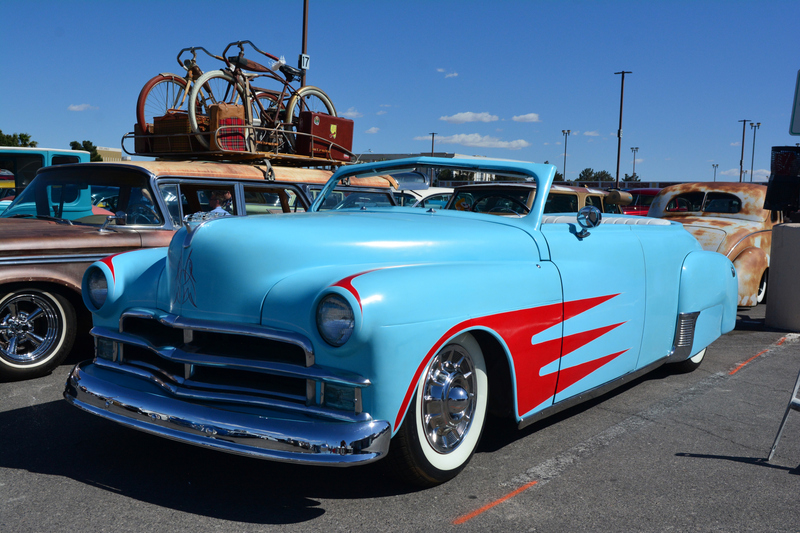 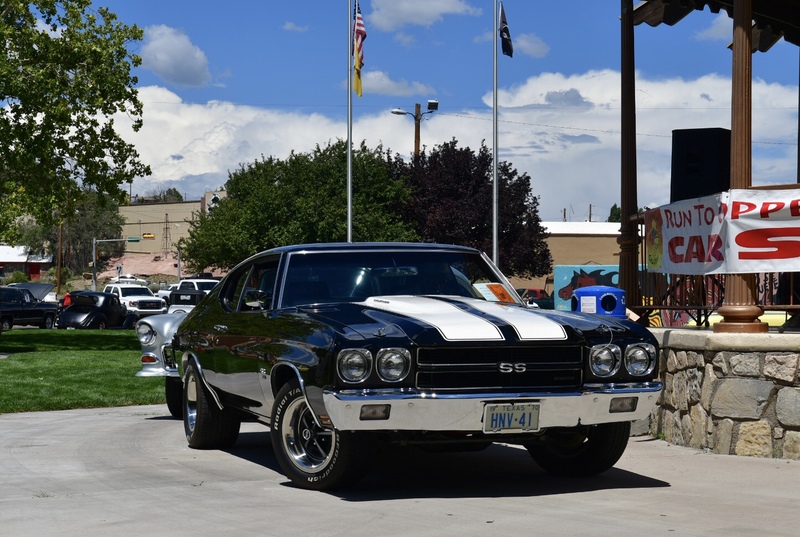 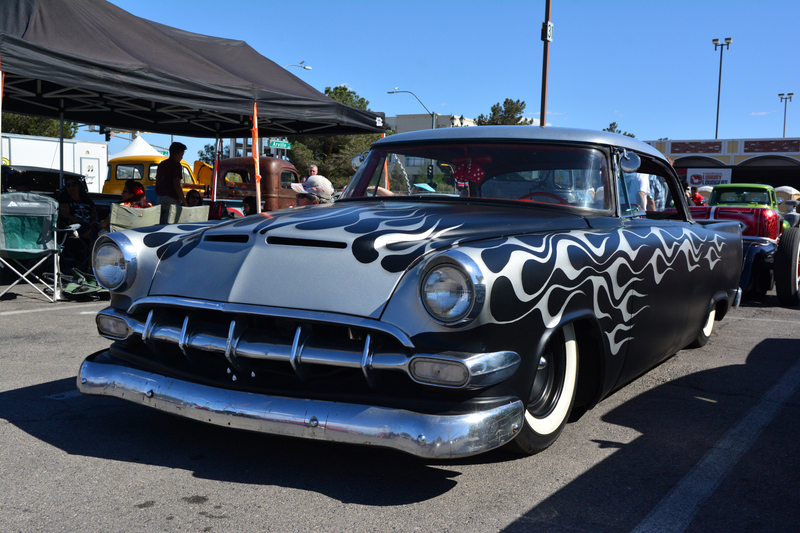 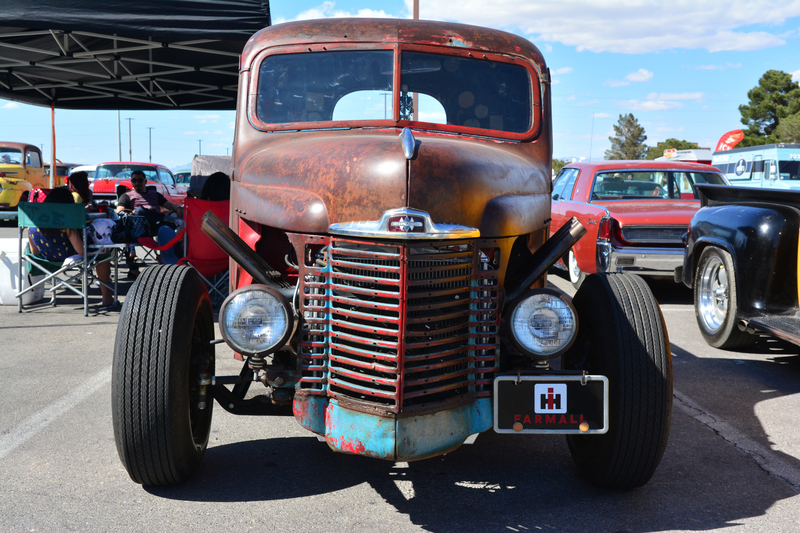 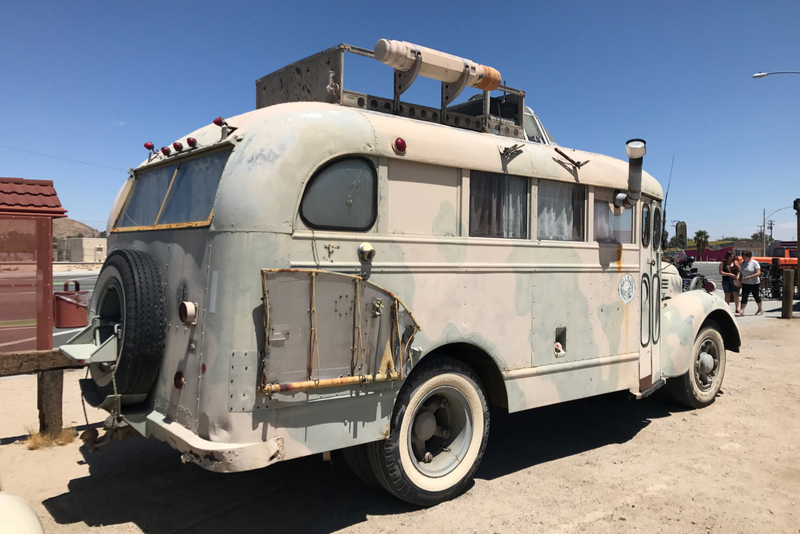 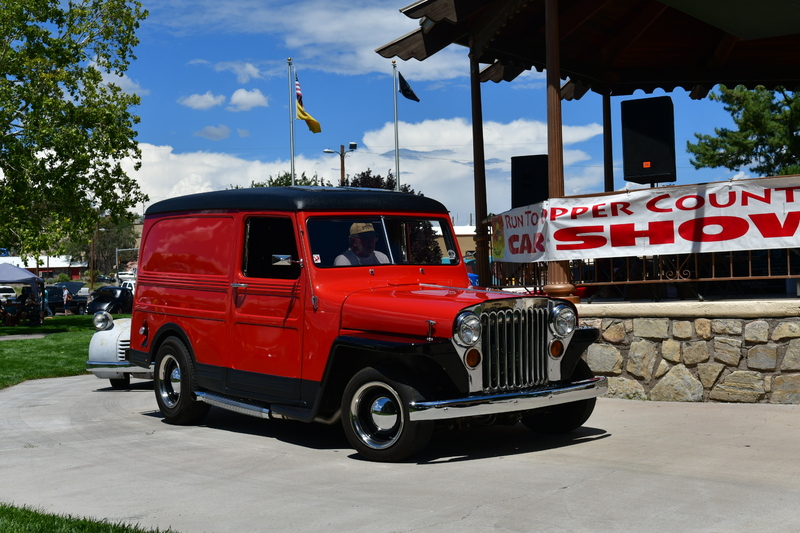 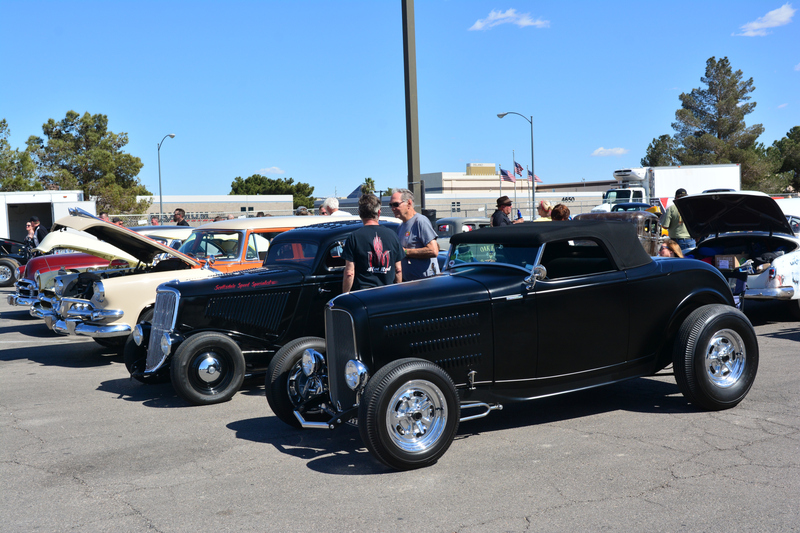 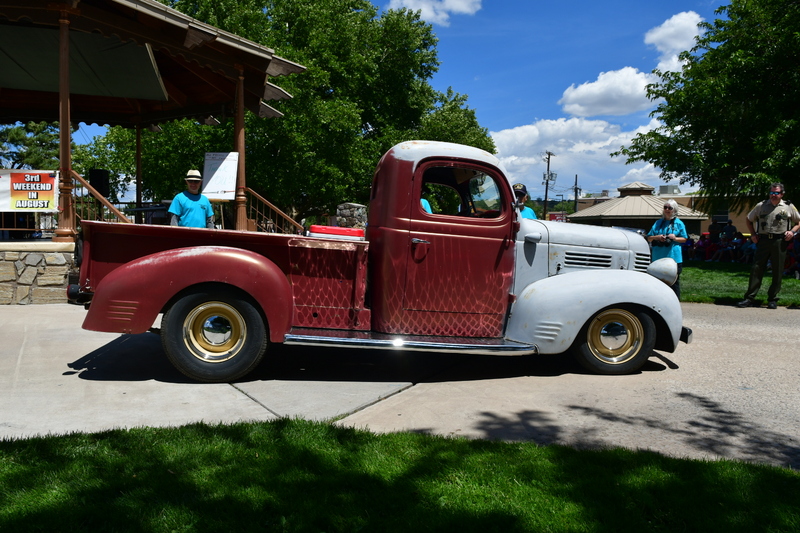 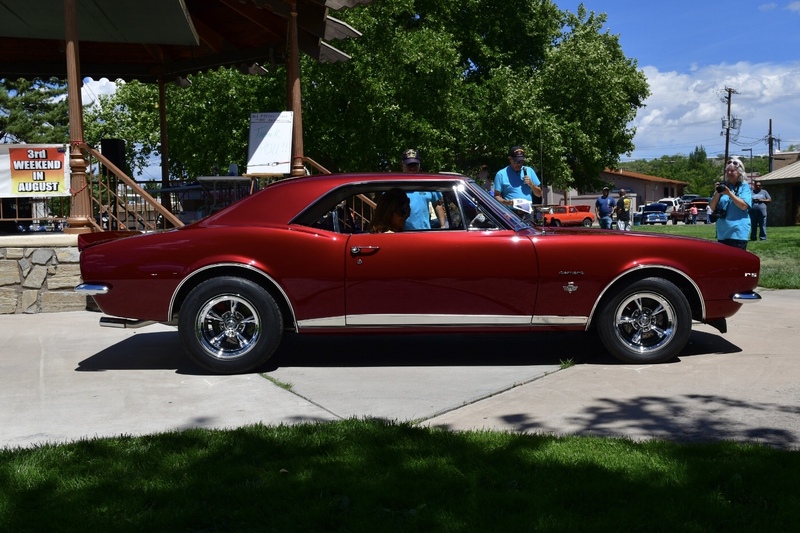 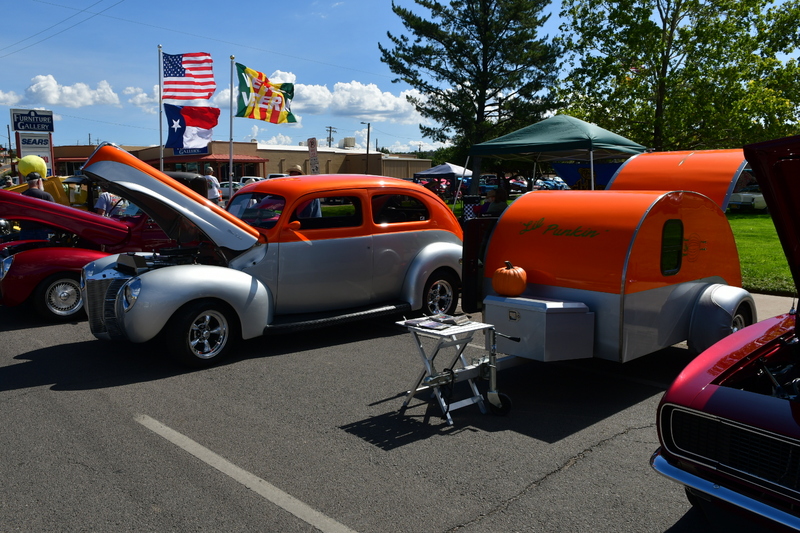 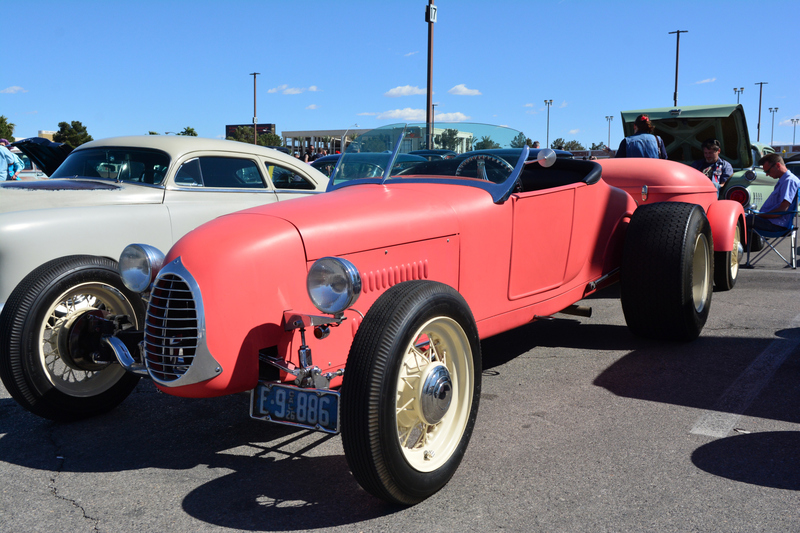 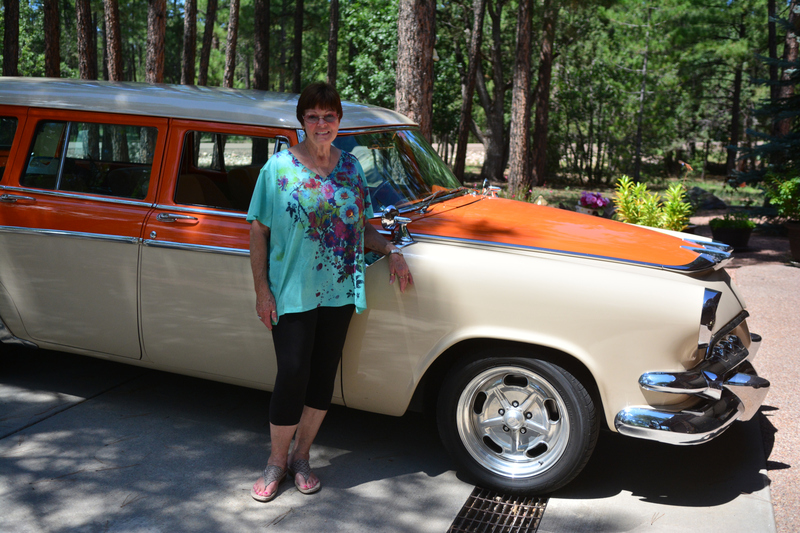 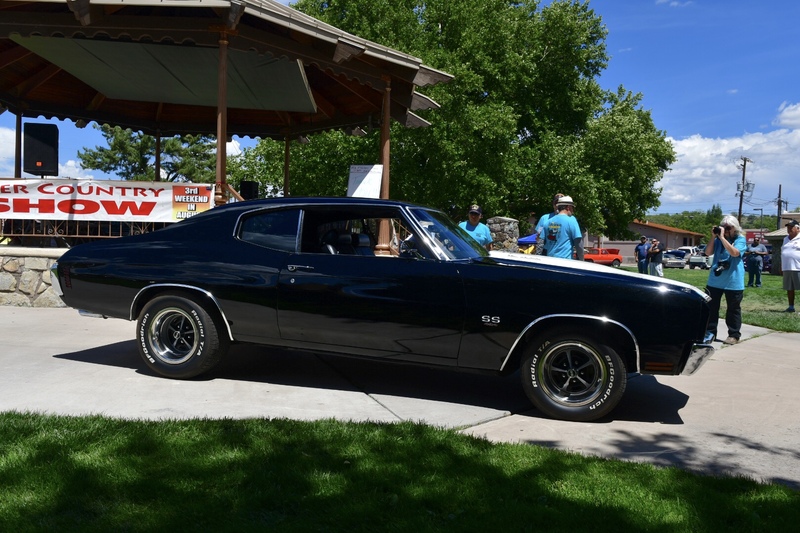 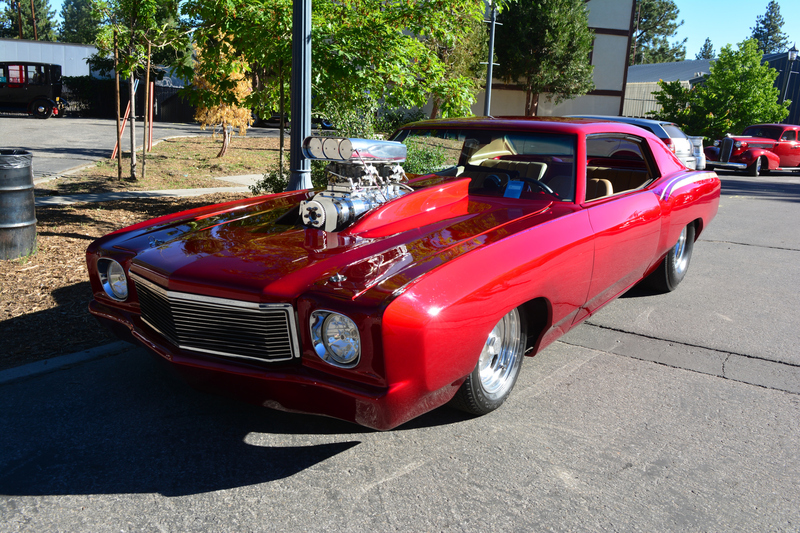 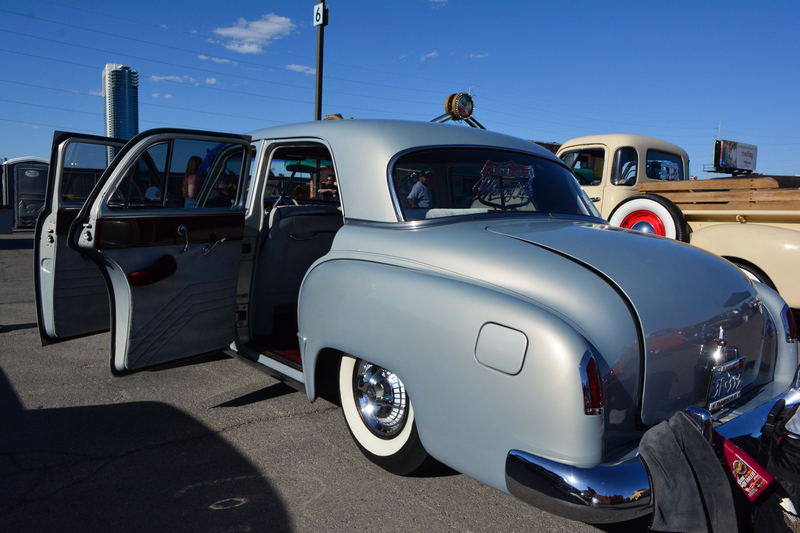 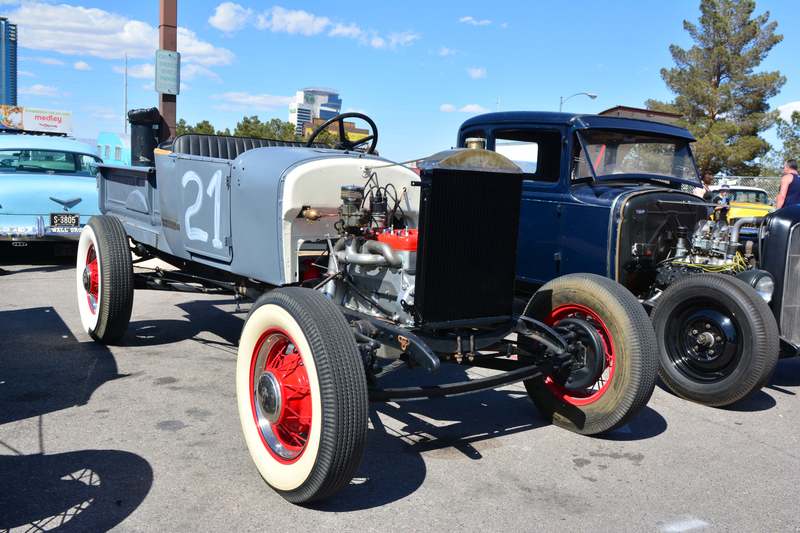 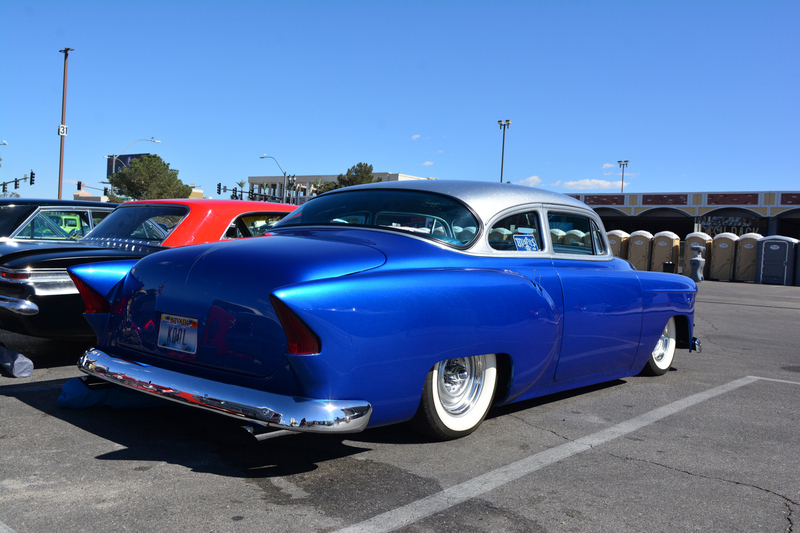 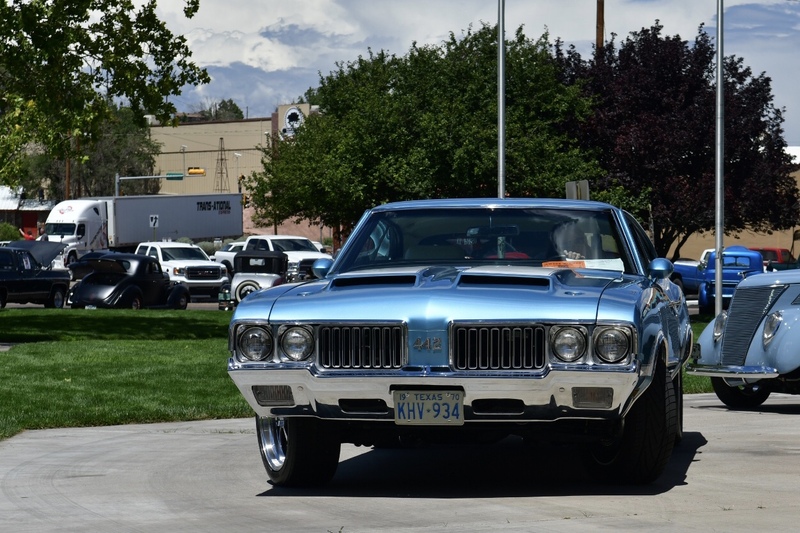 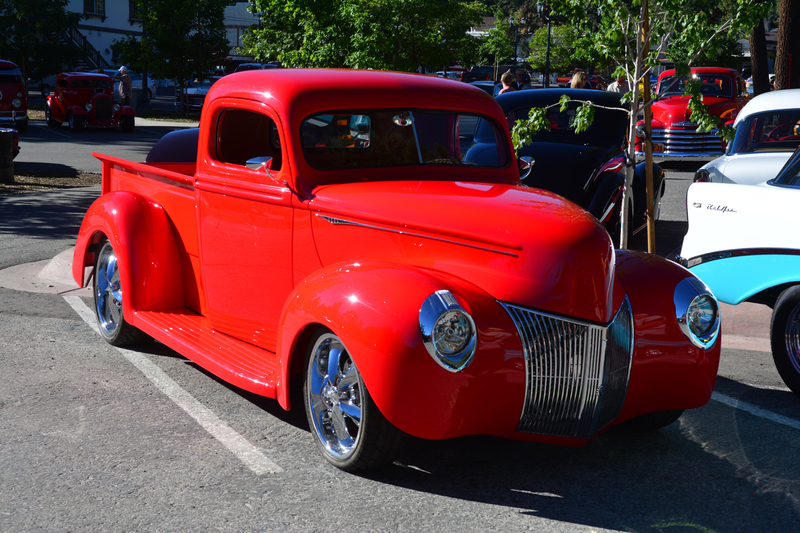 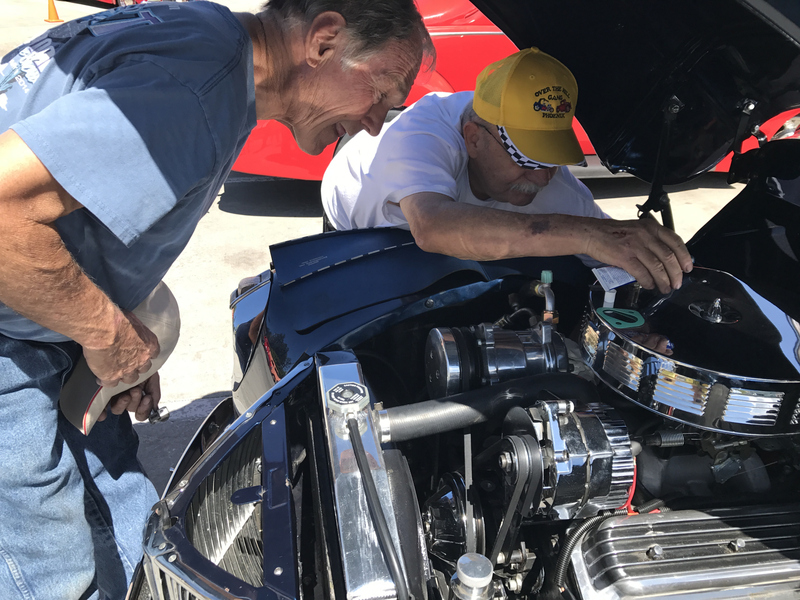 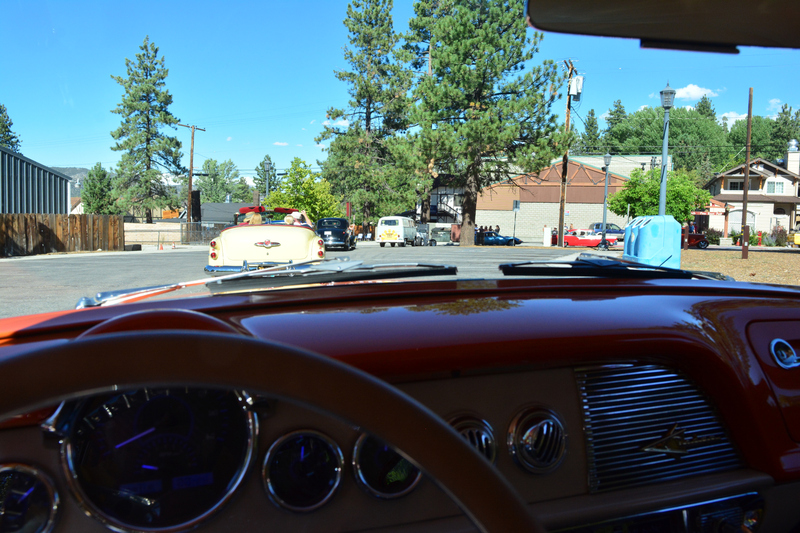 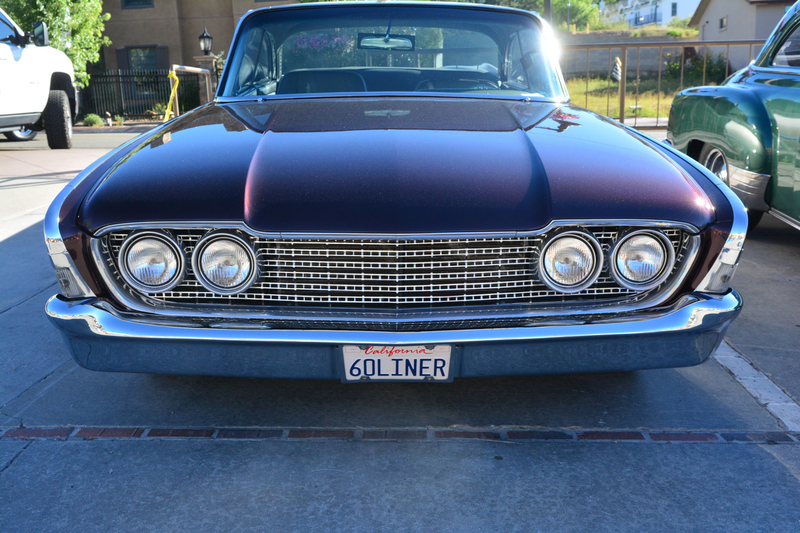 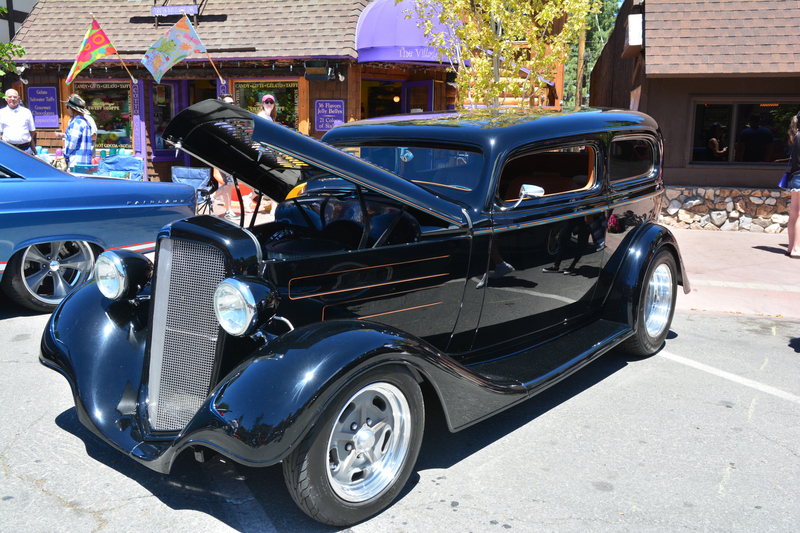 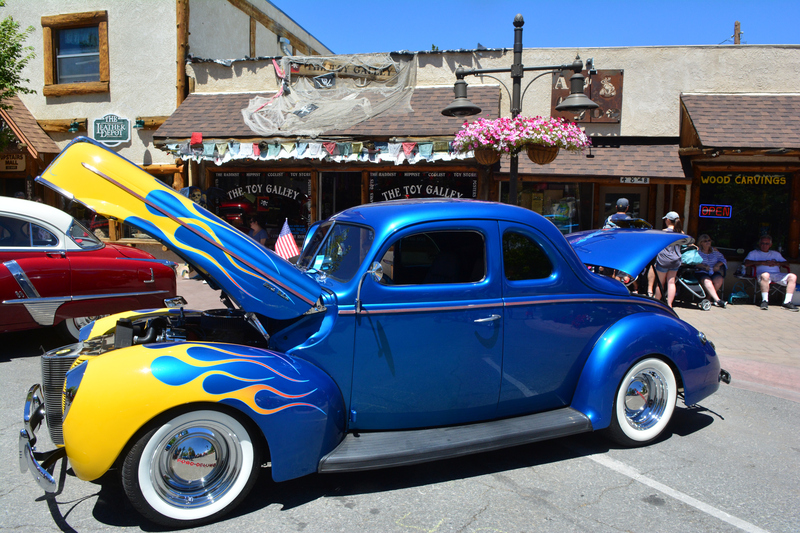 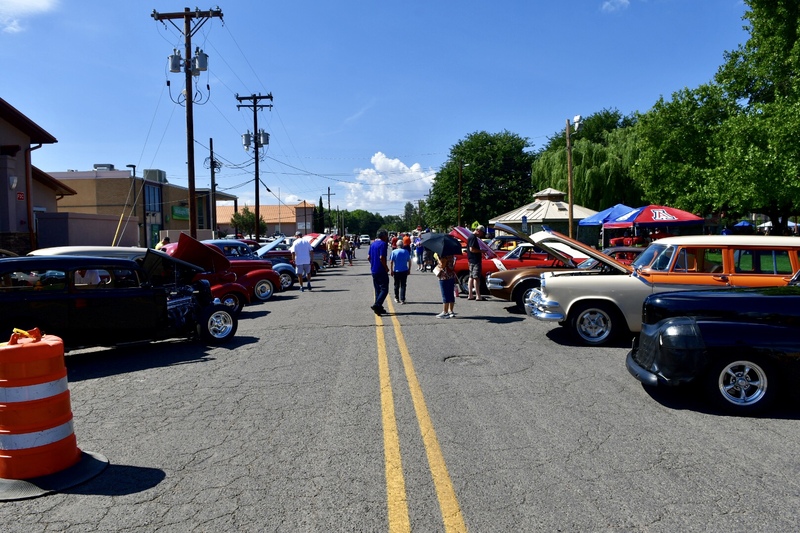 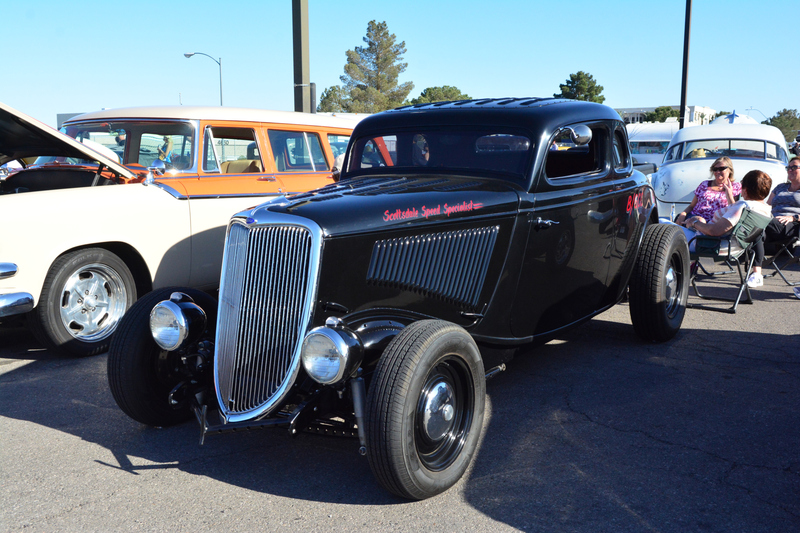 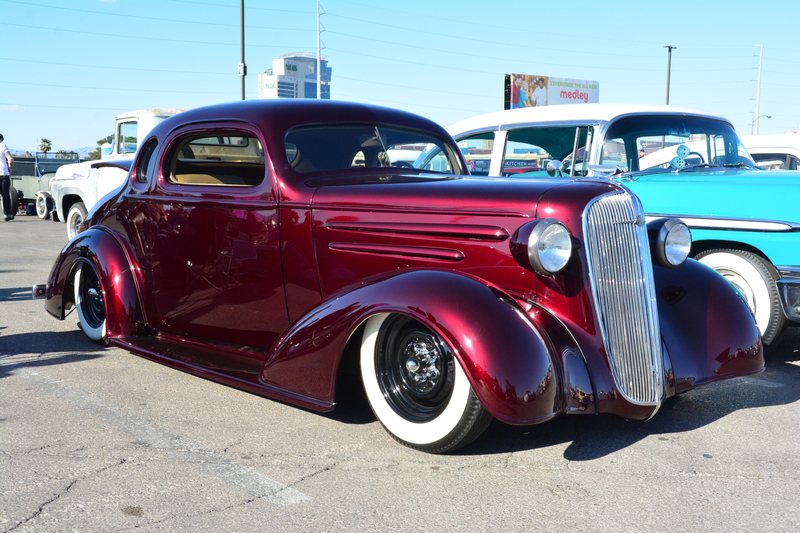 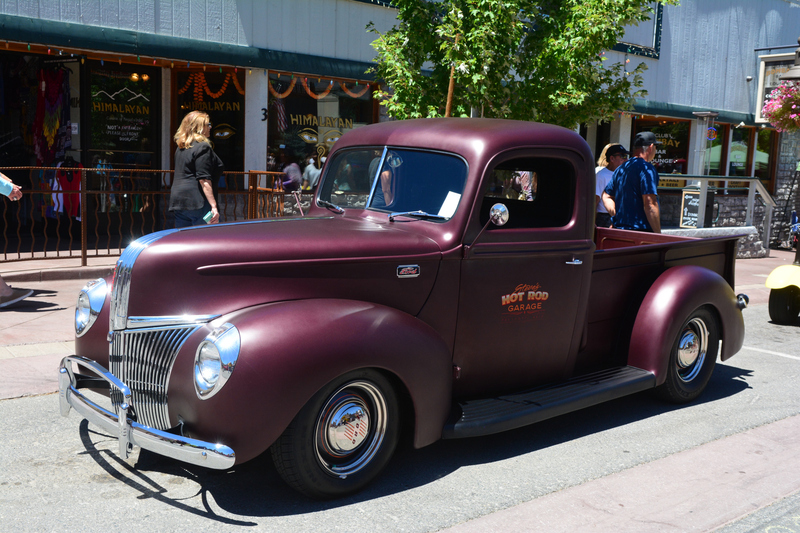 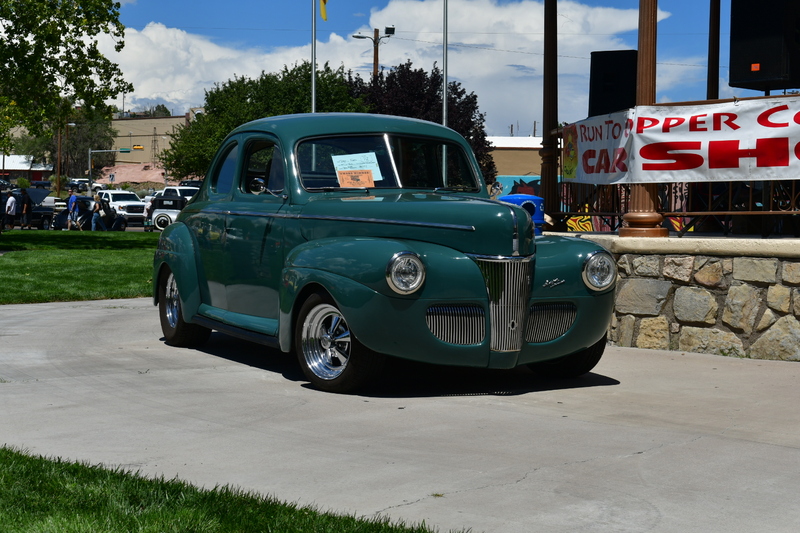 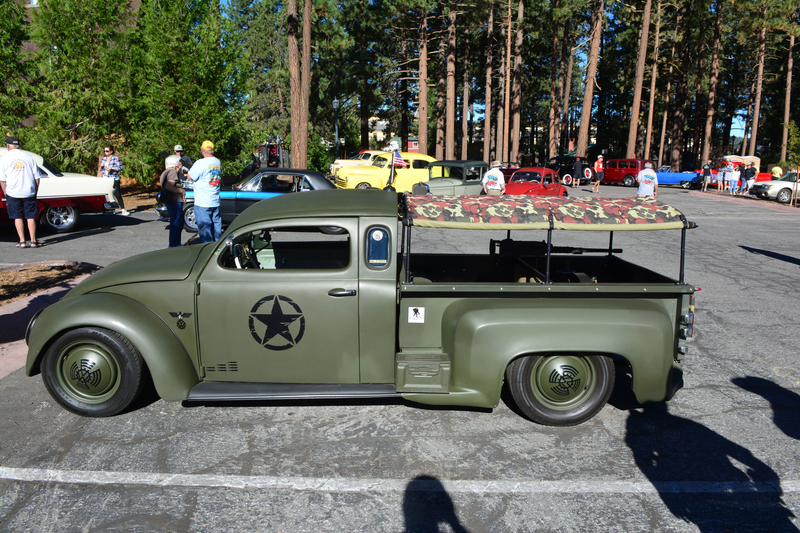 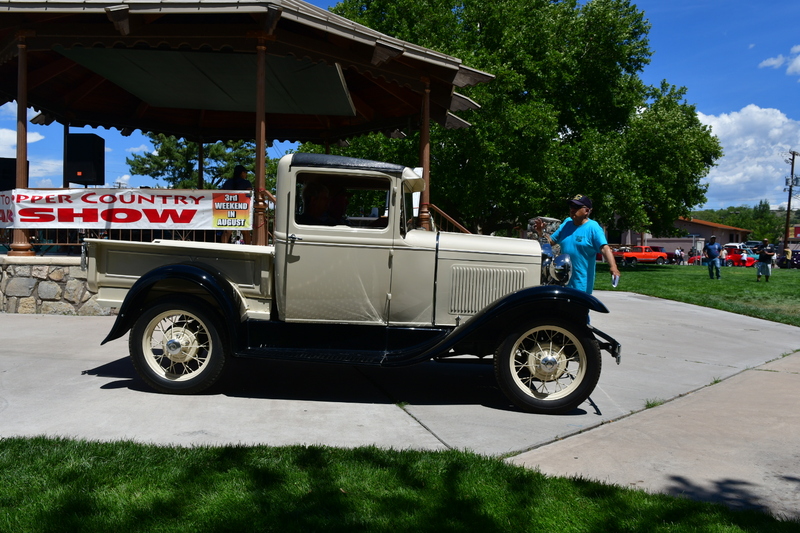 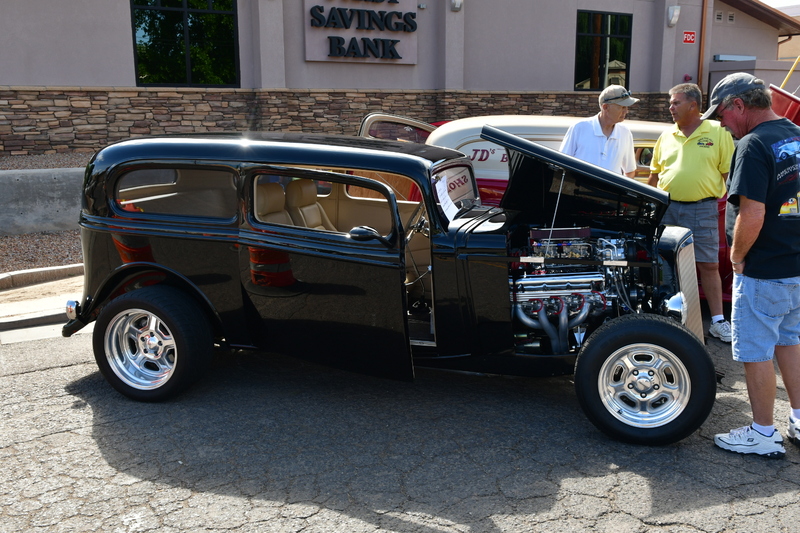 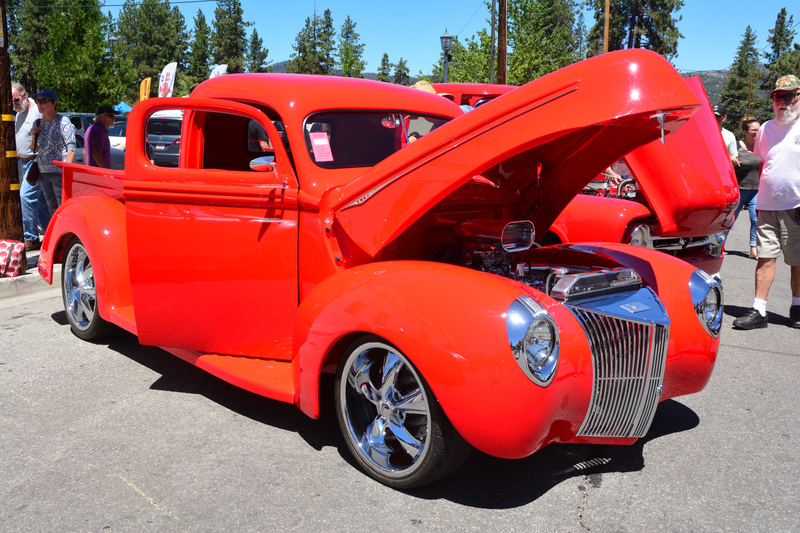 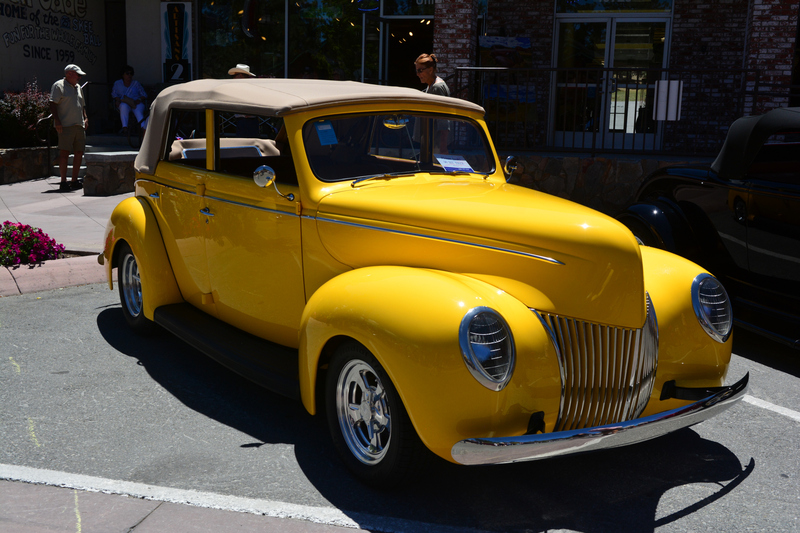 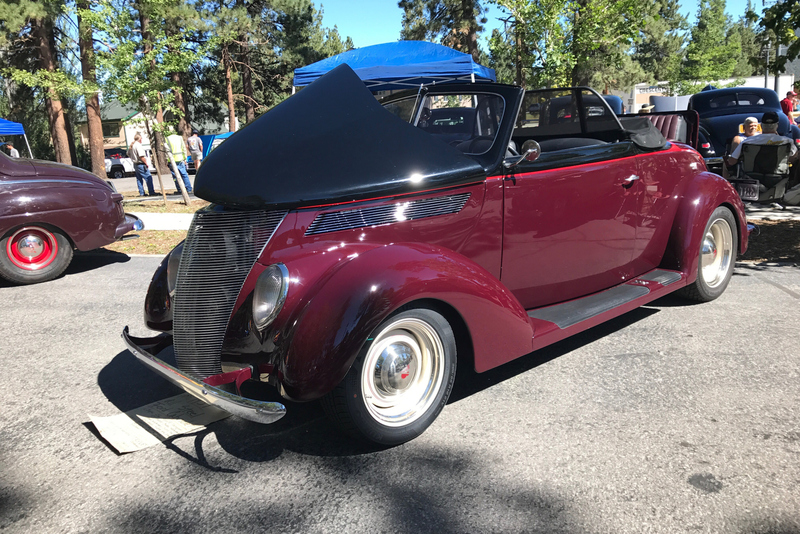 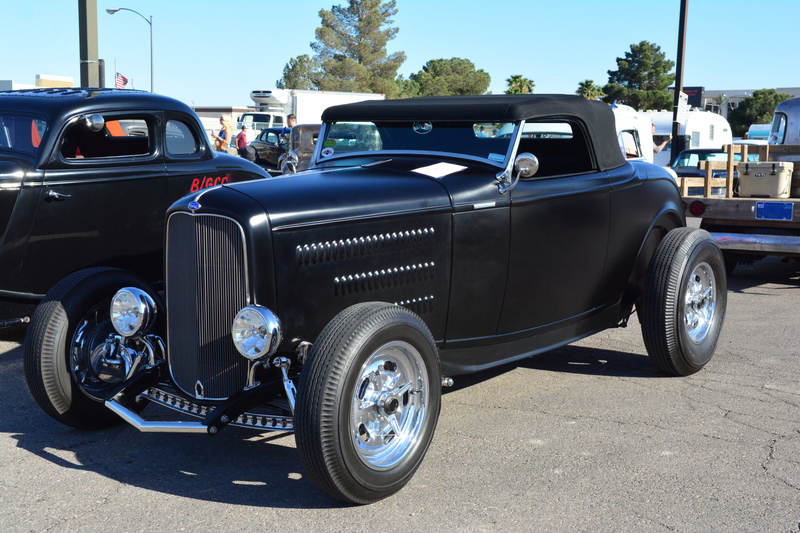 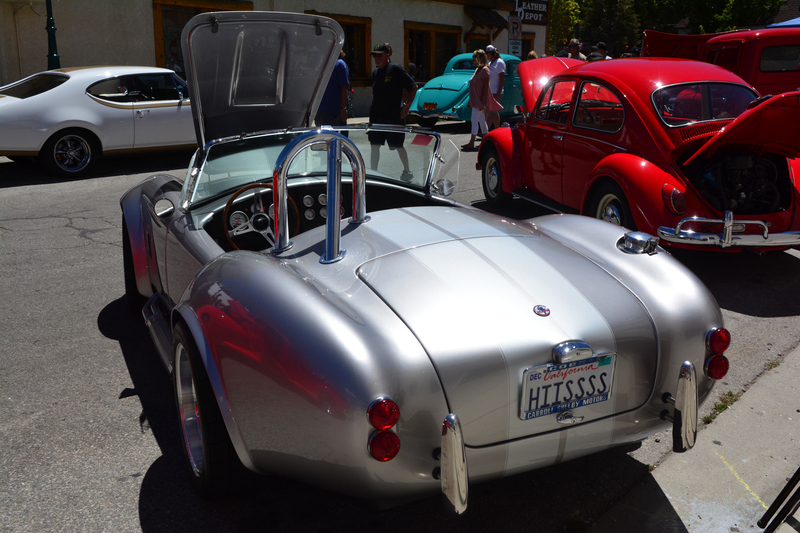 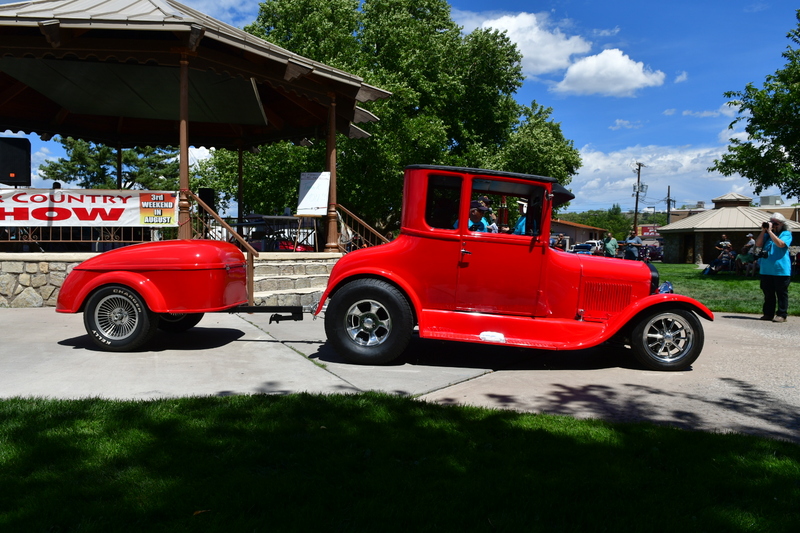 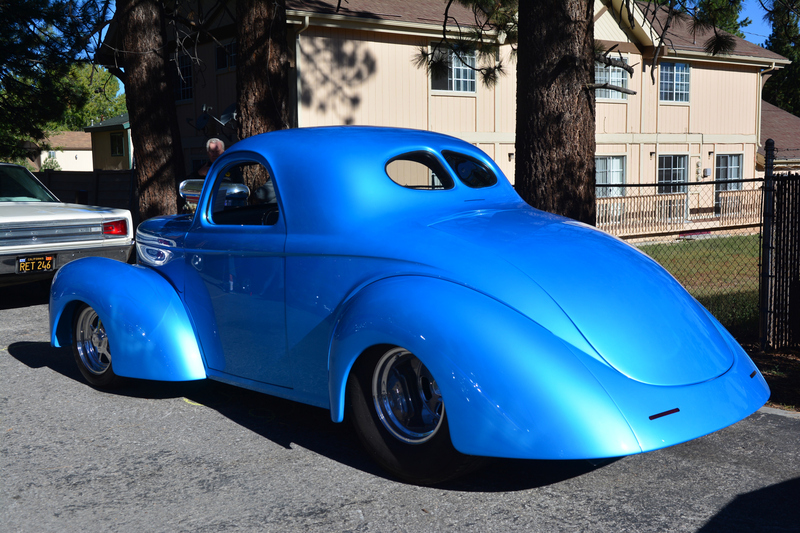 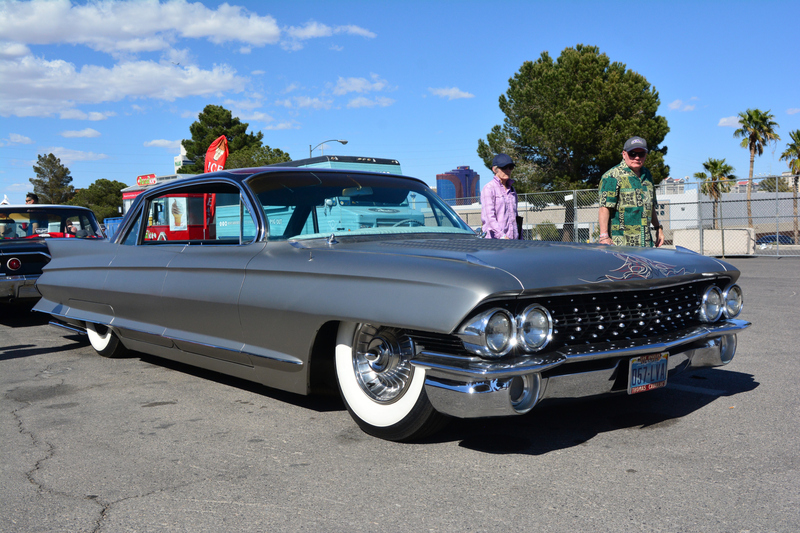 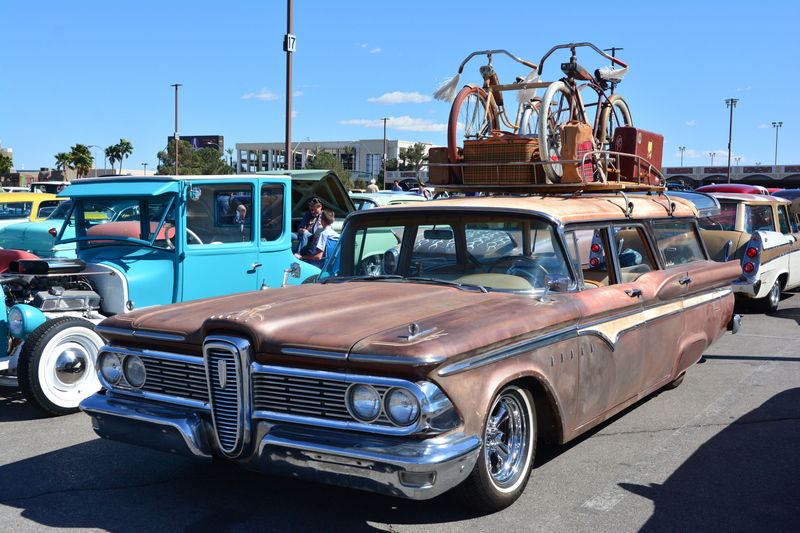 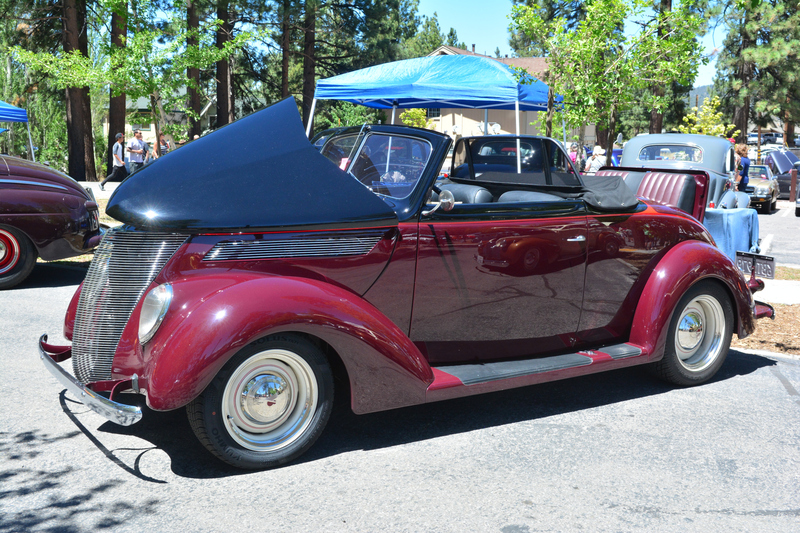 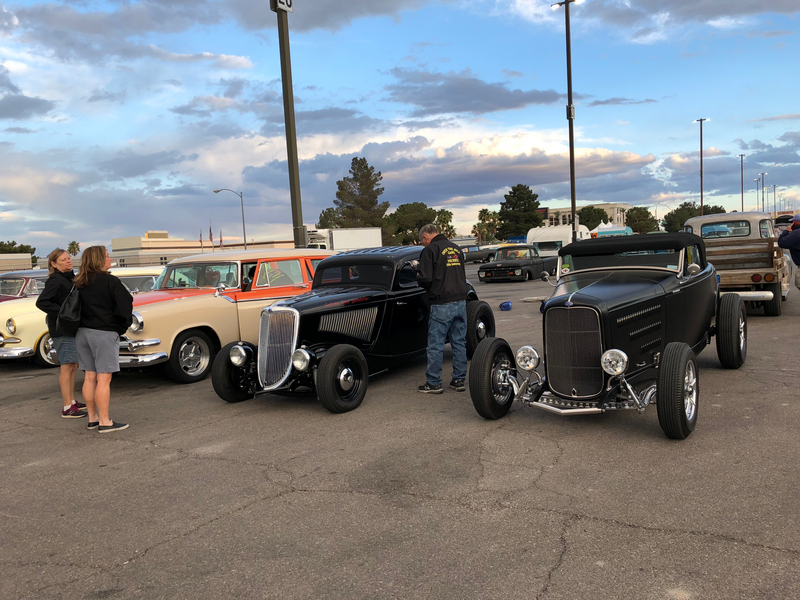 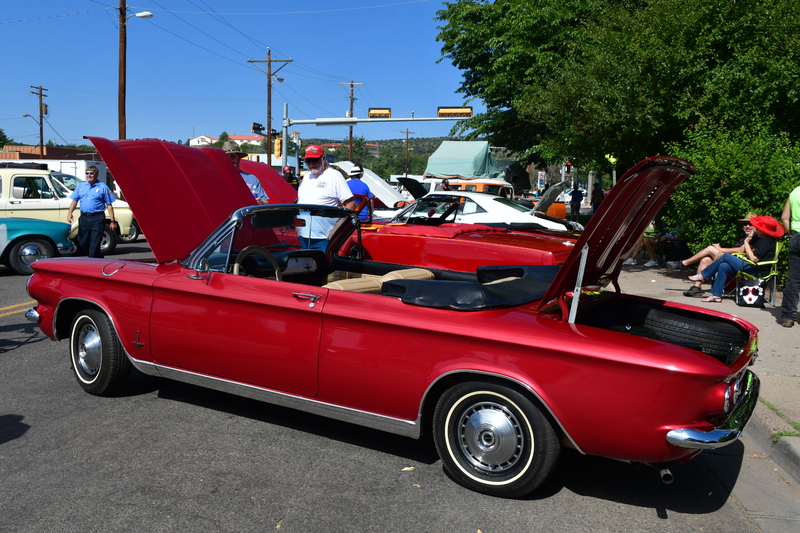 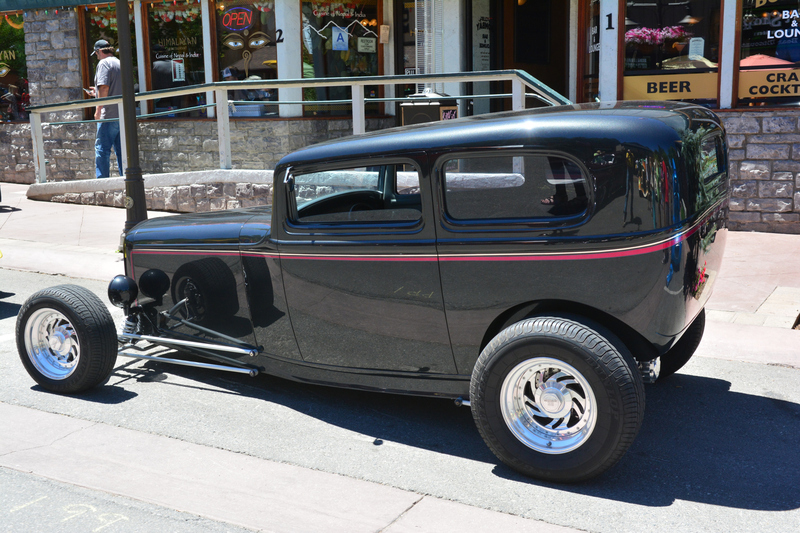 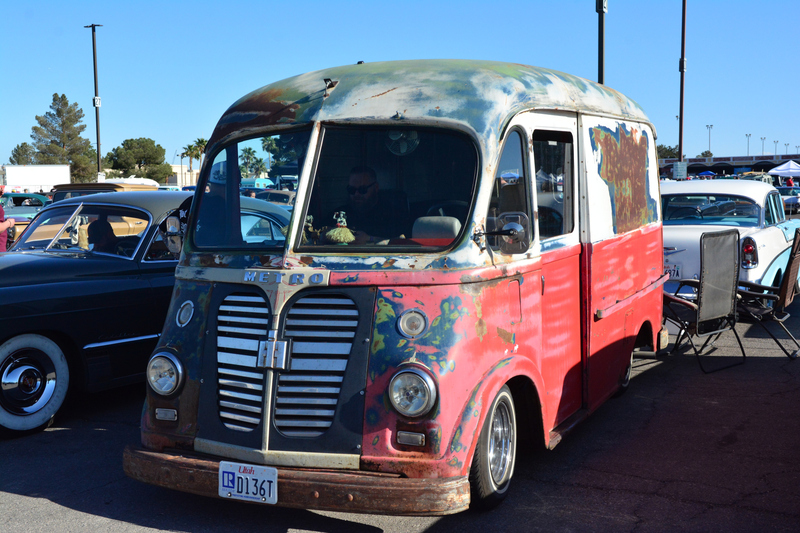 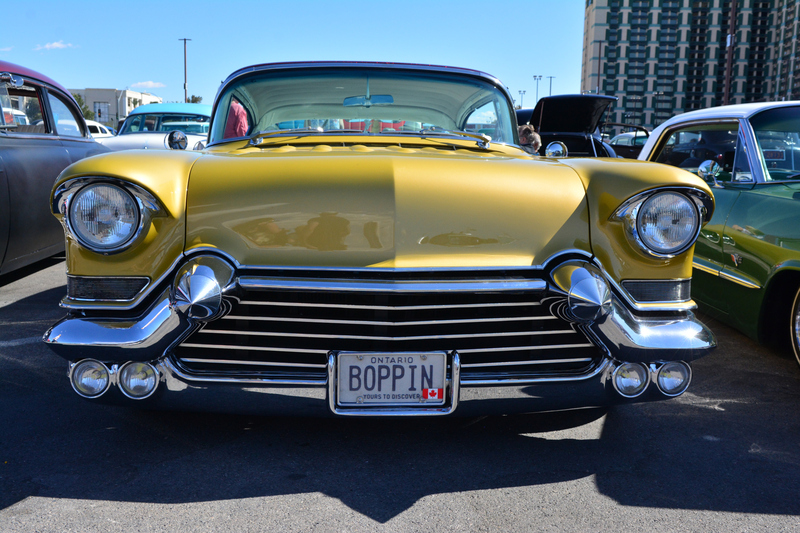 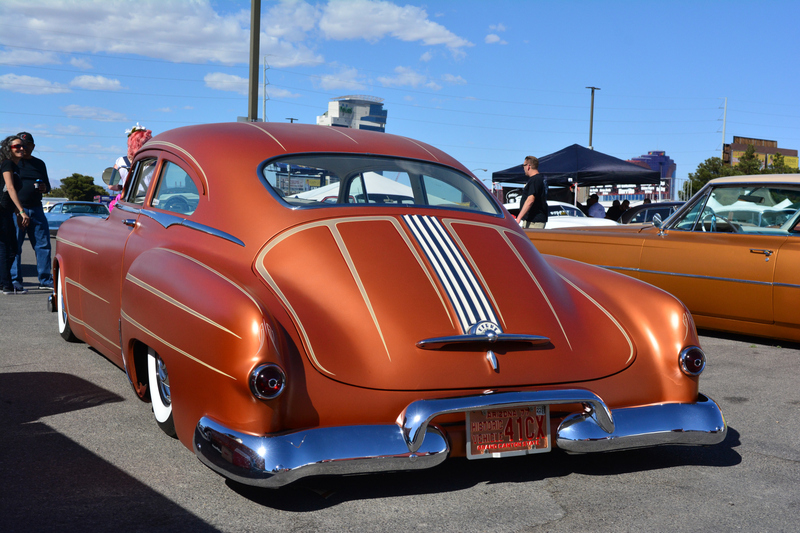 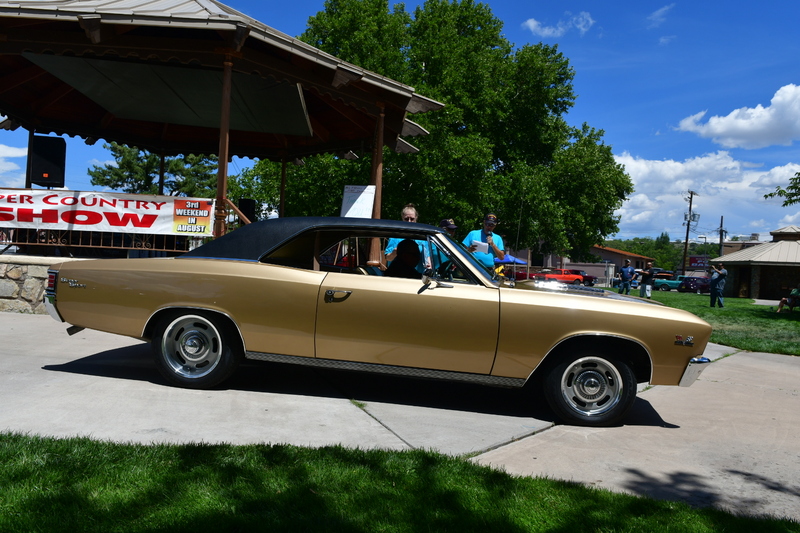 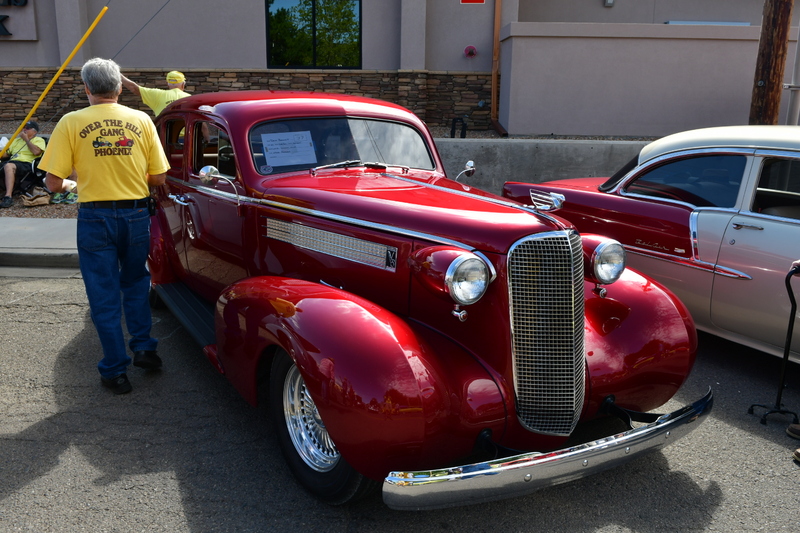 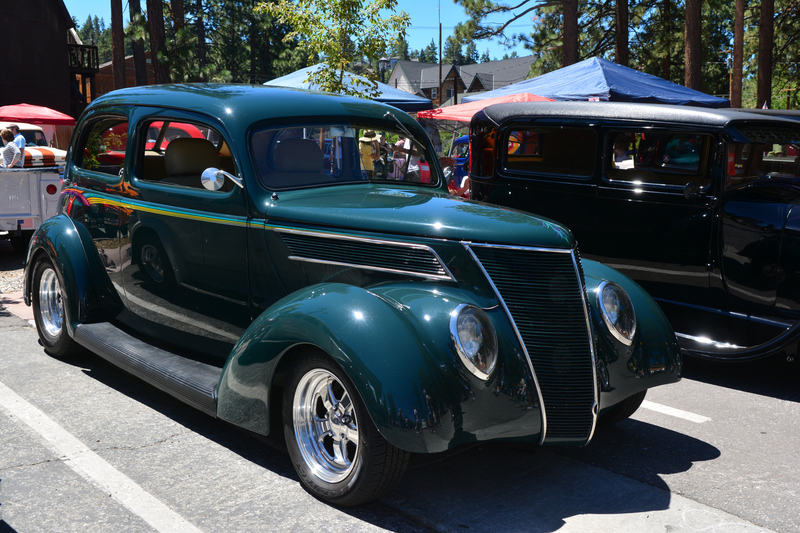 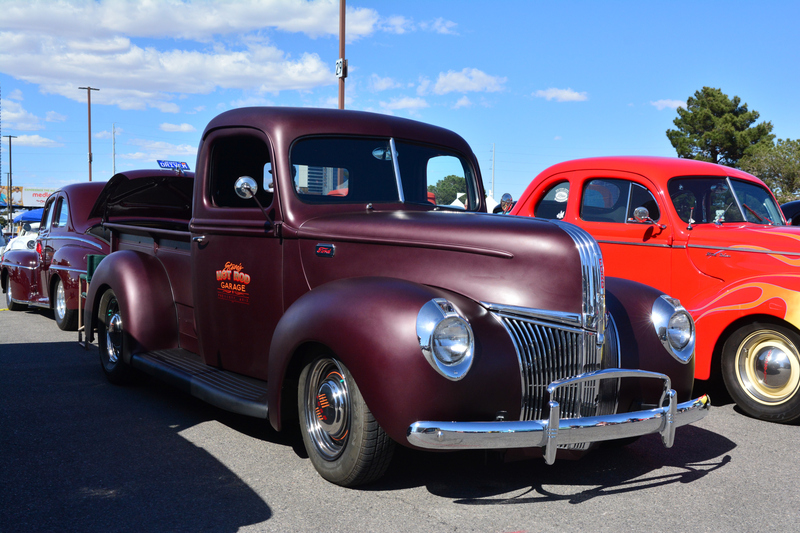 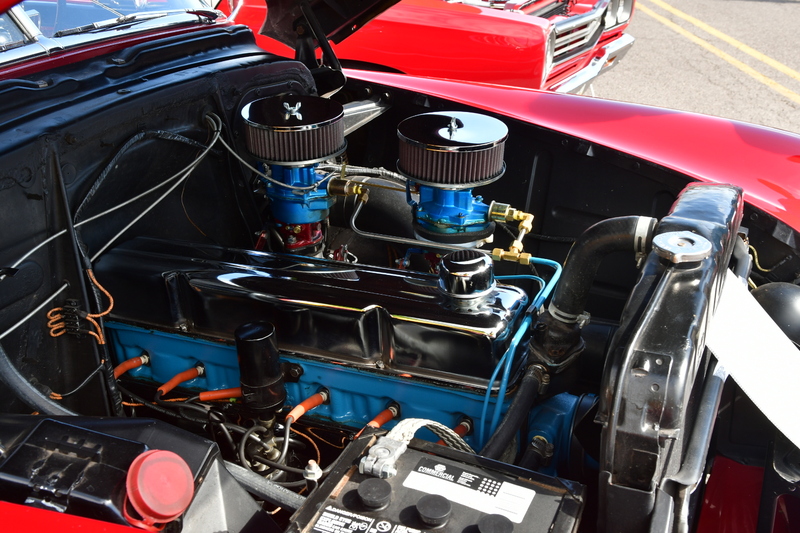 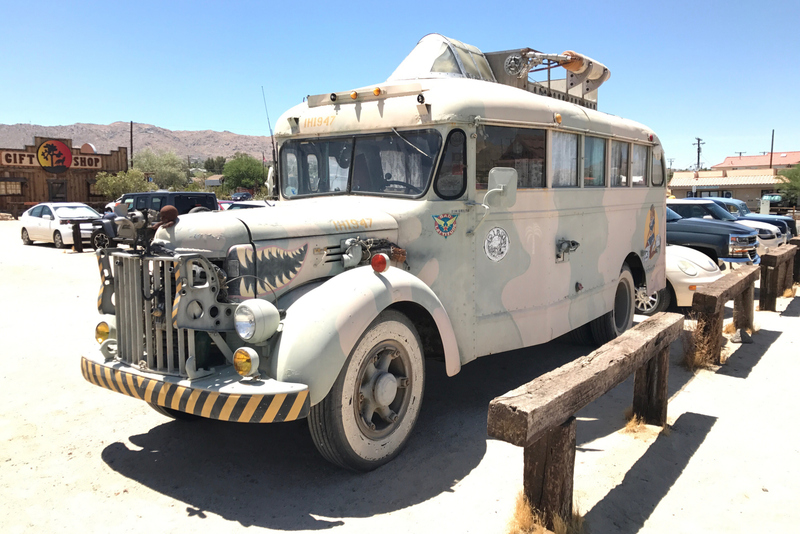 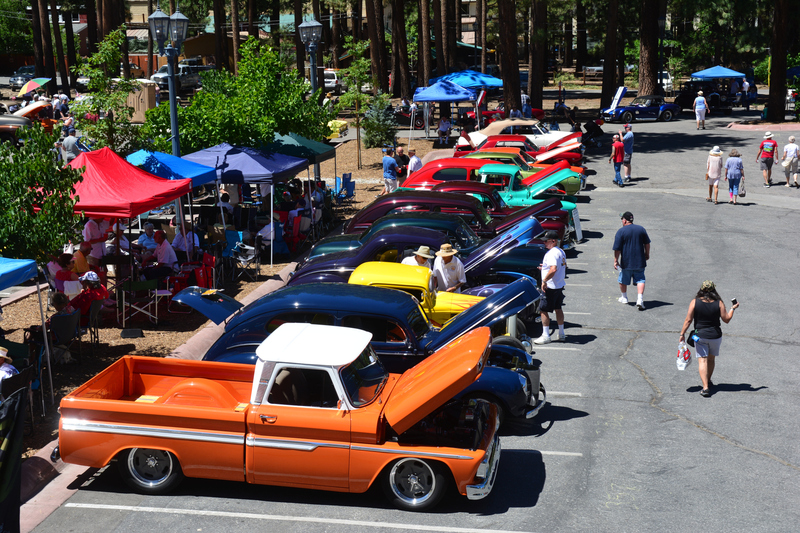 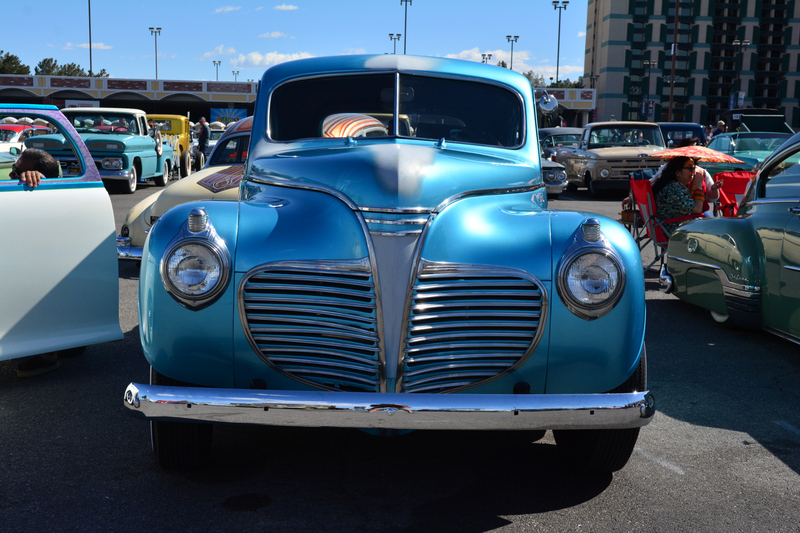 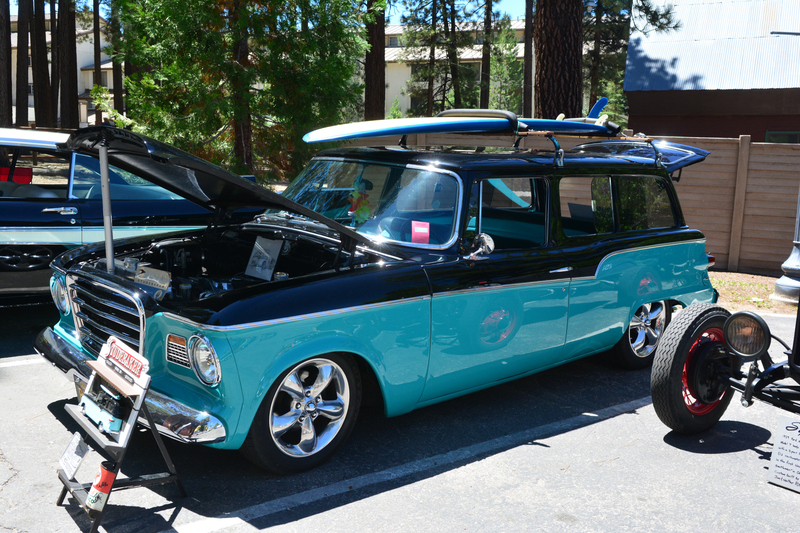 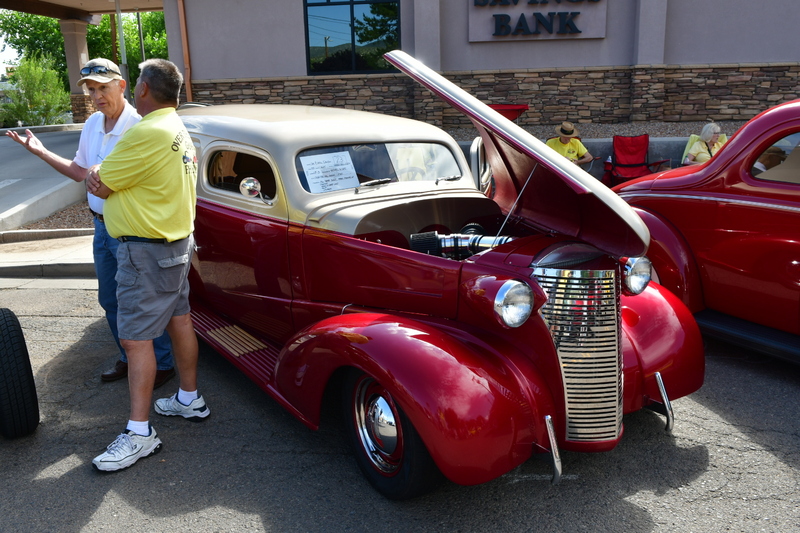 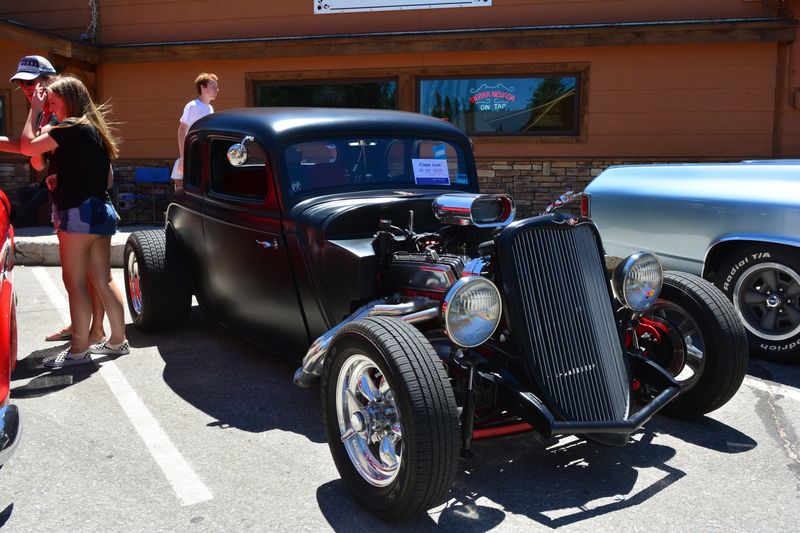 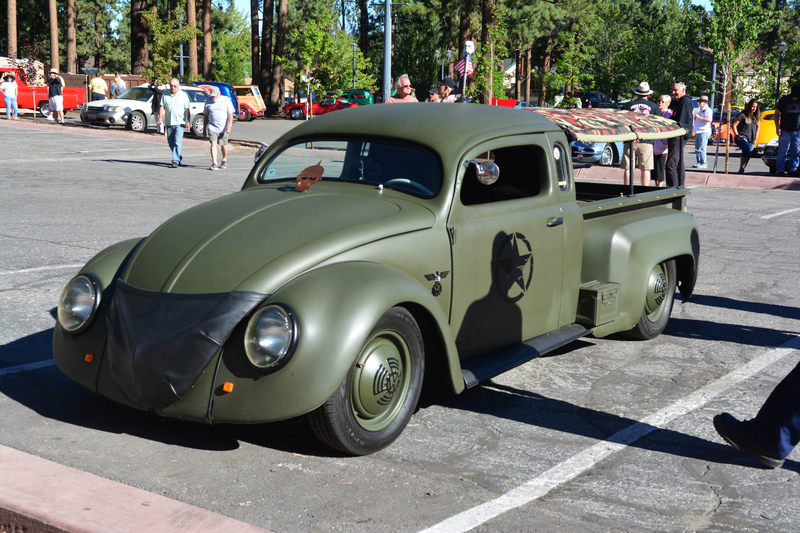 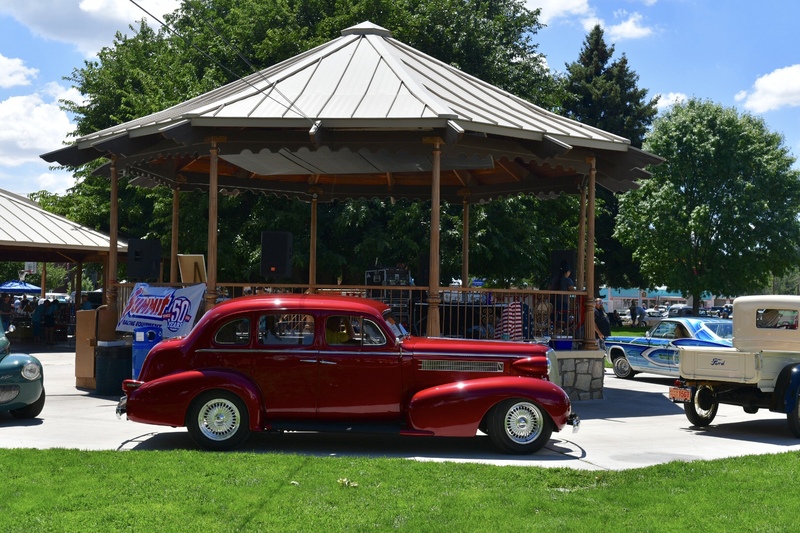 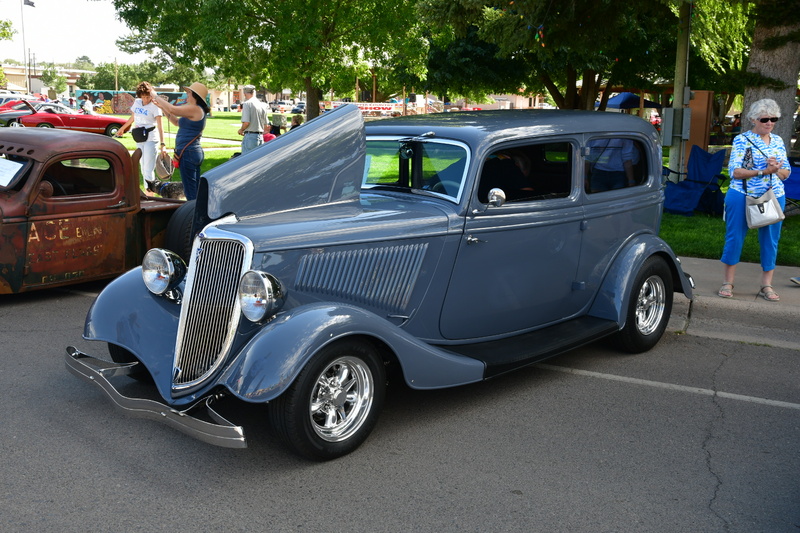 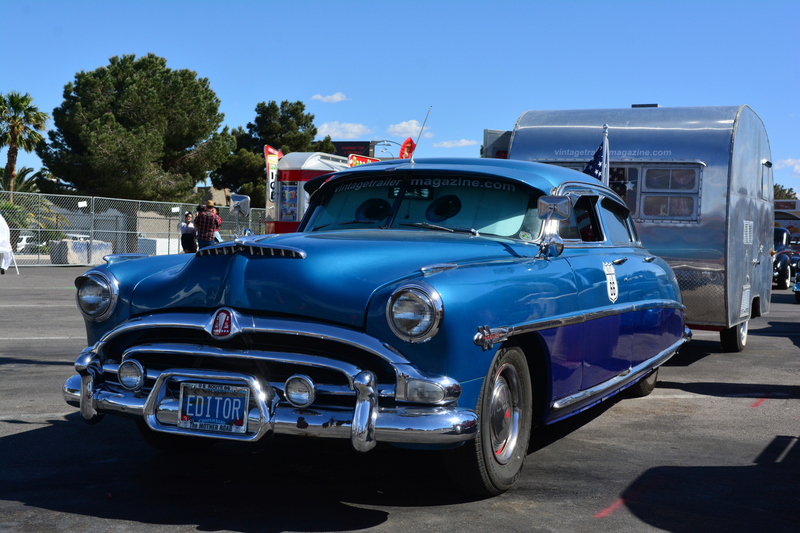 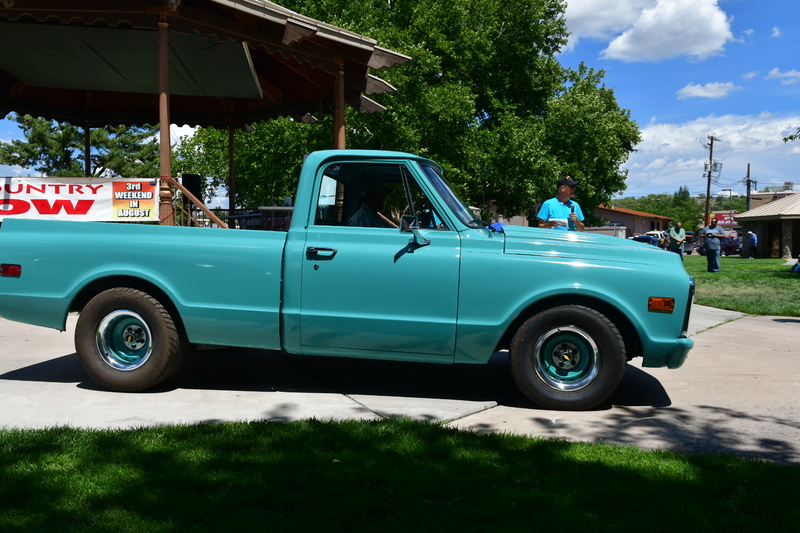 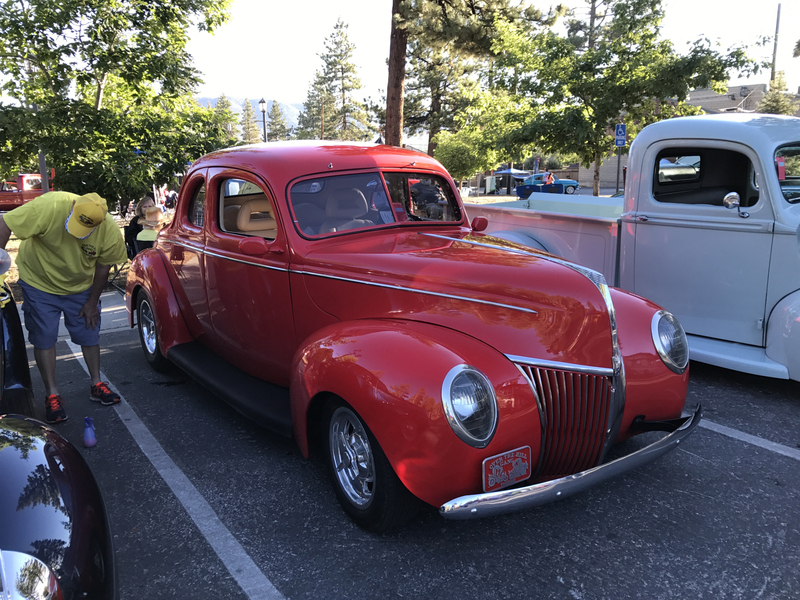 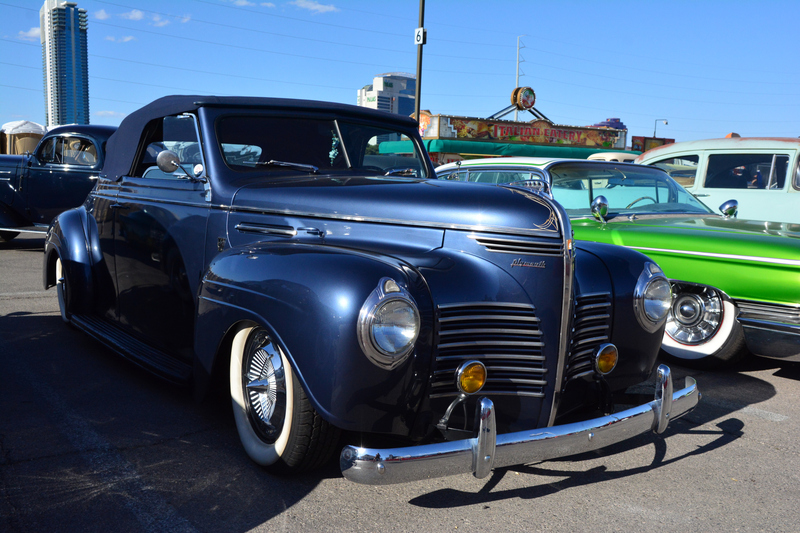 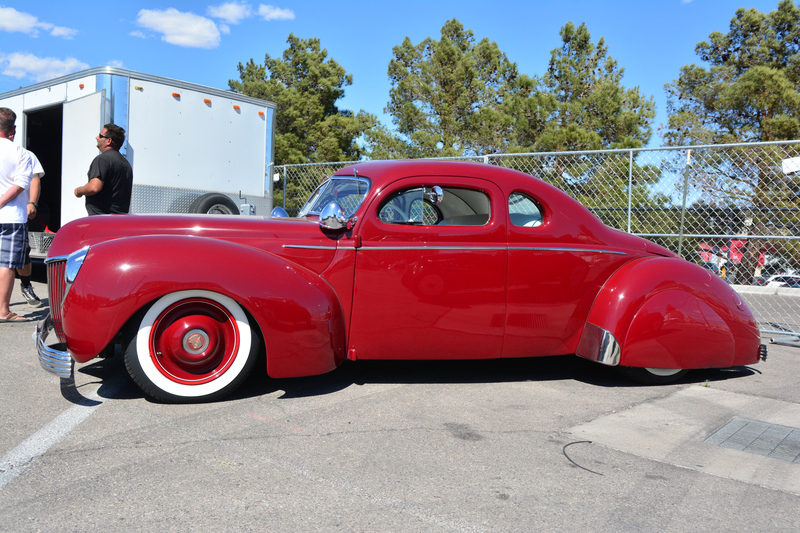 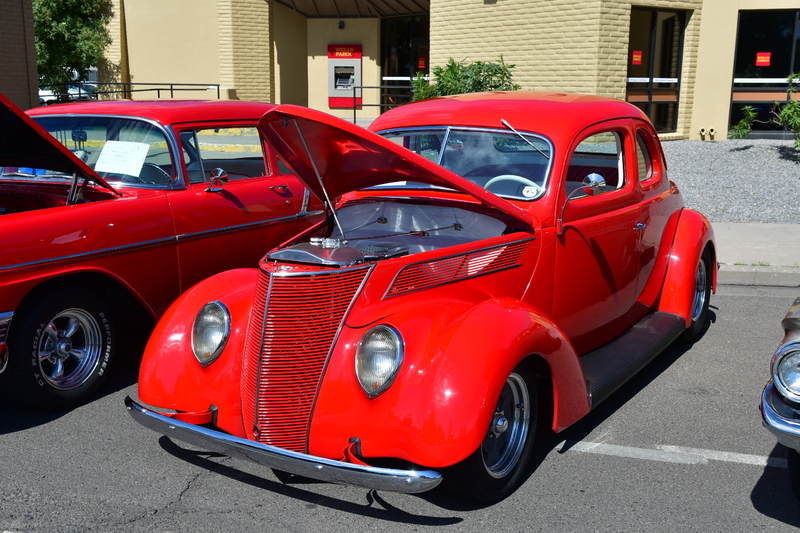 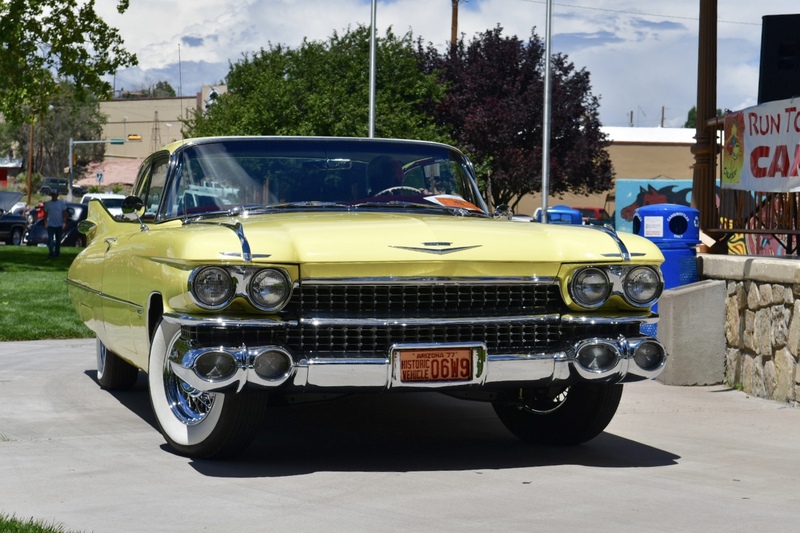 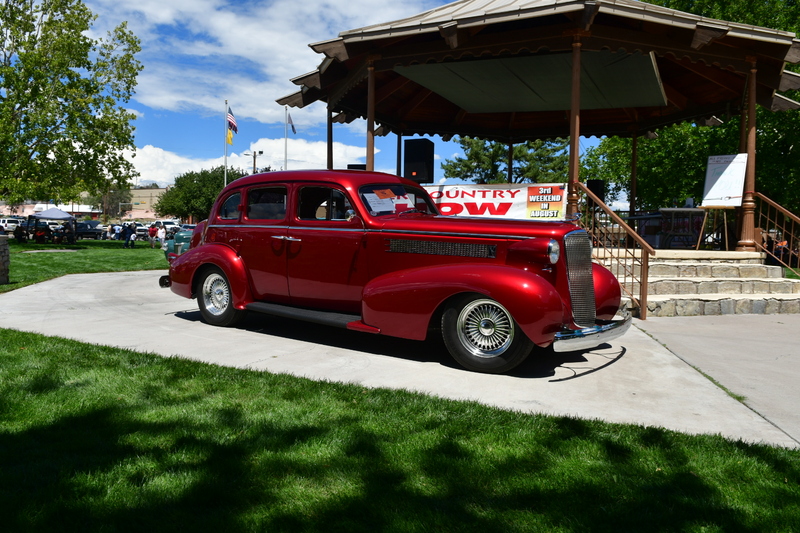 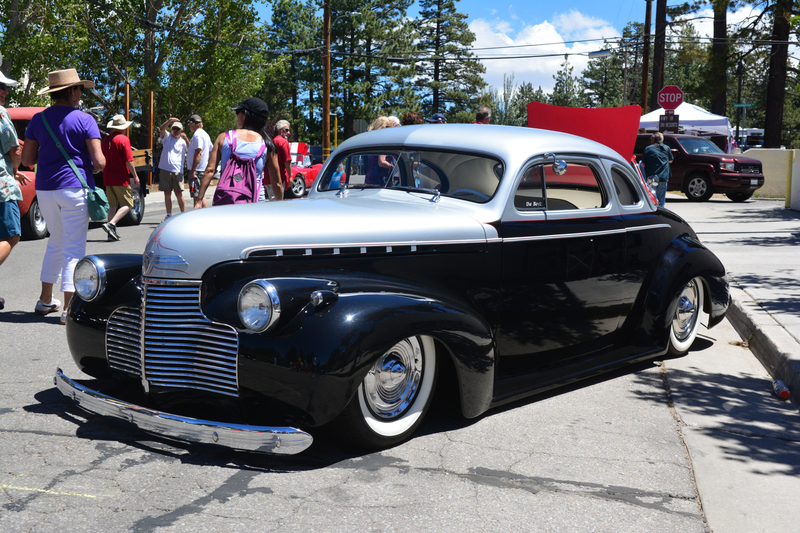 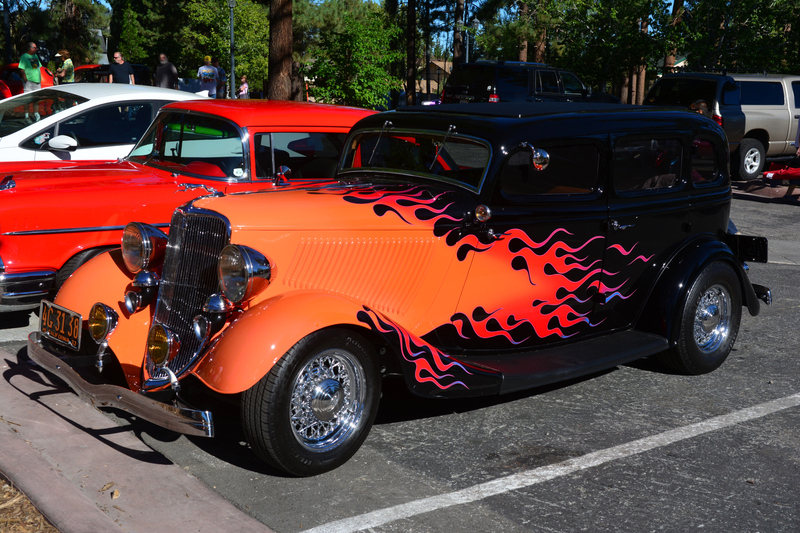 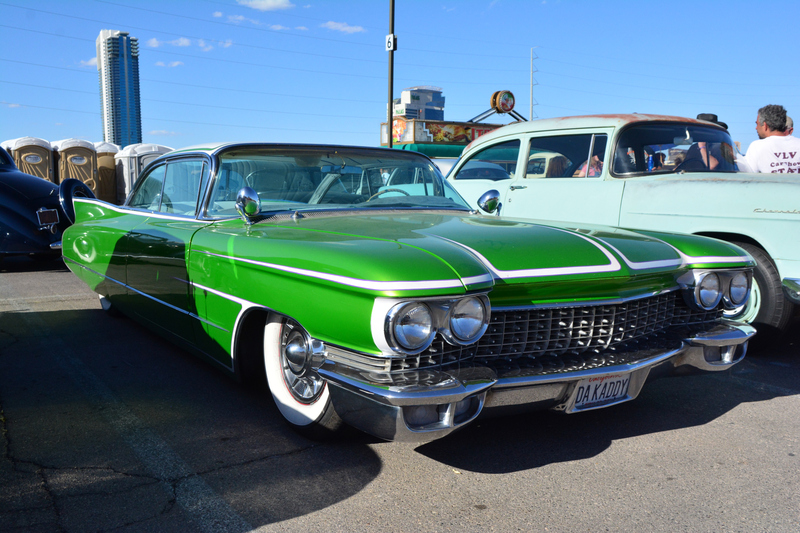 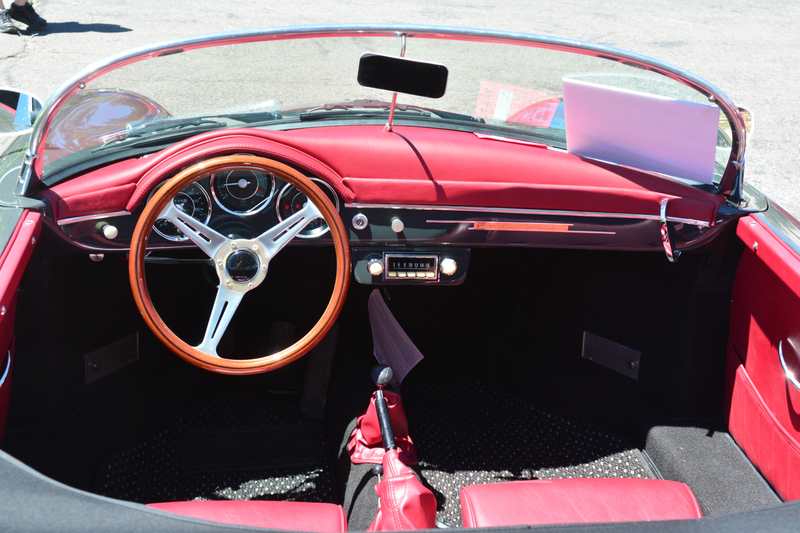 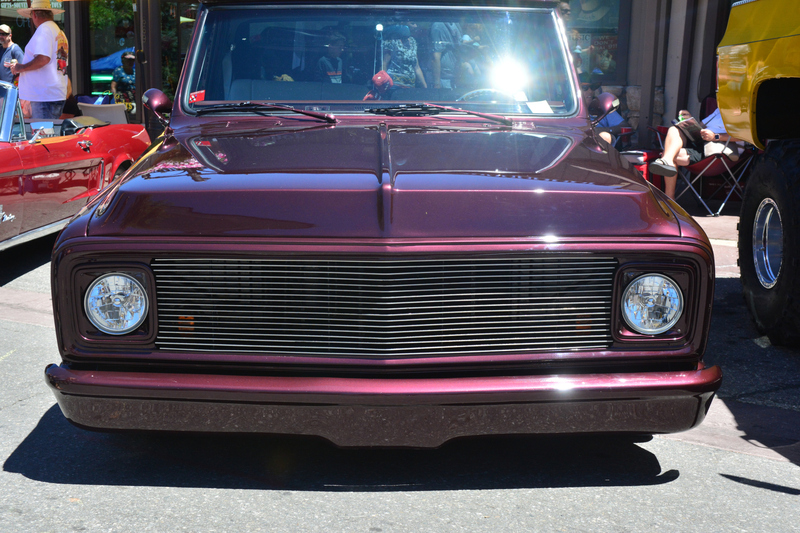 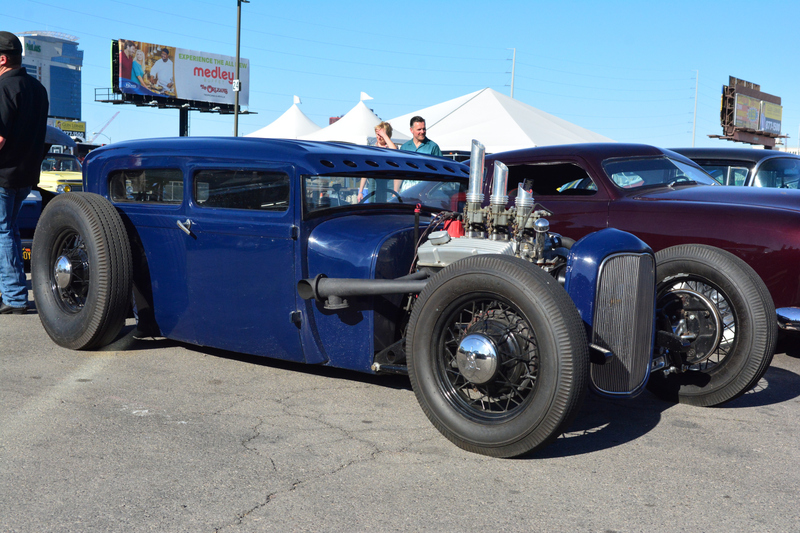 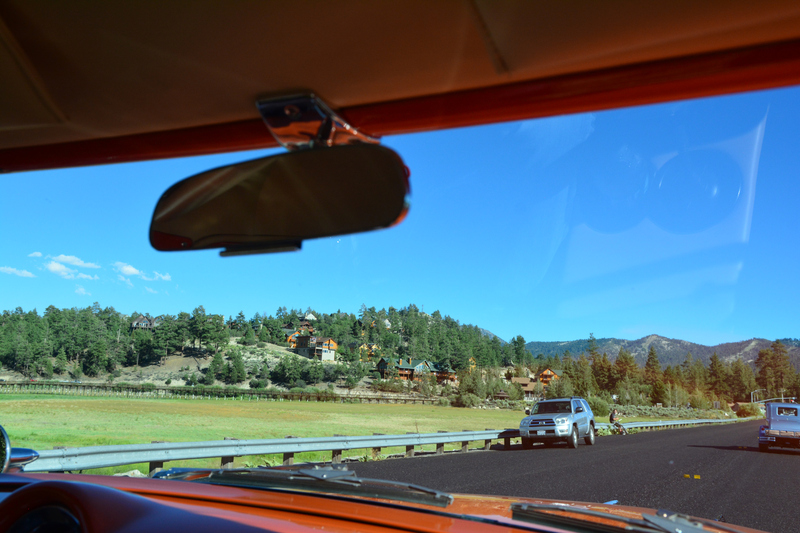 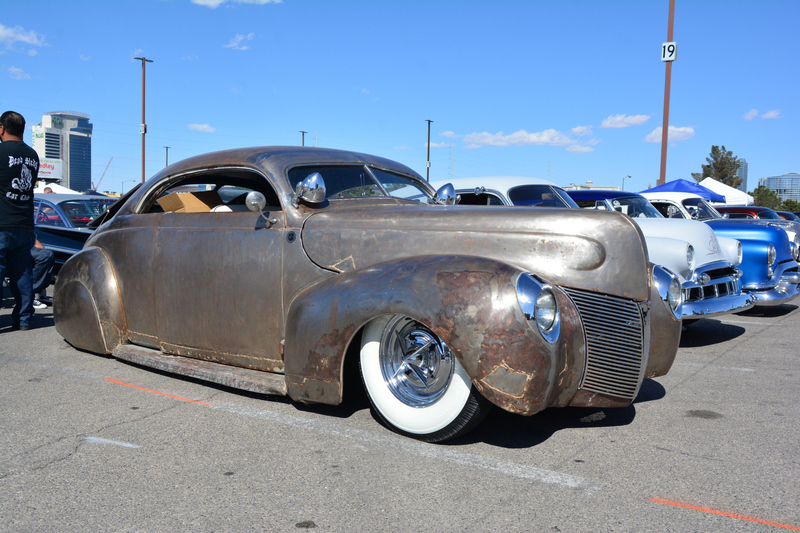 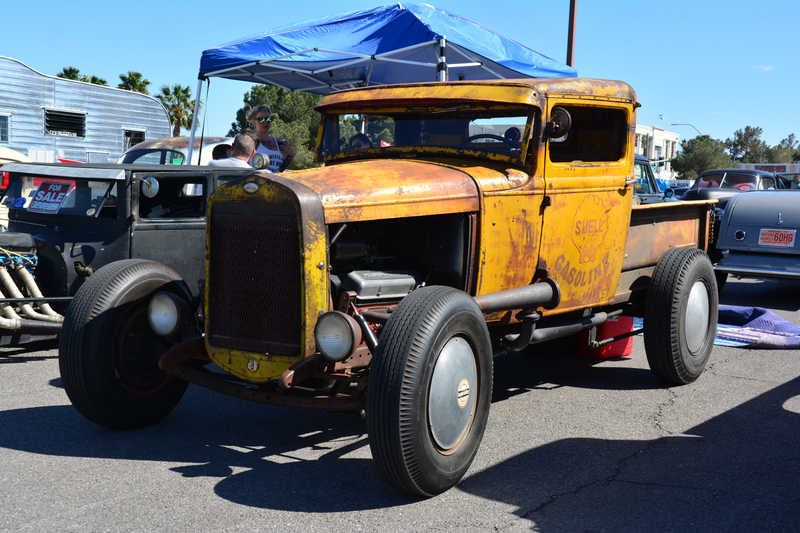 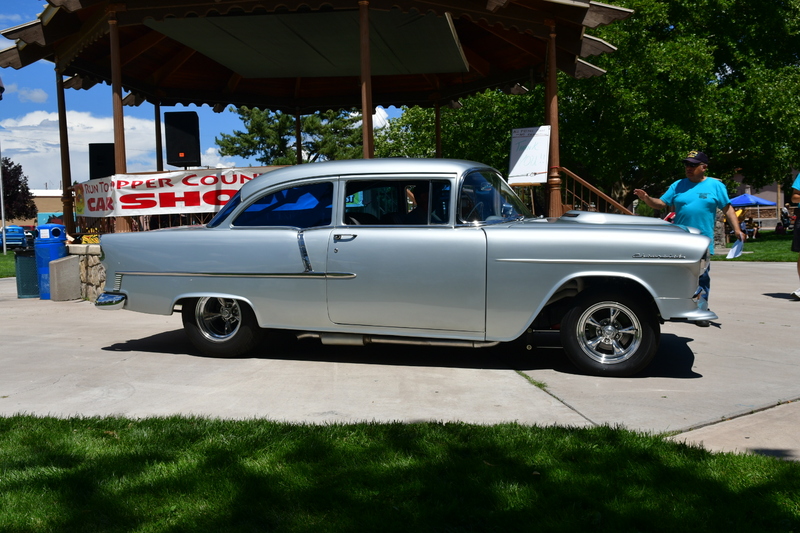 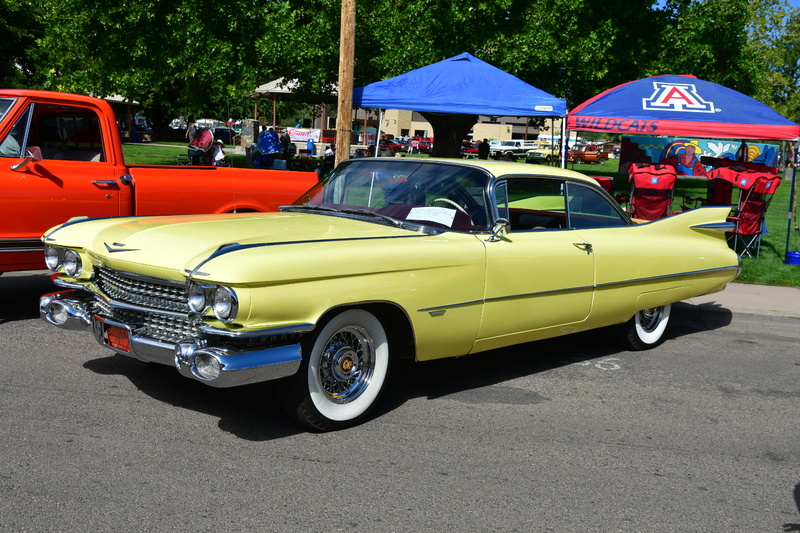 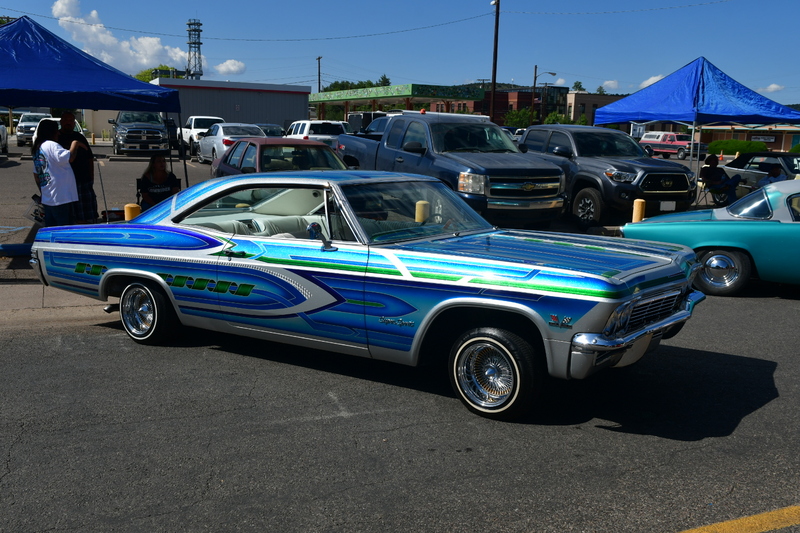 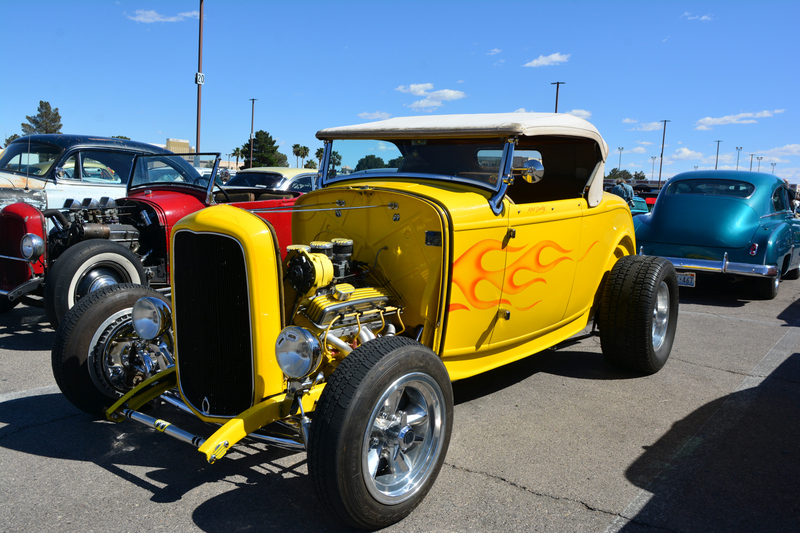 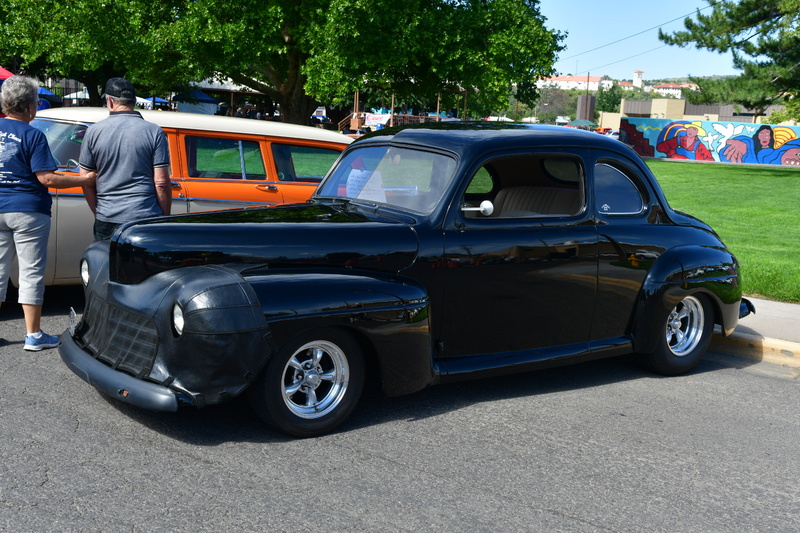 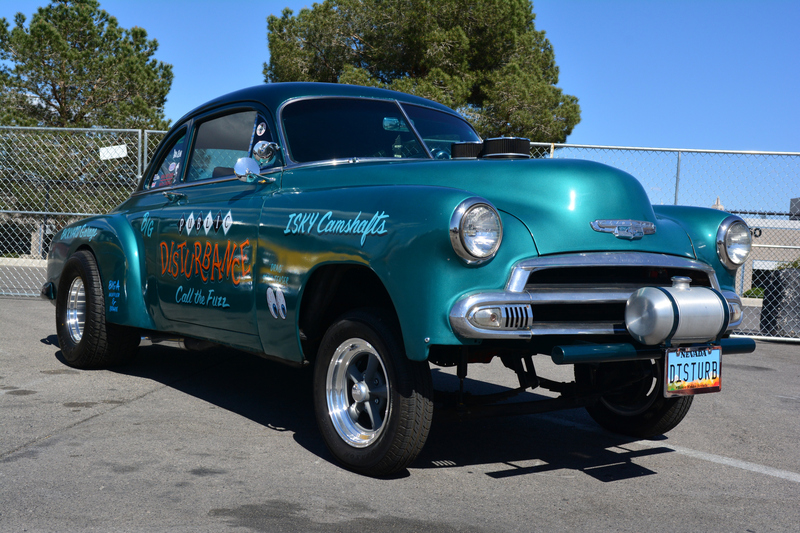 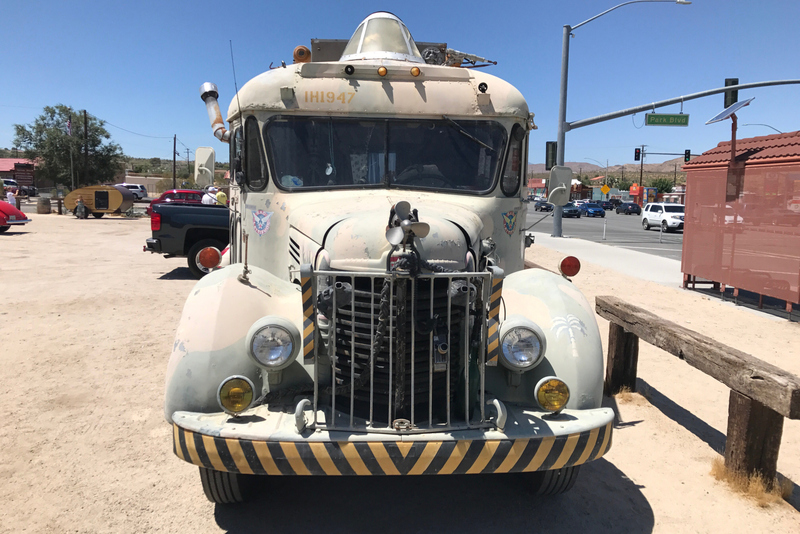 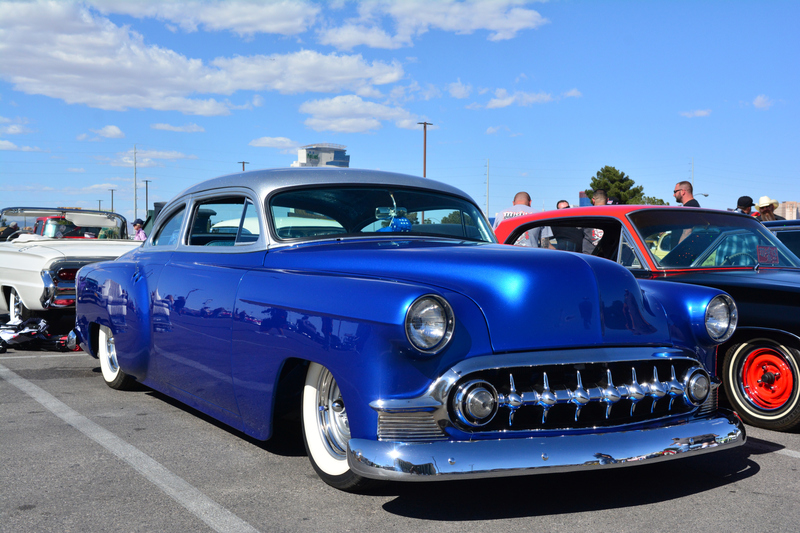 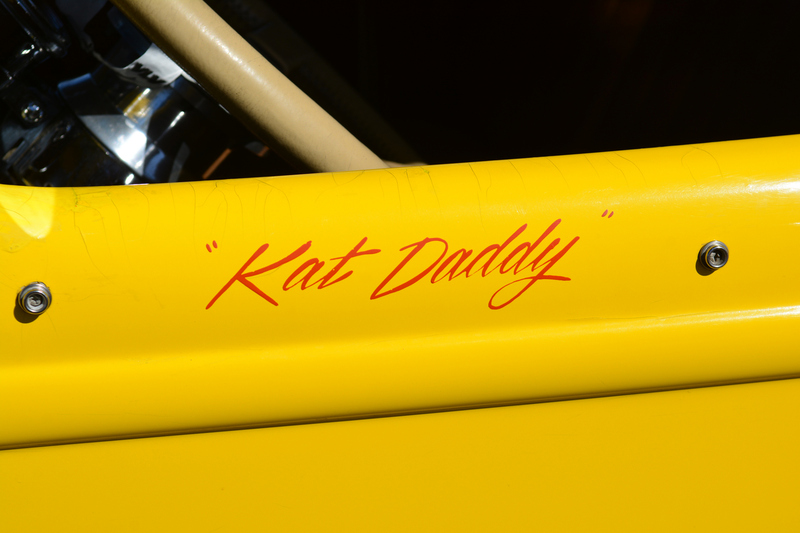 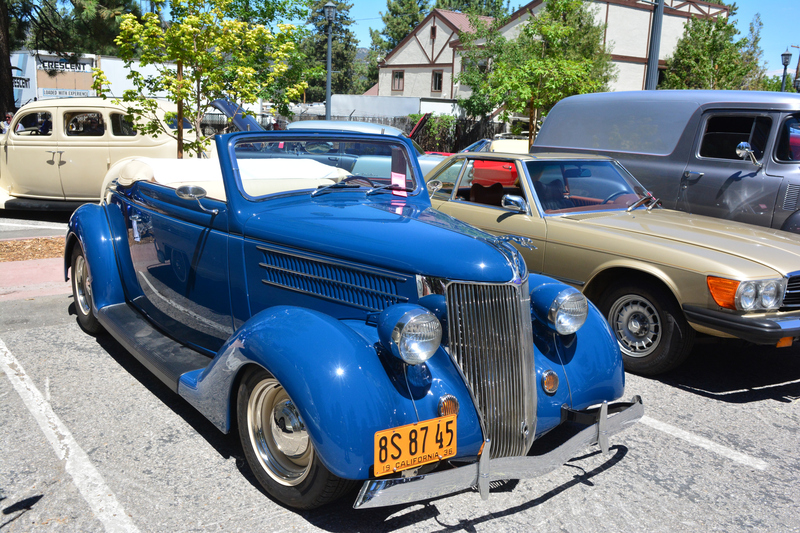 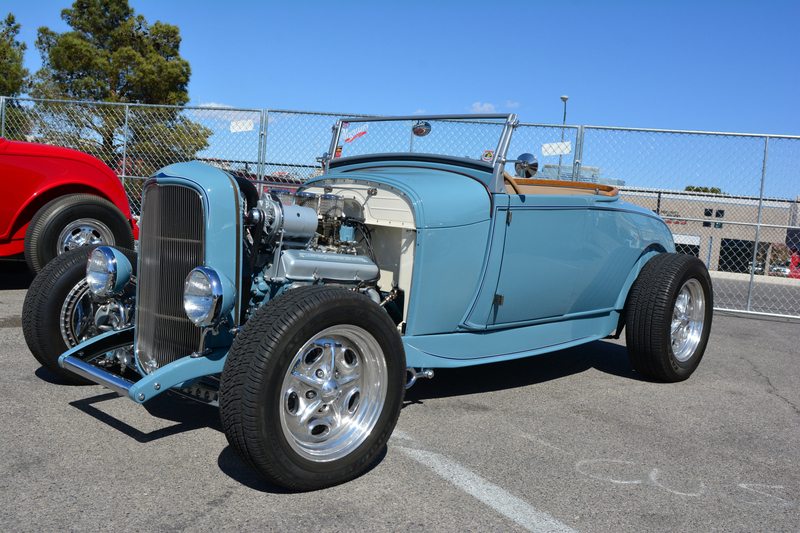 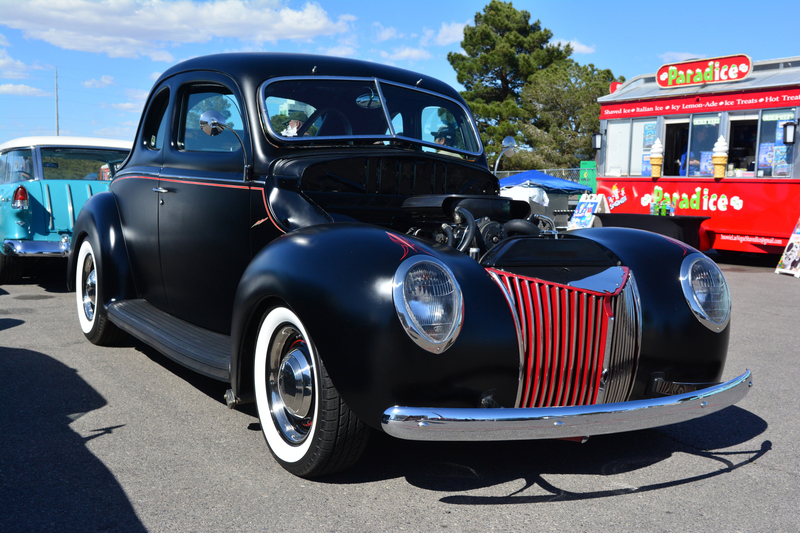 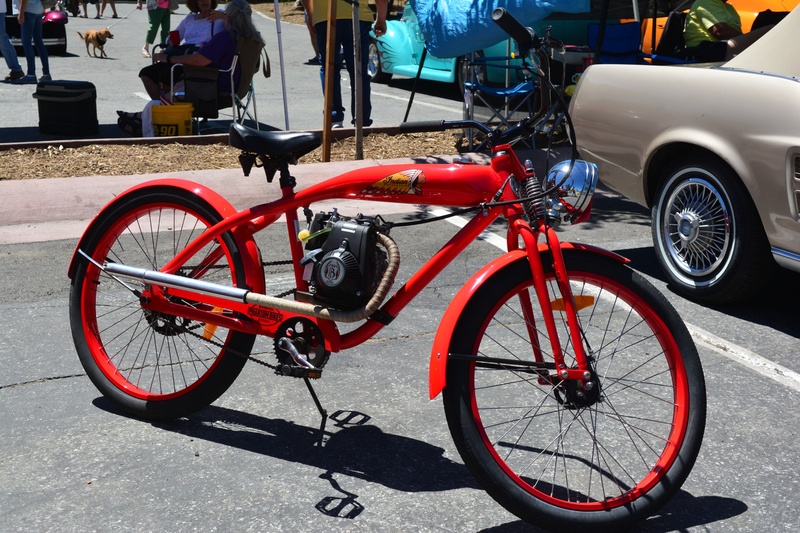 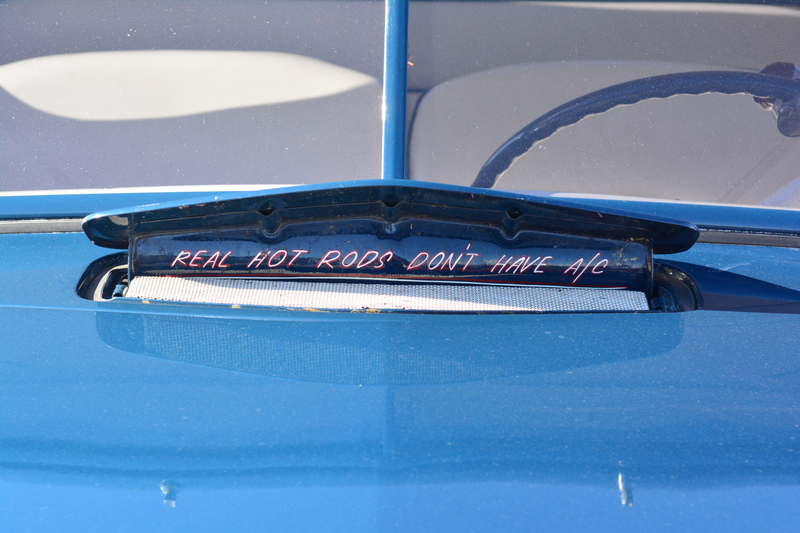 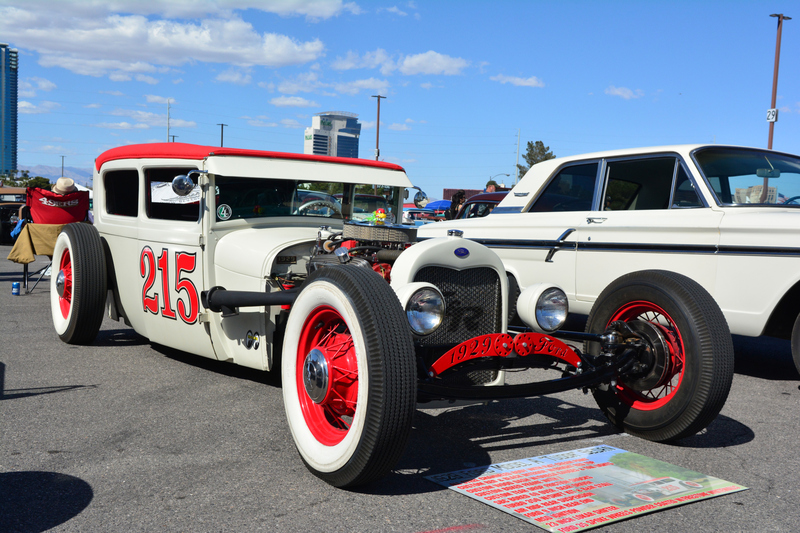 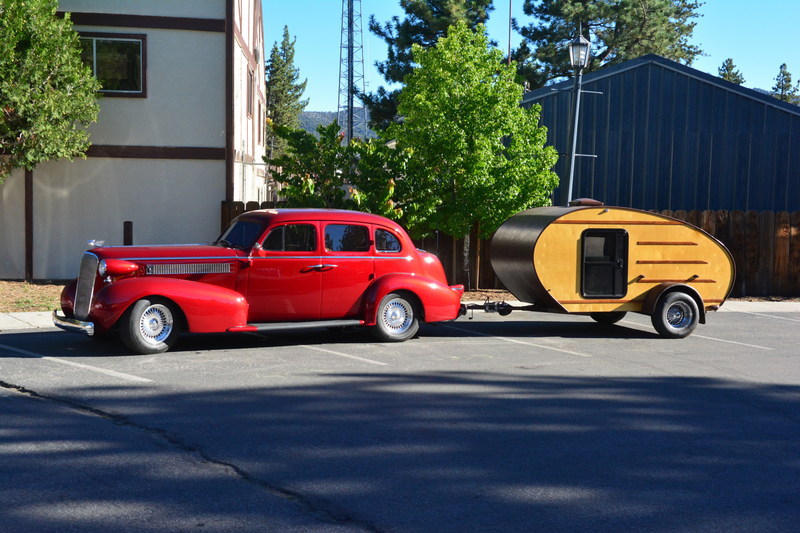 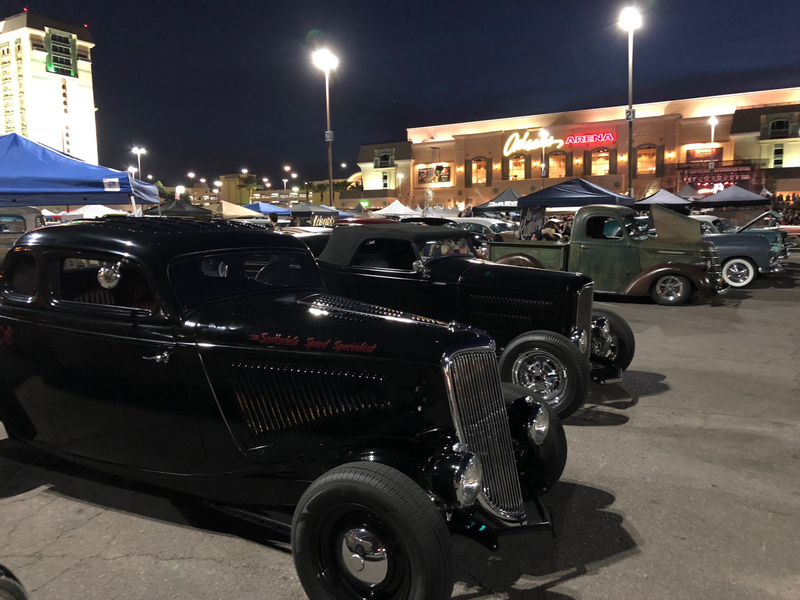 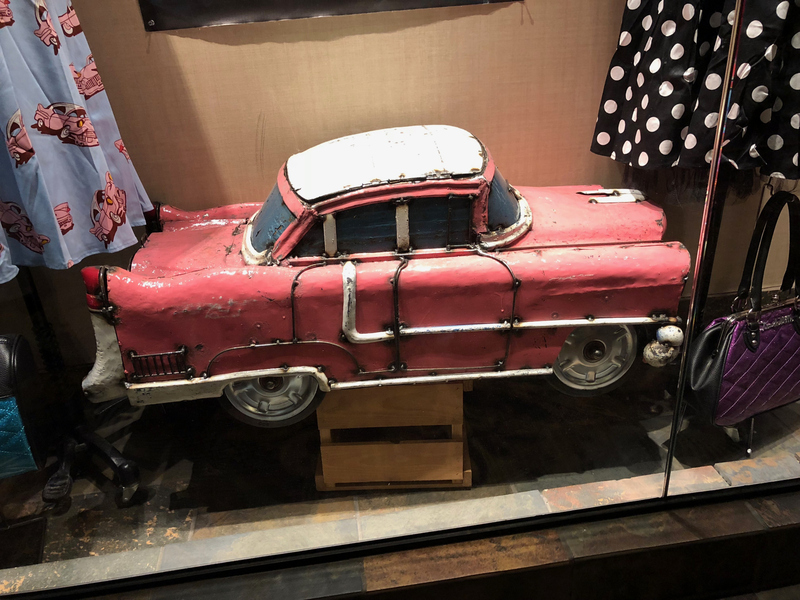 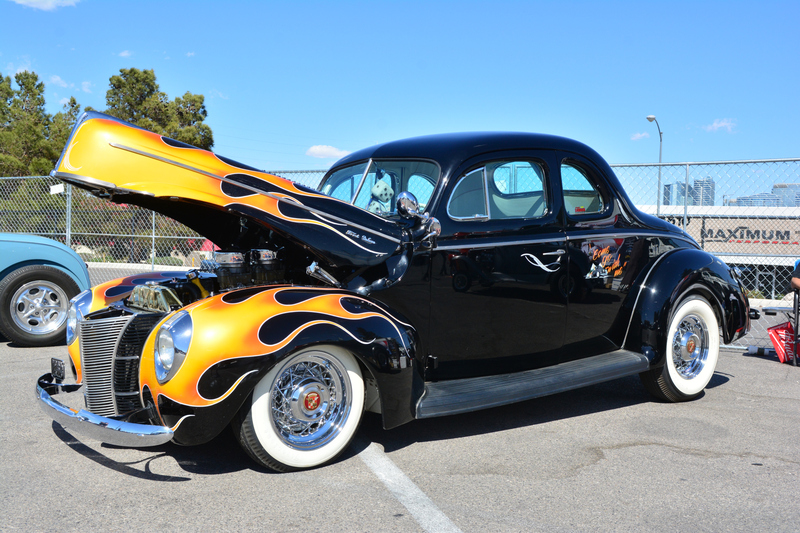 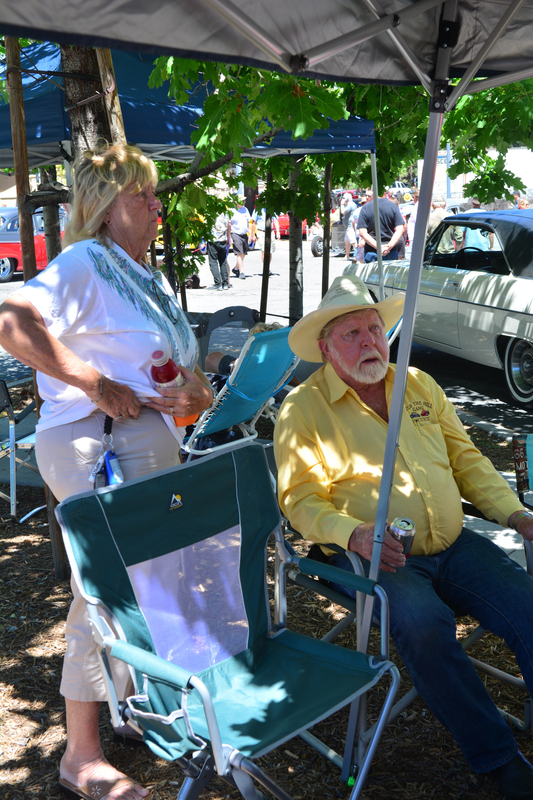 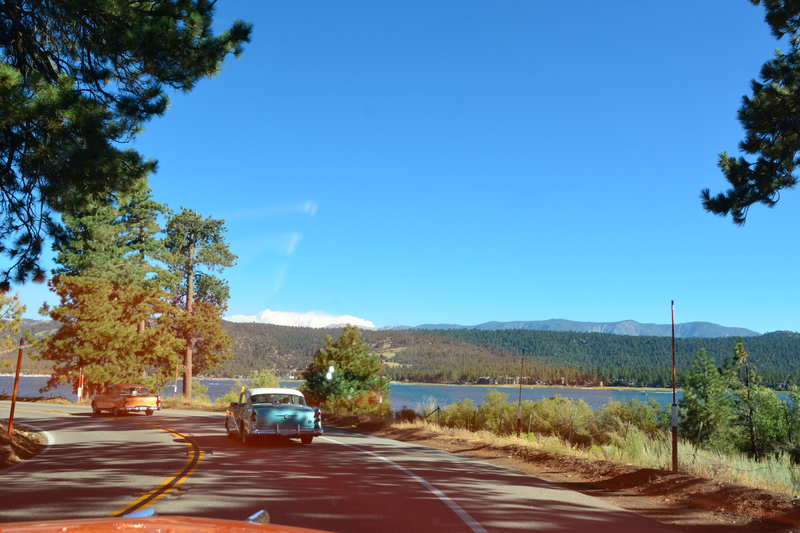 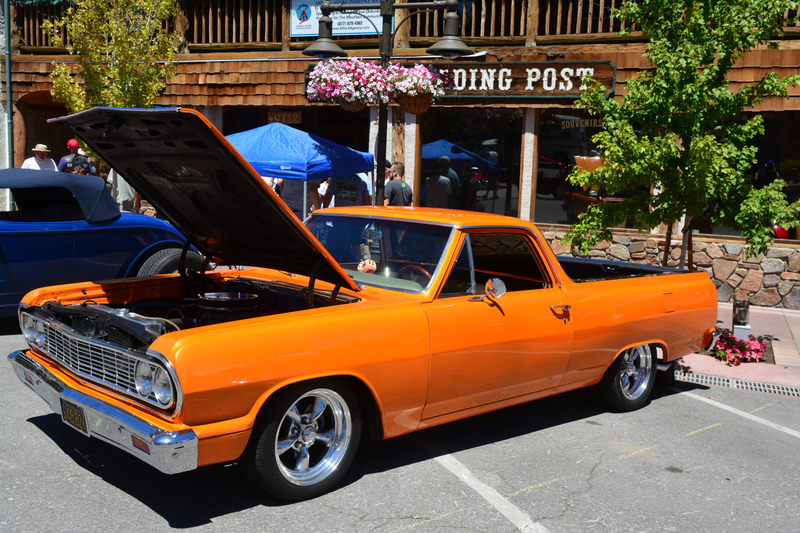 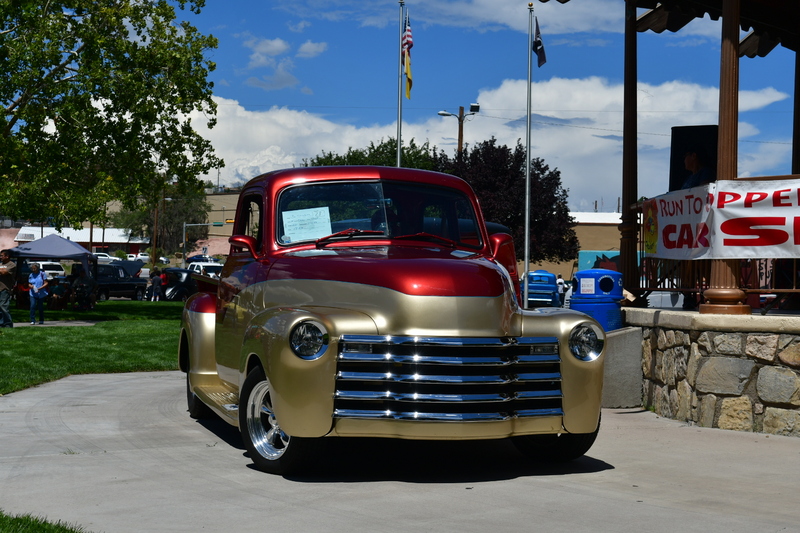 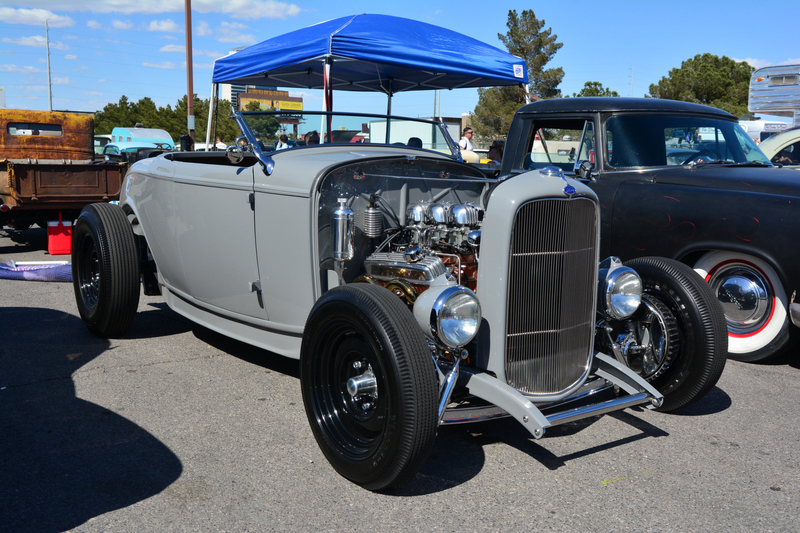 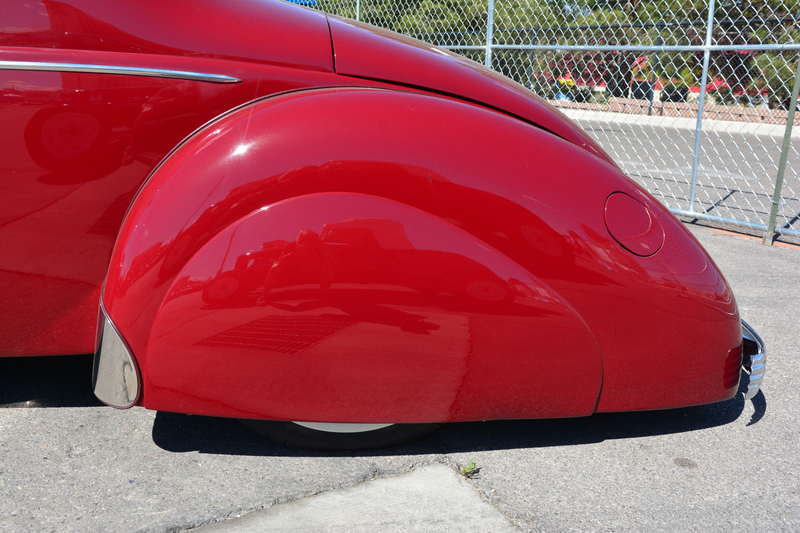 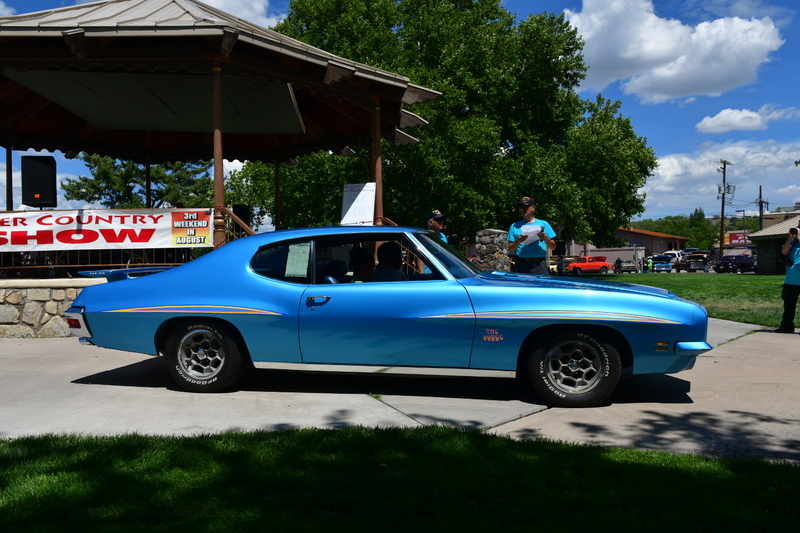 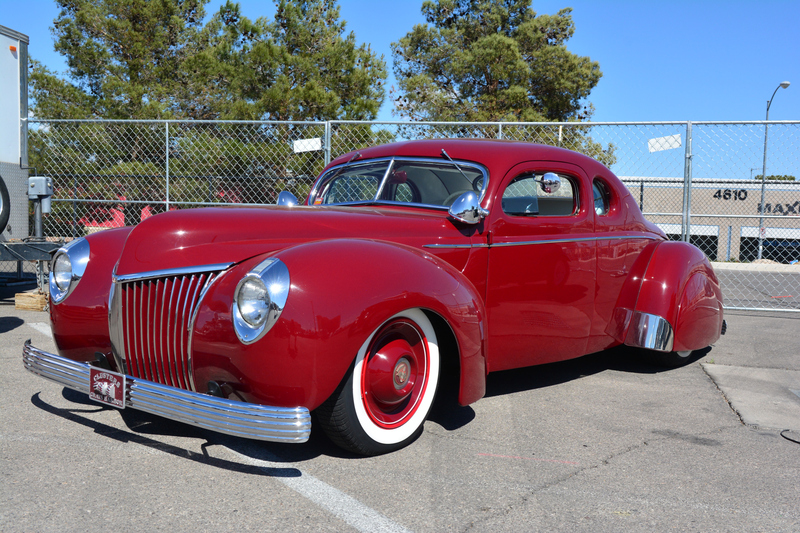 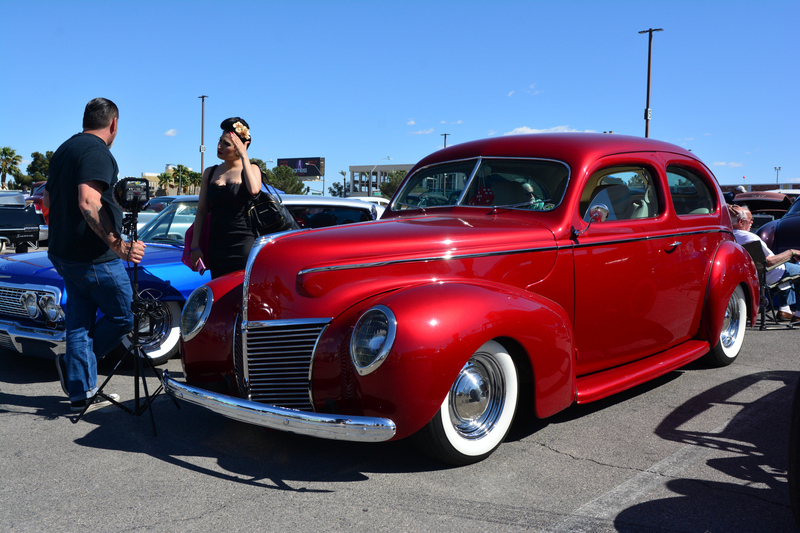 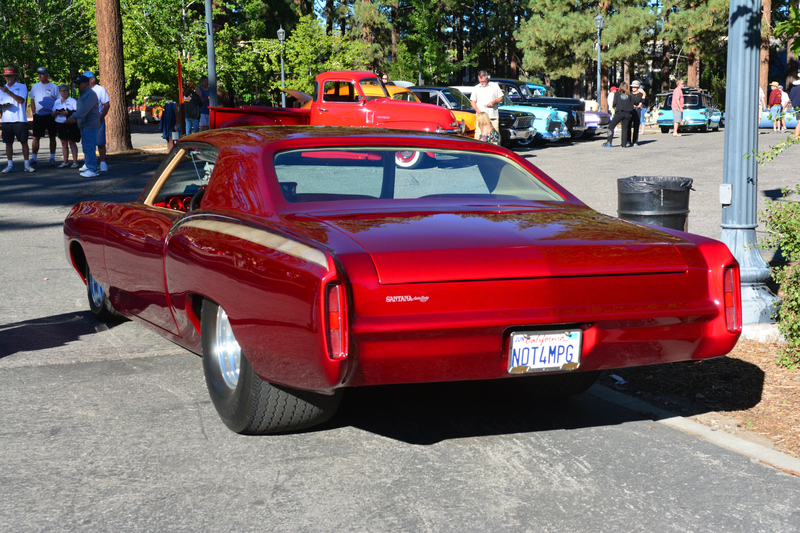 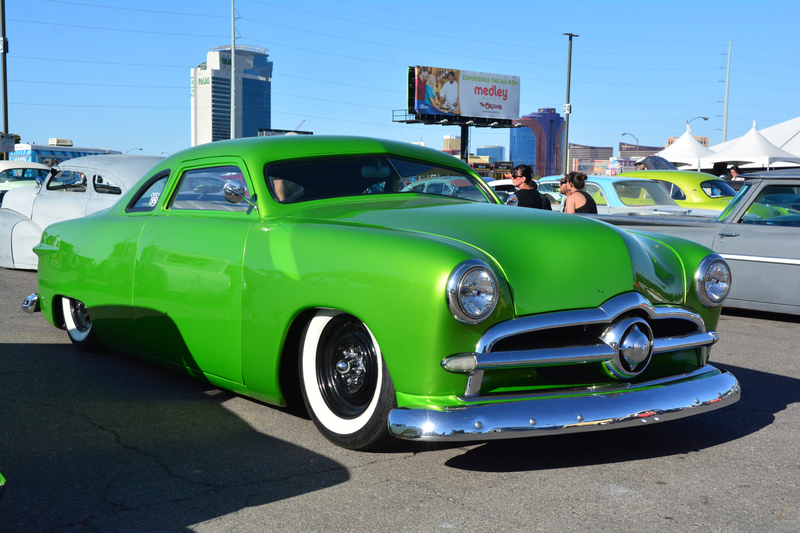 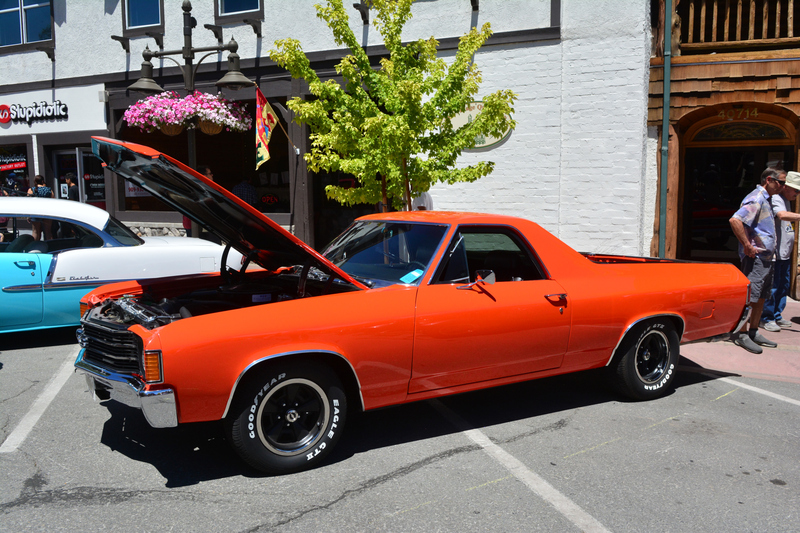 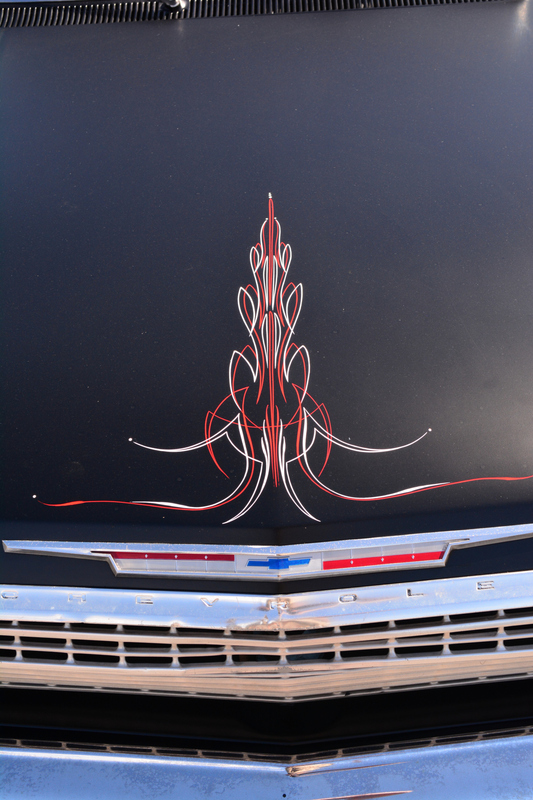 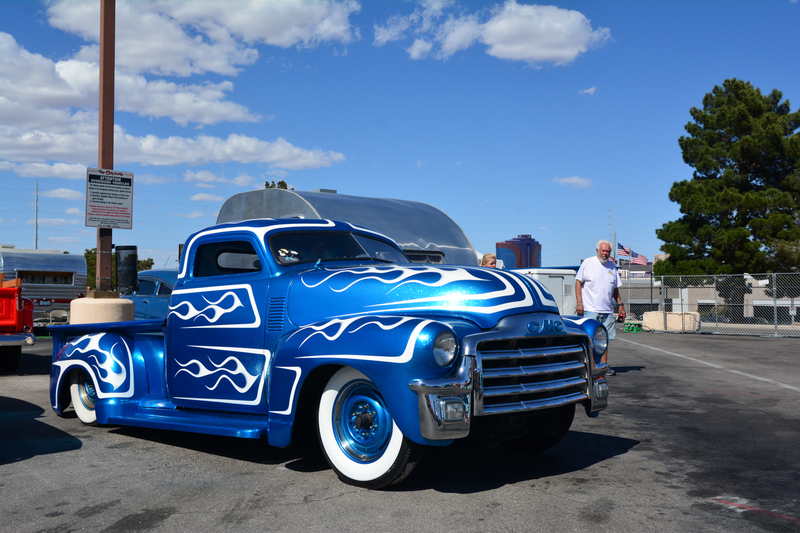 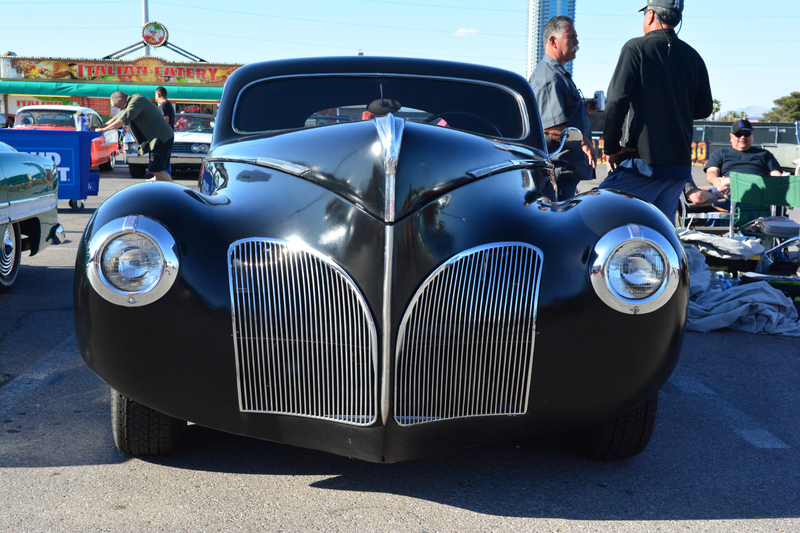 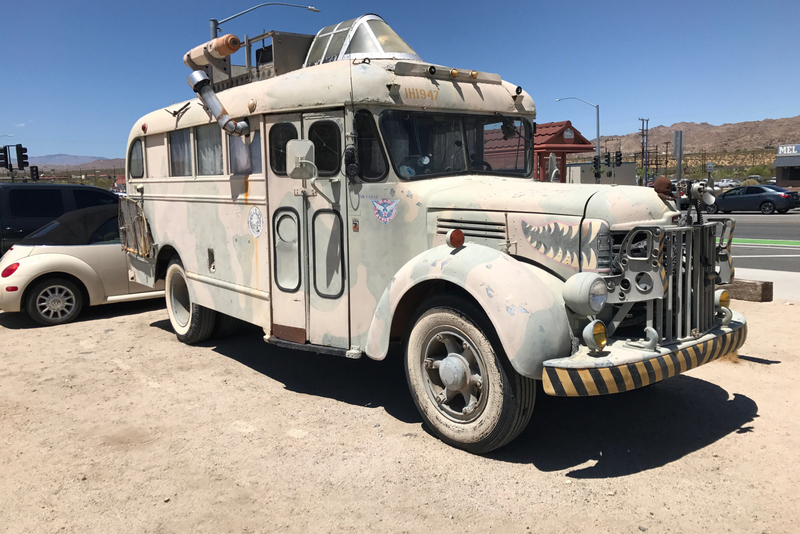 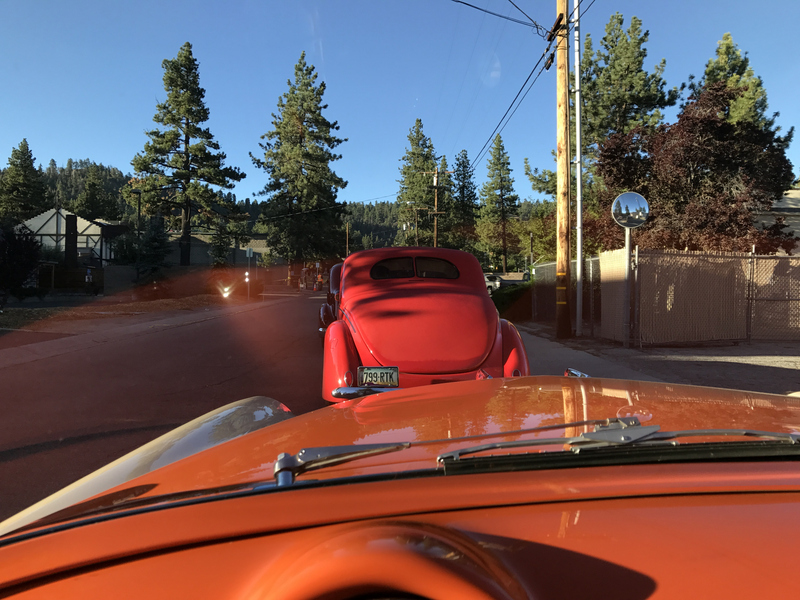 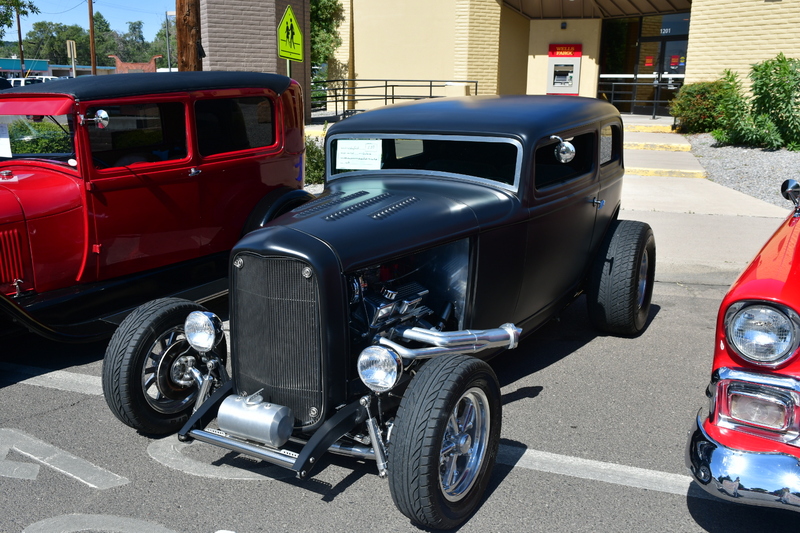 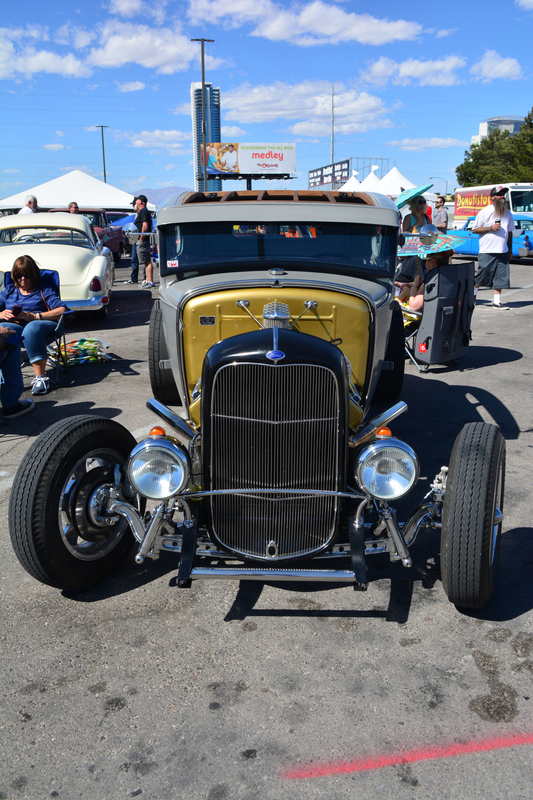 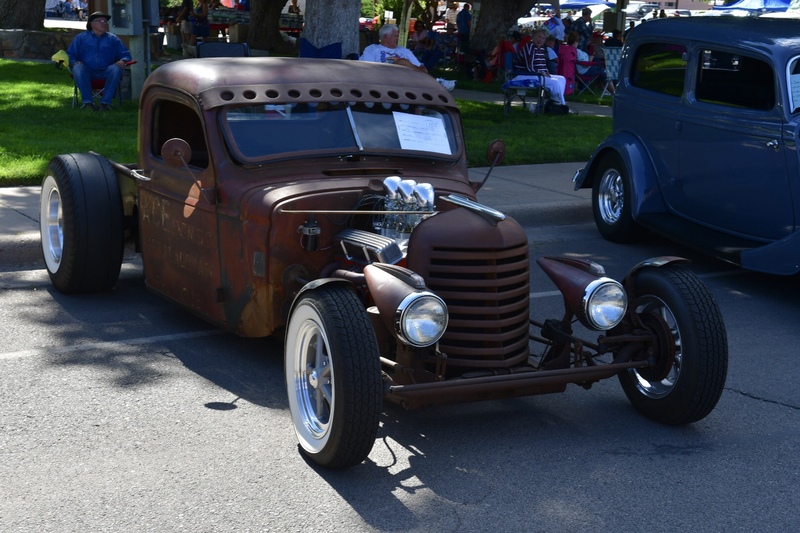 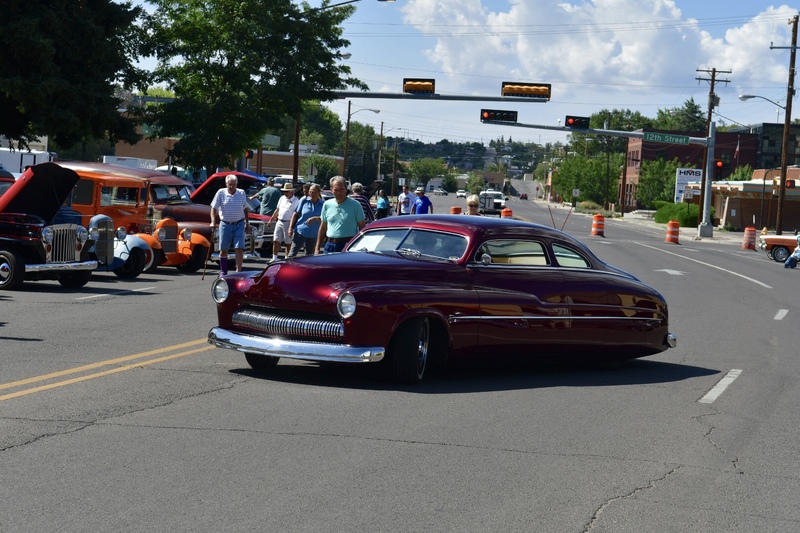 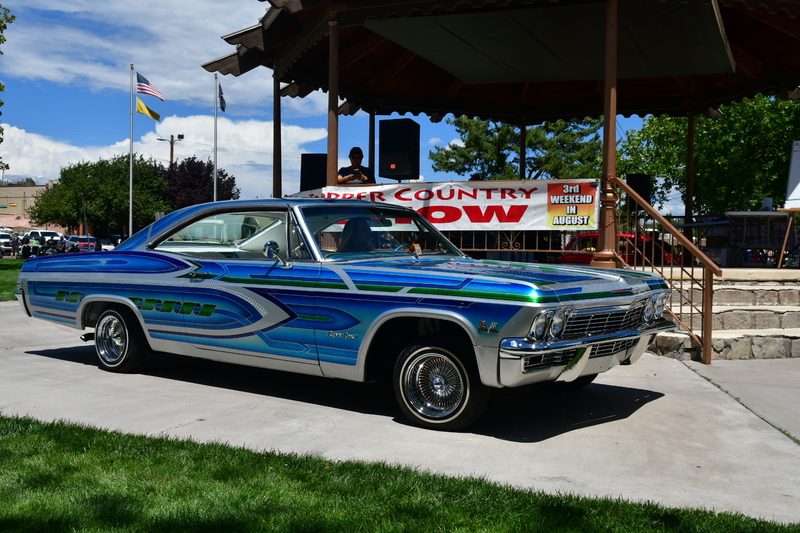 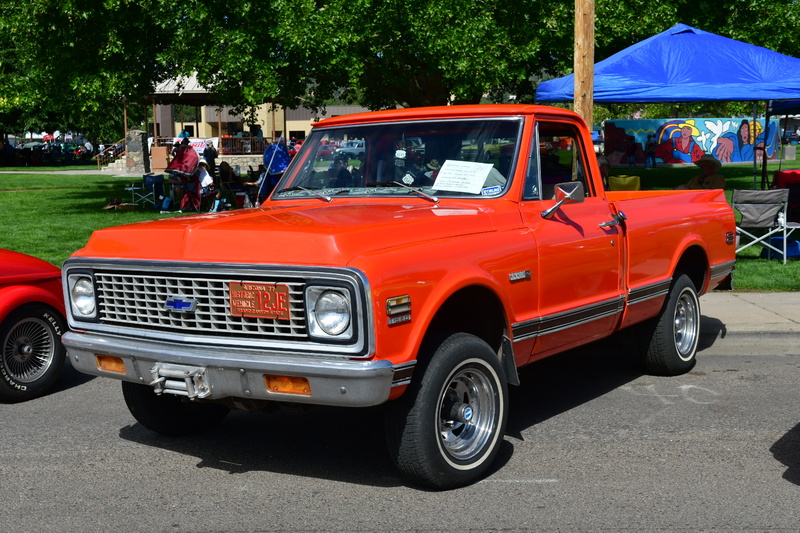 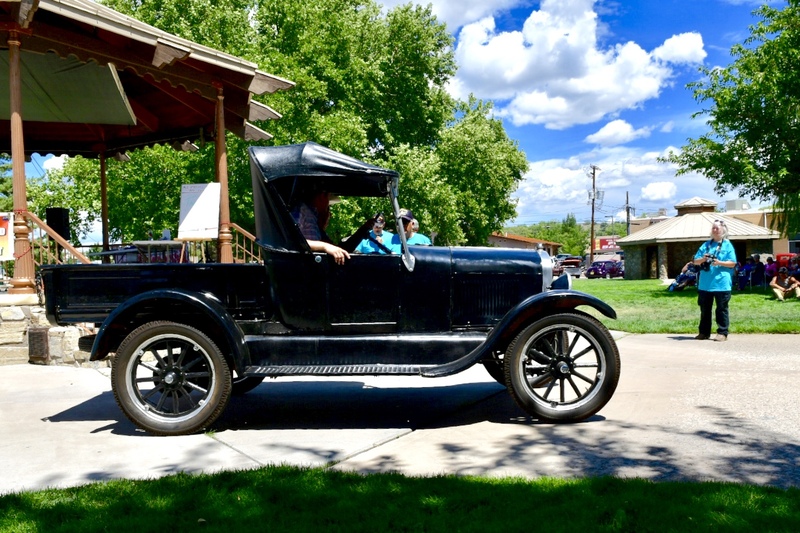 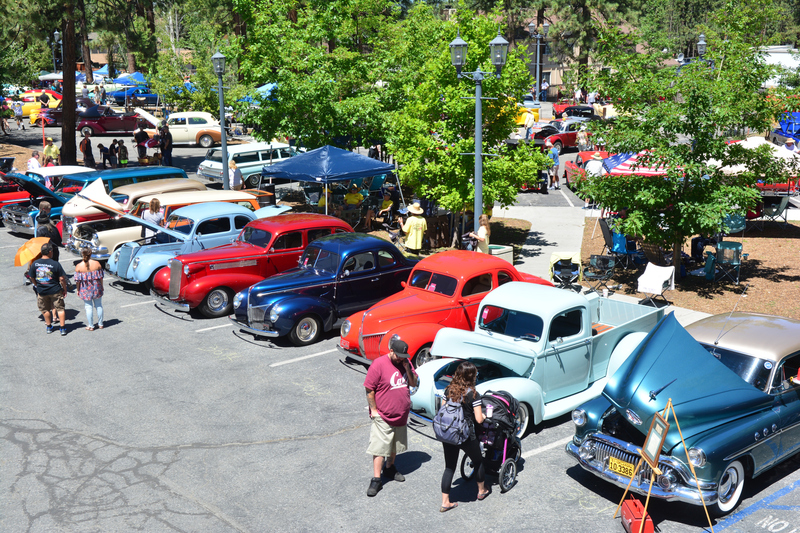 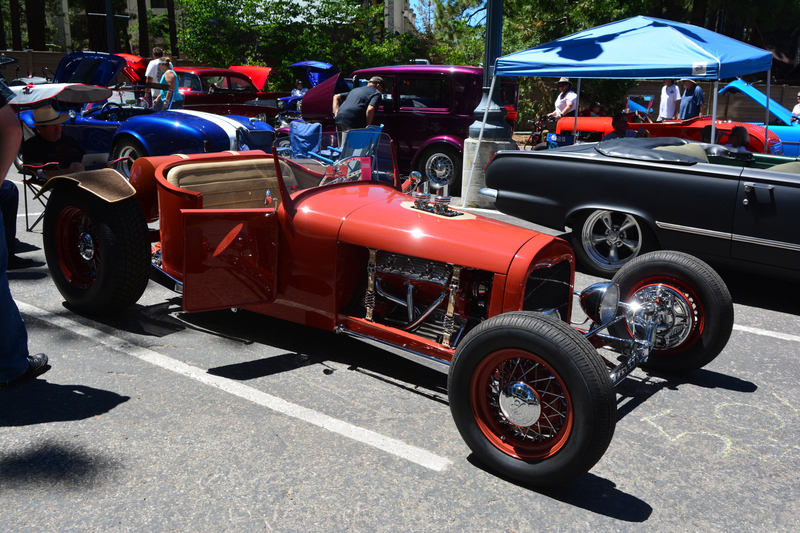 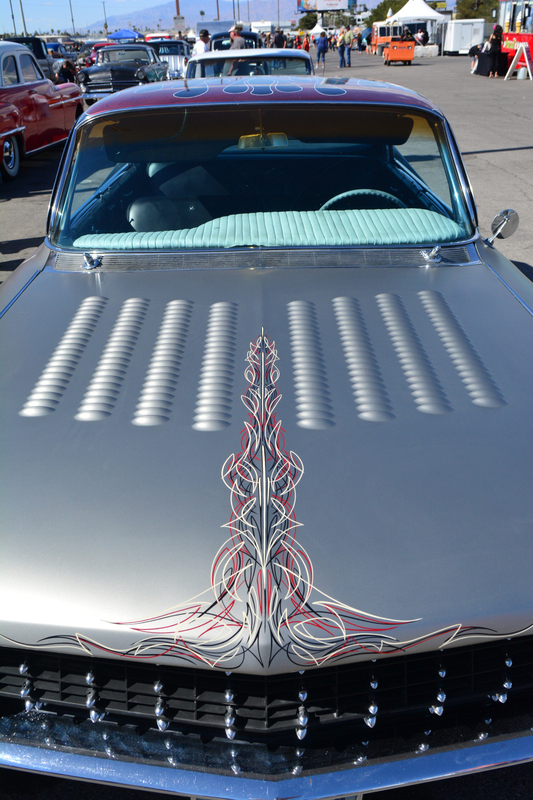 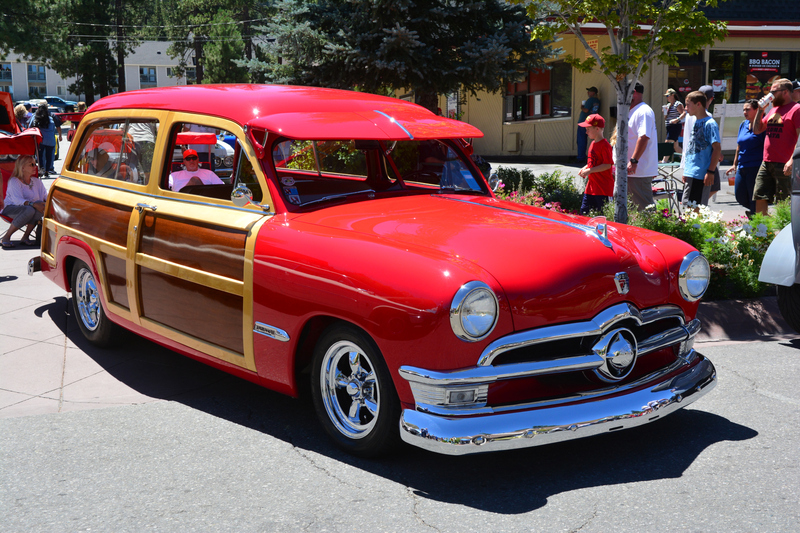 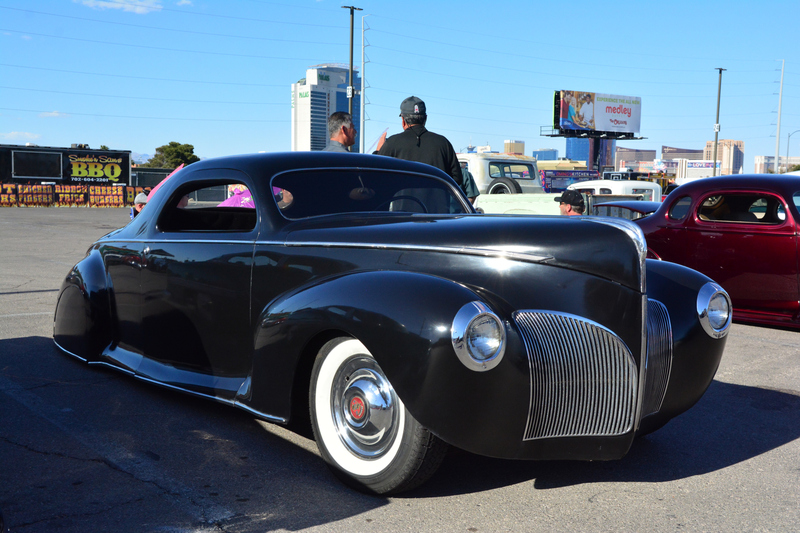 Back in early March my friend Bob Horvath who goes to our gym mentioned that he and a few other folks from the mountain were heading up to Farmington, NM for the 34th Annual Northern New Mexico Street Rodders Car Show in April. 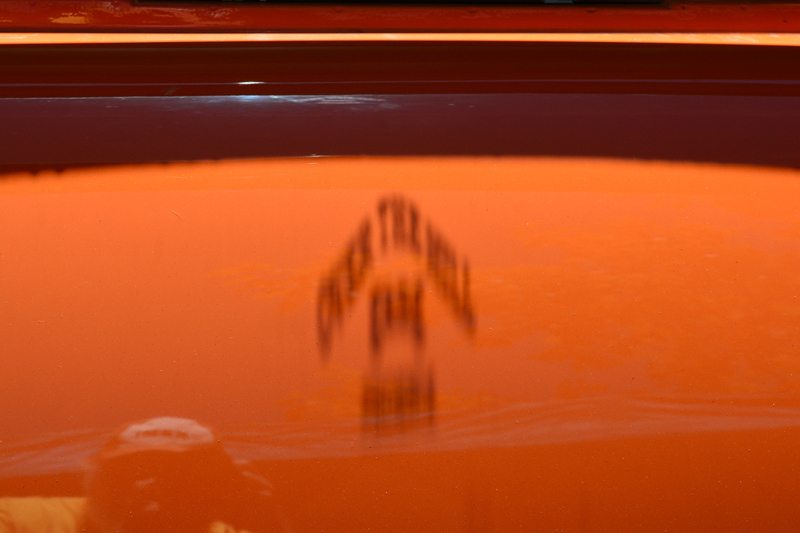 It sounded good to me so I passed the word around to most of the usual suspects which like to go on the longer runs. 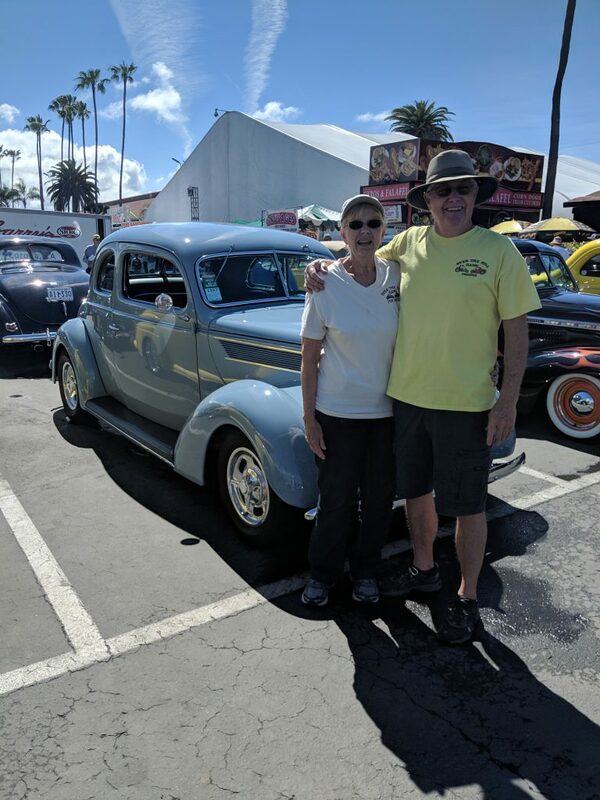 Frank and Rose Svancara decided to join us for the trip. 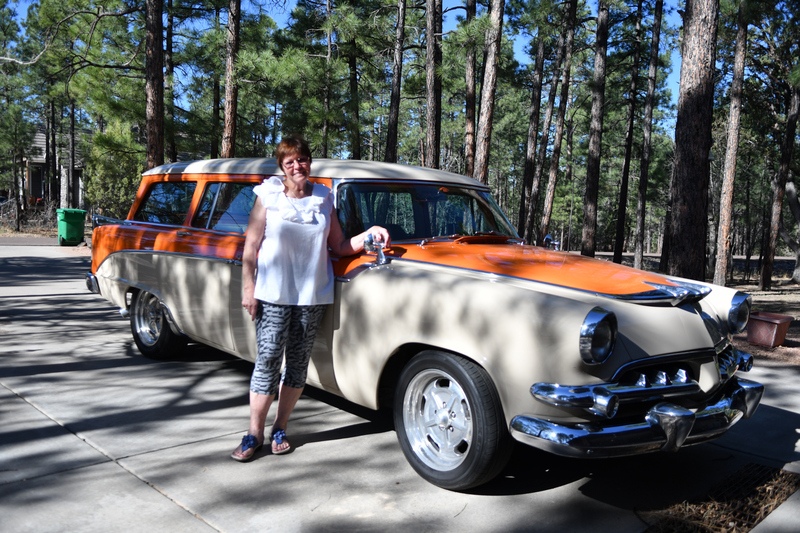 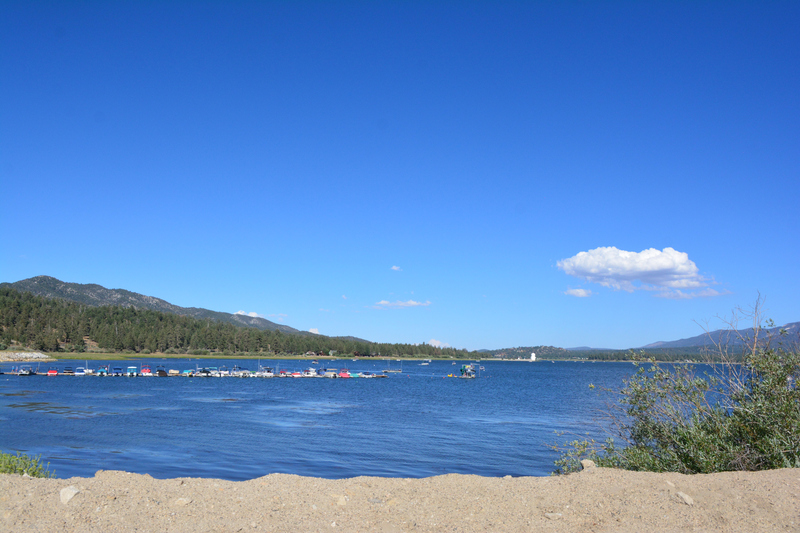 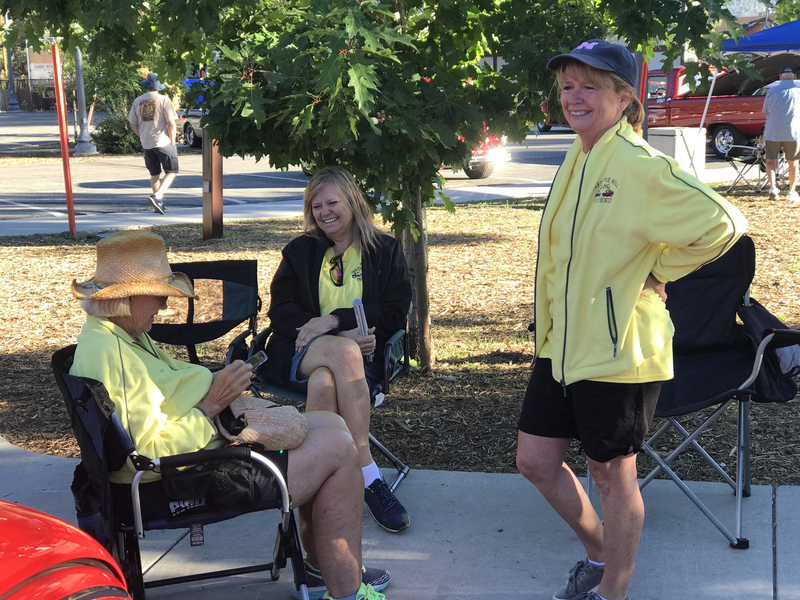 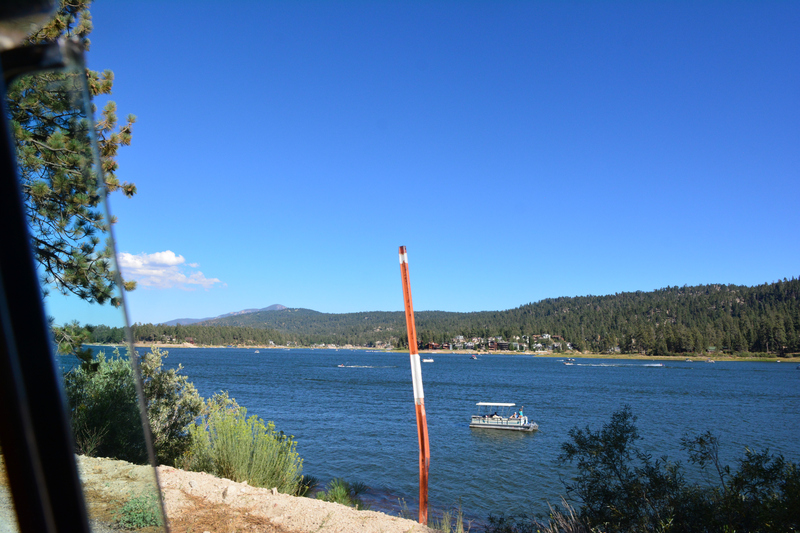 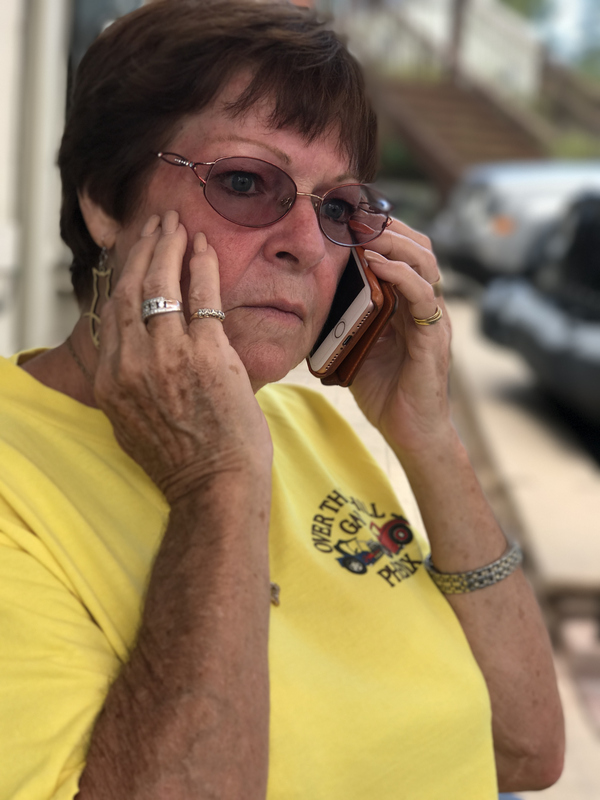 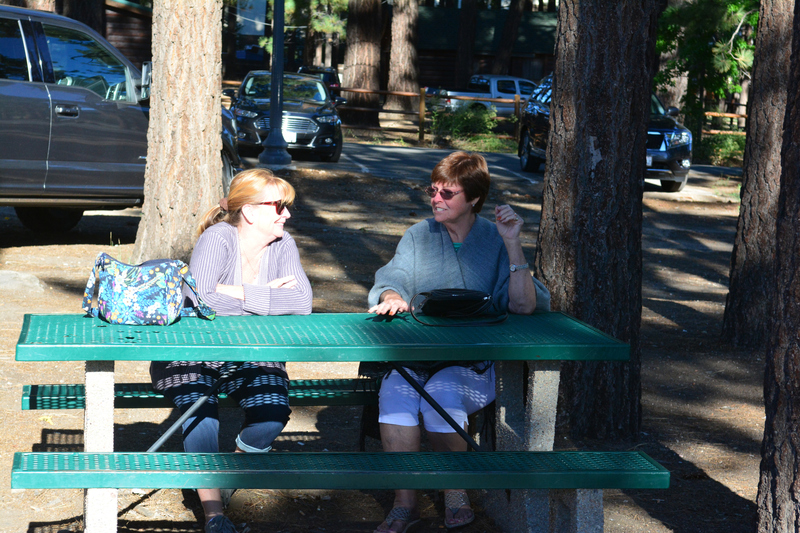 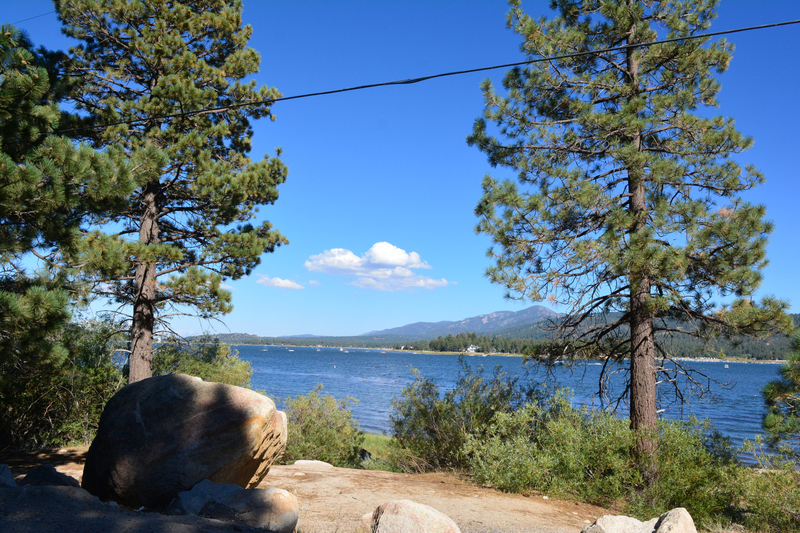 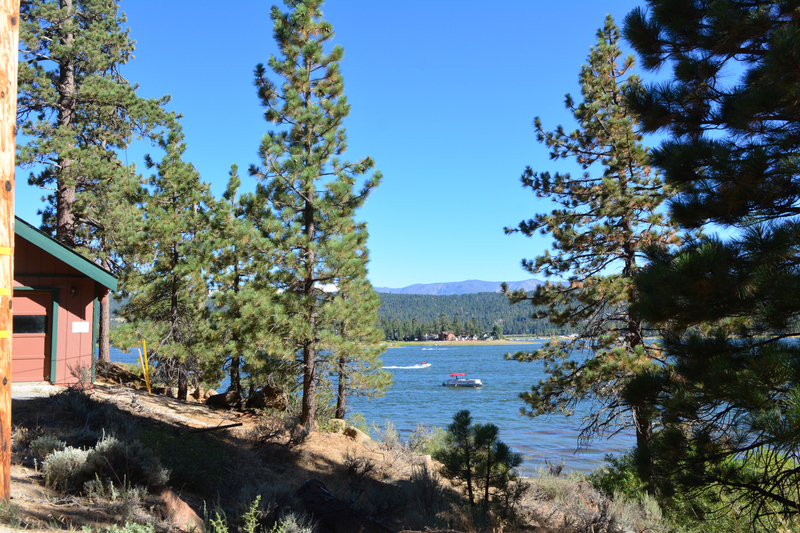 The group from the White Mountains included Rick & Kim Fernau, Bob & Ona Horvath, Joe & Glenda Bailey and Al & BJ Mercer. 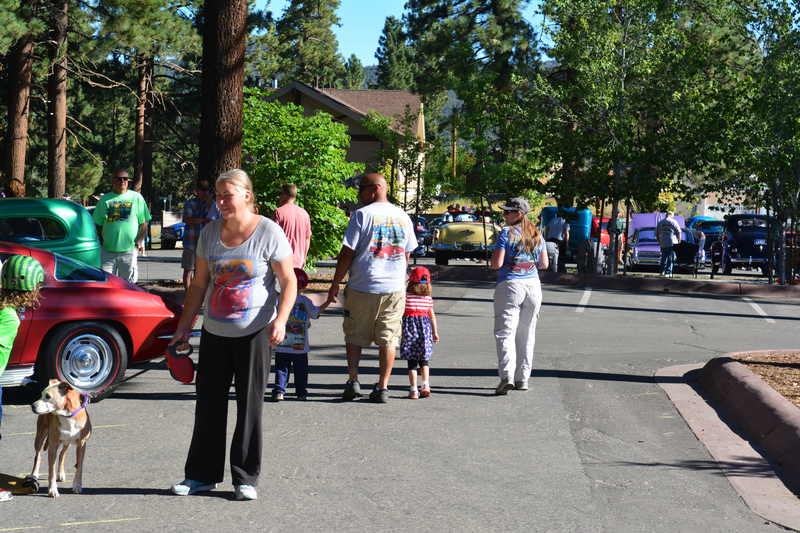 The White Mountain folks left Show Low at 8:00 AM. 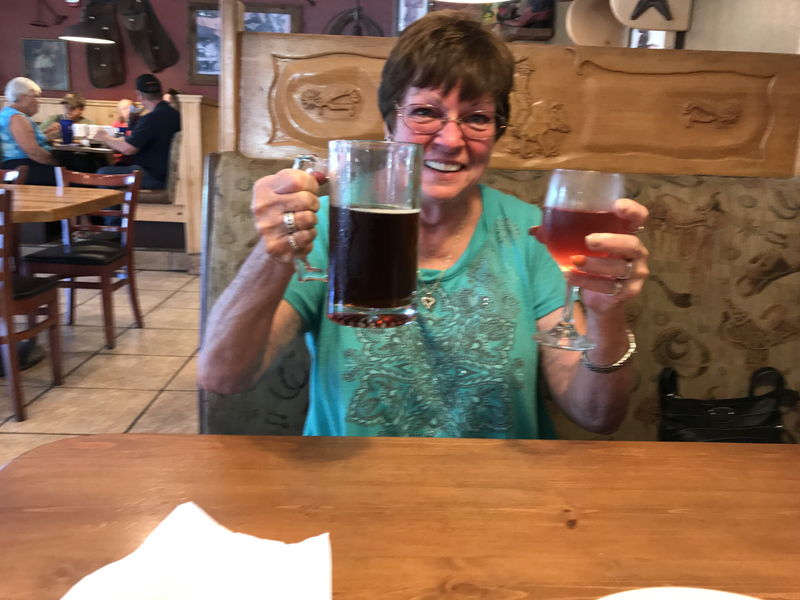 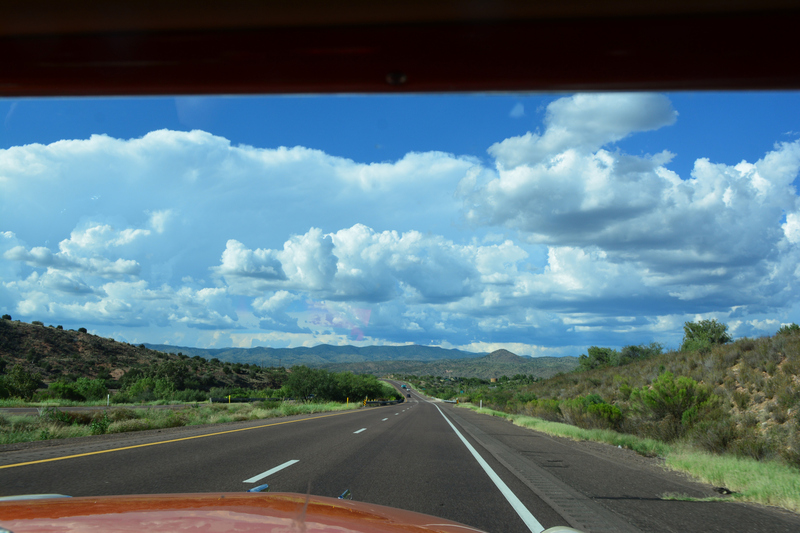 Frank and I met at Sanders, AZ at 10:30 and headed to Gallup for lunch. 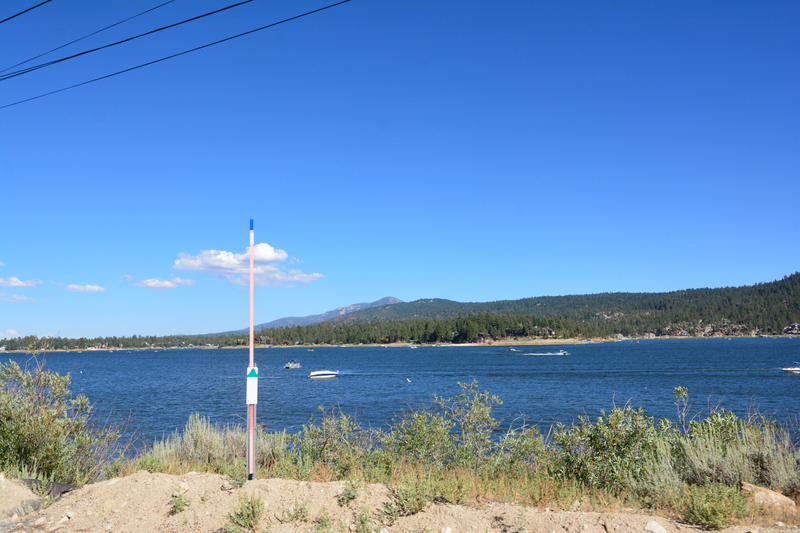 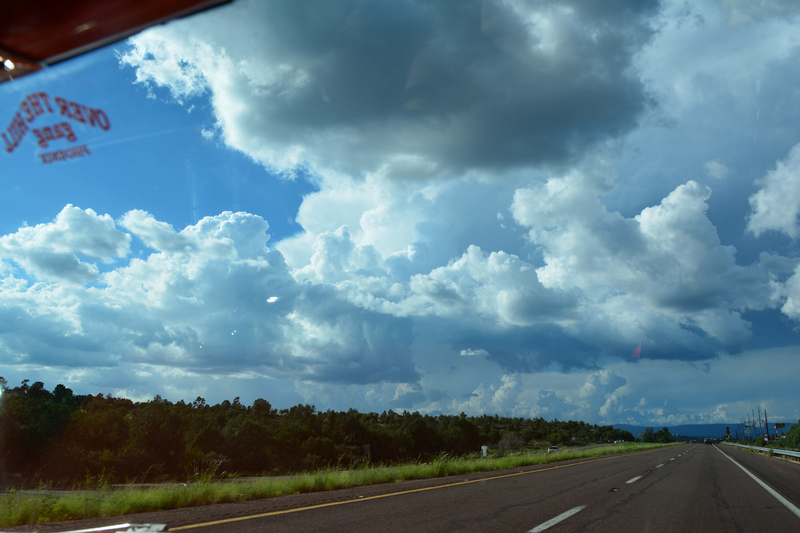 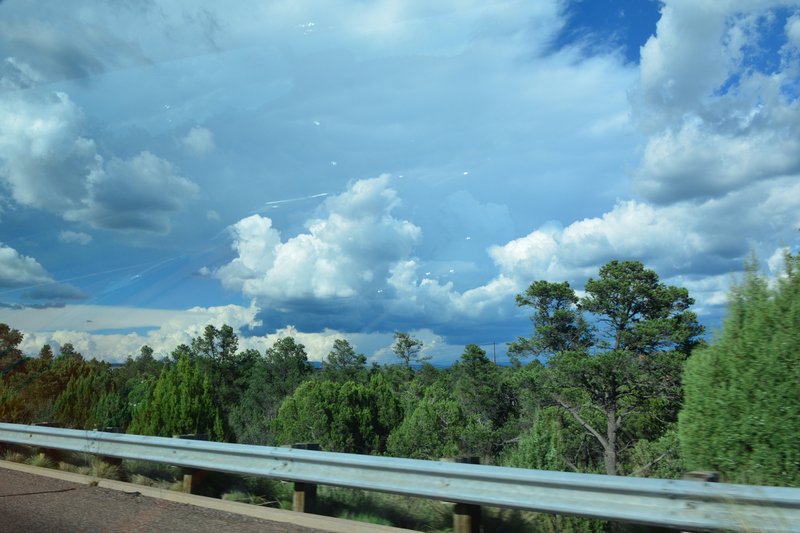 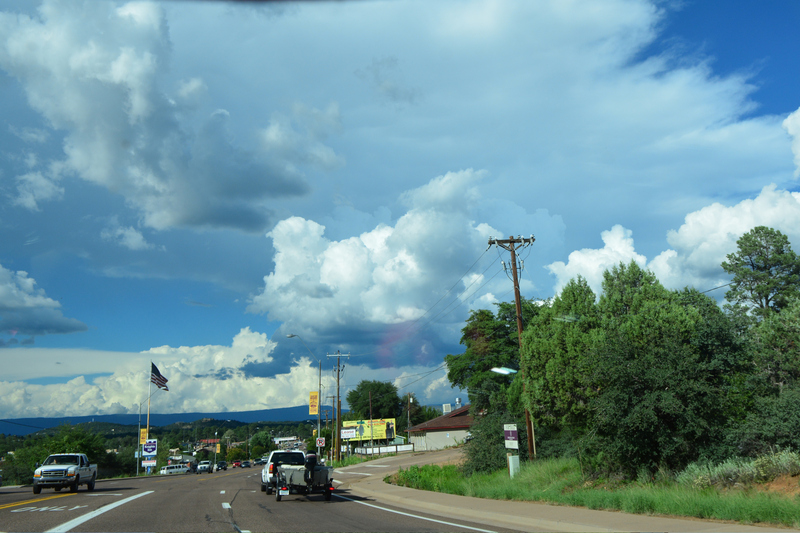 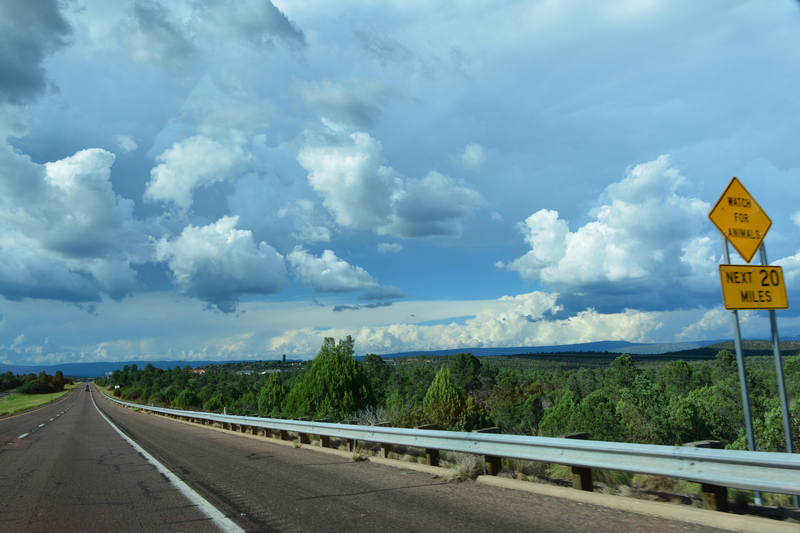 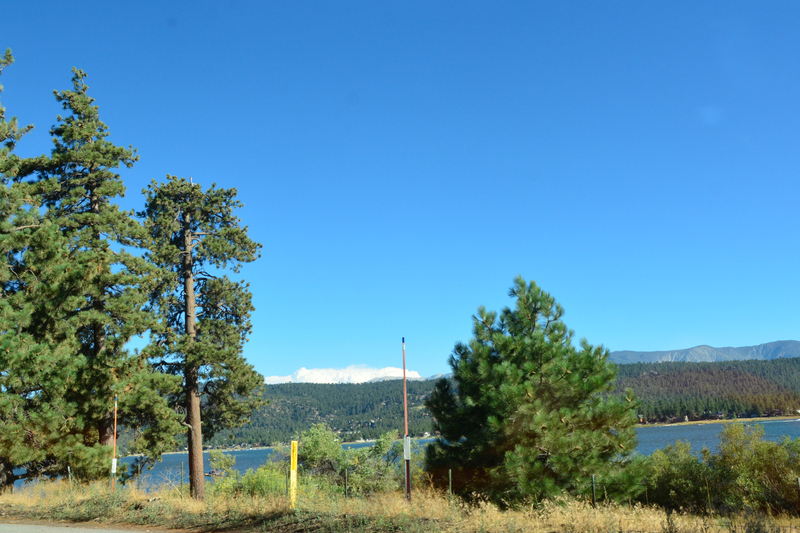 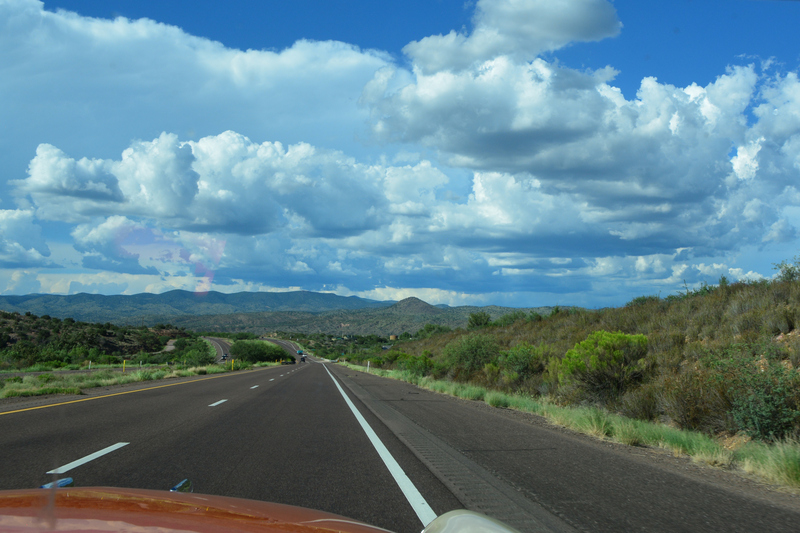 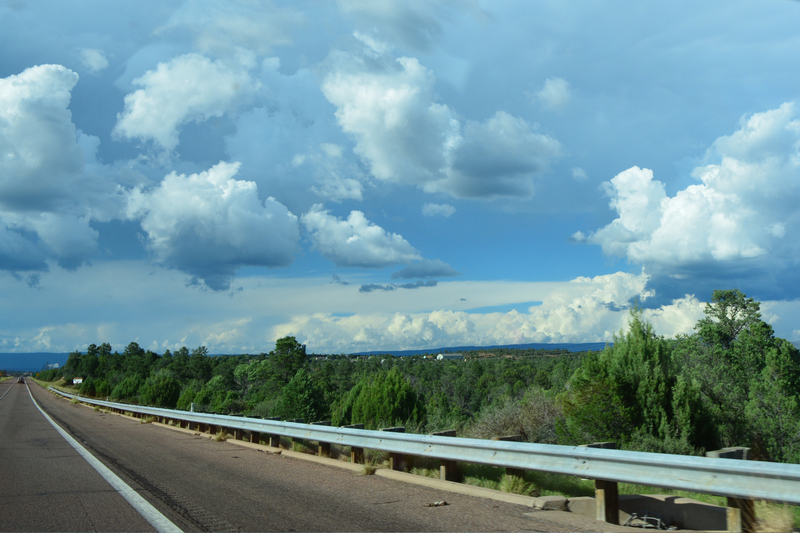 We headed up 491 toward Ship Rock, and took BIA 5 over the 371 and on to Farmington. 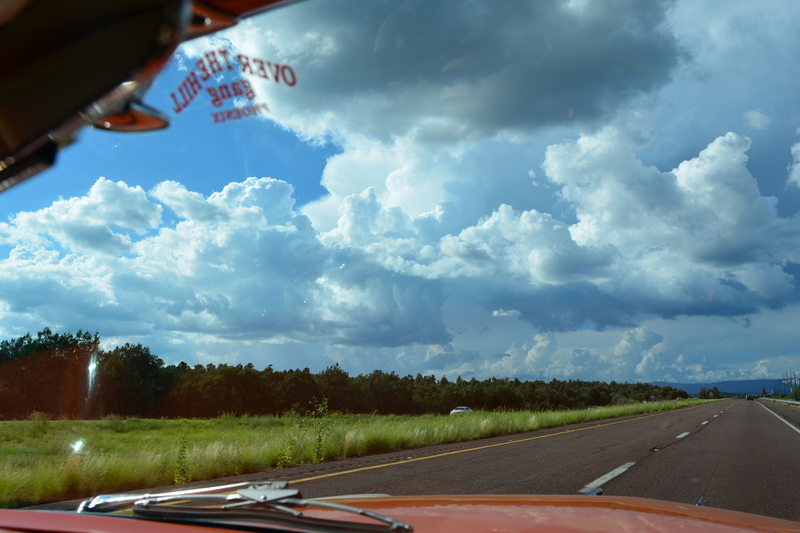 For the most part both 491 & 371 were very rough and 491 was under construction for 22 miles. 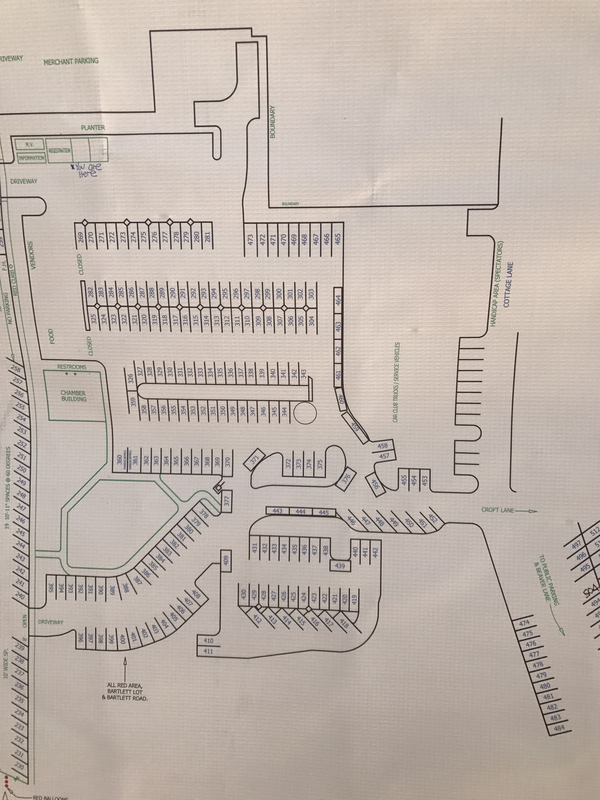 They are widening it to 4 lanes which should be a good deal in the future, but a PITA now. 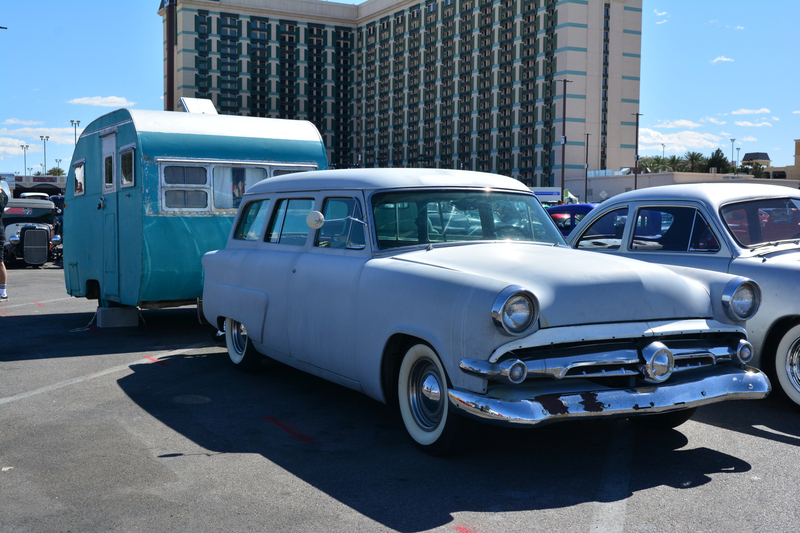 The venue for the show was McGee Park Convention Center. 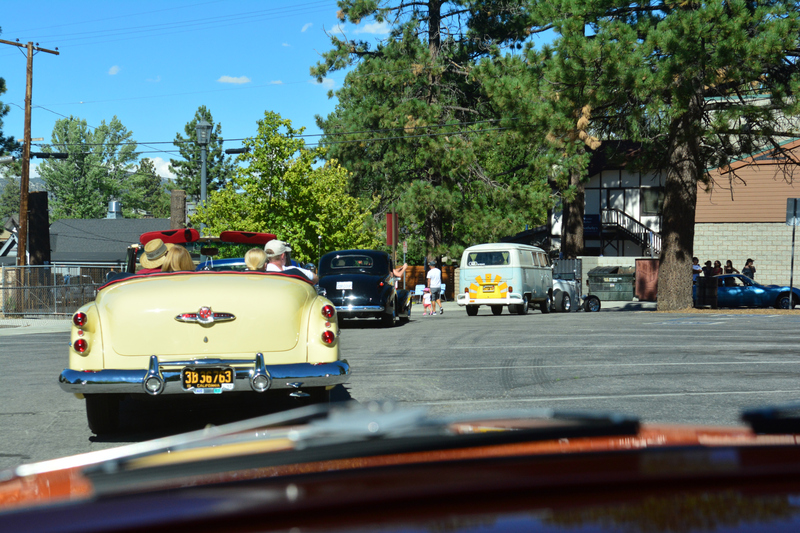 Participants had the option of parking inside a very large building (wish we had one like it in Show Low!) 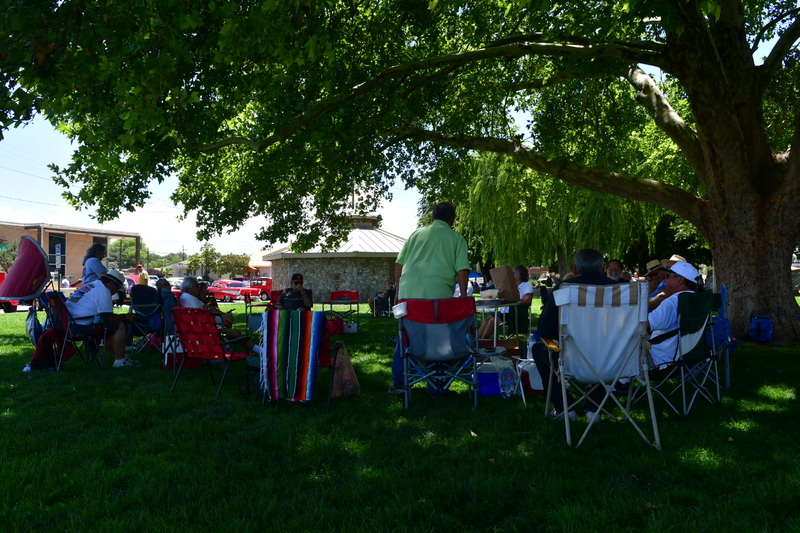 or outside which had a very large covered pavilion. 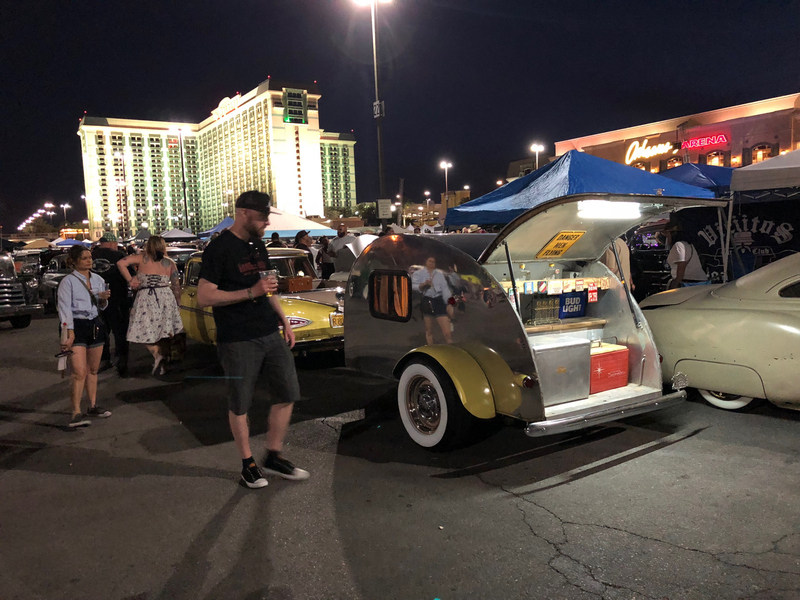 If you parked inside your car was there for the duration of the show, so all of us opted for the pavilion which was a good choice. 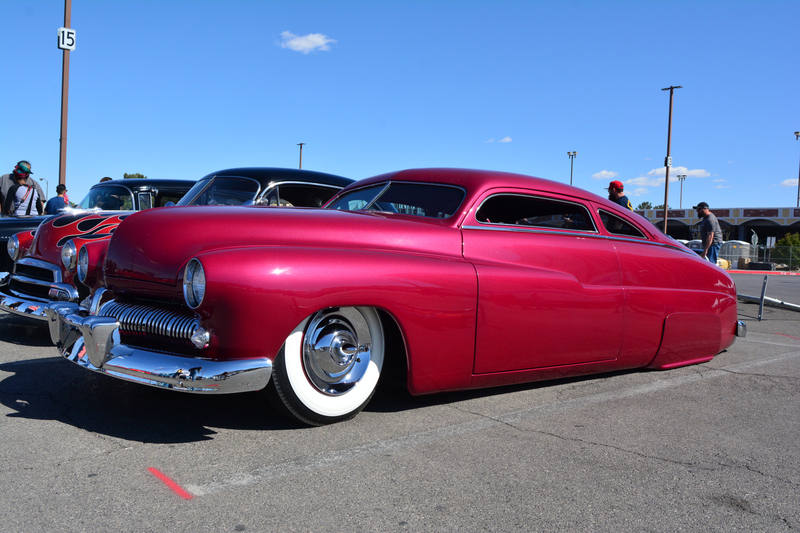 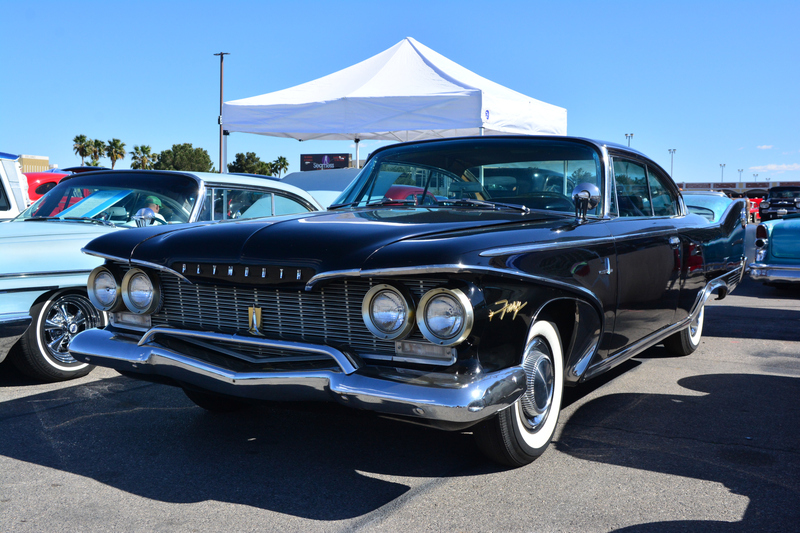 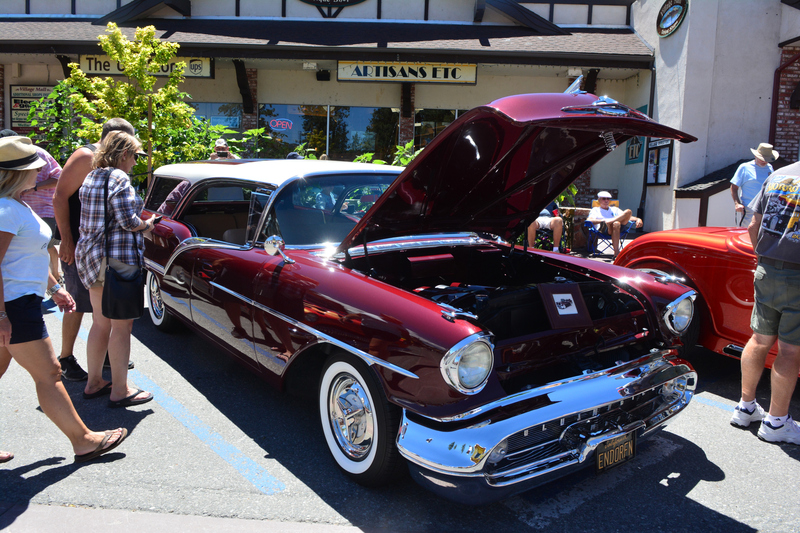 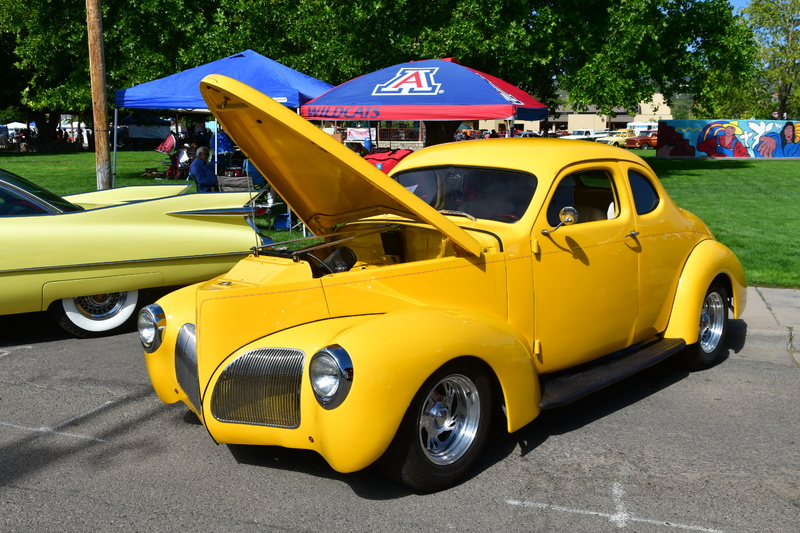 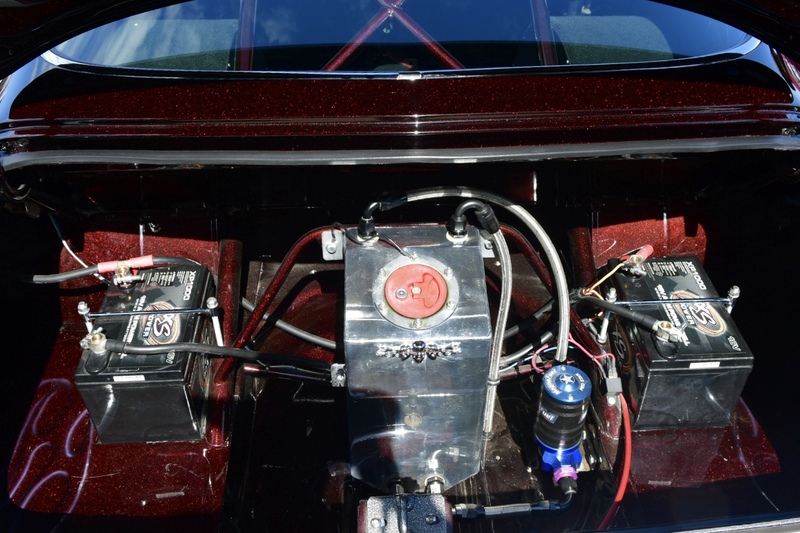 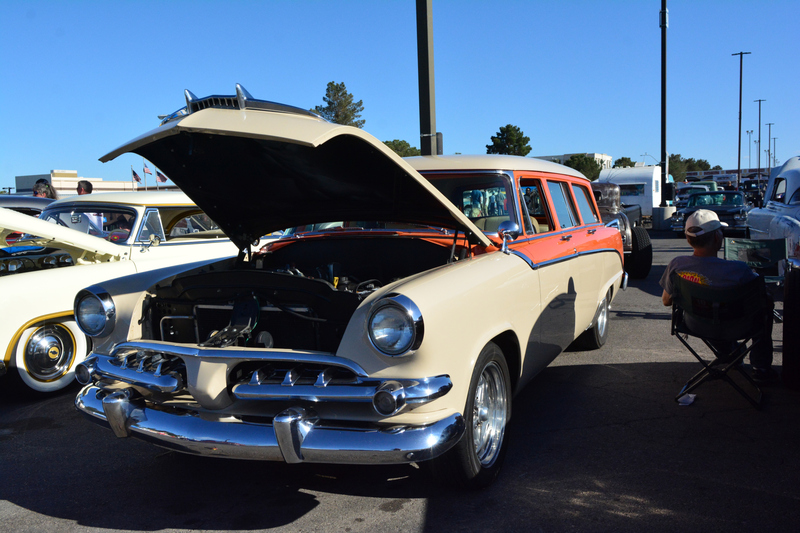 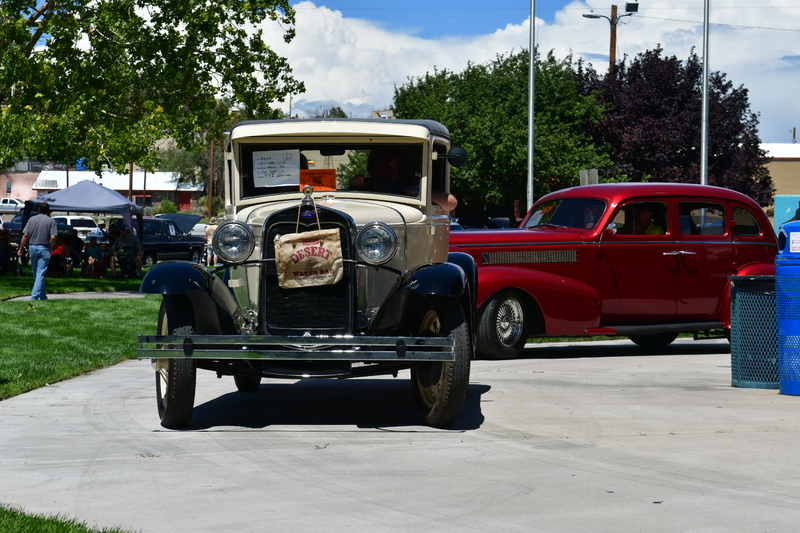 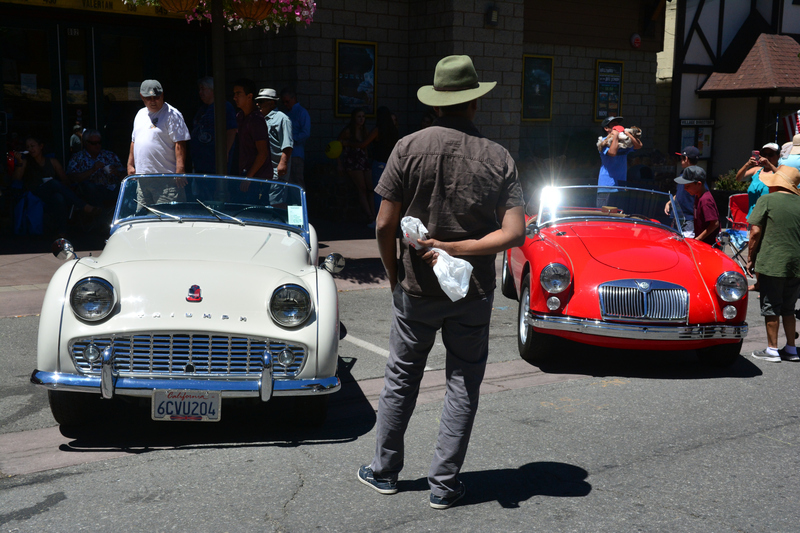 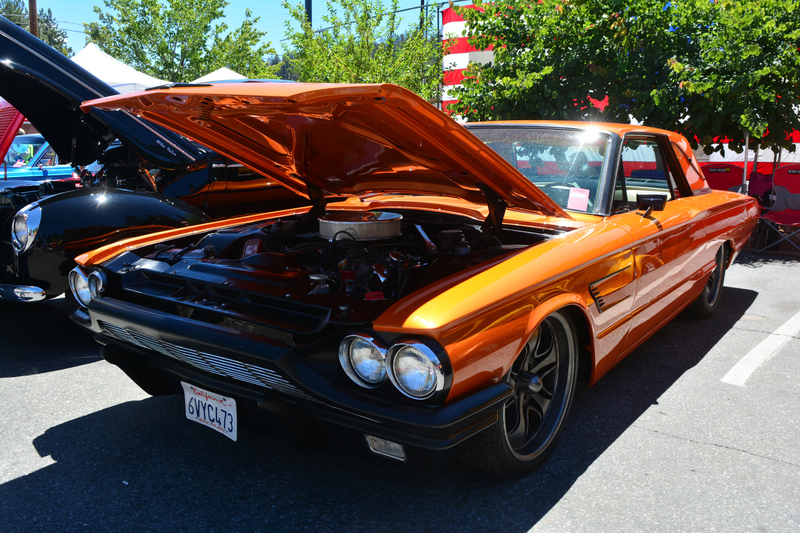 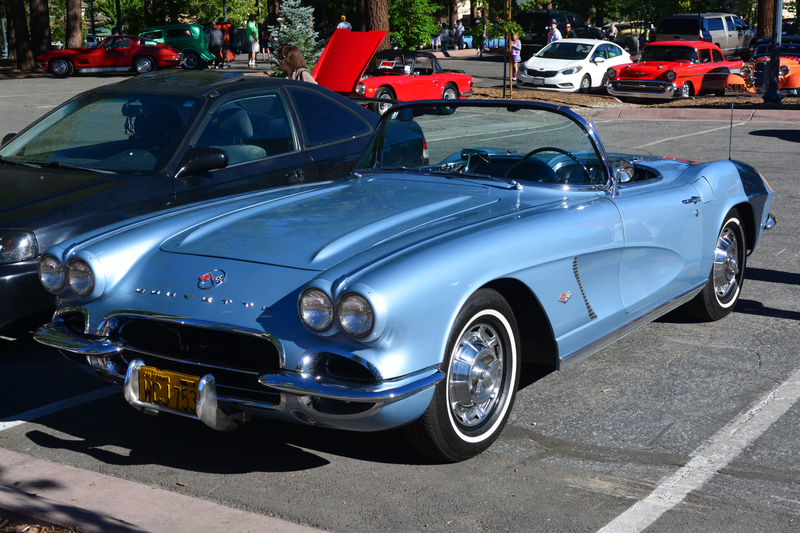 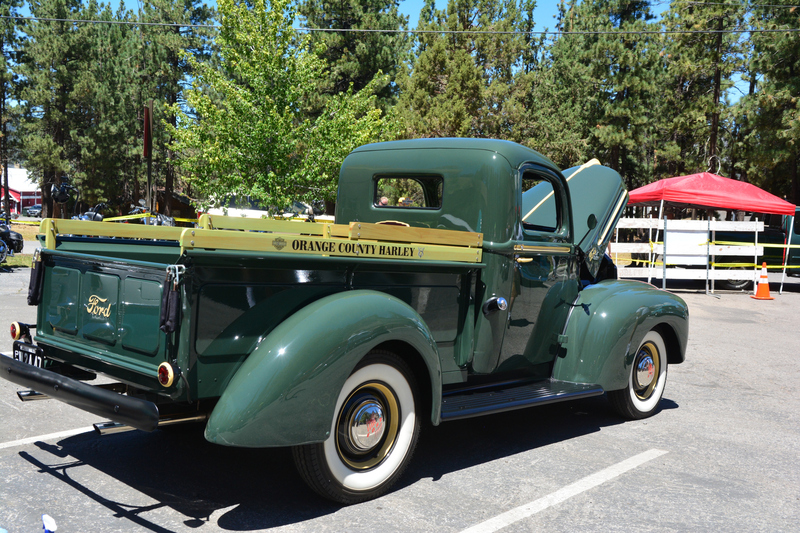 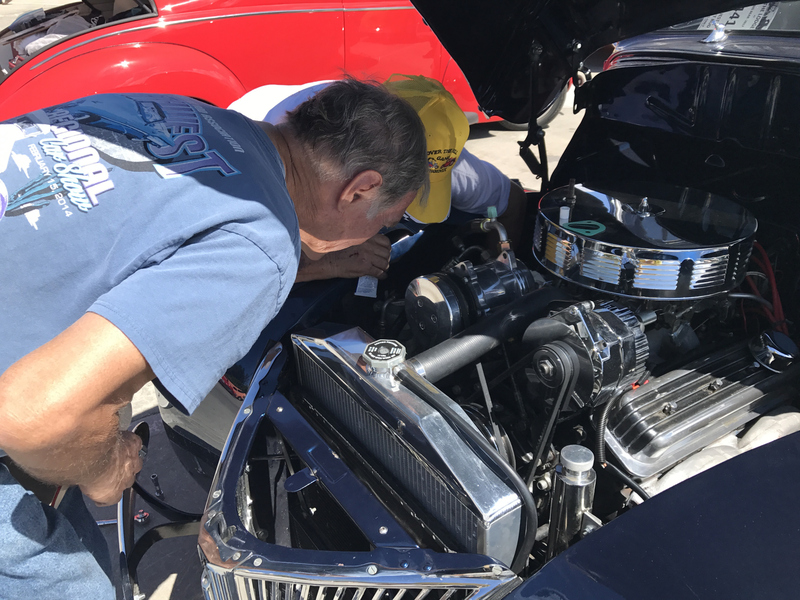 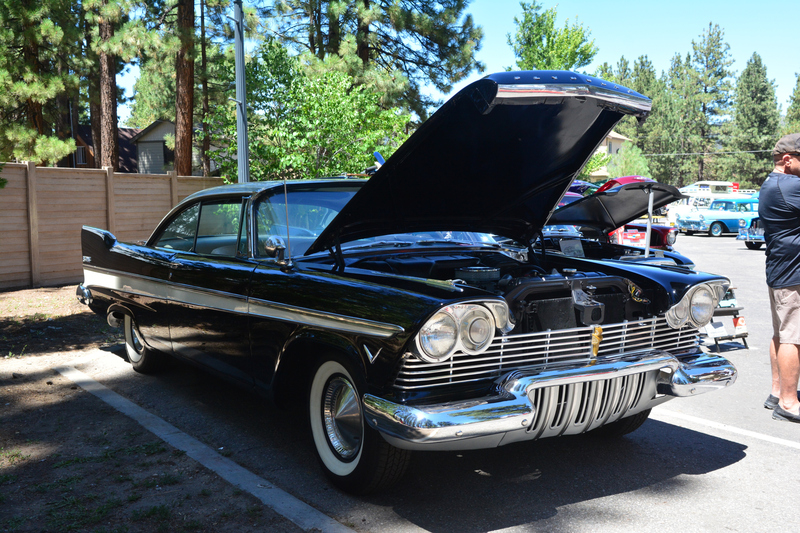 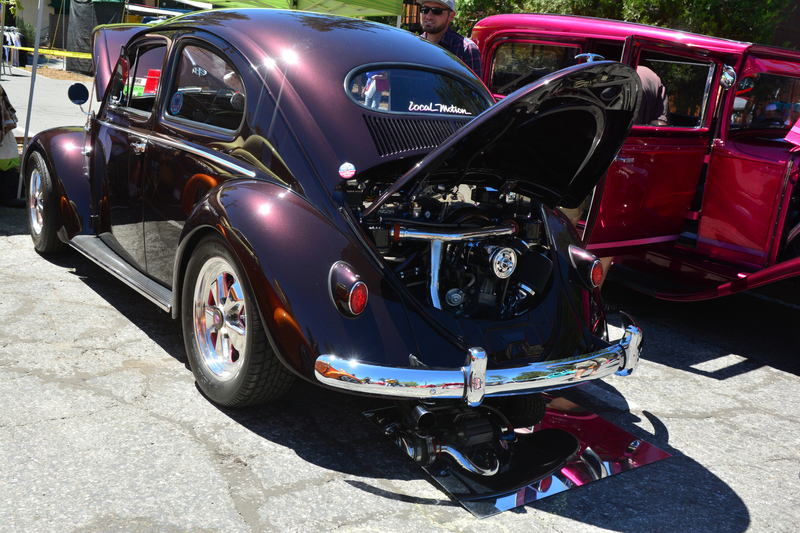 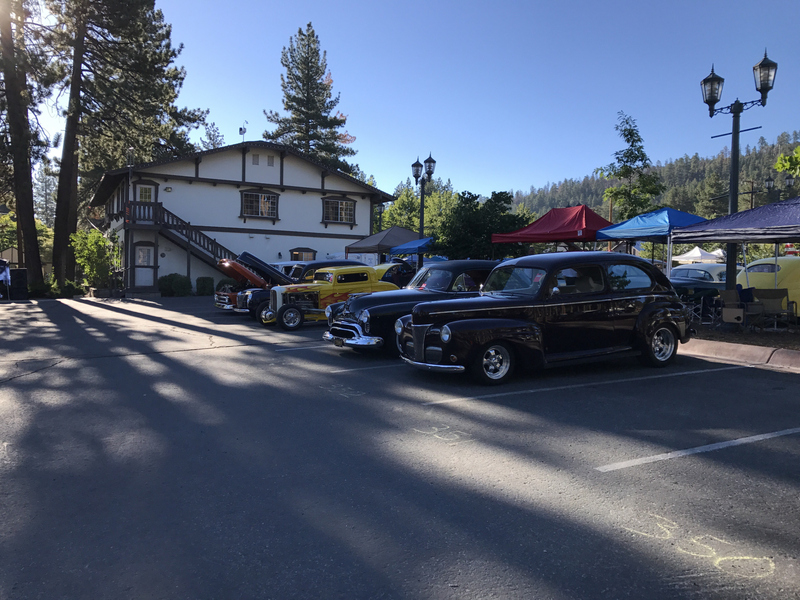 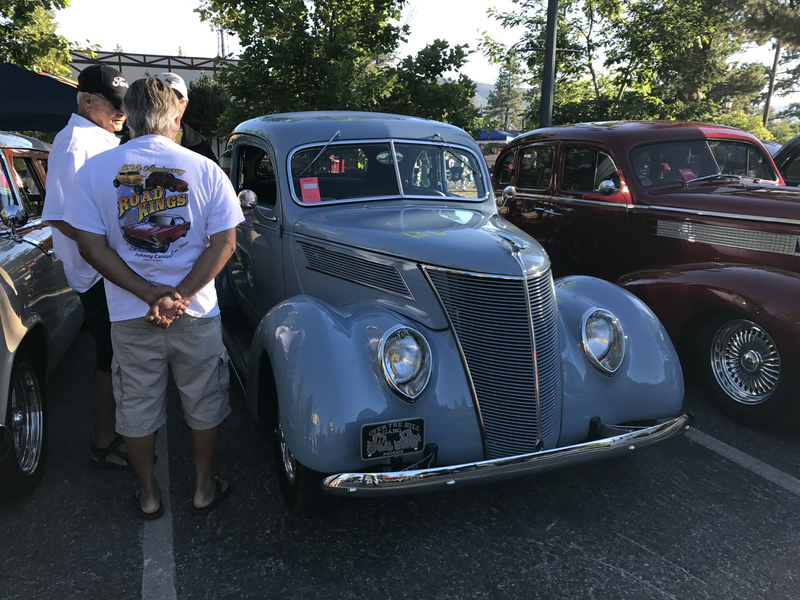 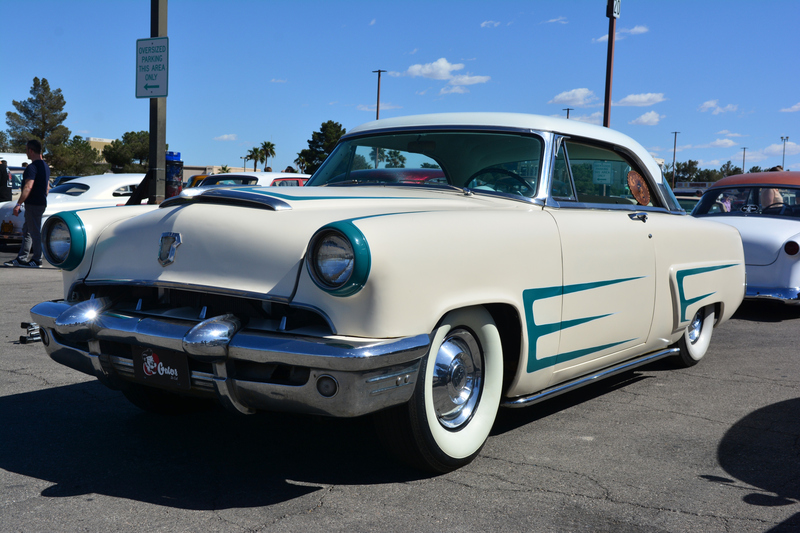 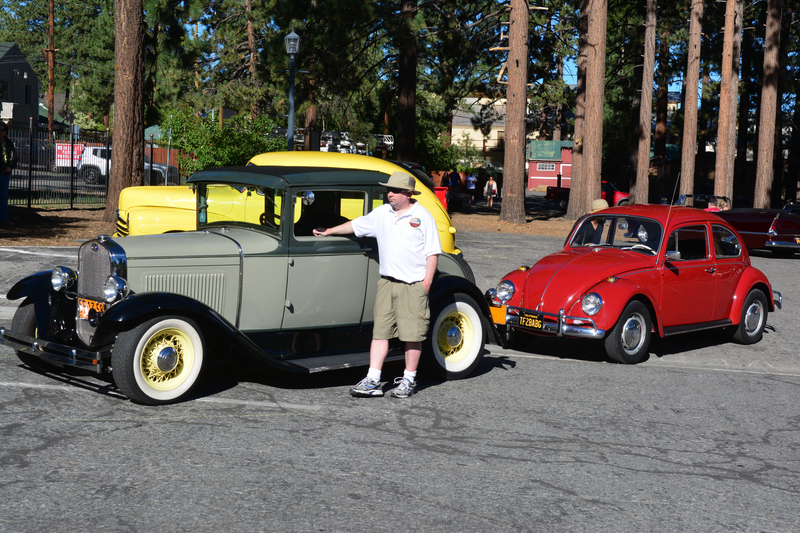 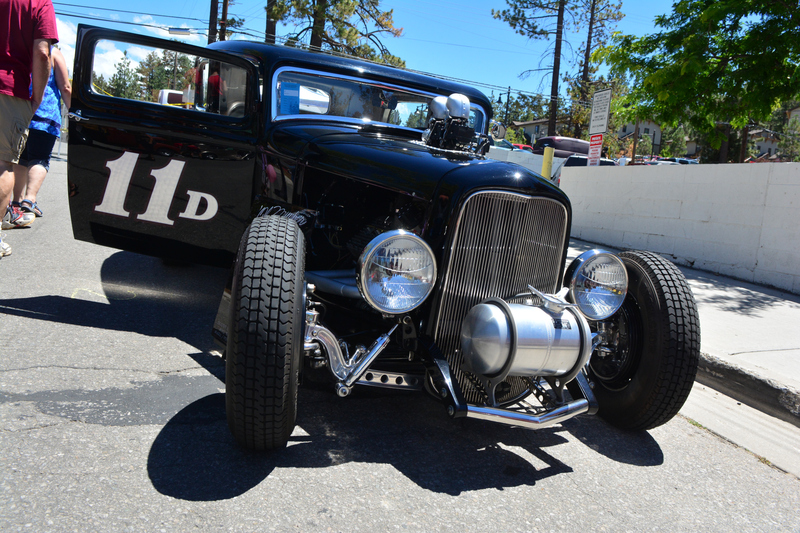 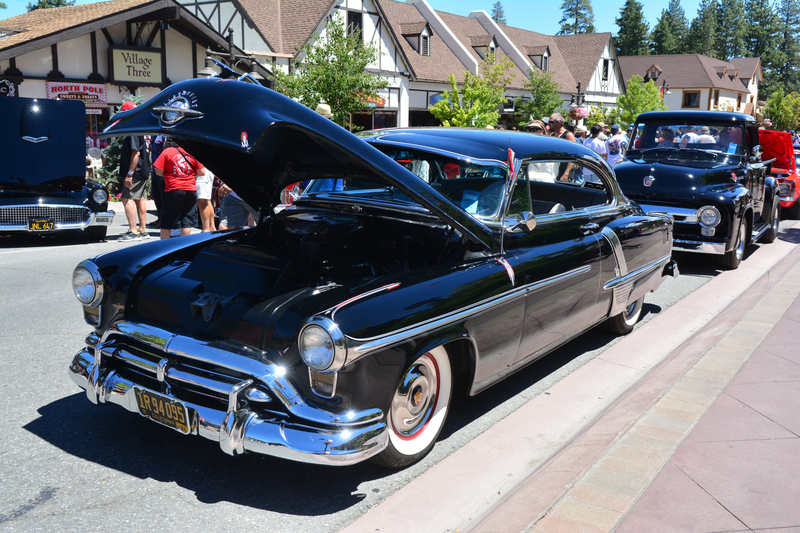 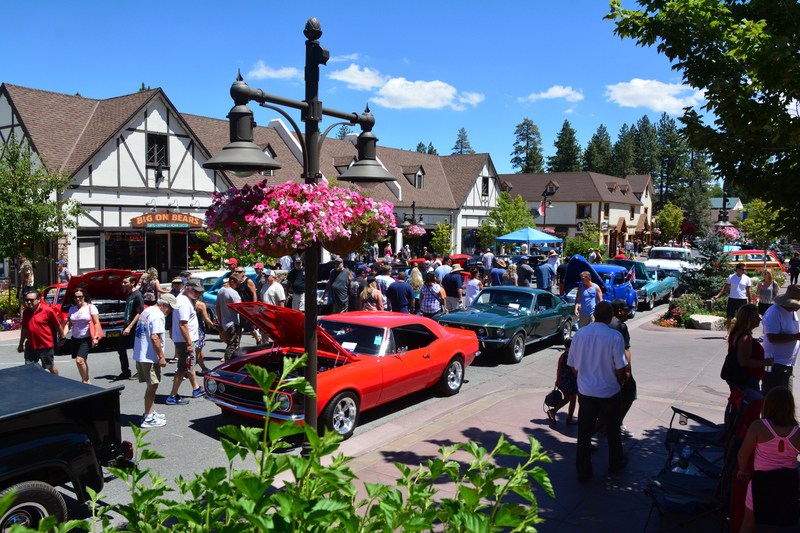 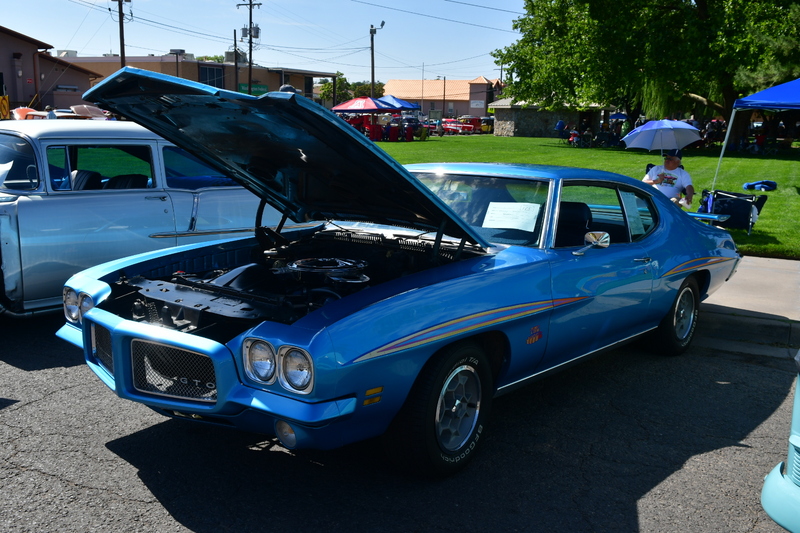 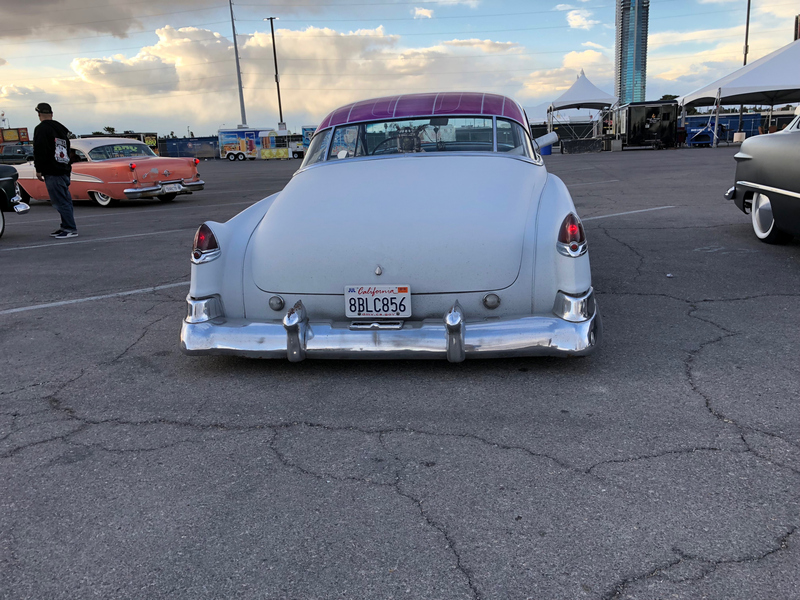 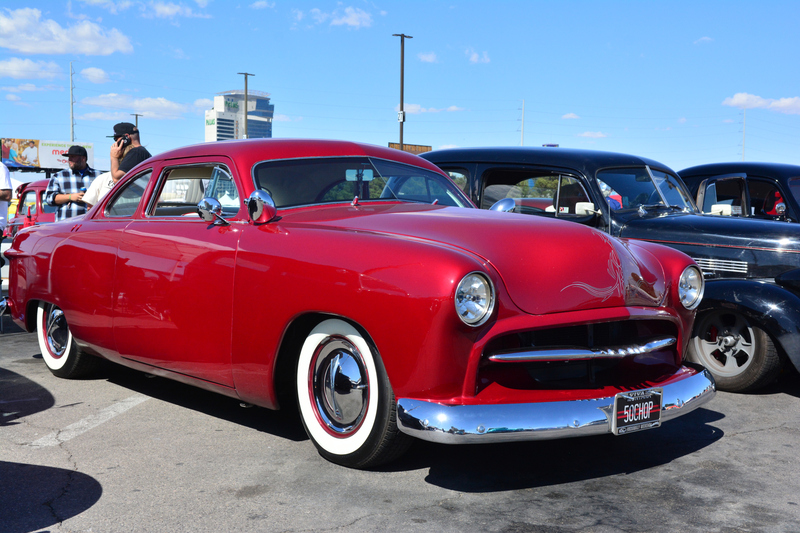 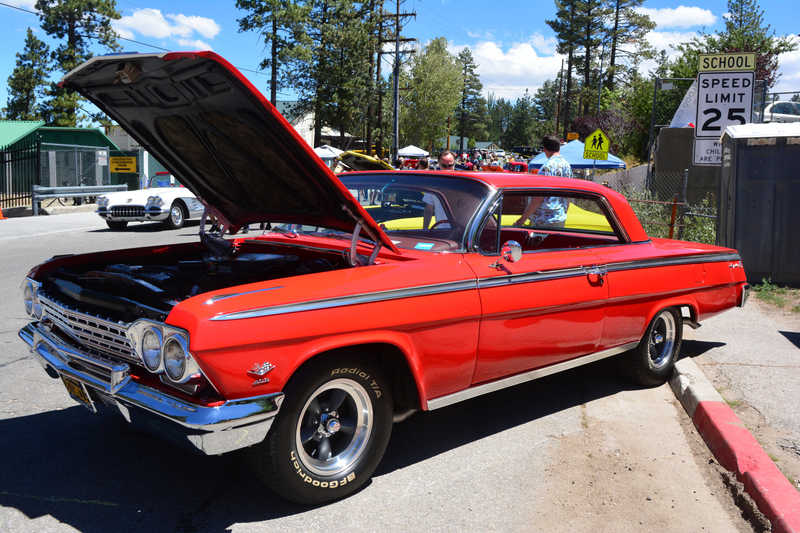 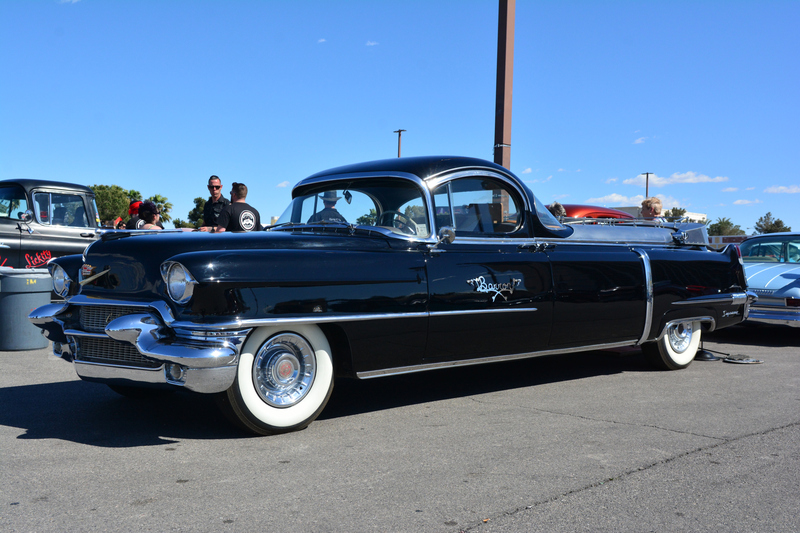 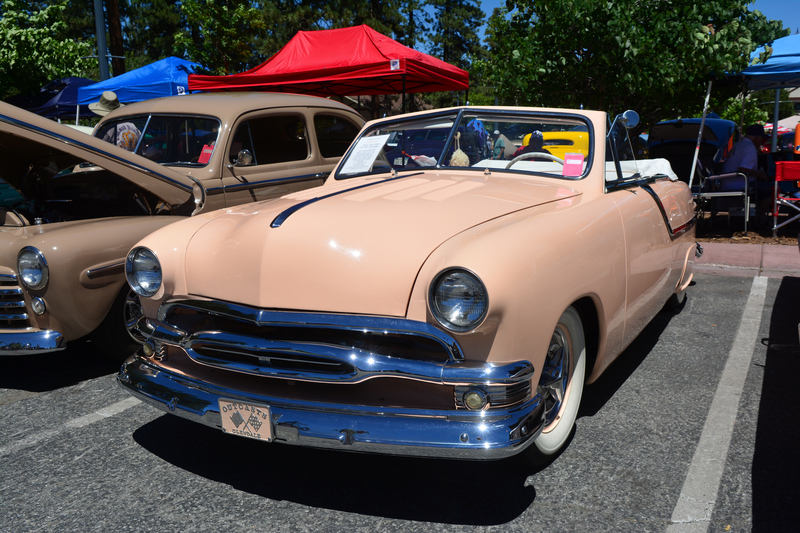 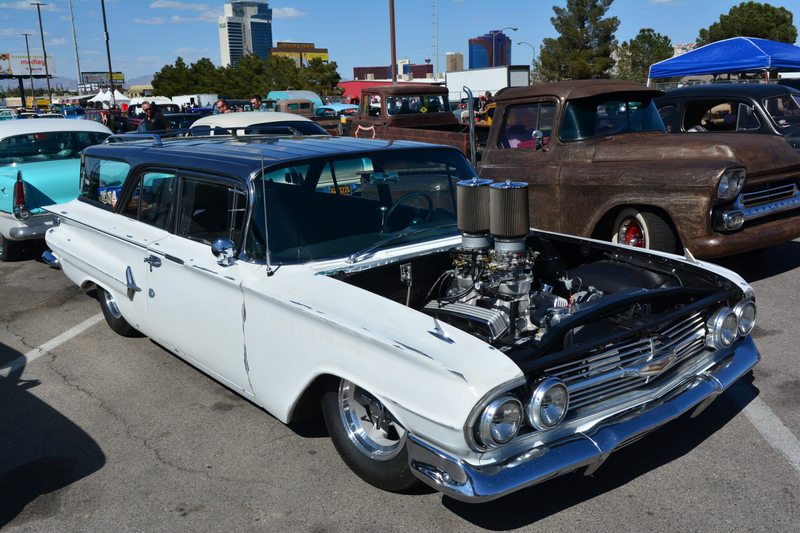 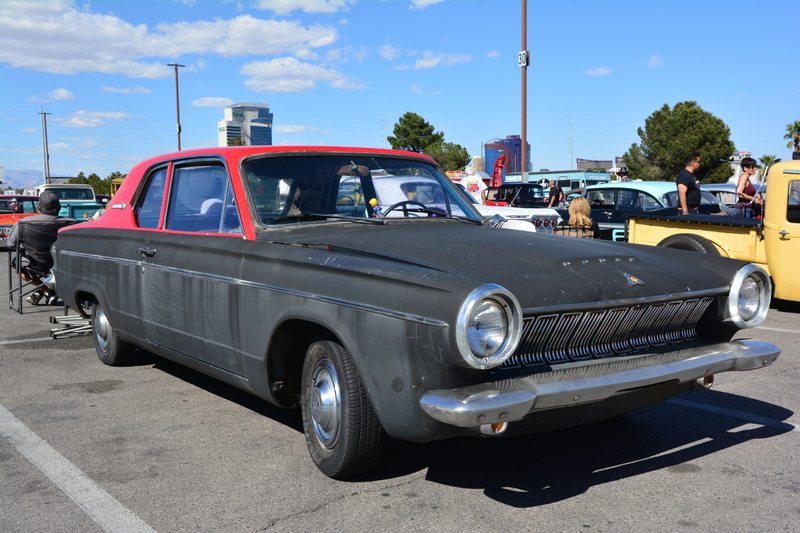 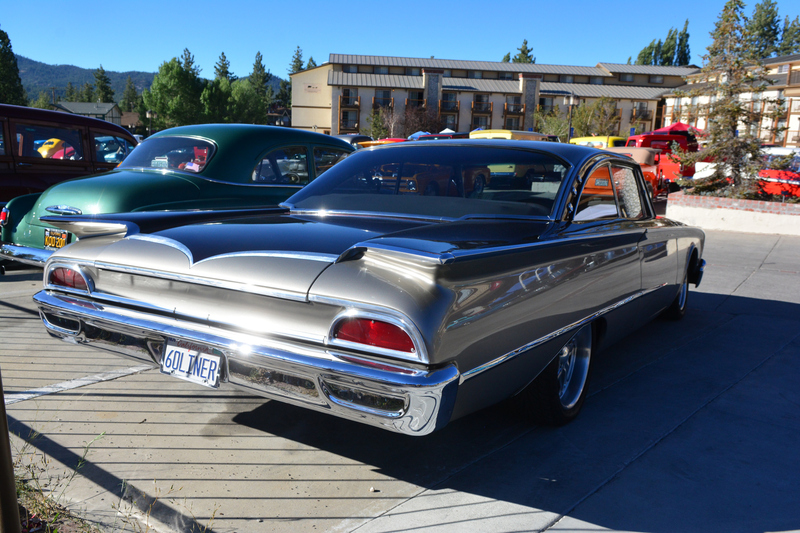 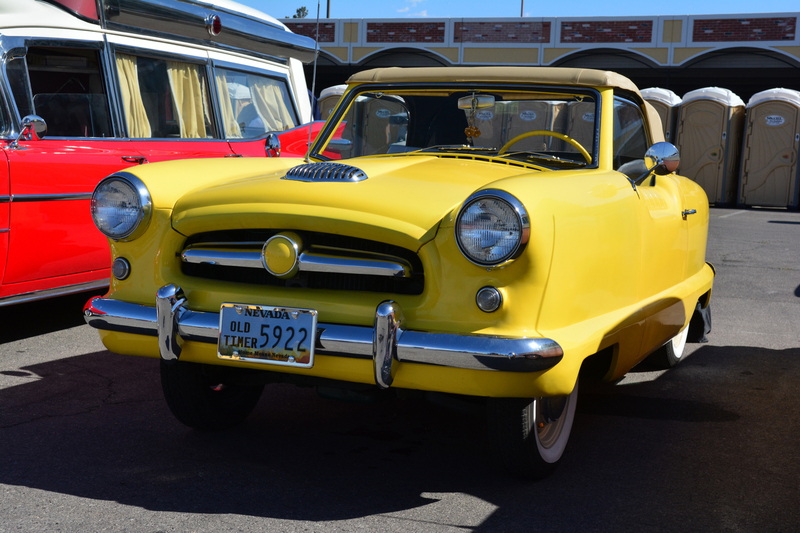 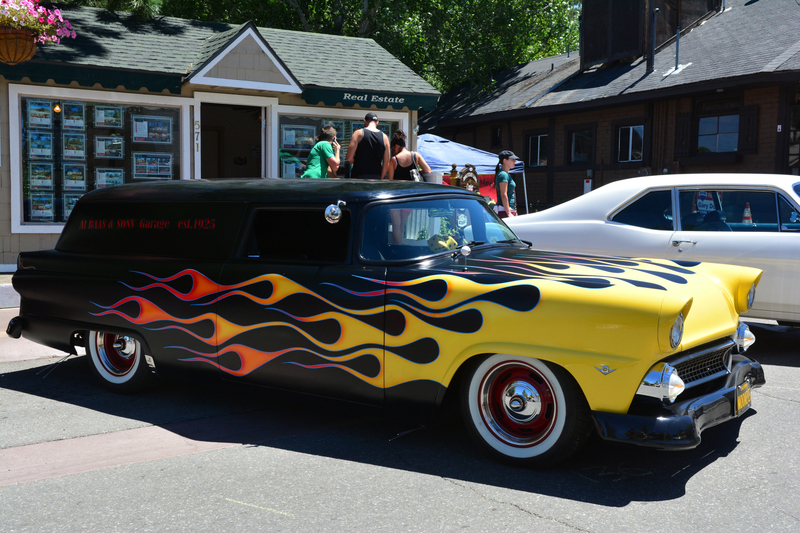 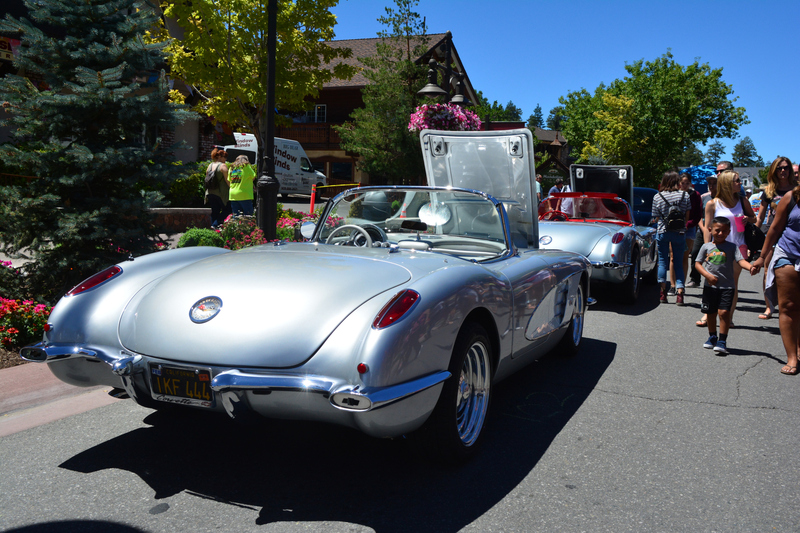 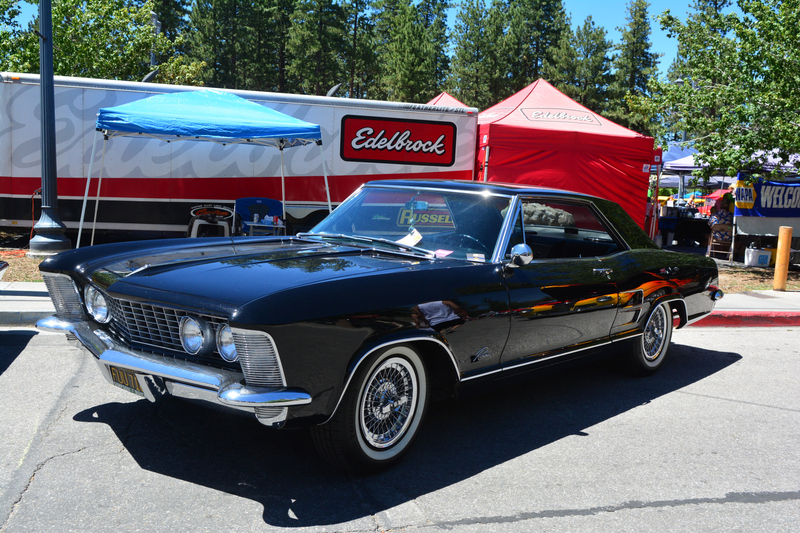 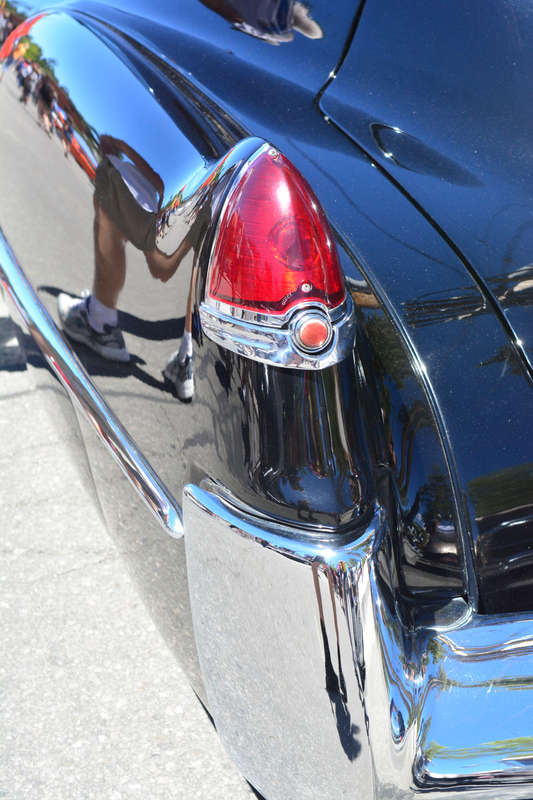 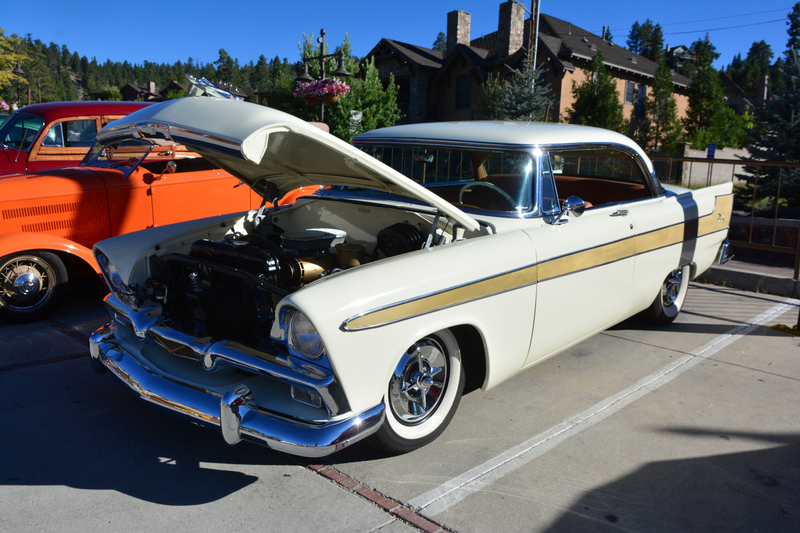 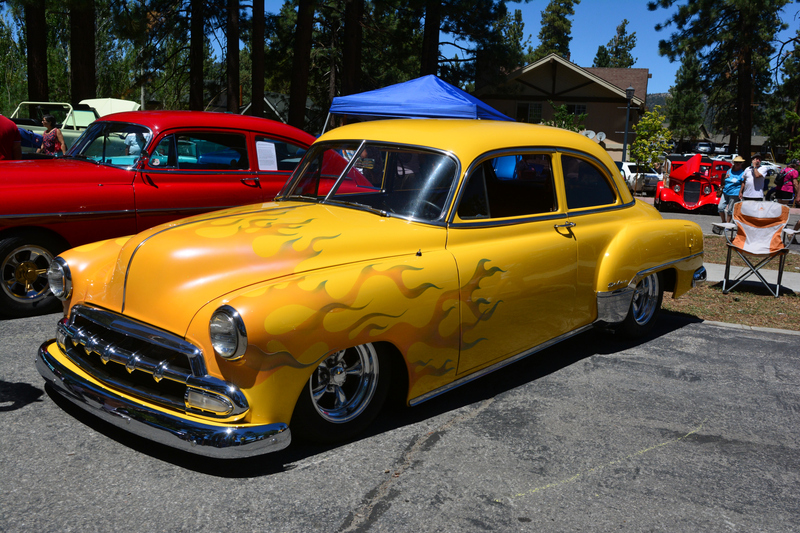 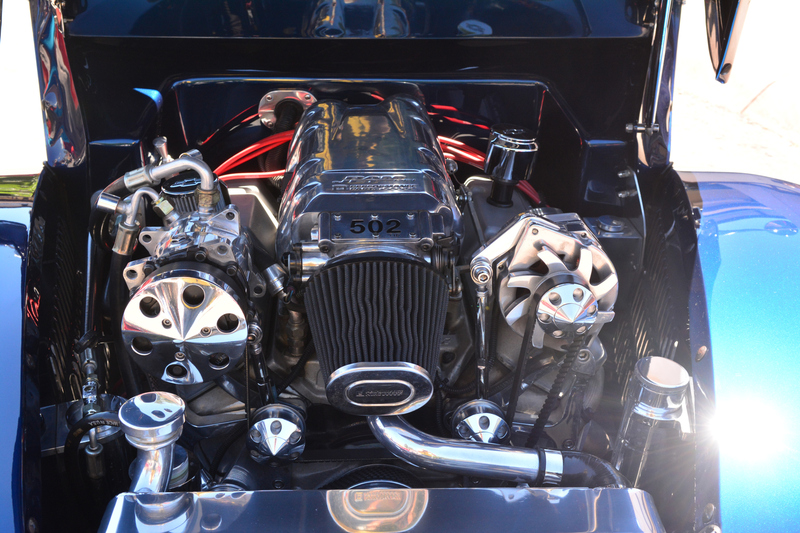 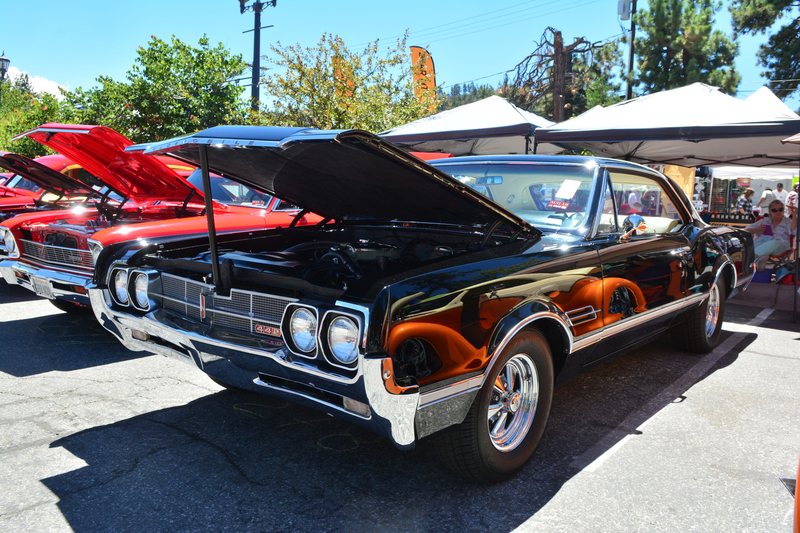 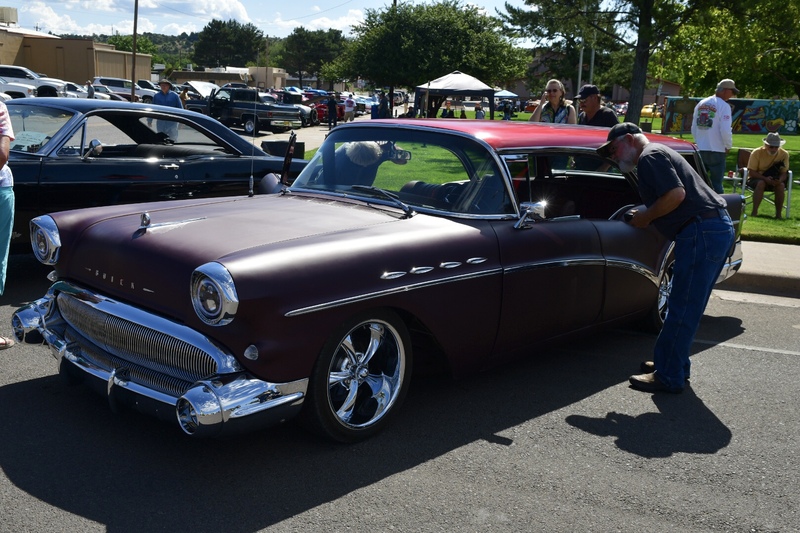 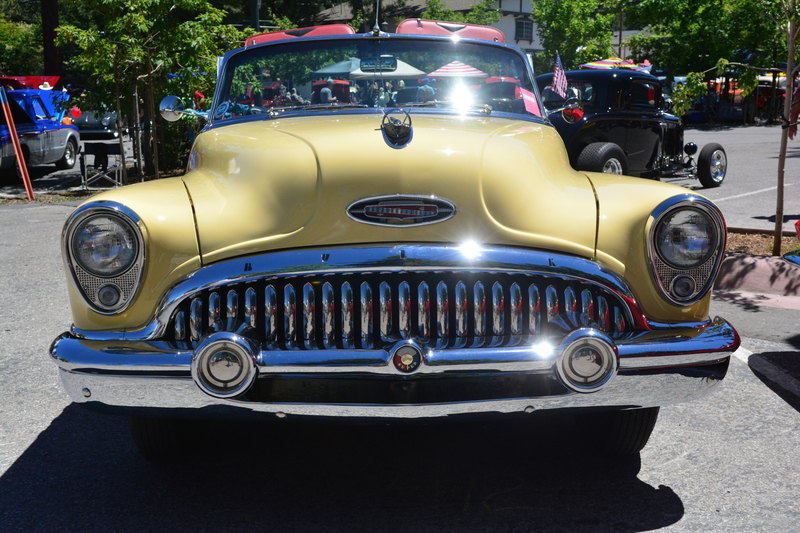 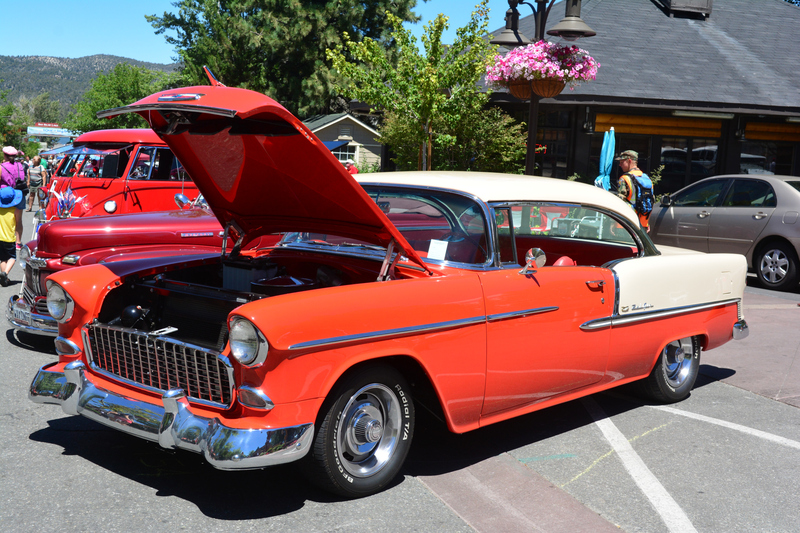 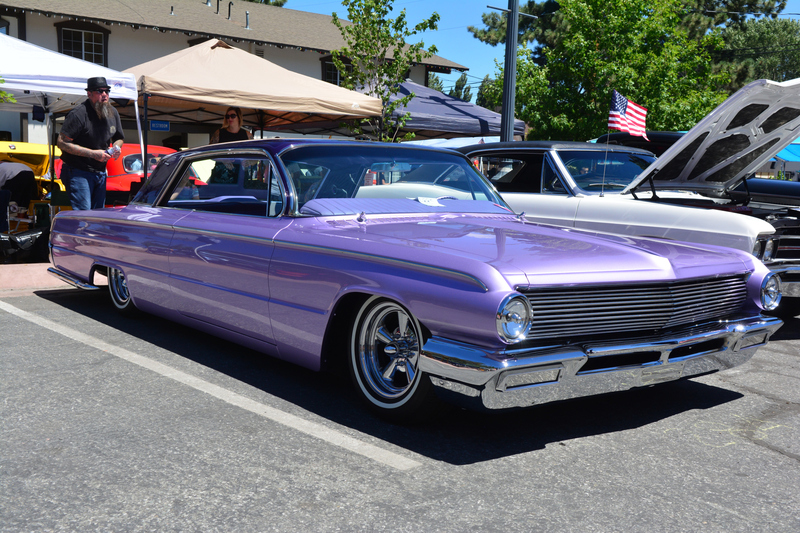 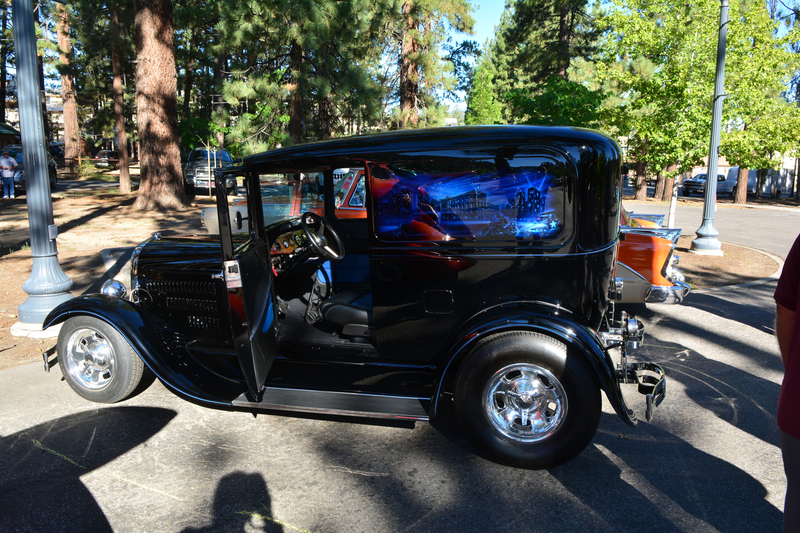 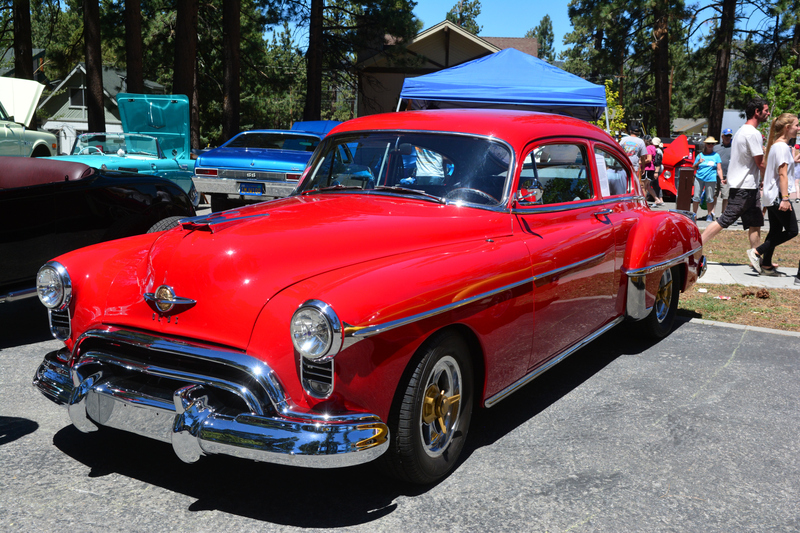 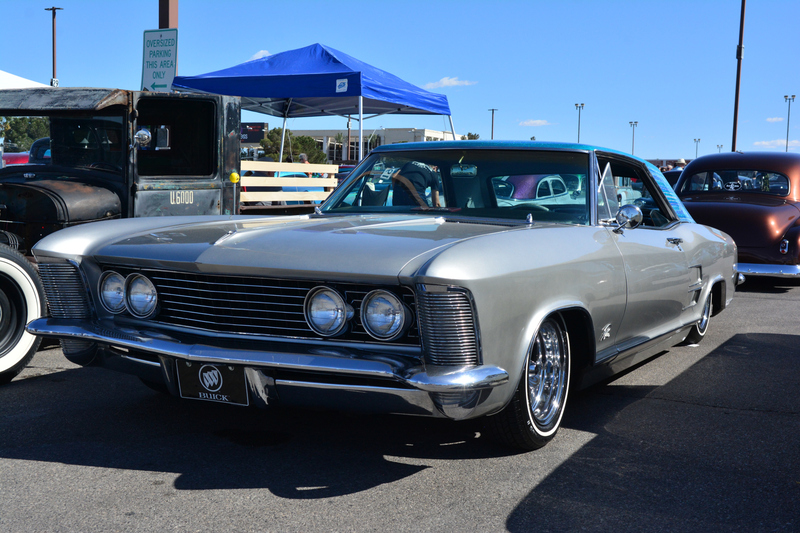 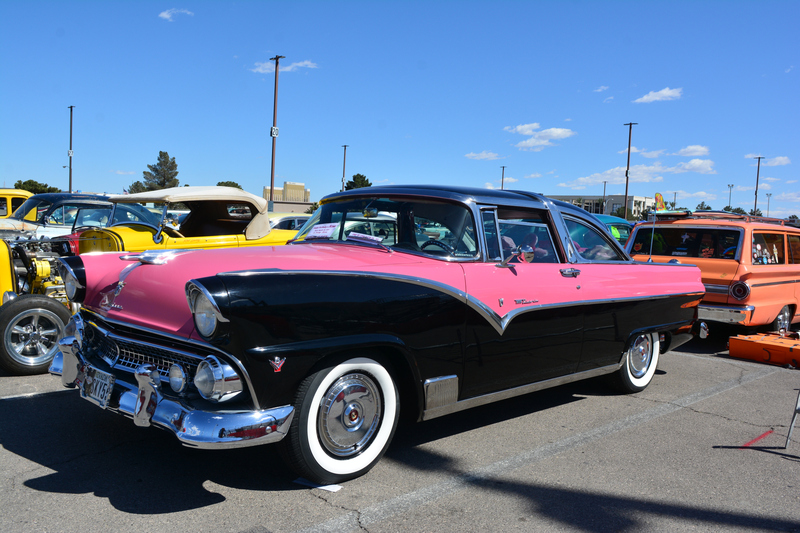 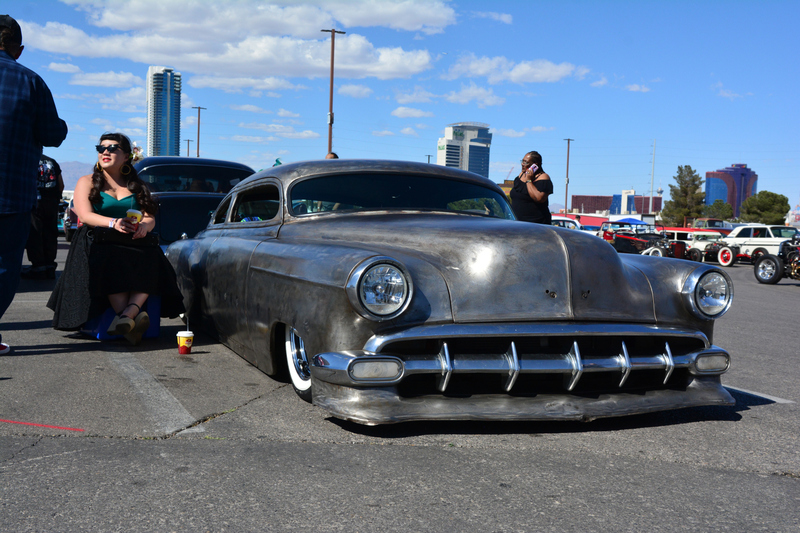 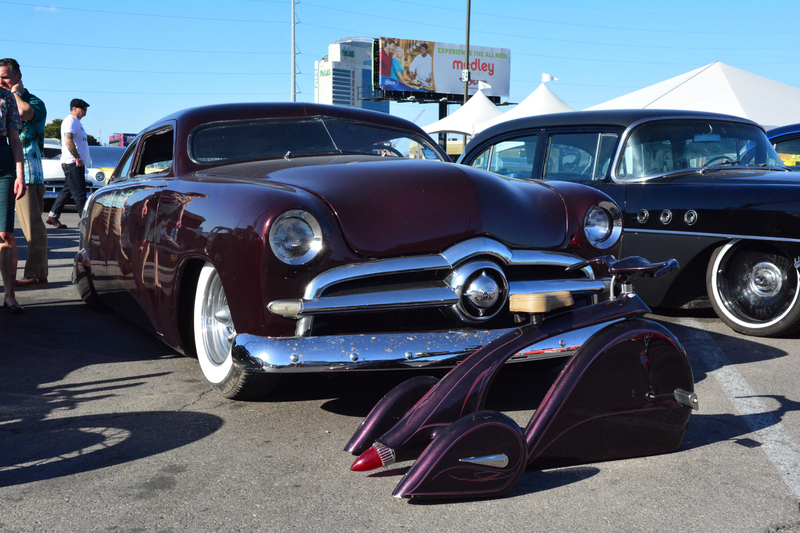 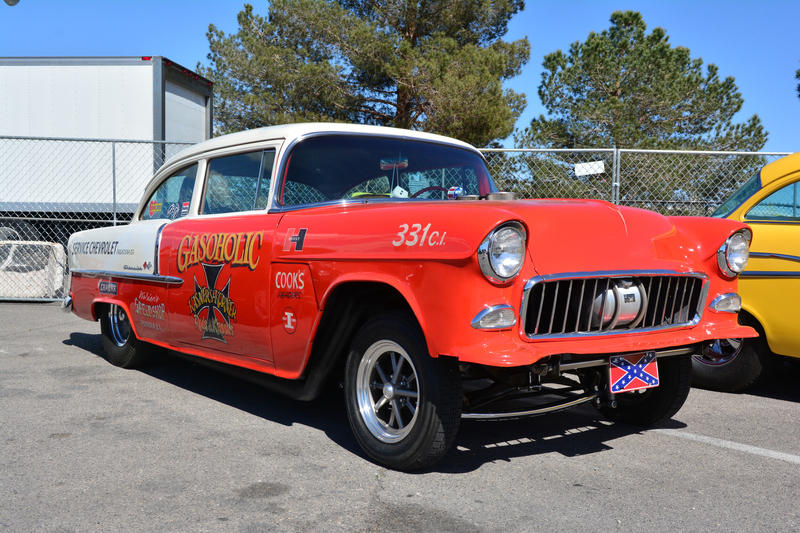 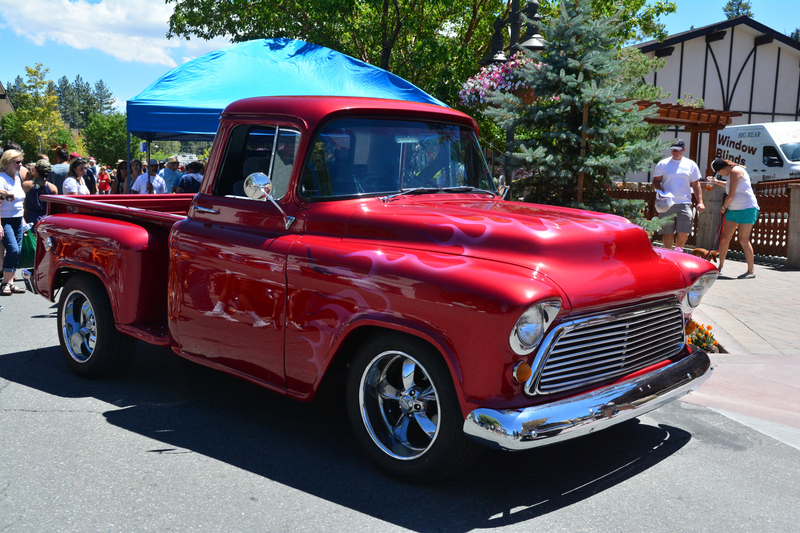 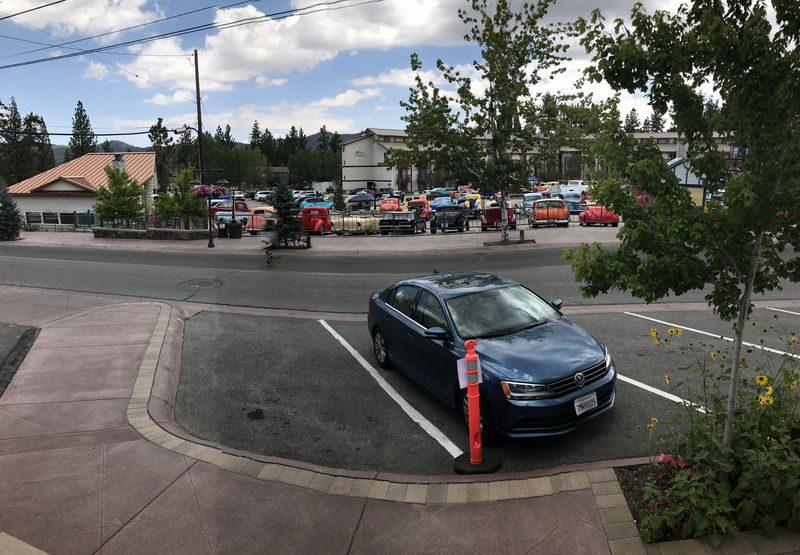 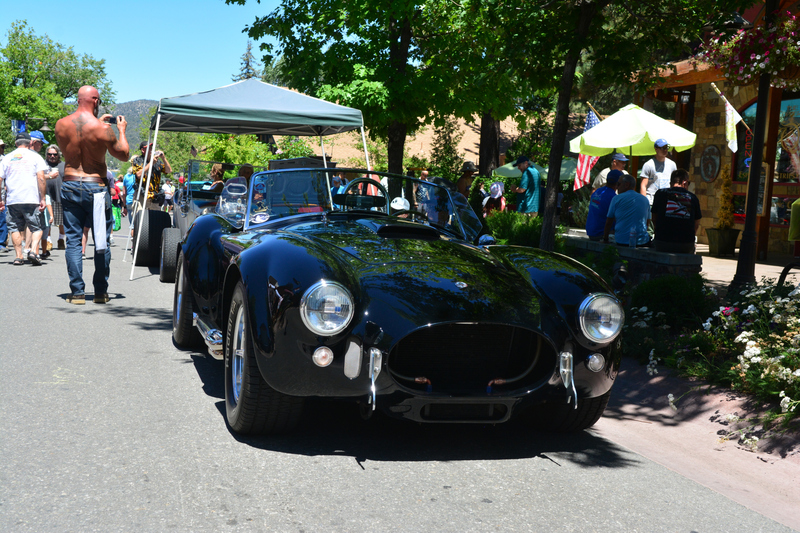 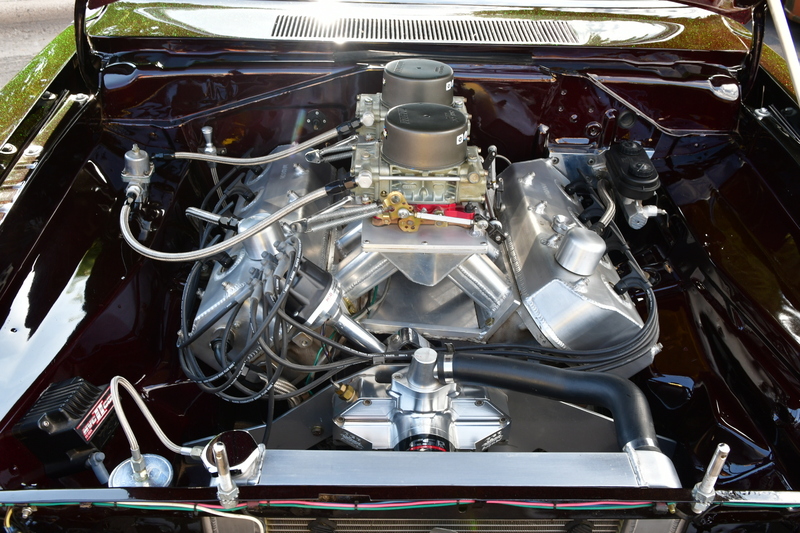 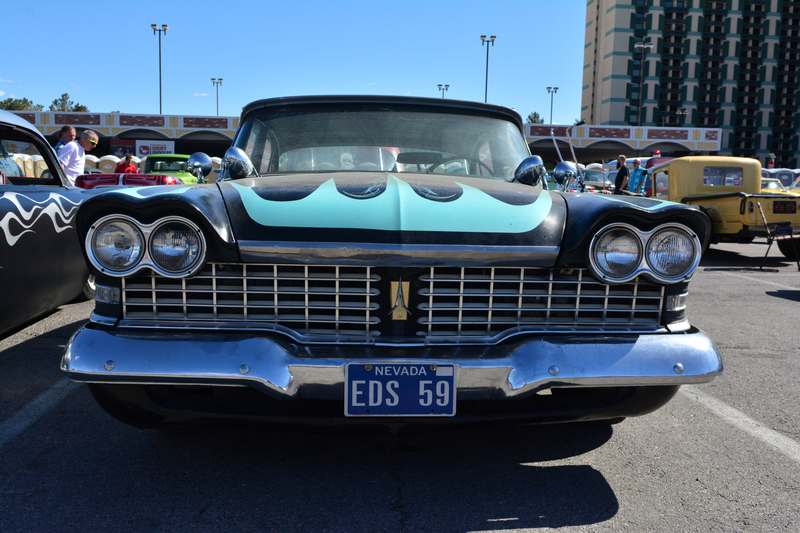 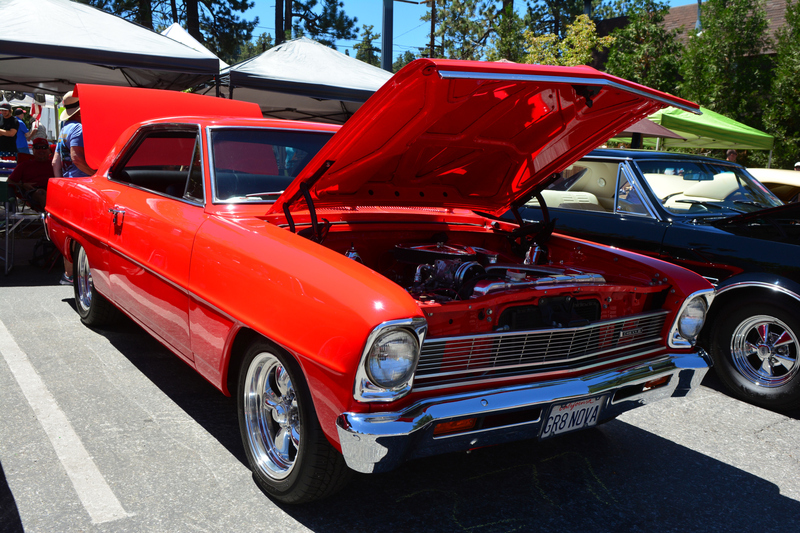 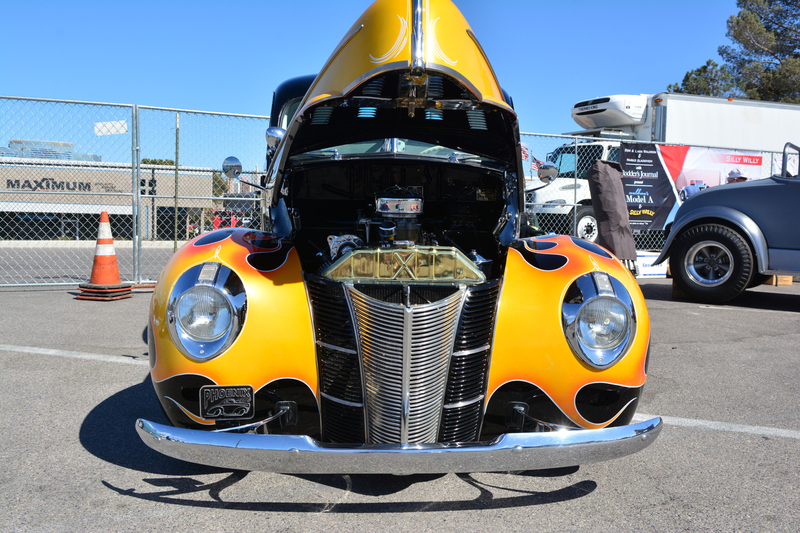 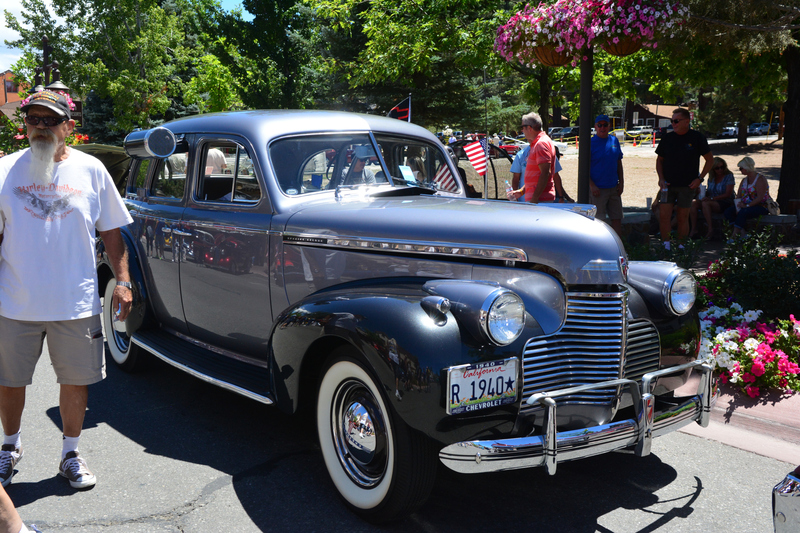 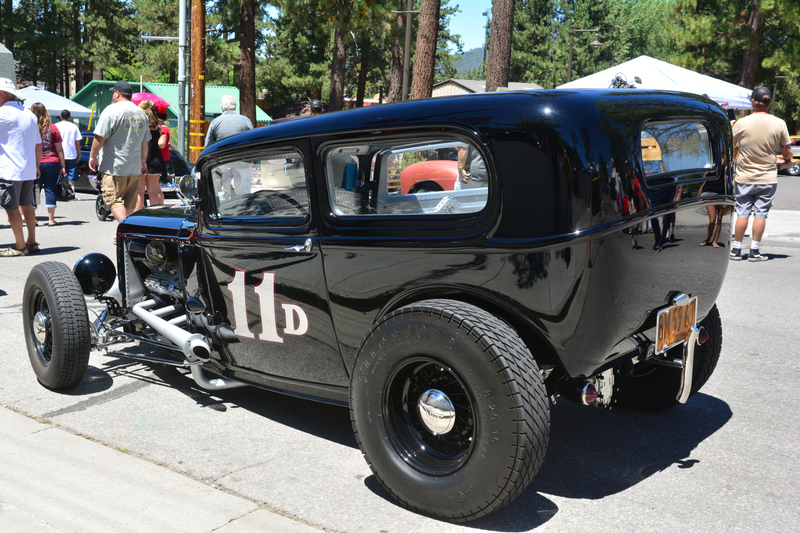 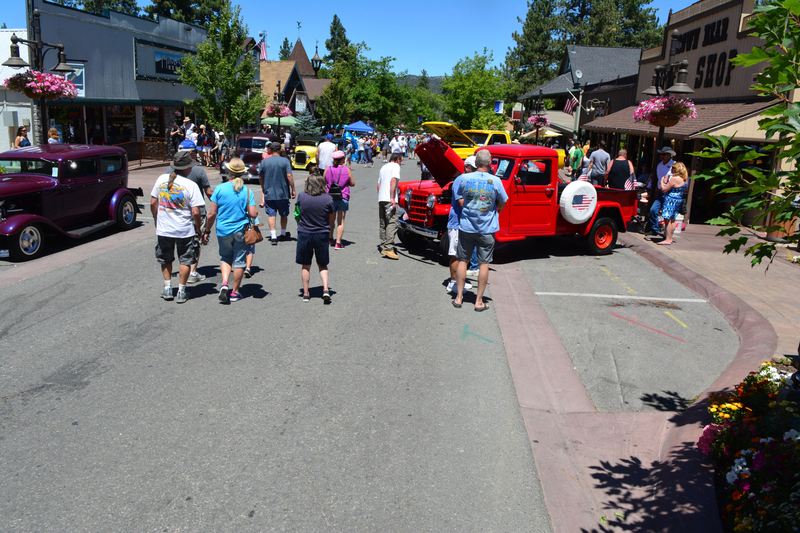 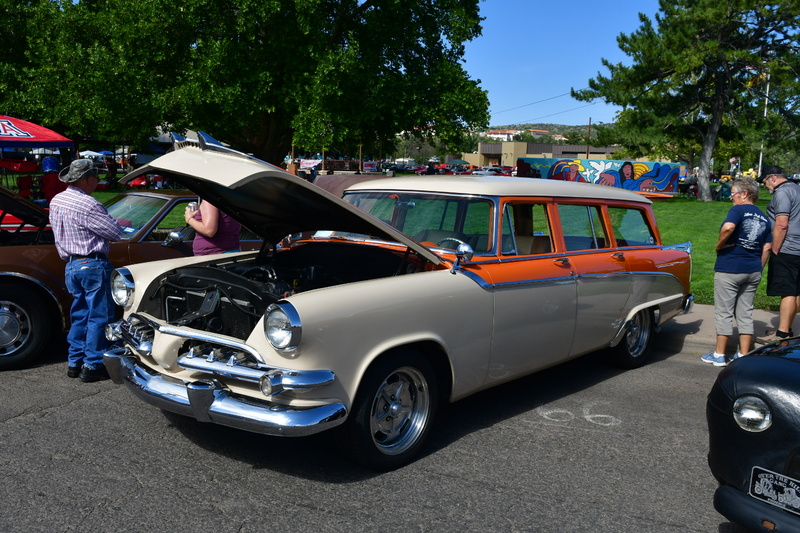 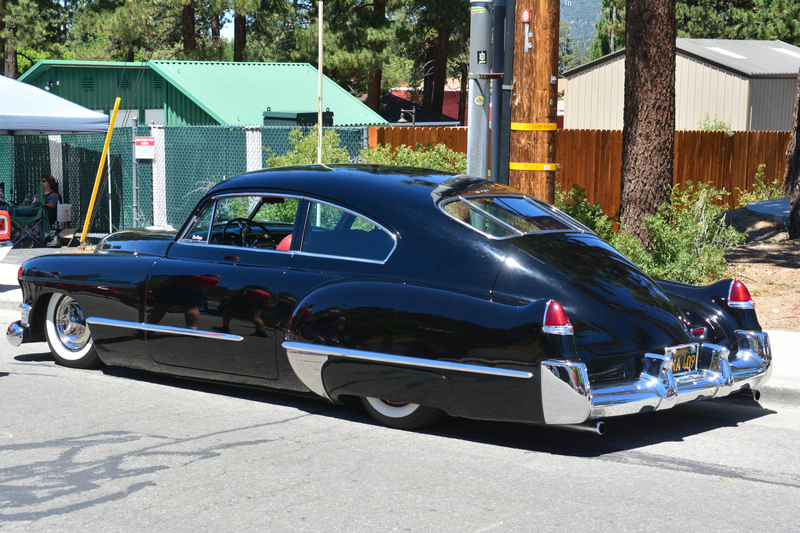 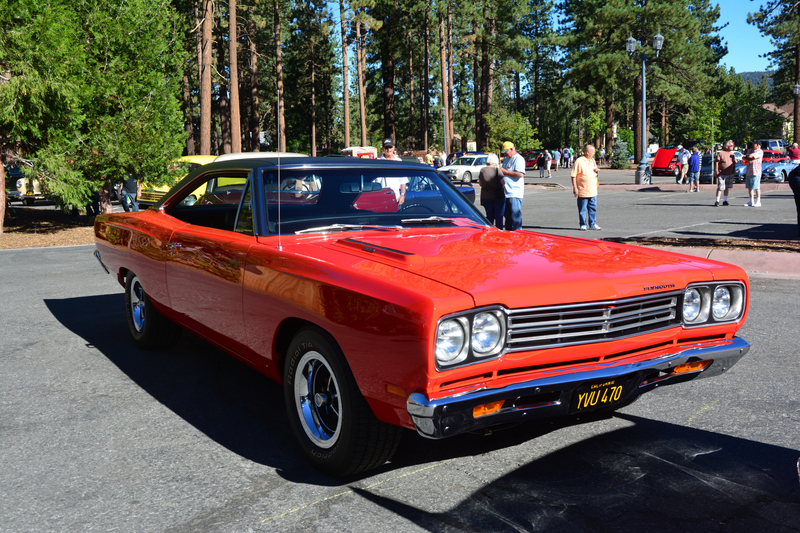 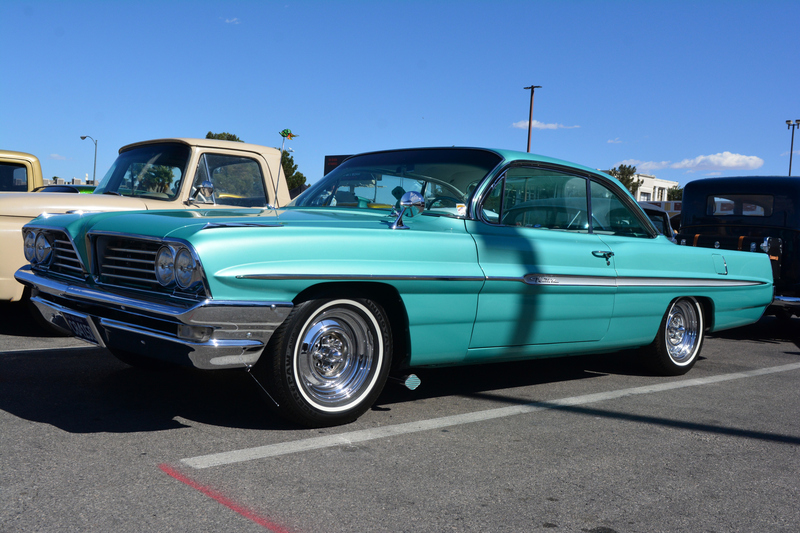 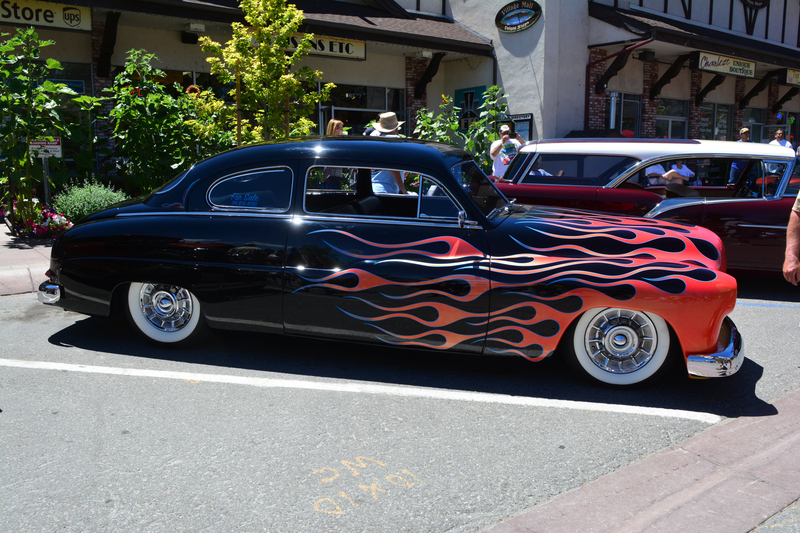 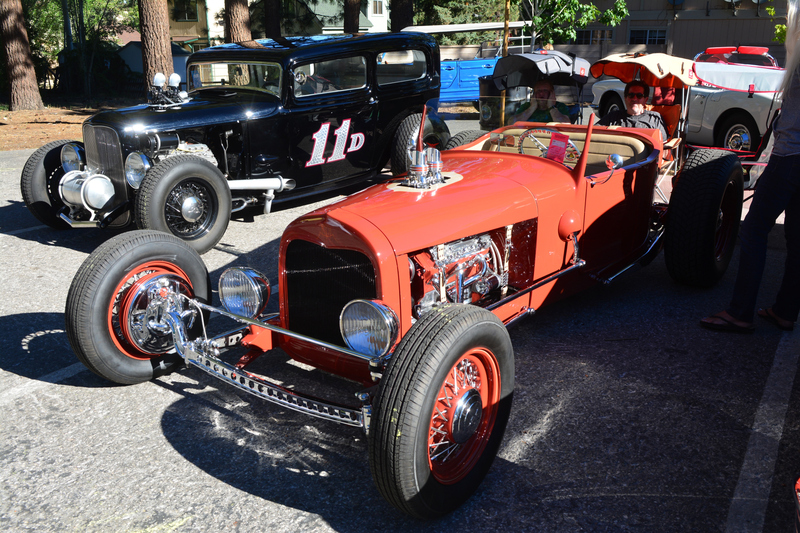 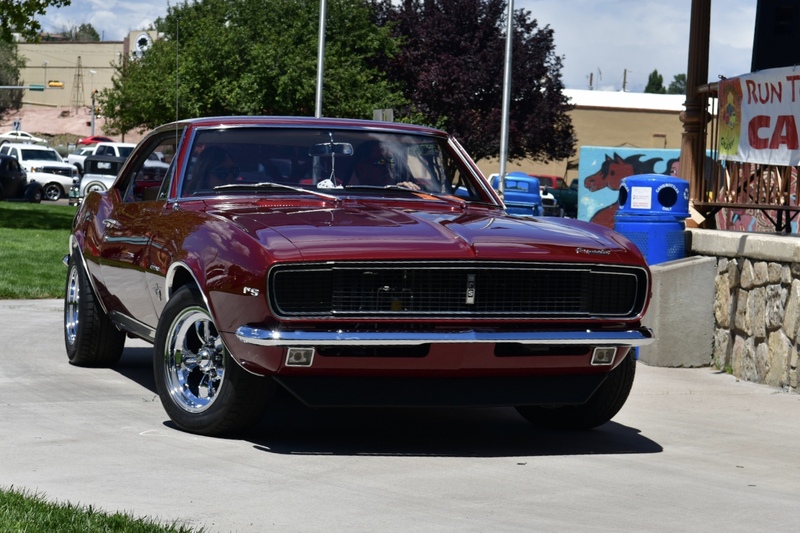 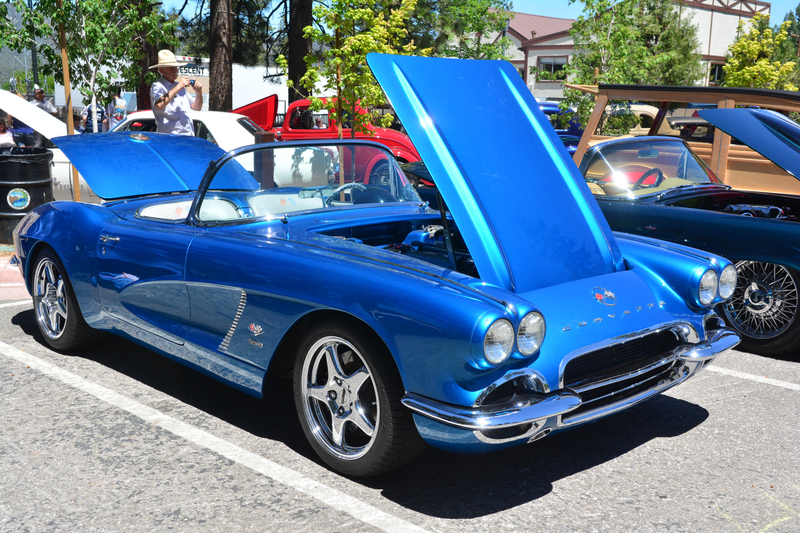 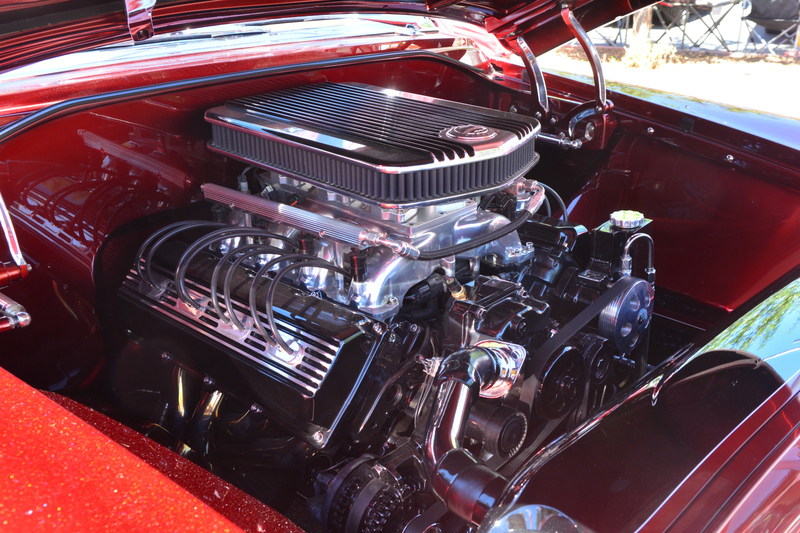 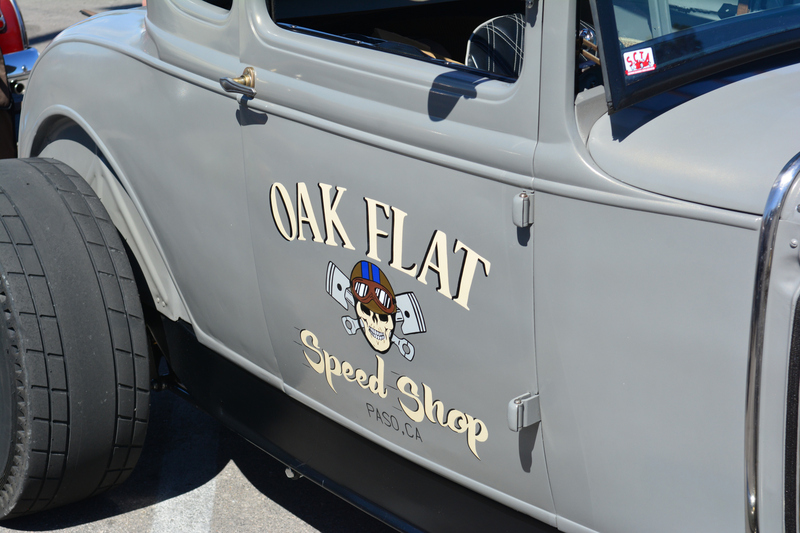 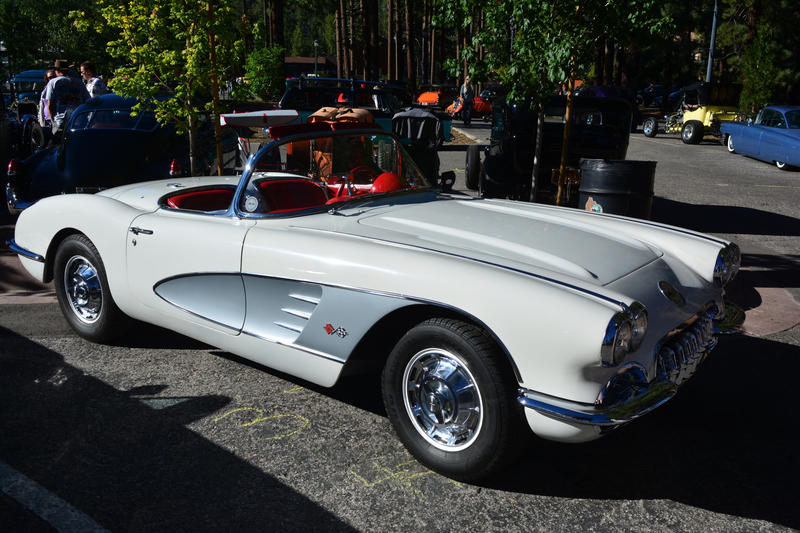 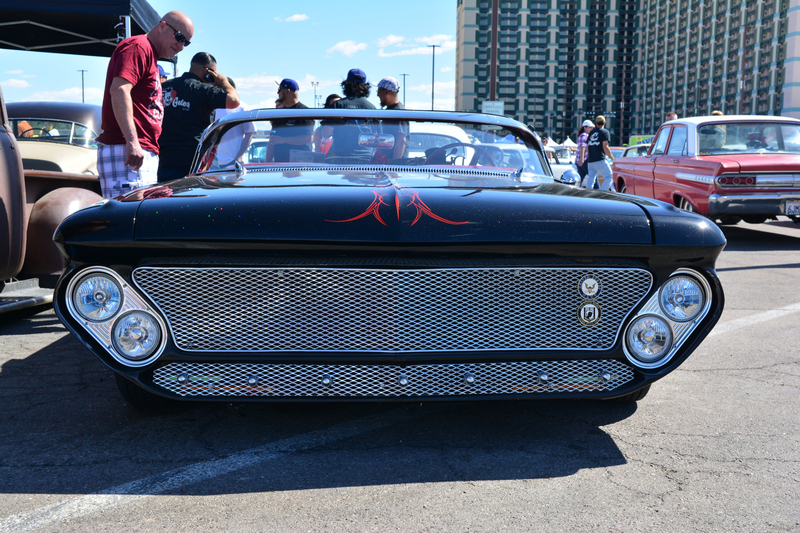 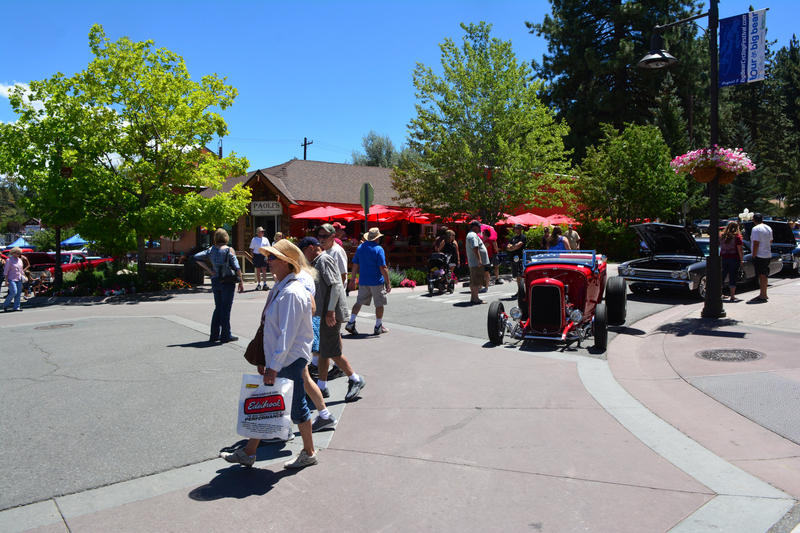 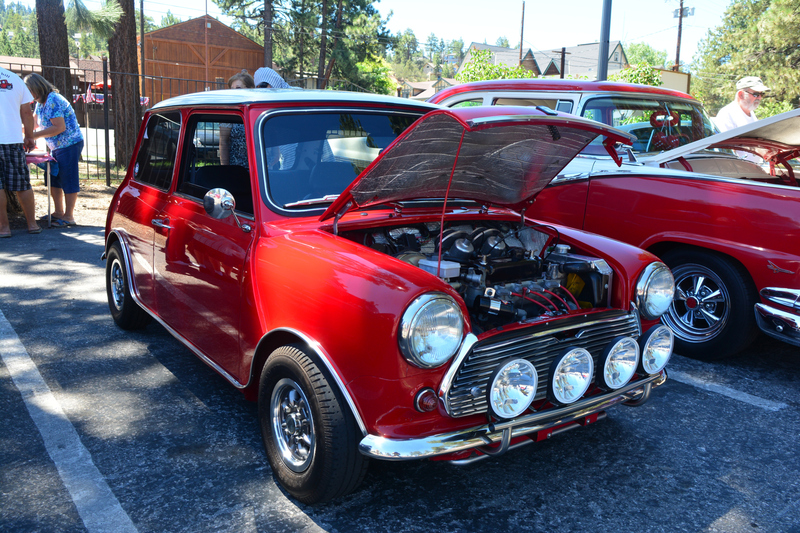 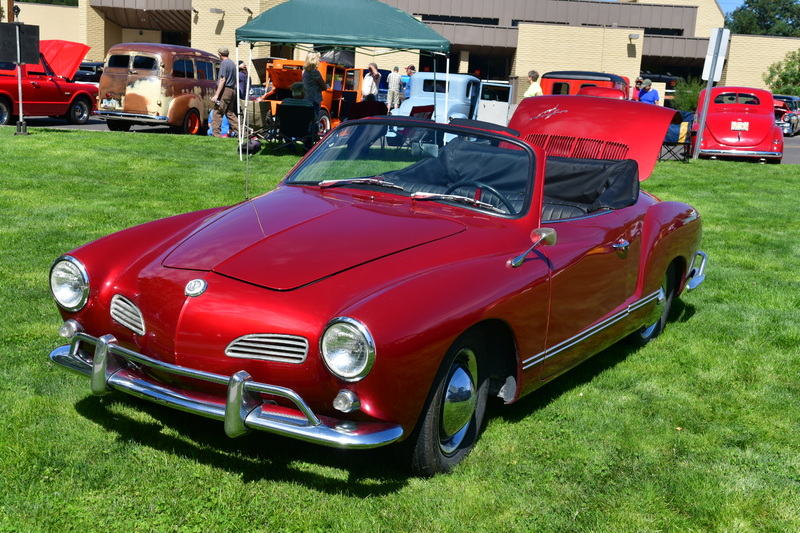 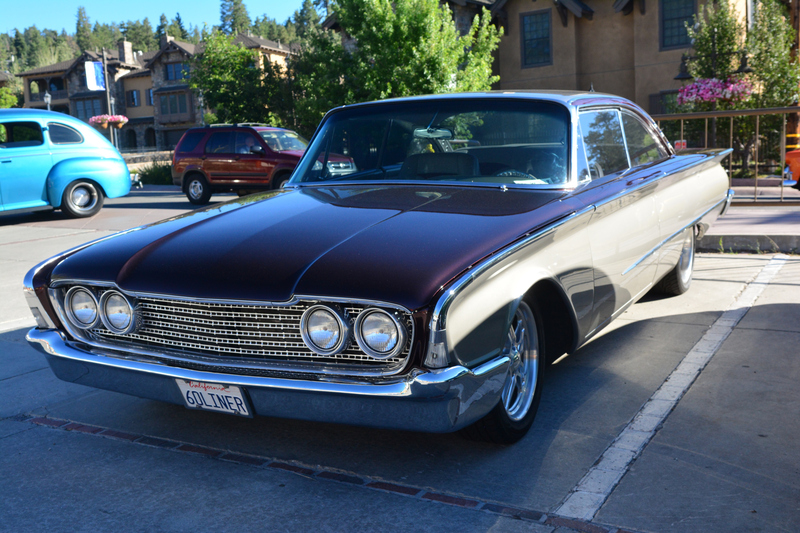 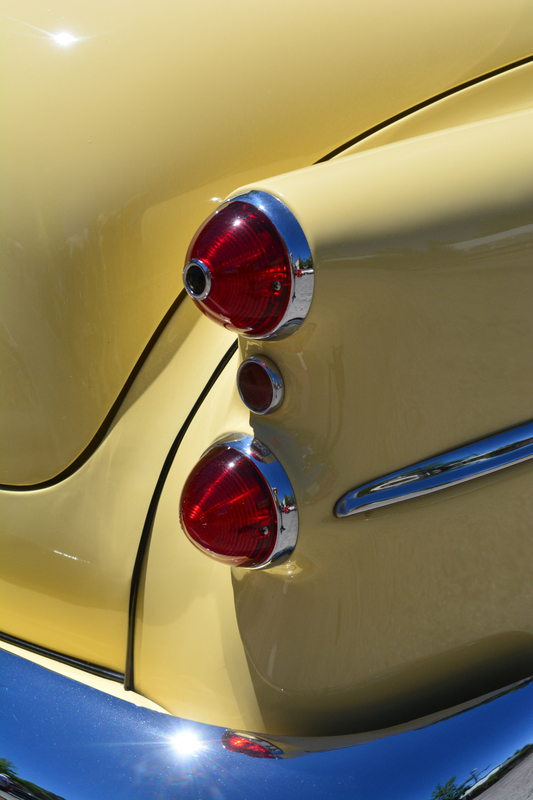 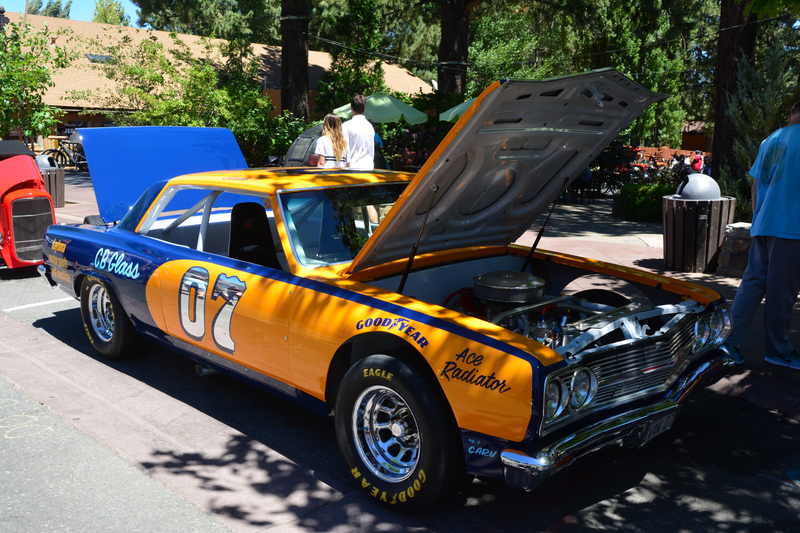 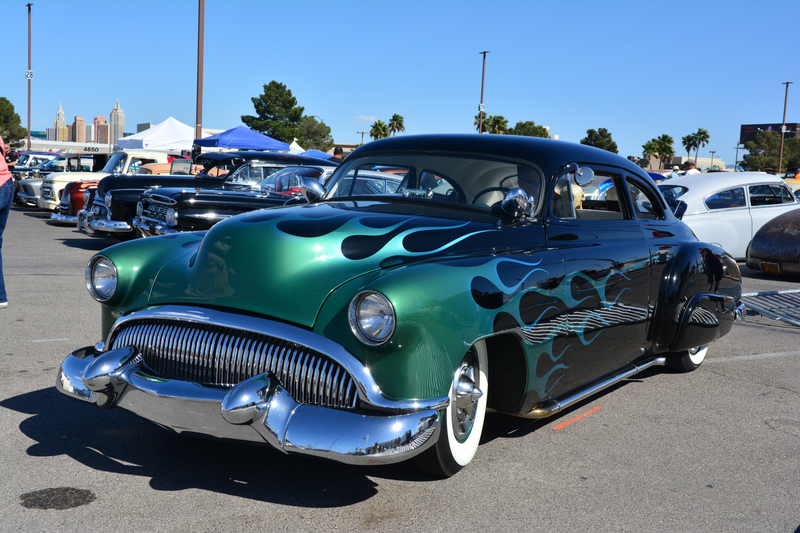 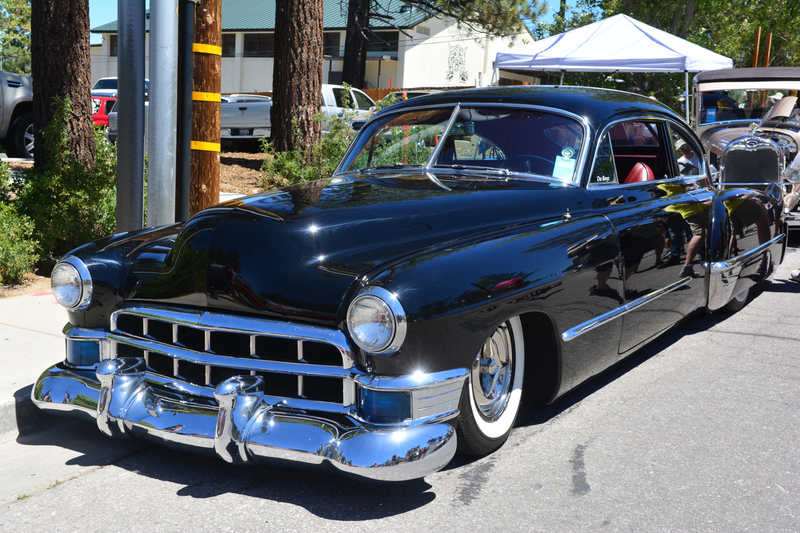 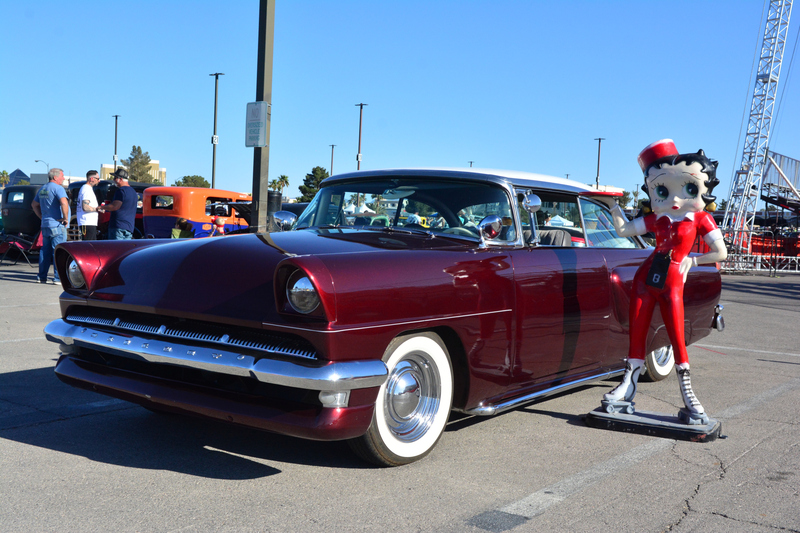 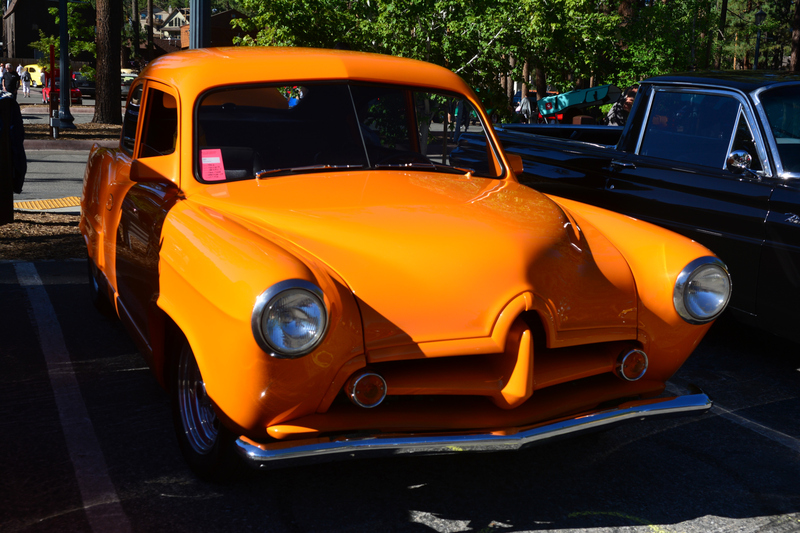 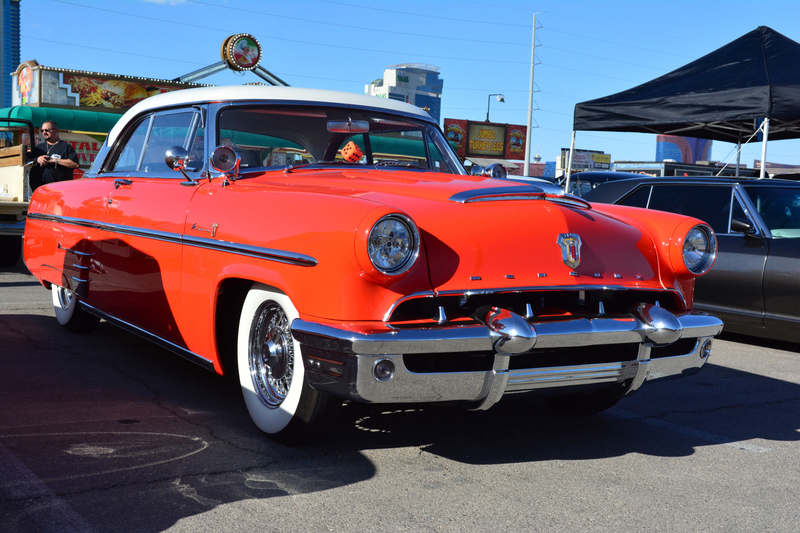 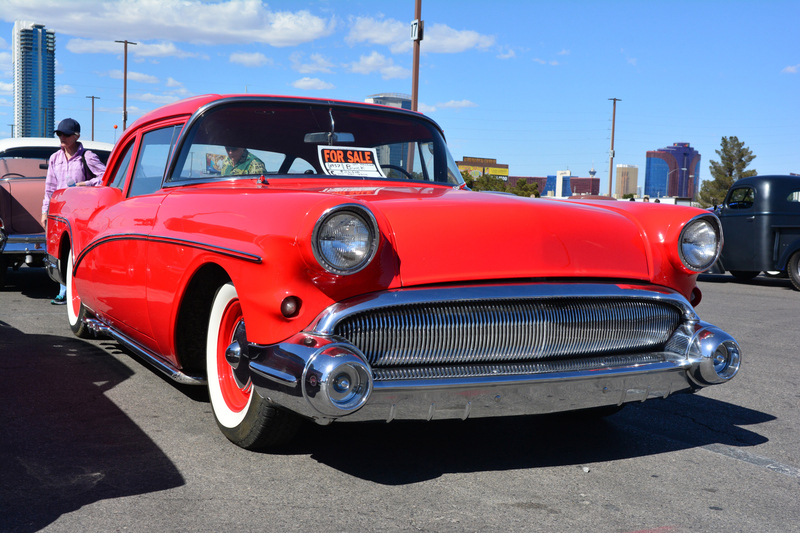 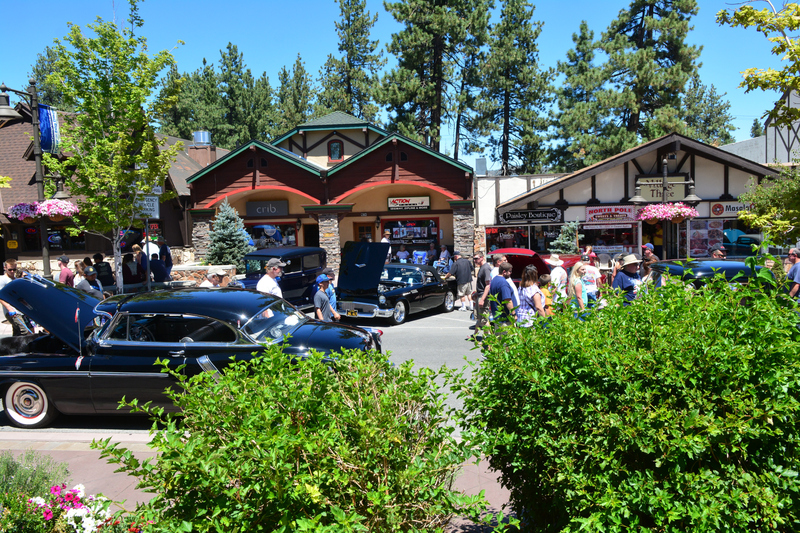 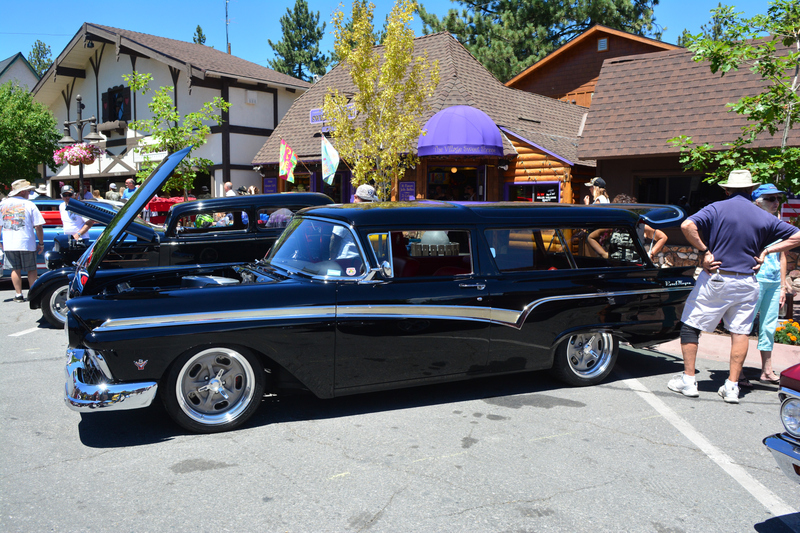 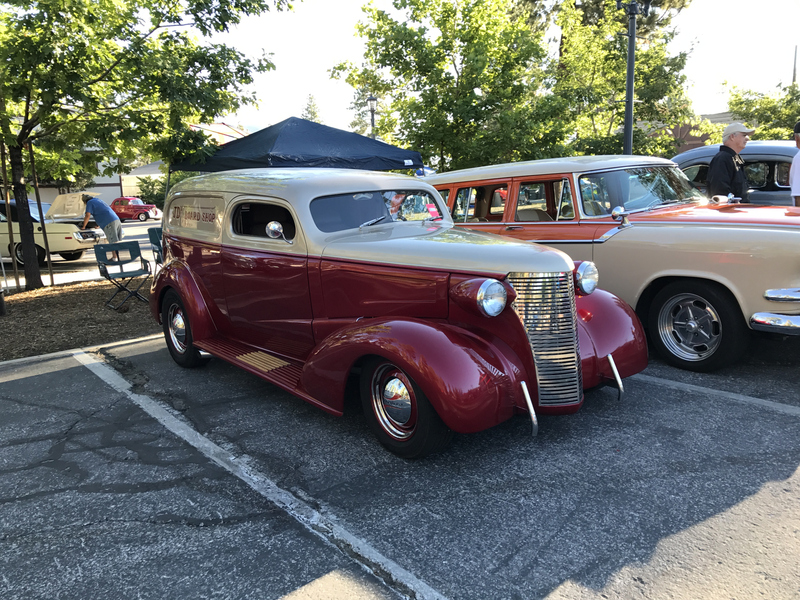 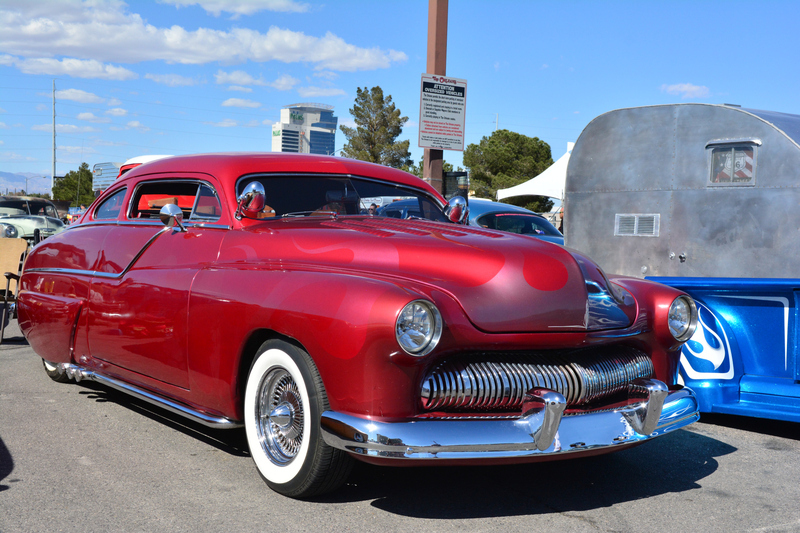 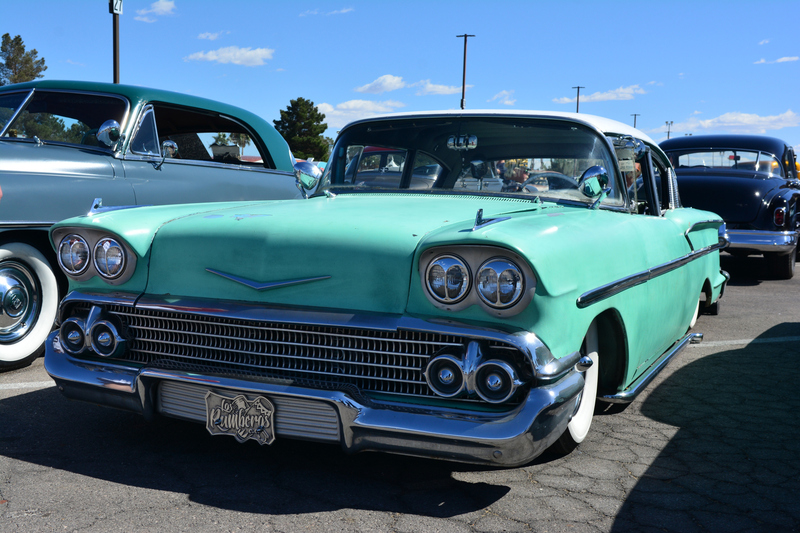 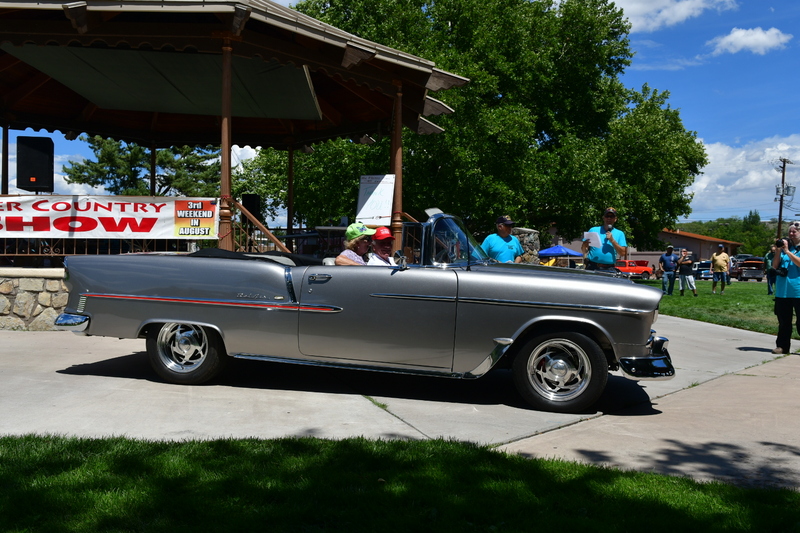 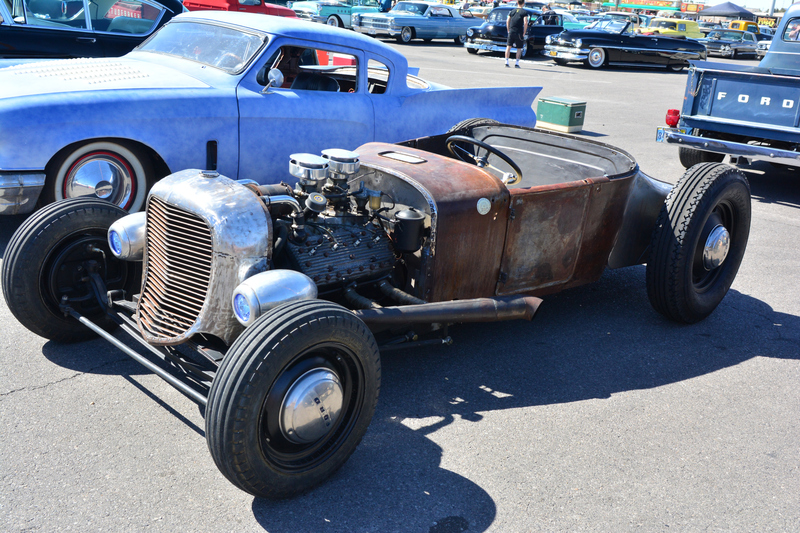 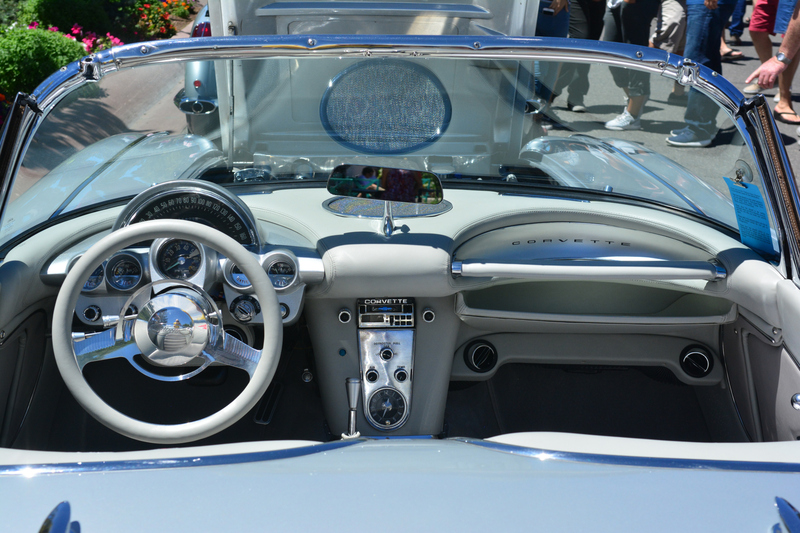 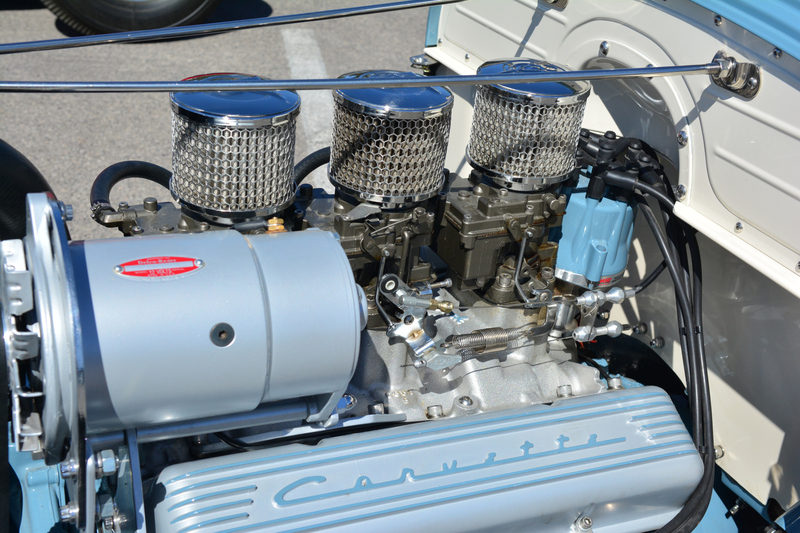 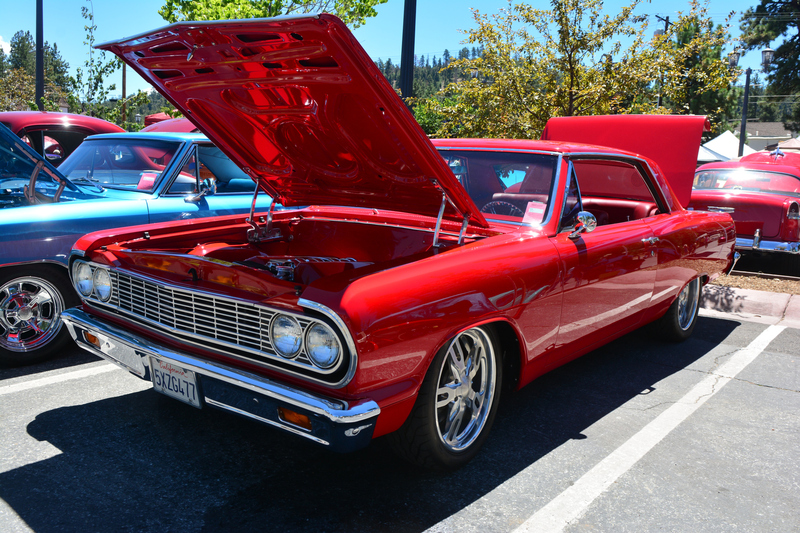 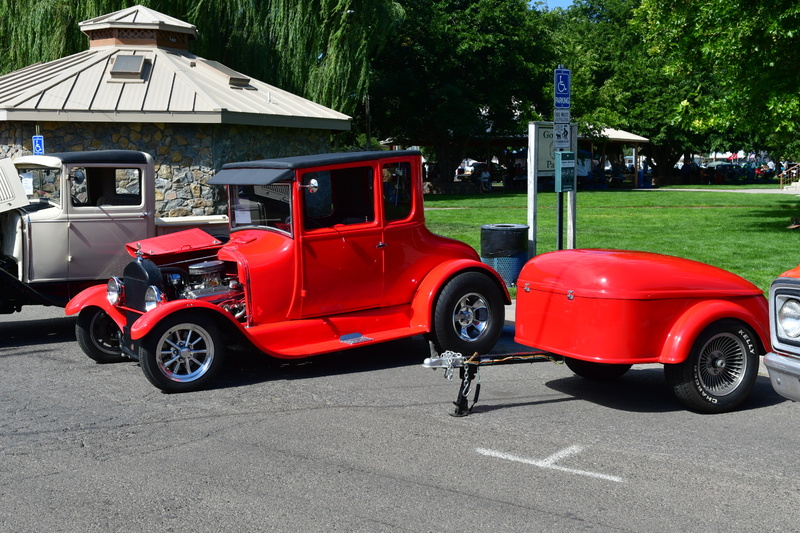 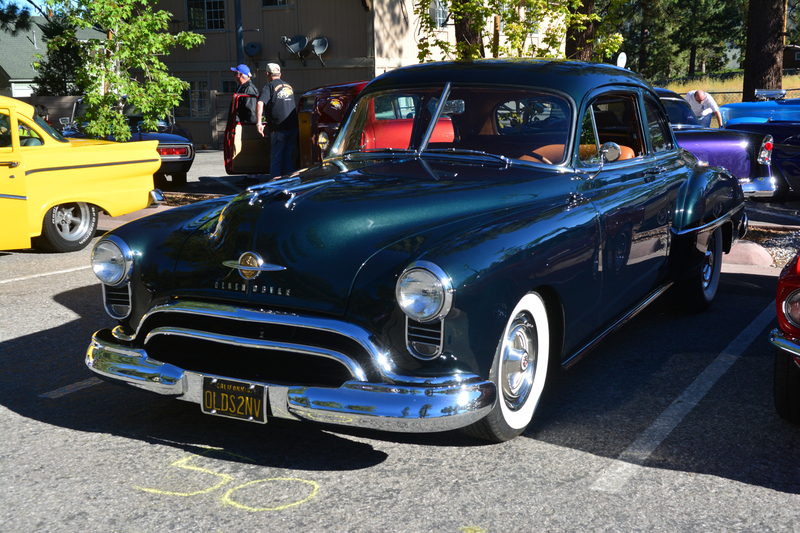 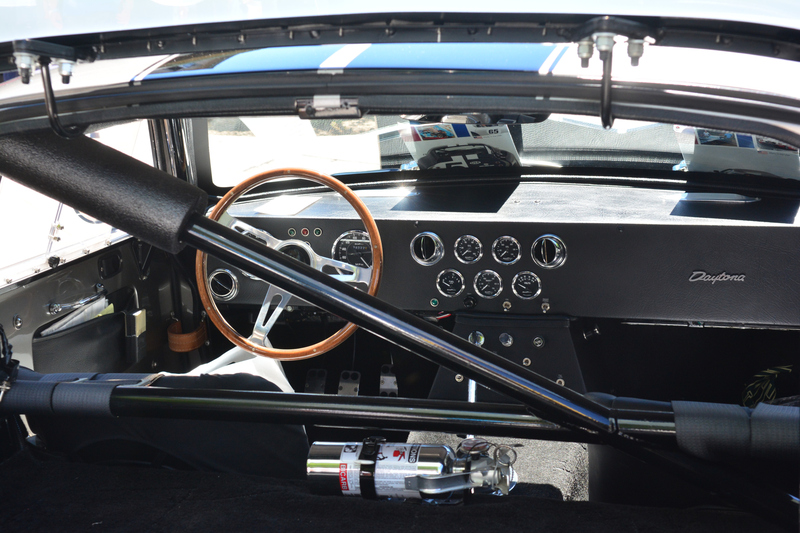 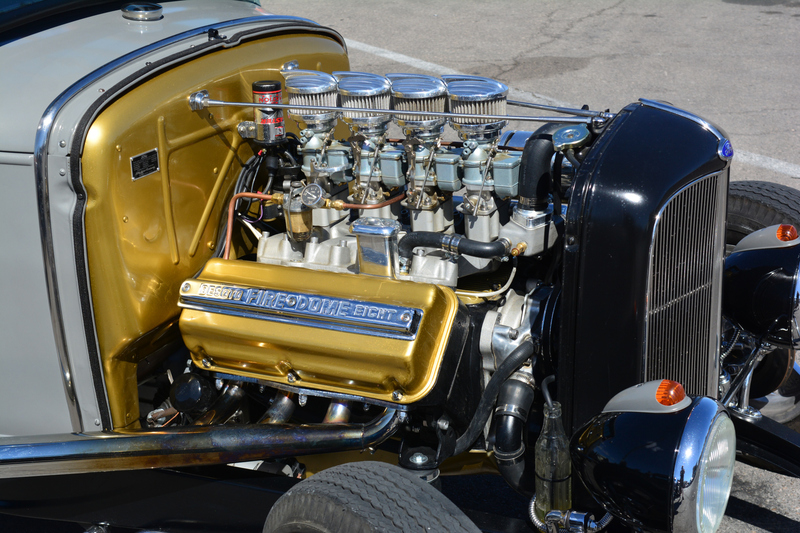 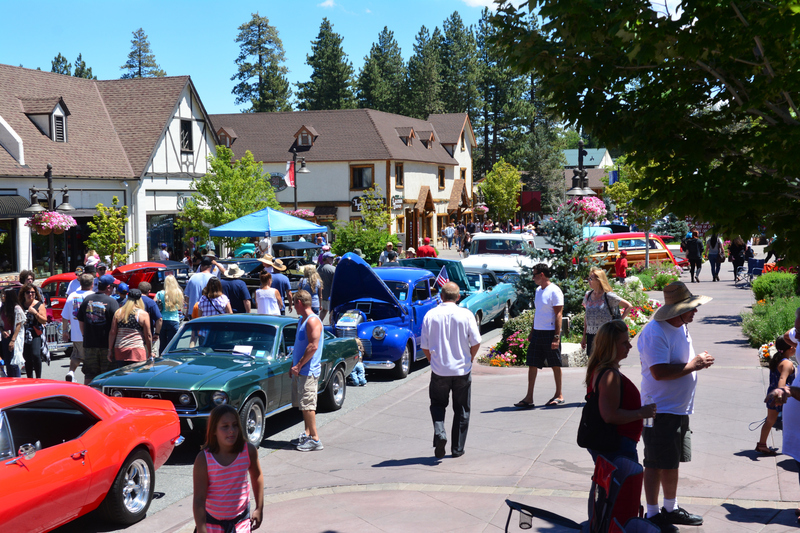 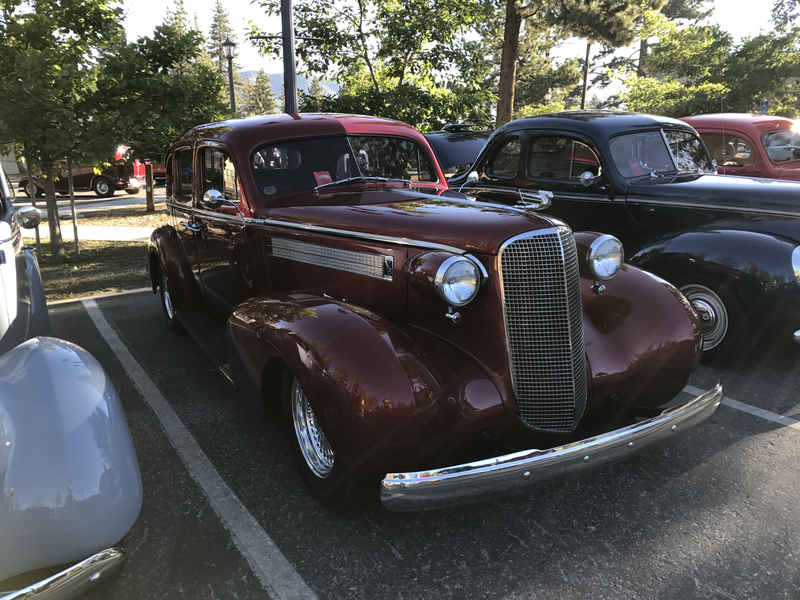 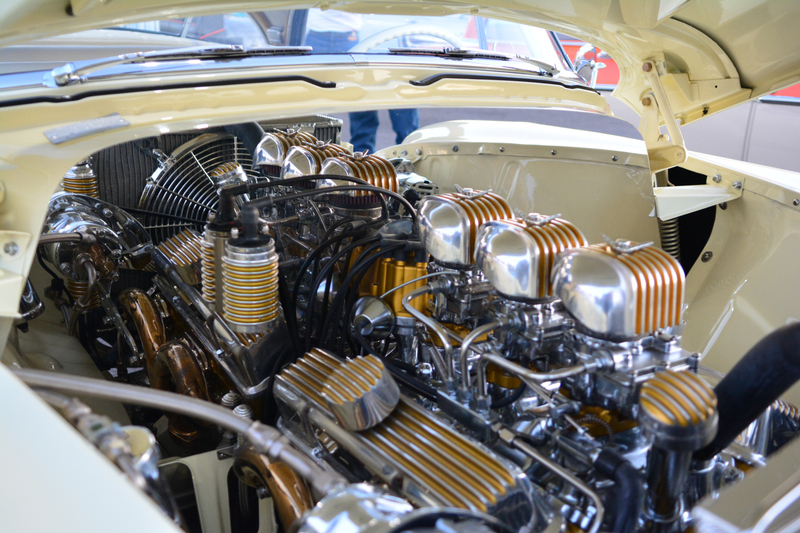 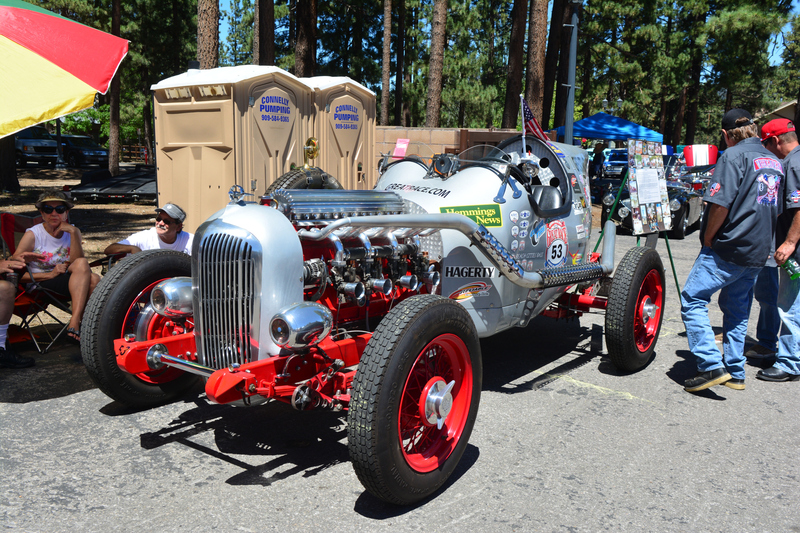 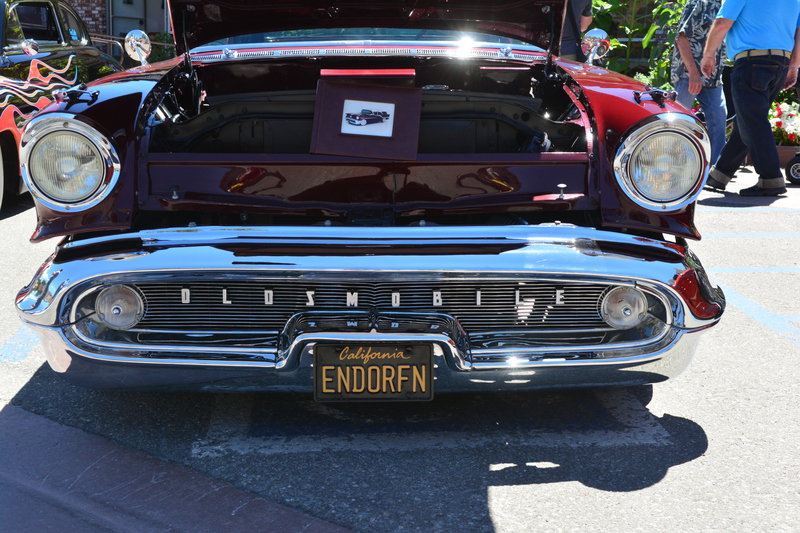 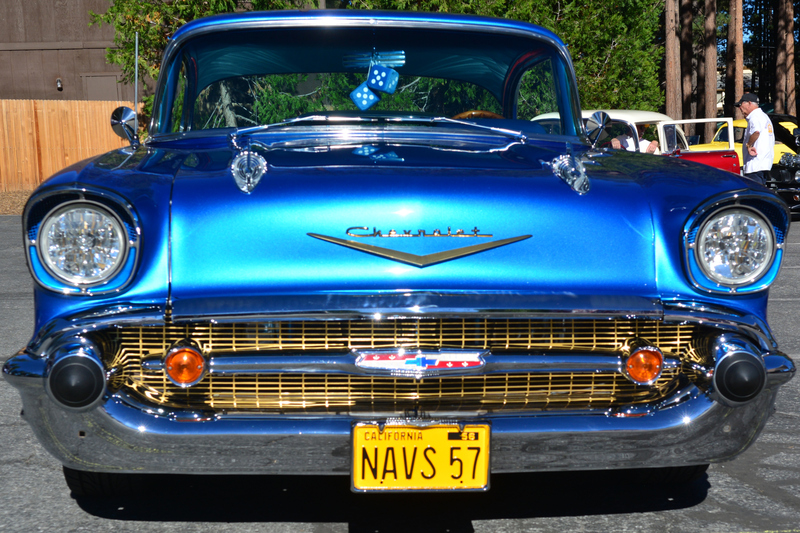 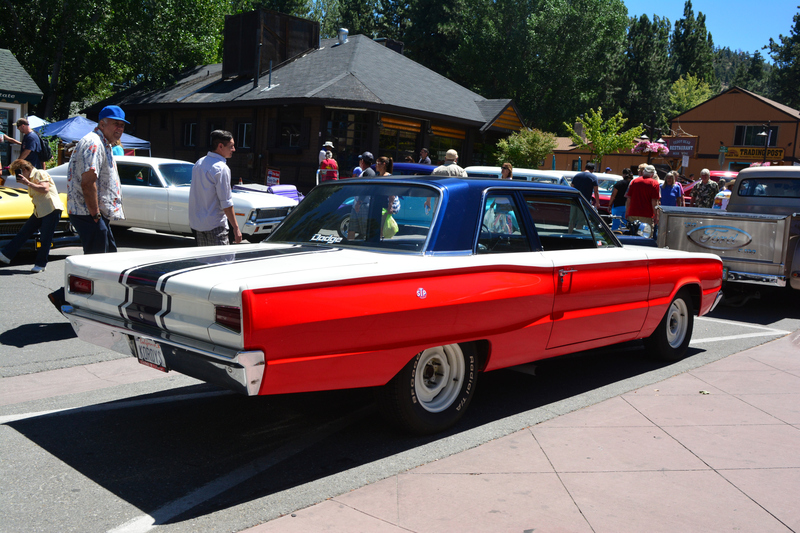 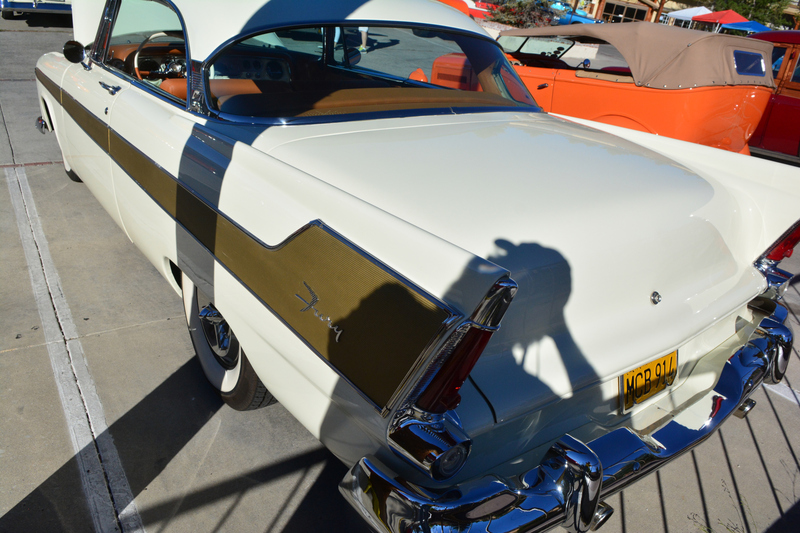 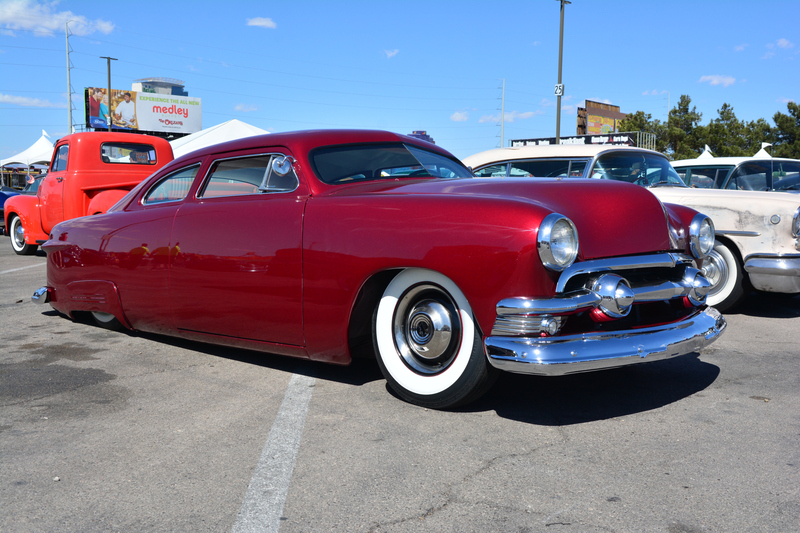 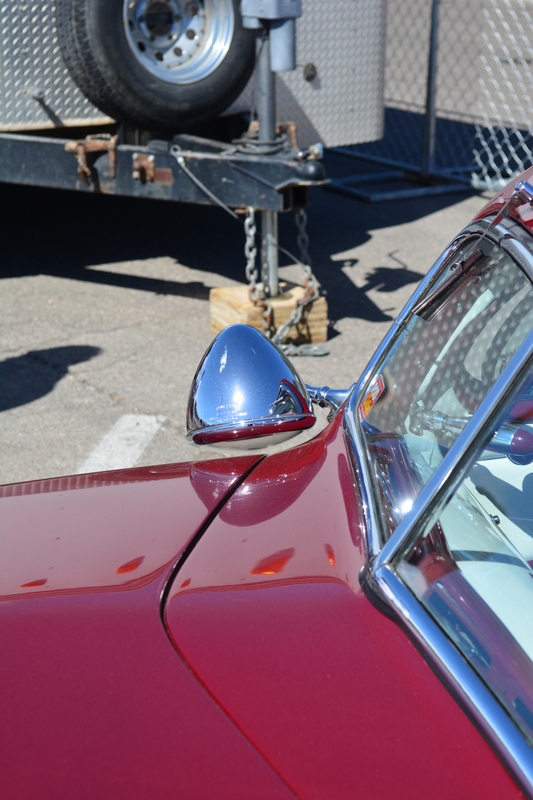 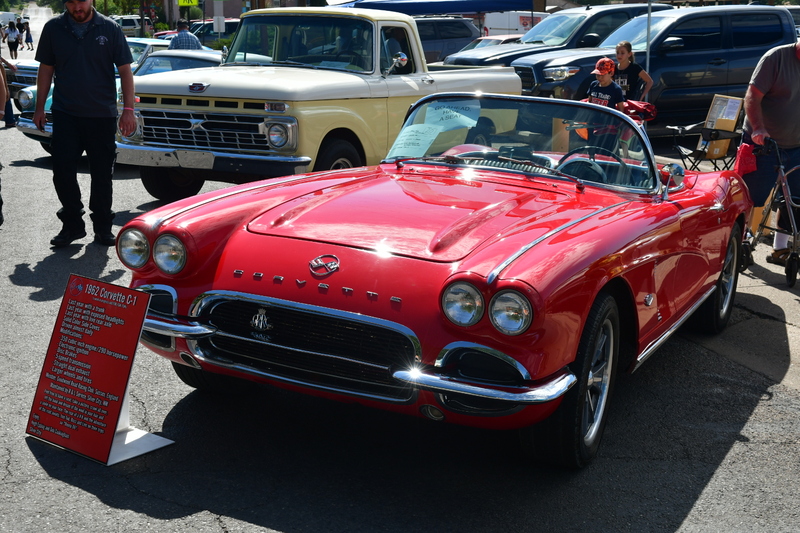 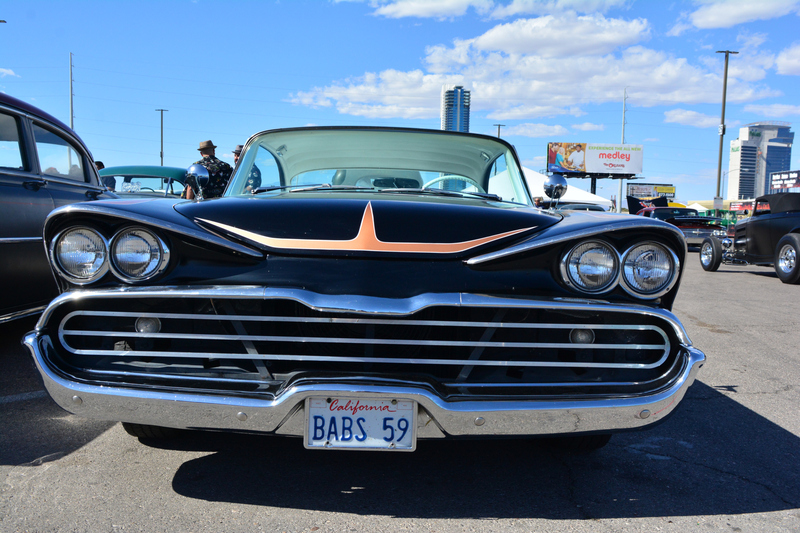 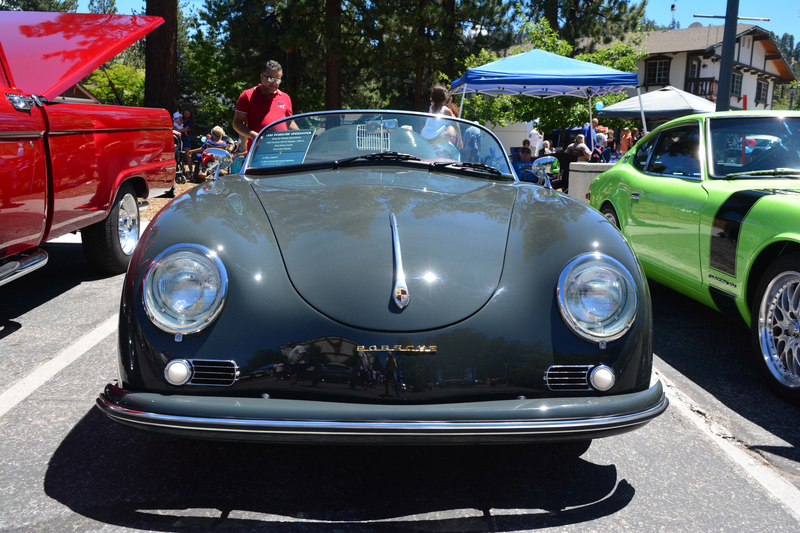 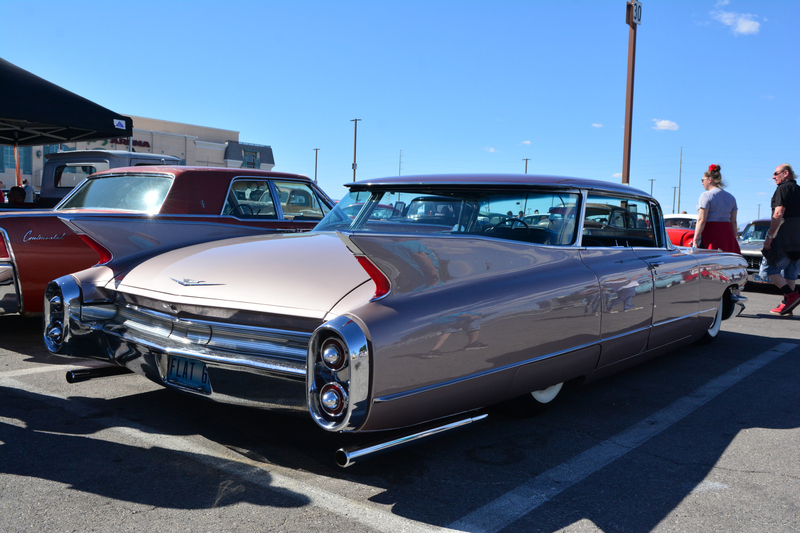 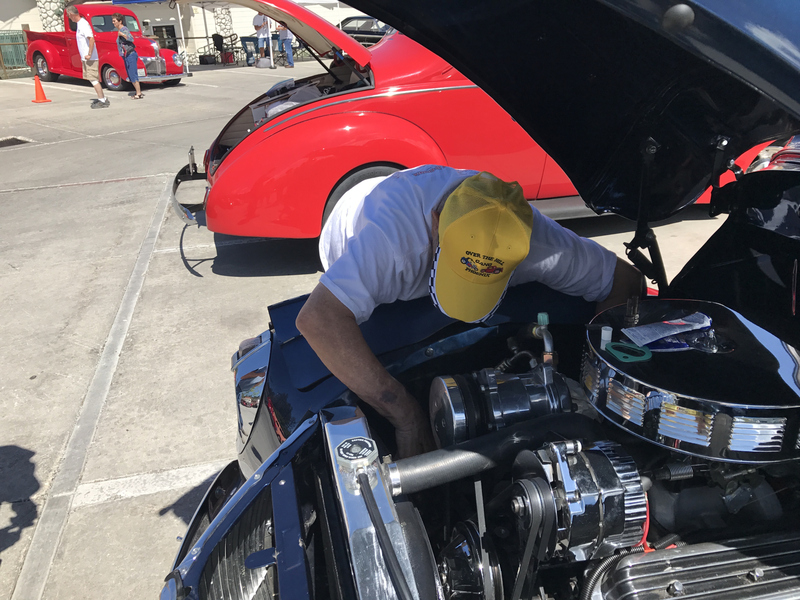 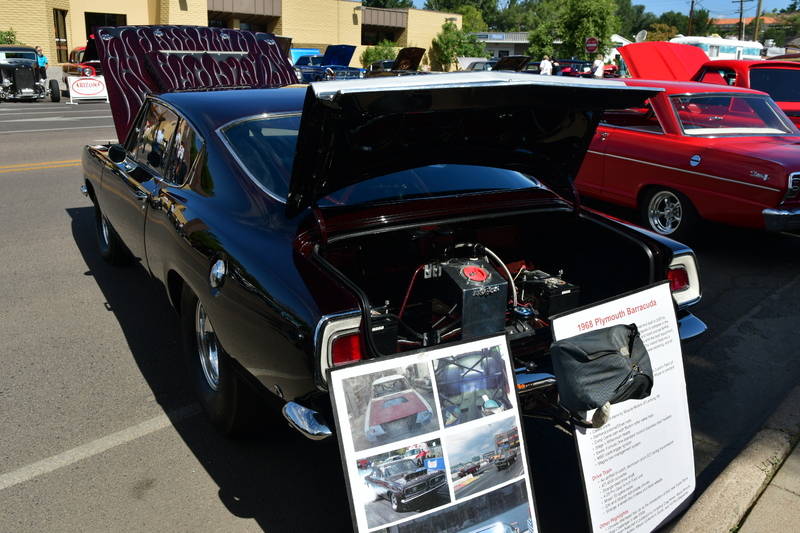 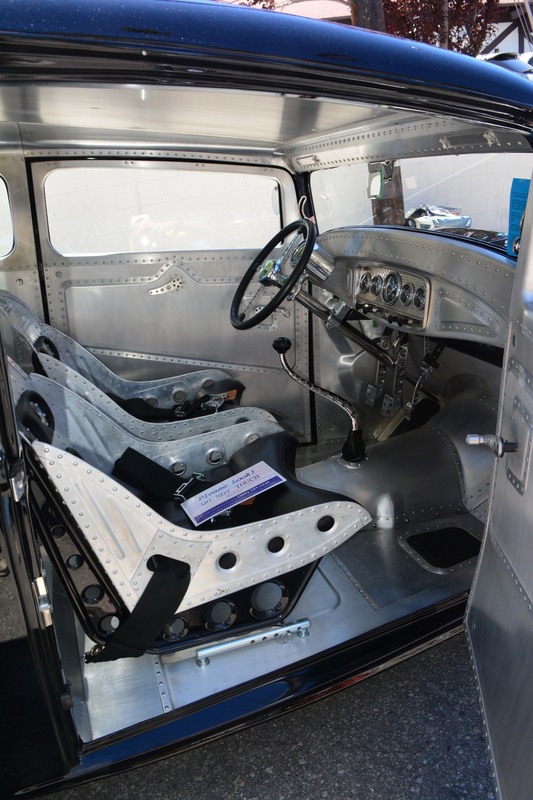 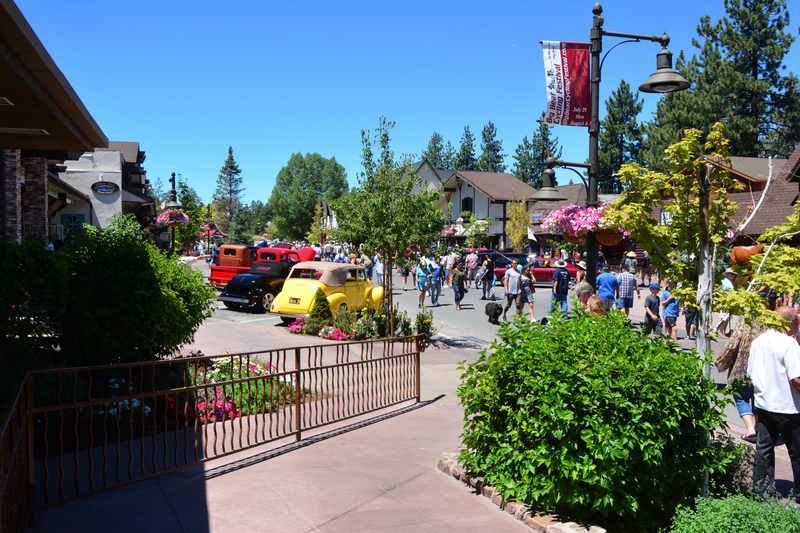 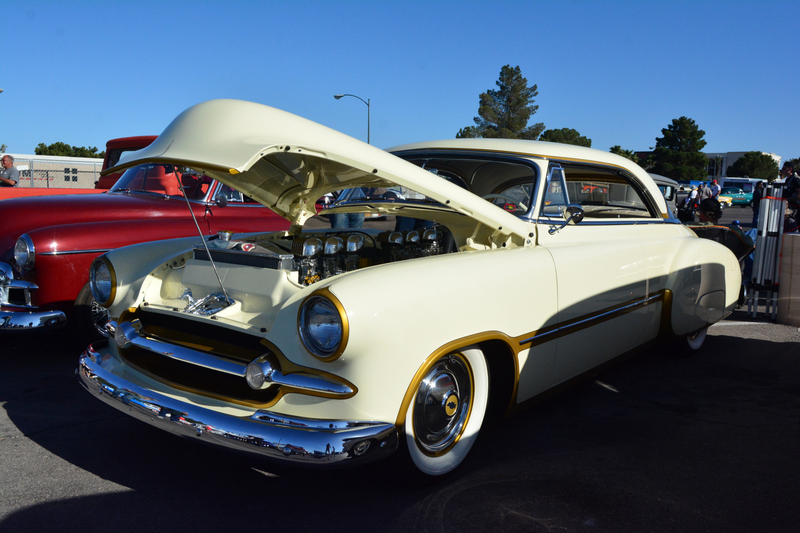 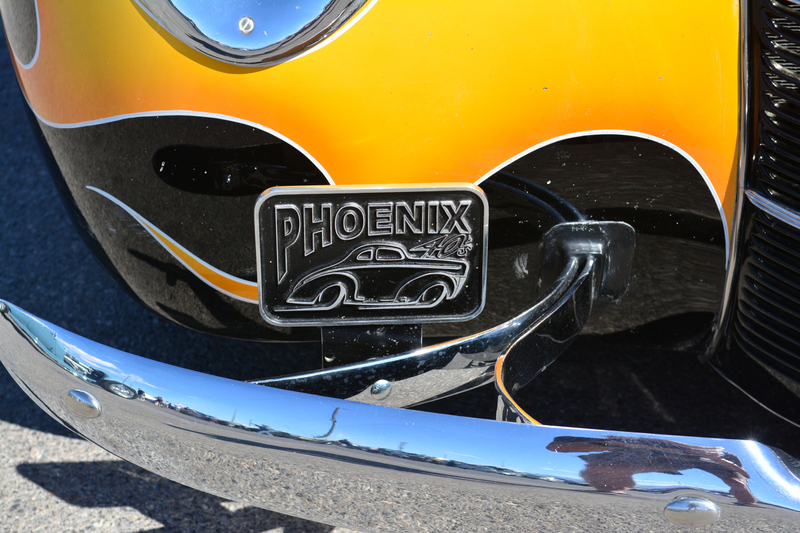 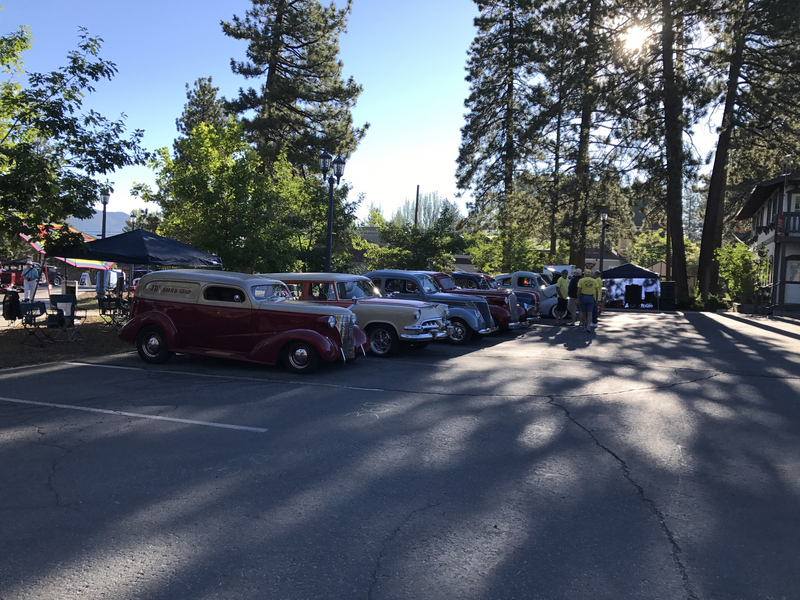 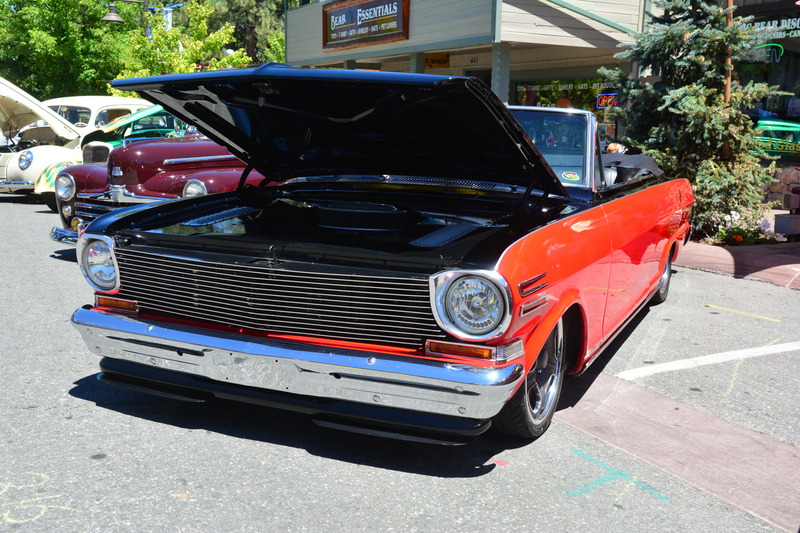 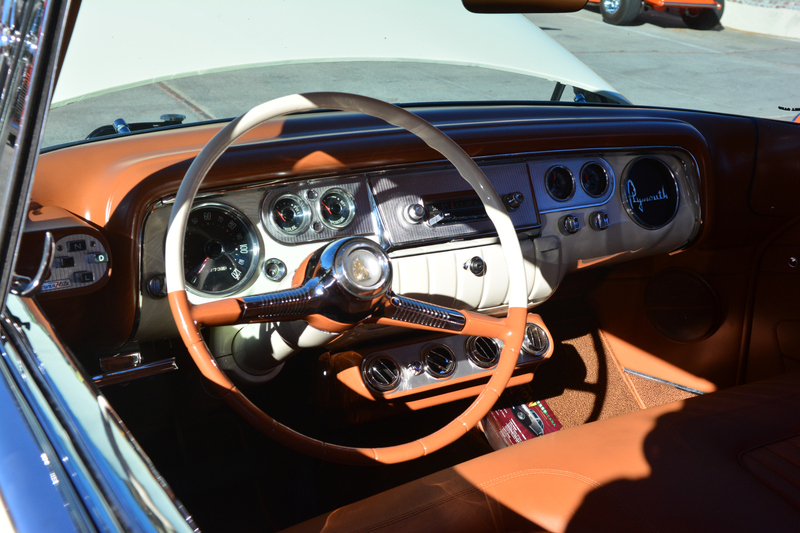 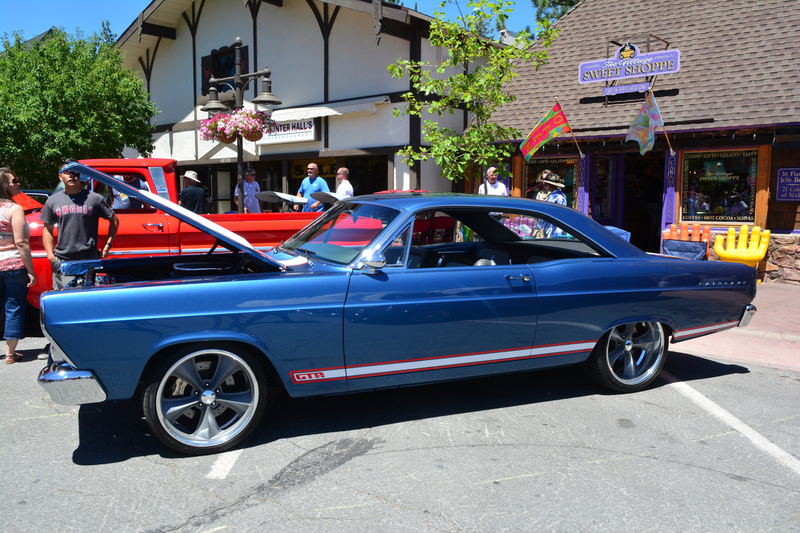 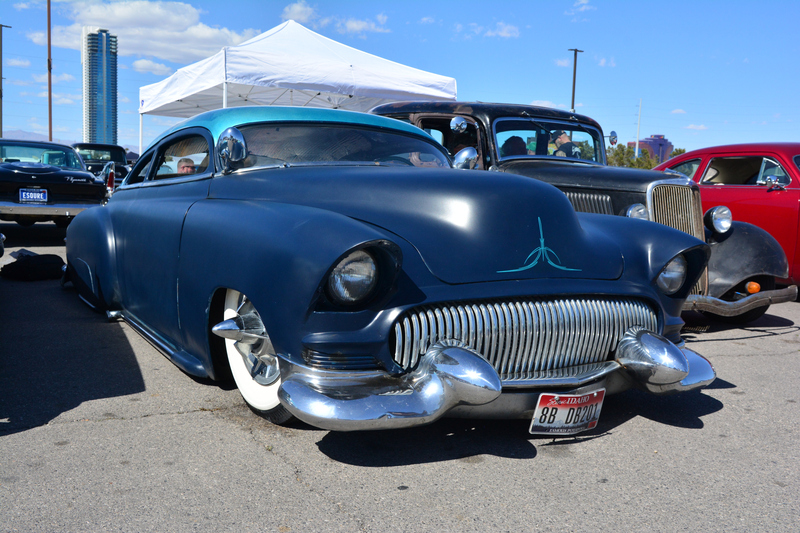 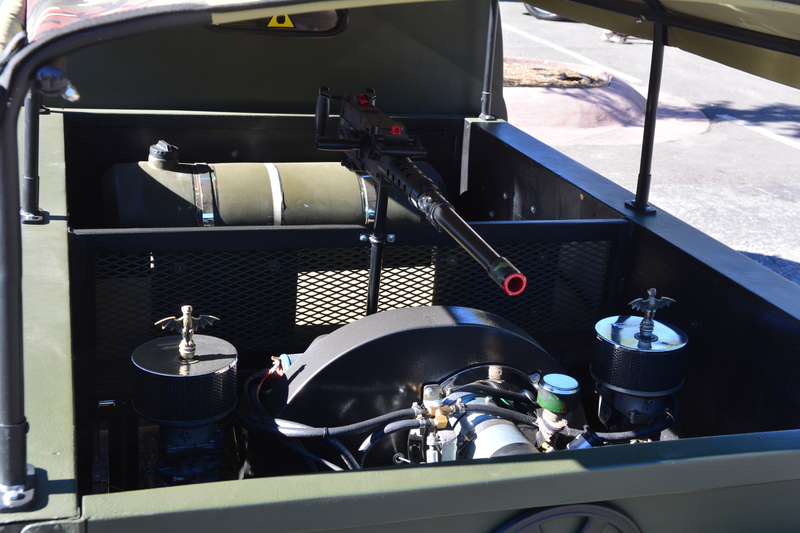 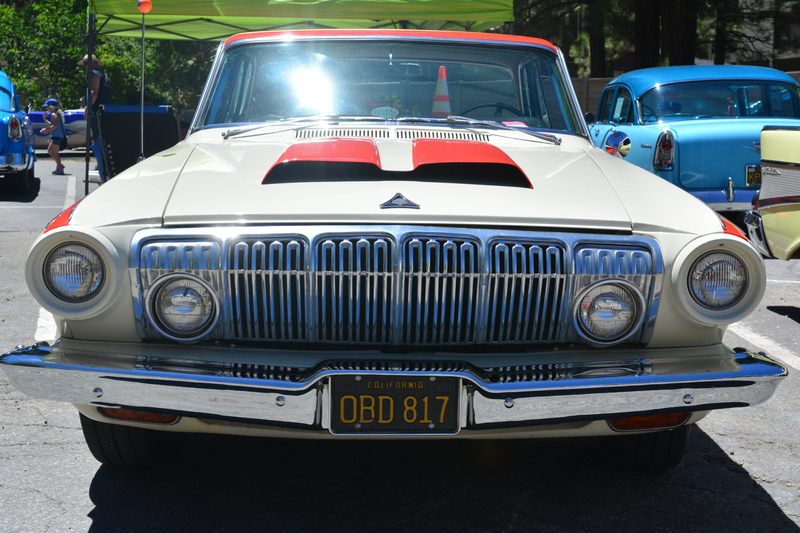 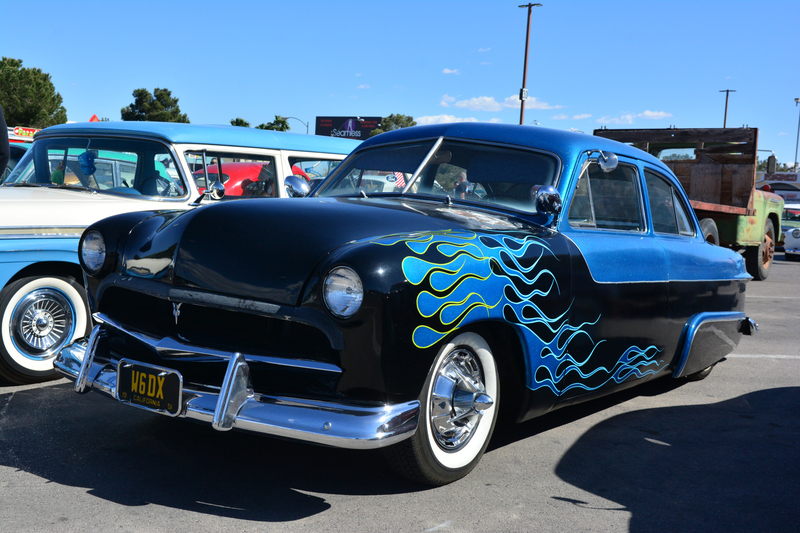 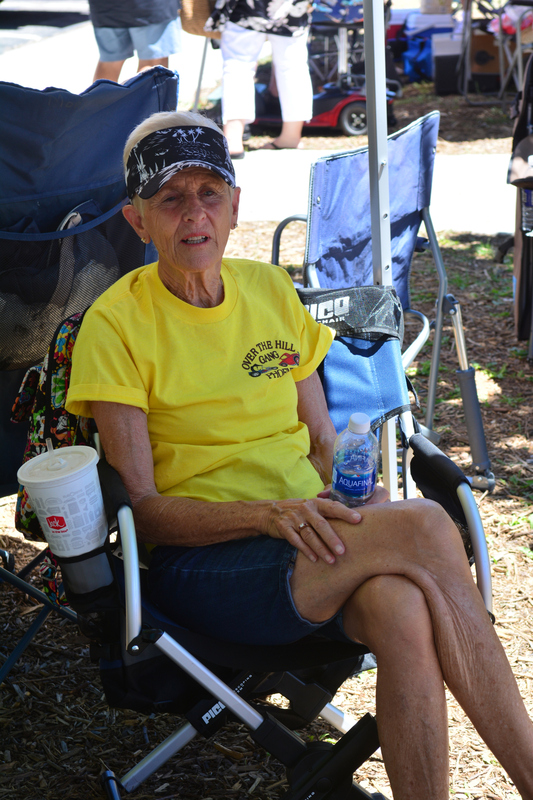 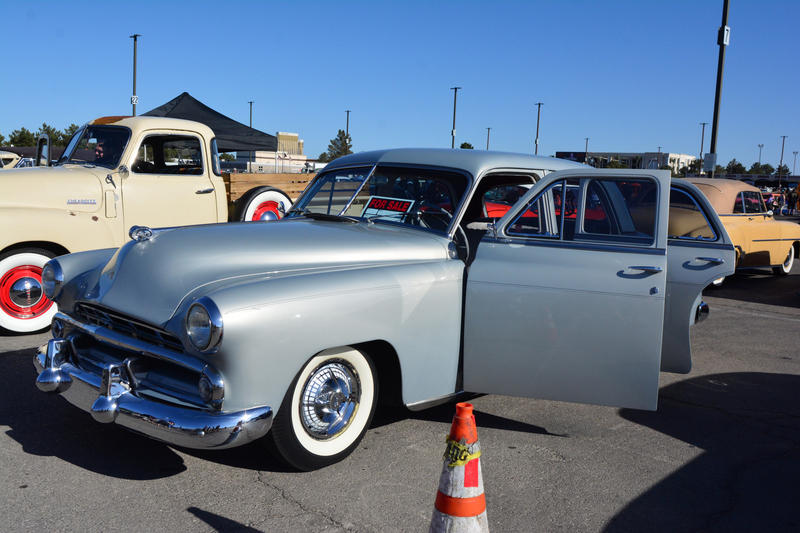 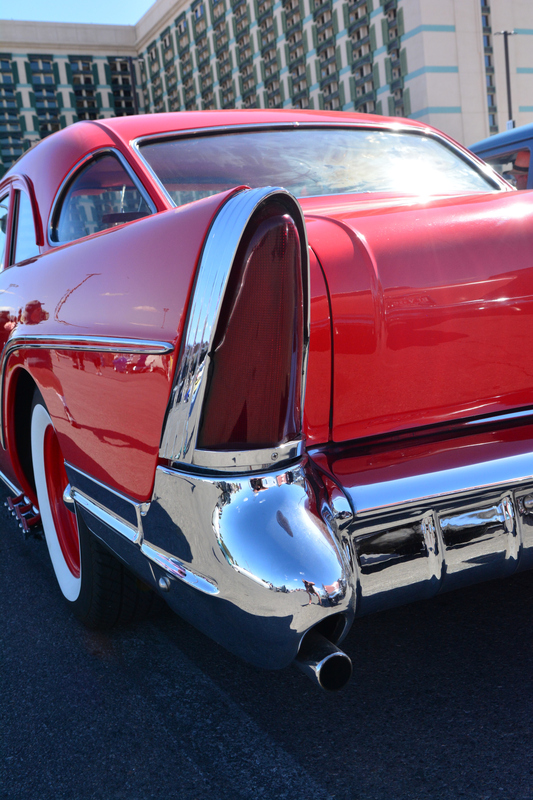 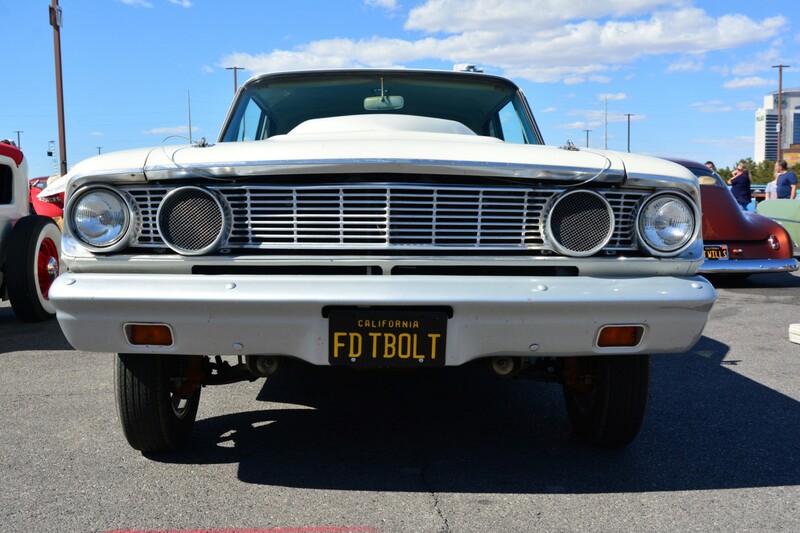 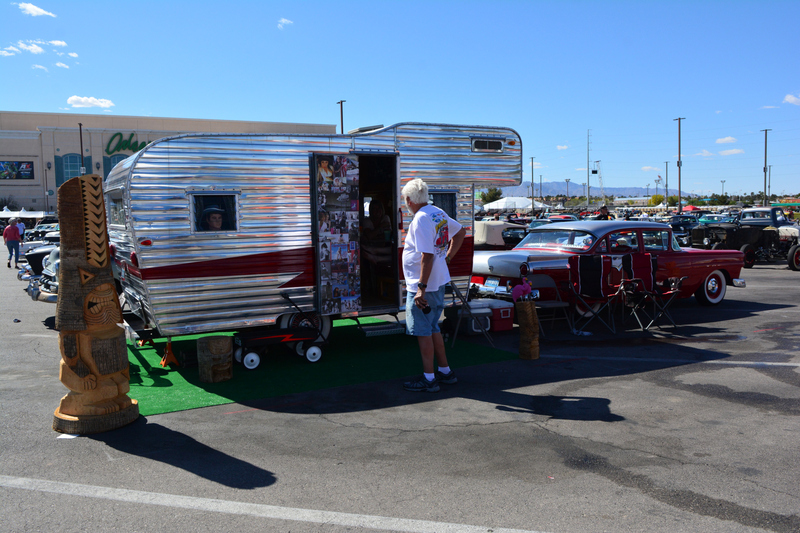 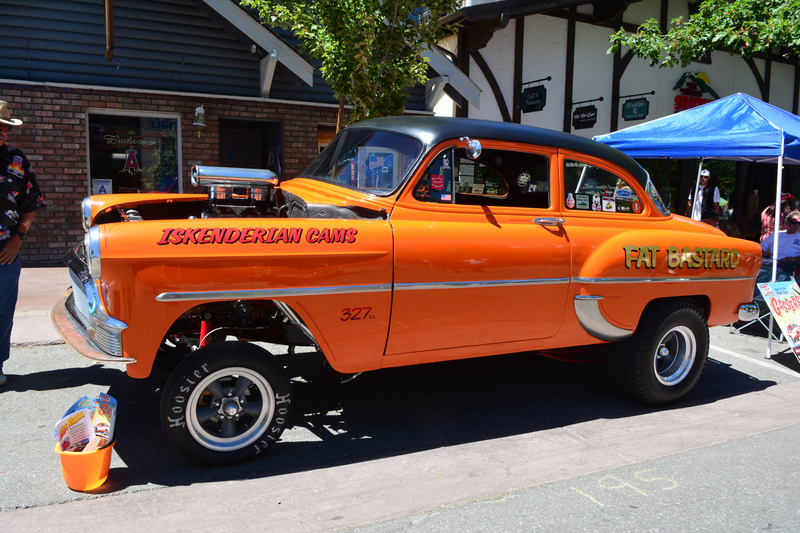 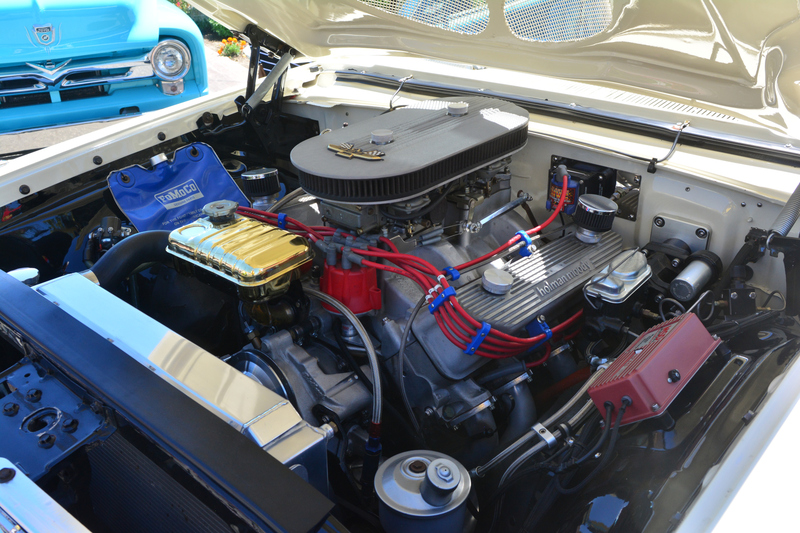 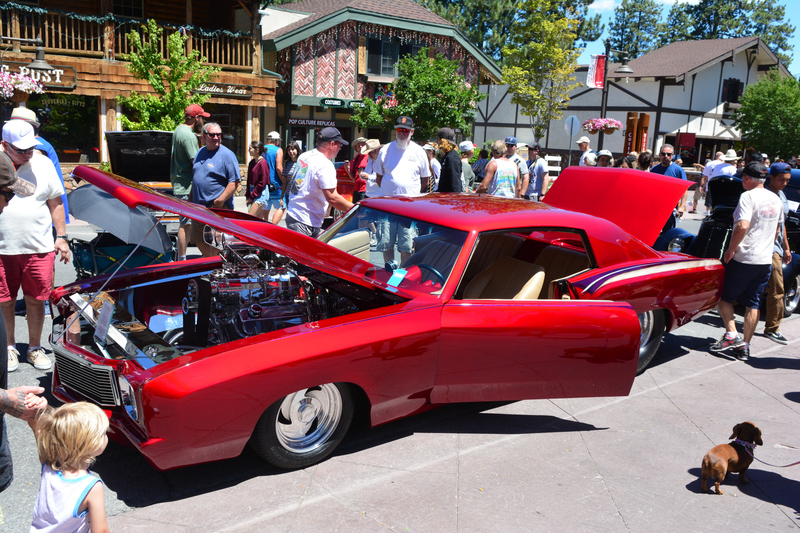 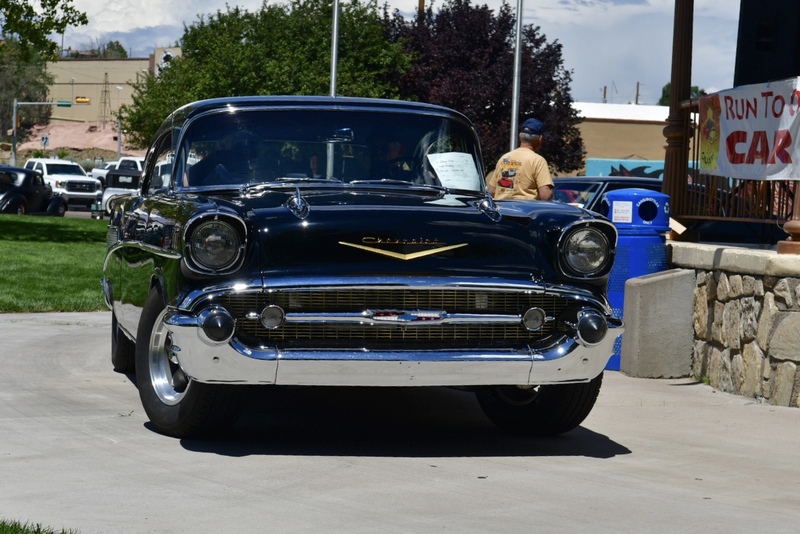 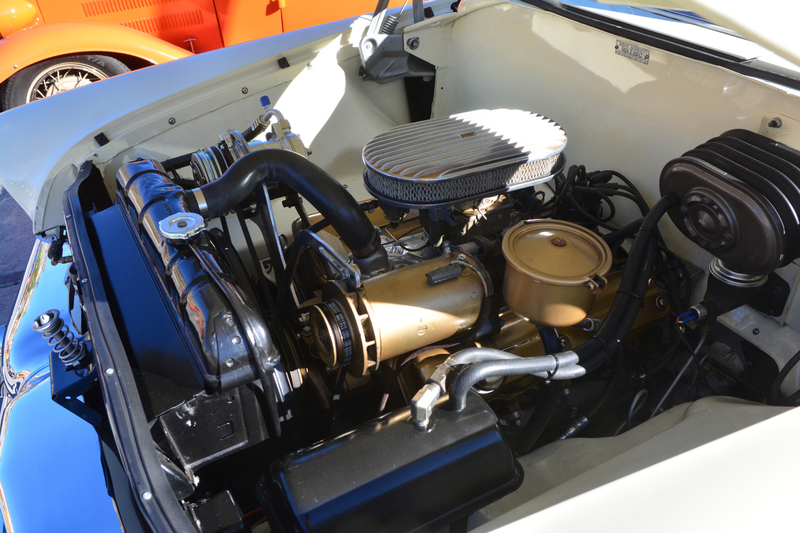 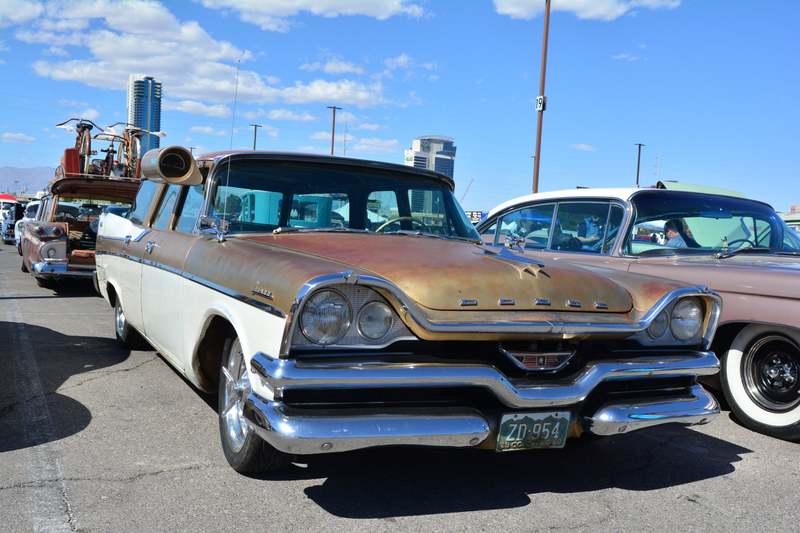 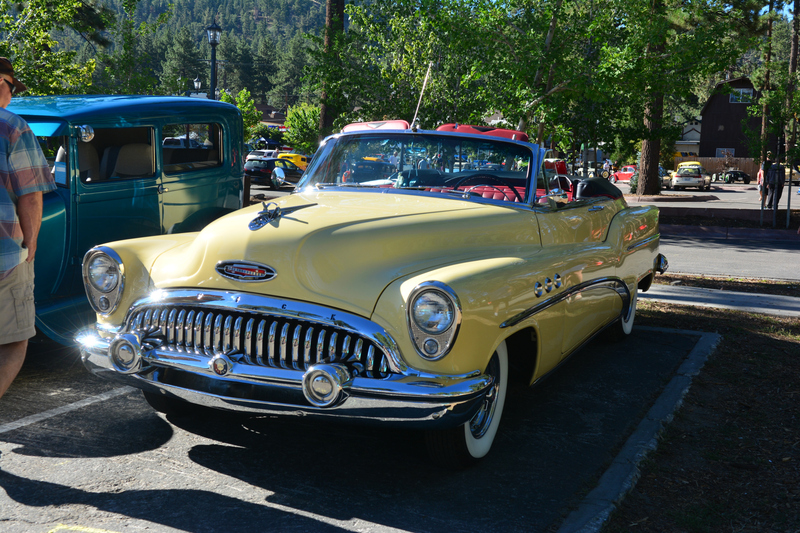 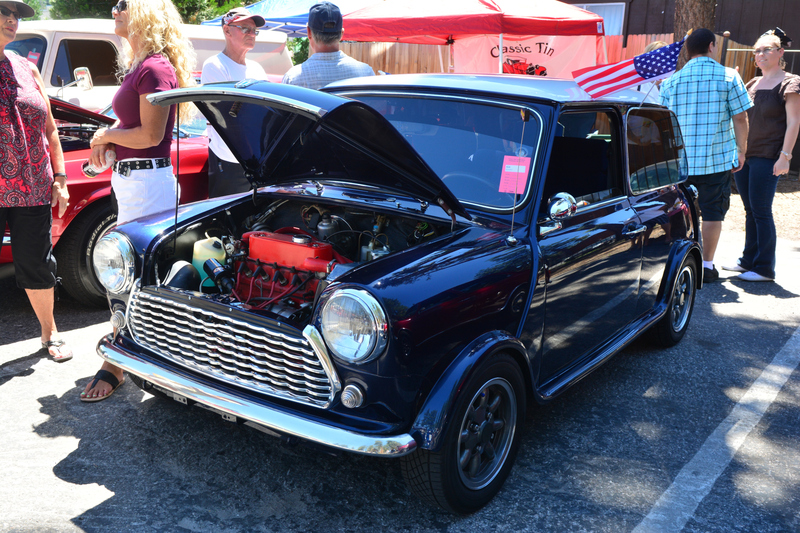 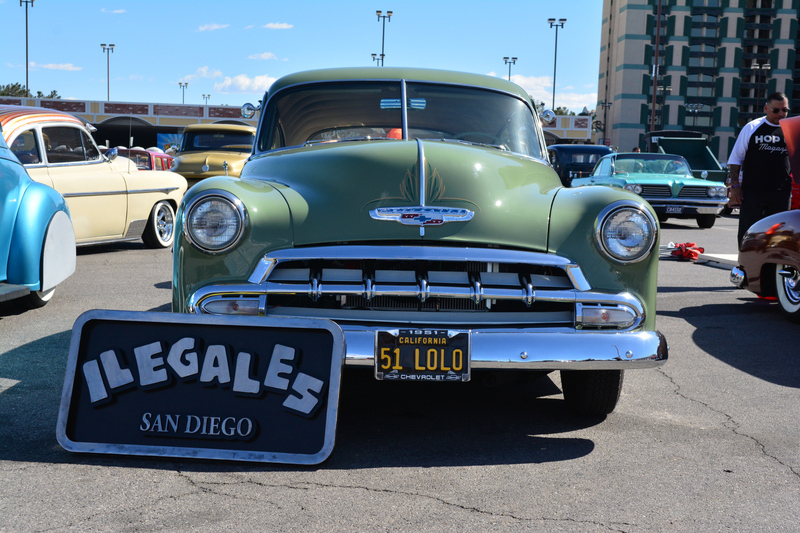 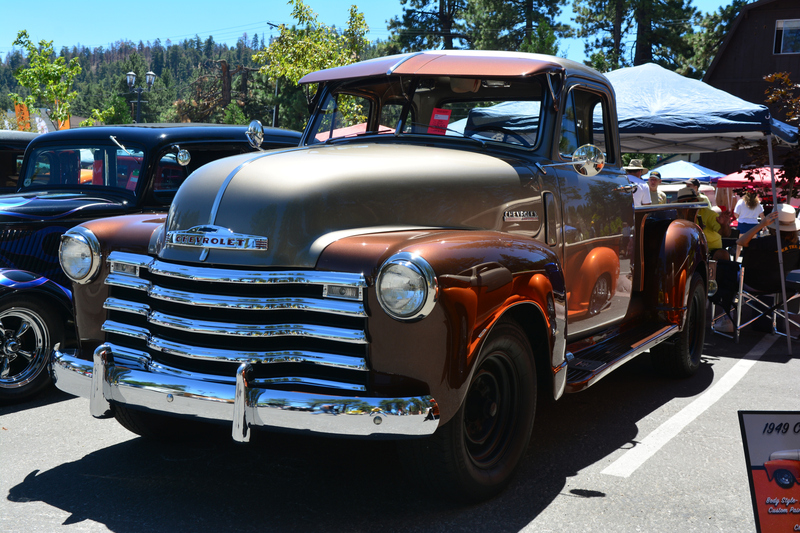 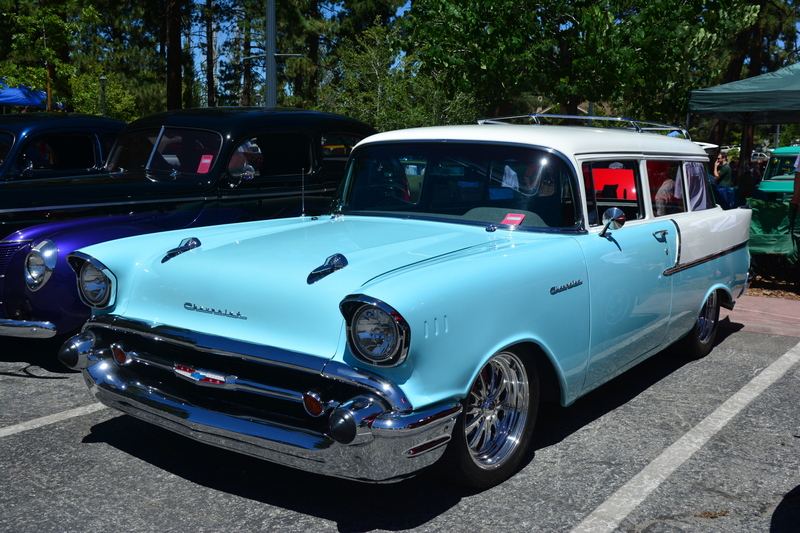 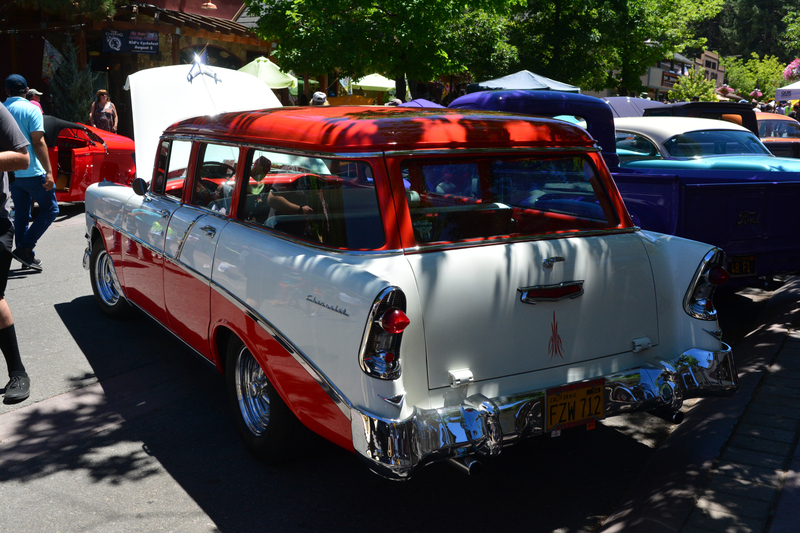 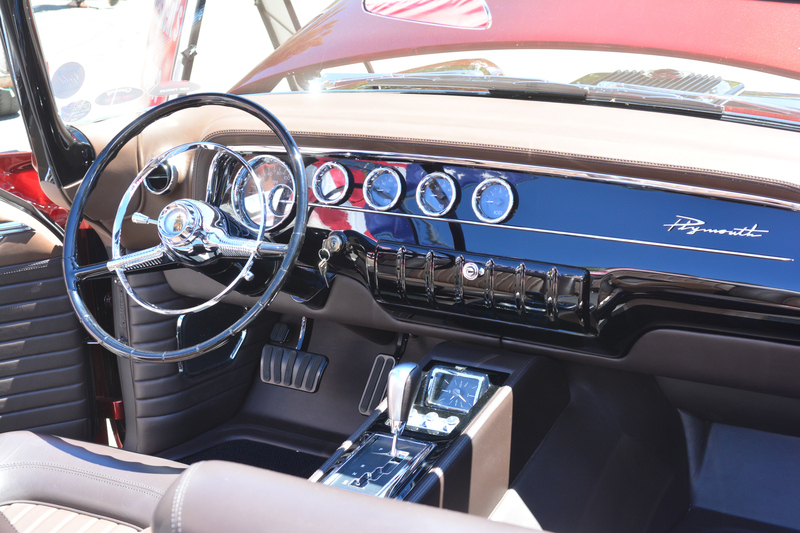 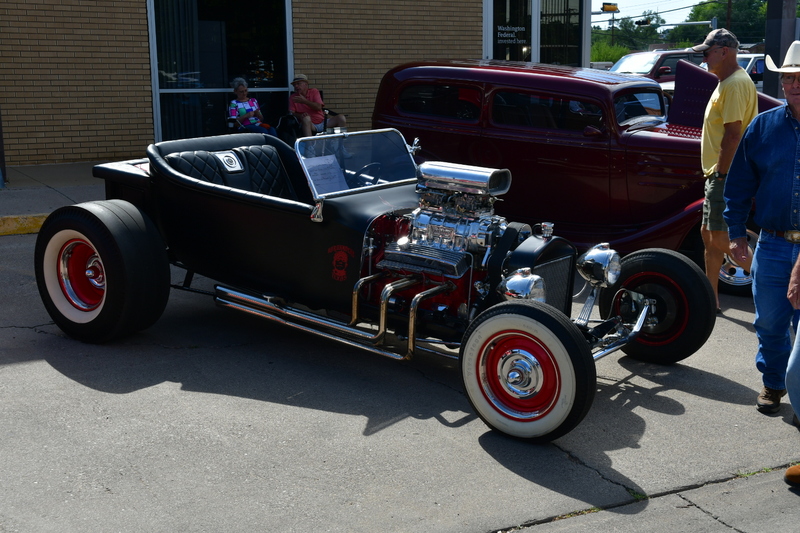 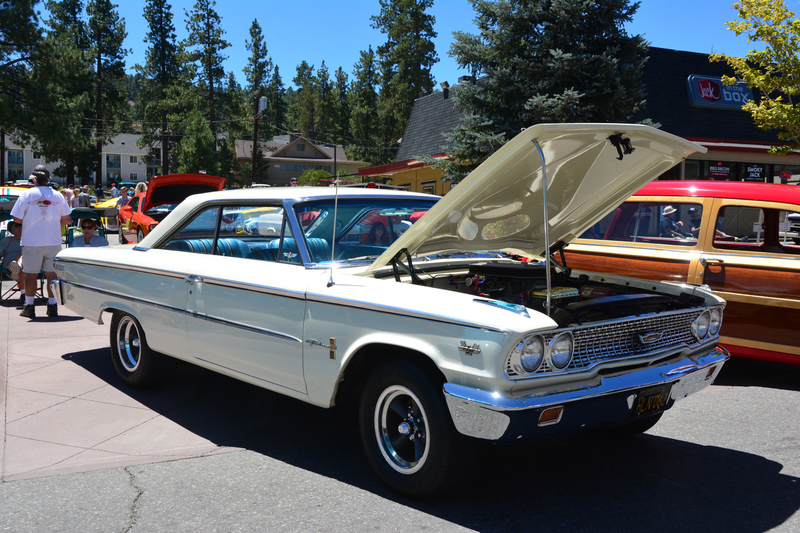 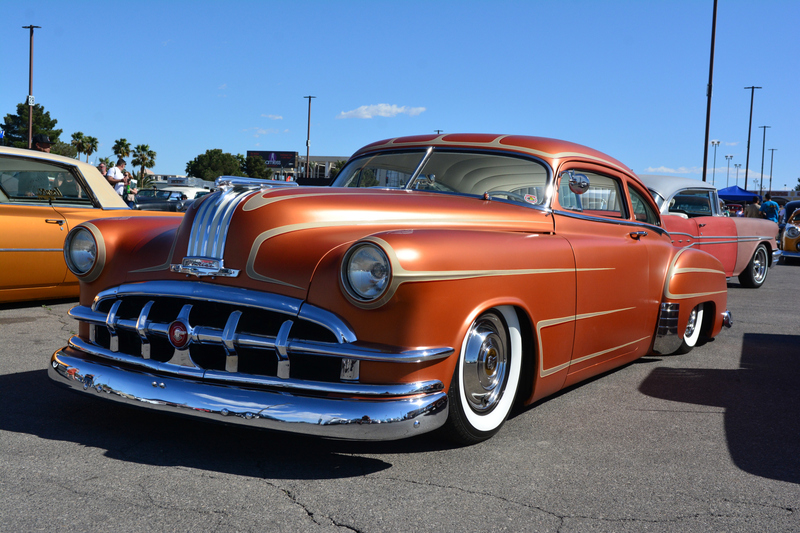 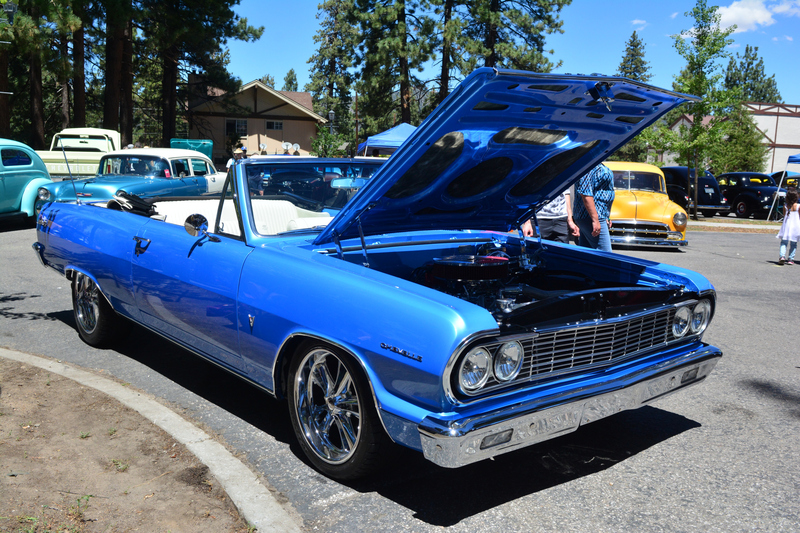 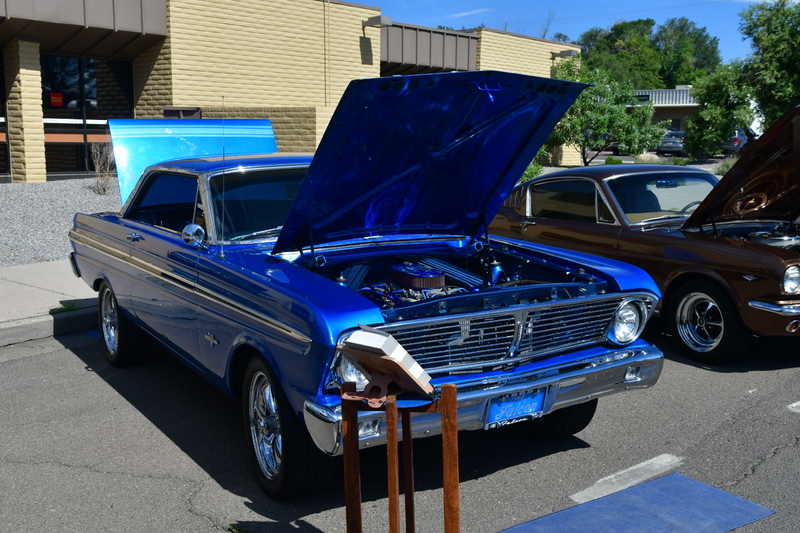 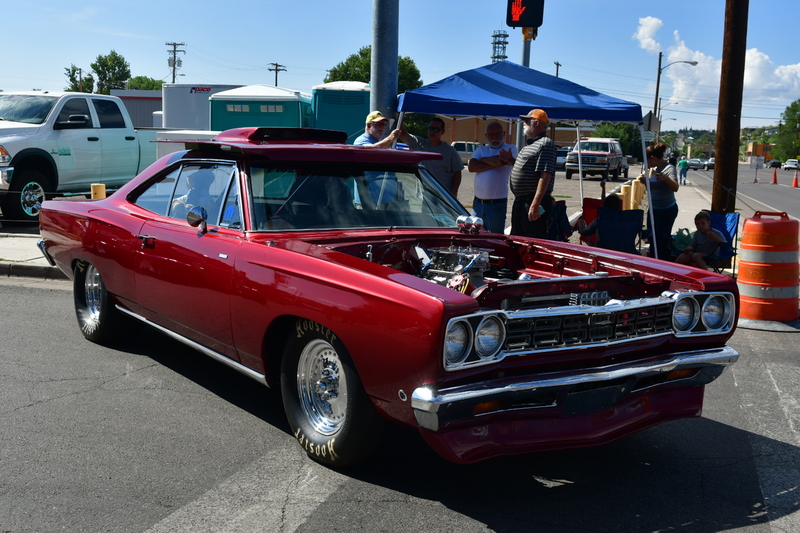 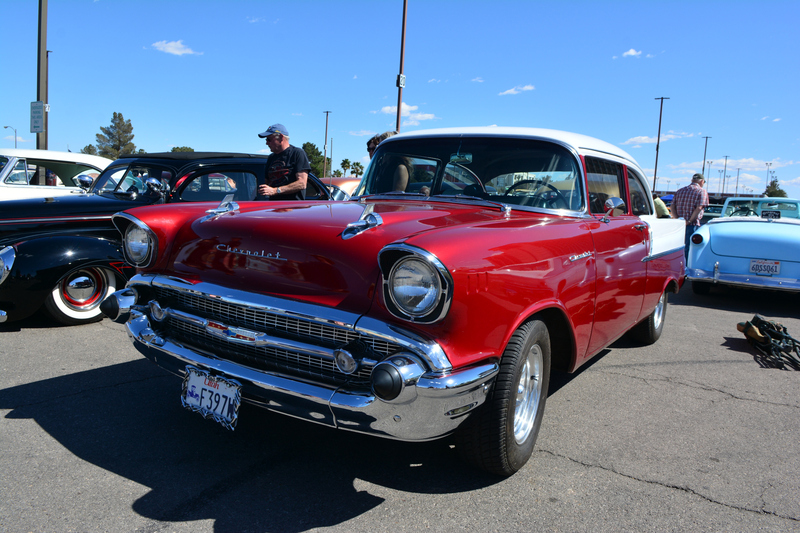 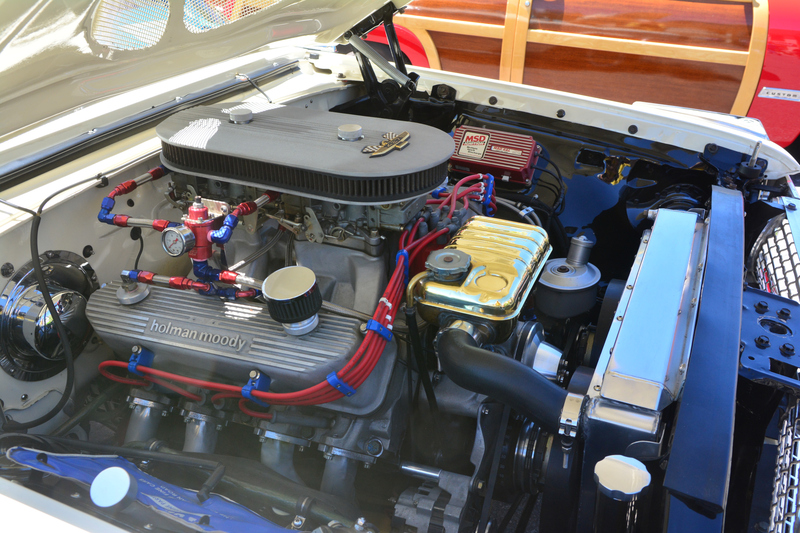 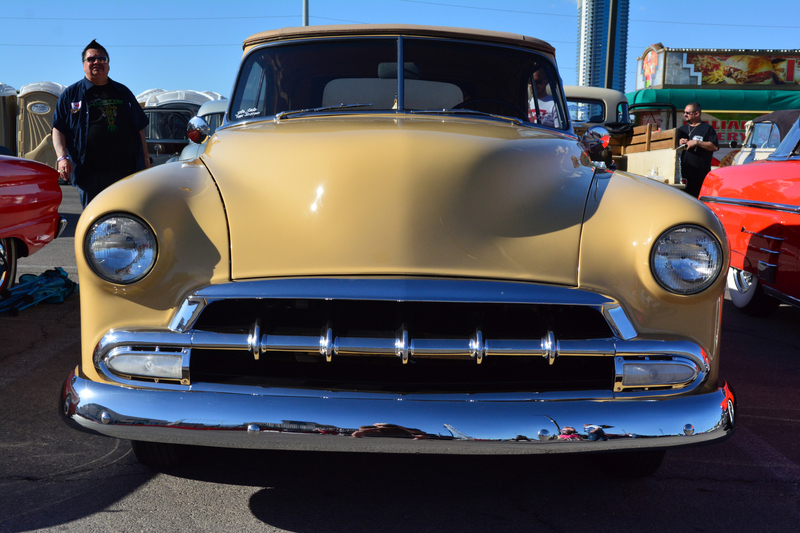 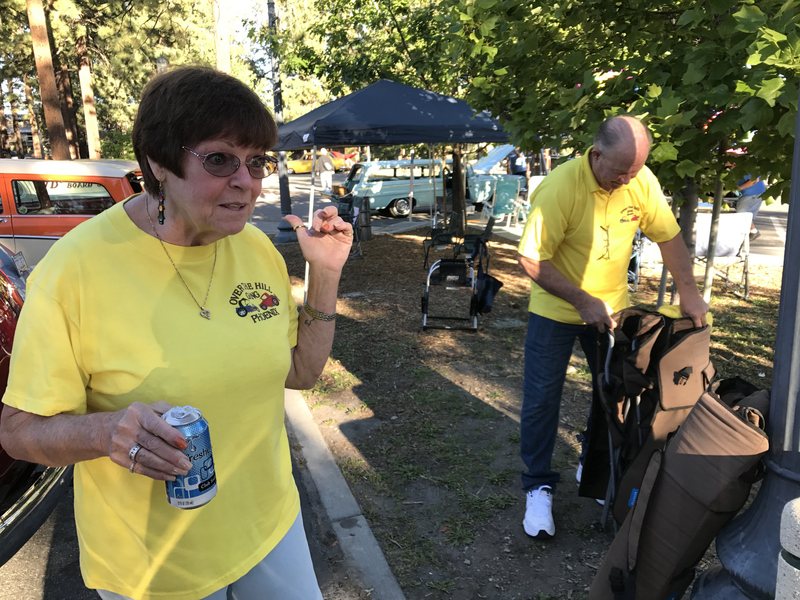 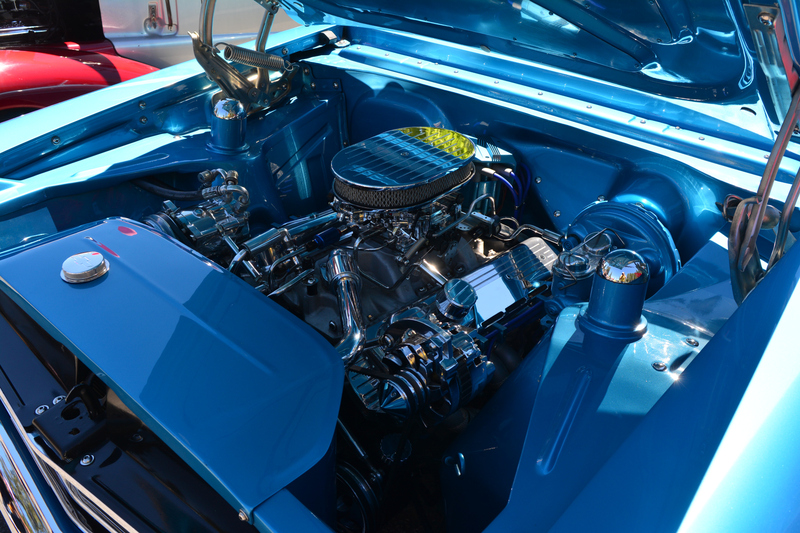 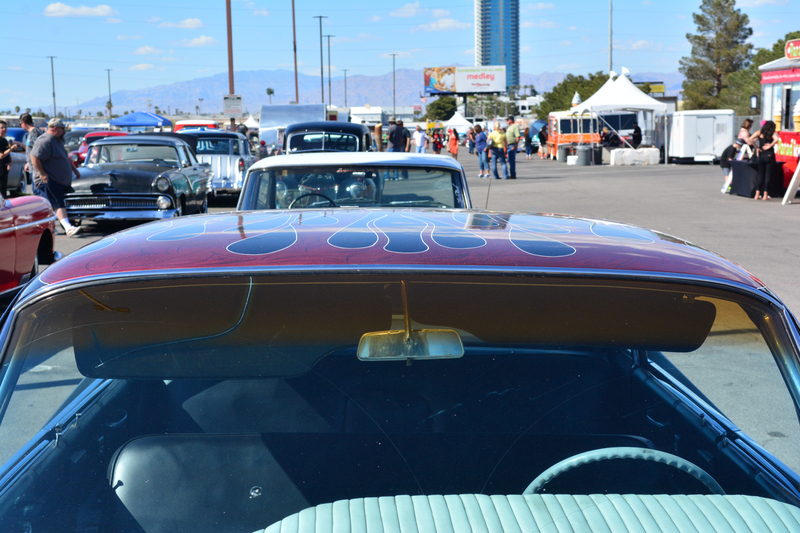 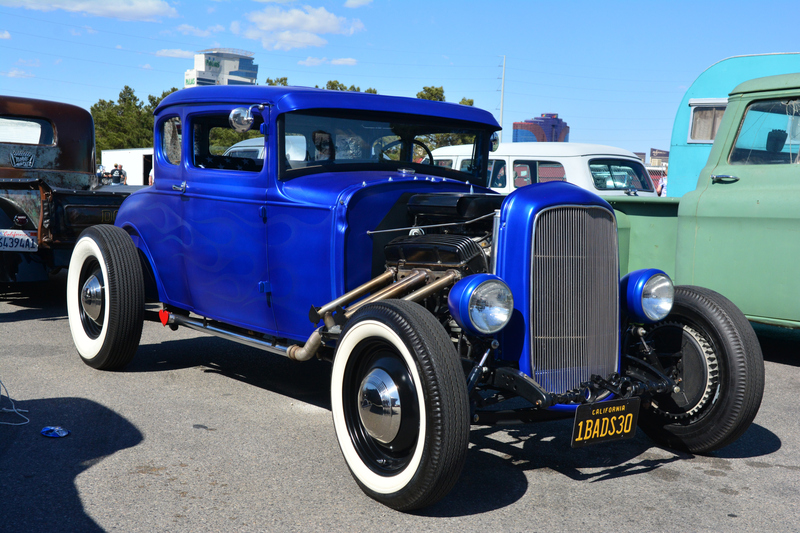 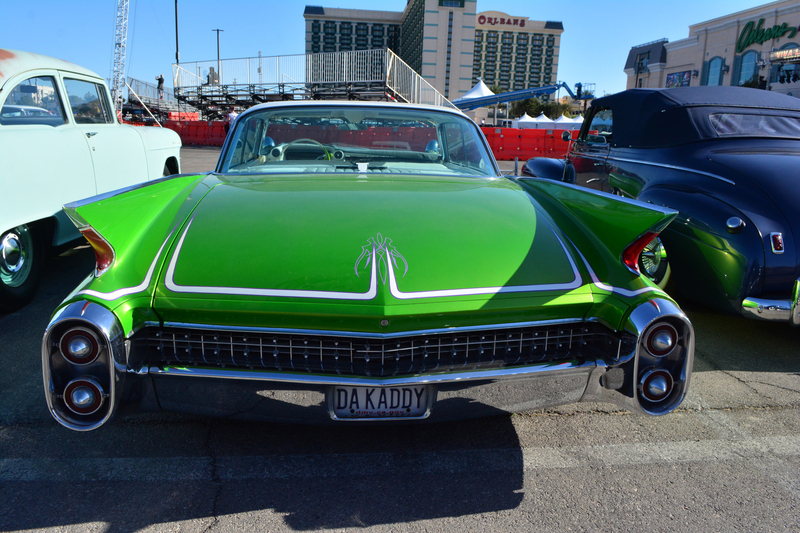 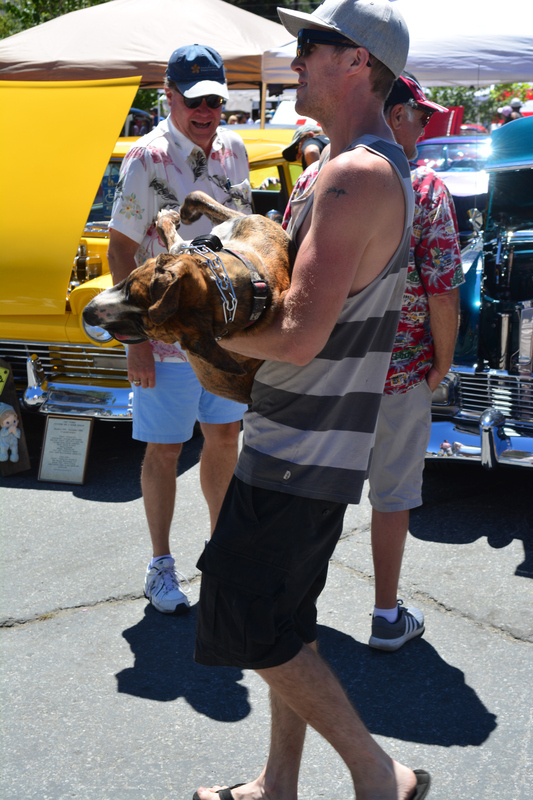 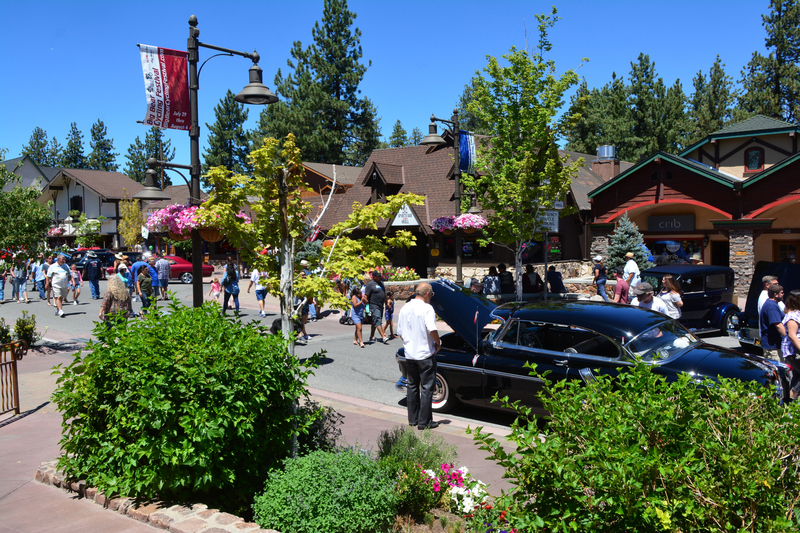 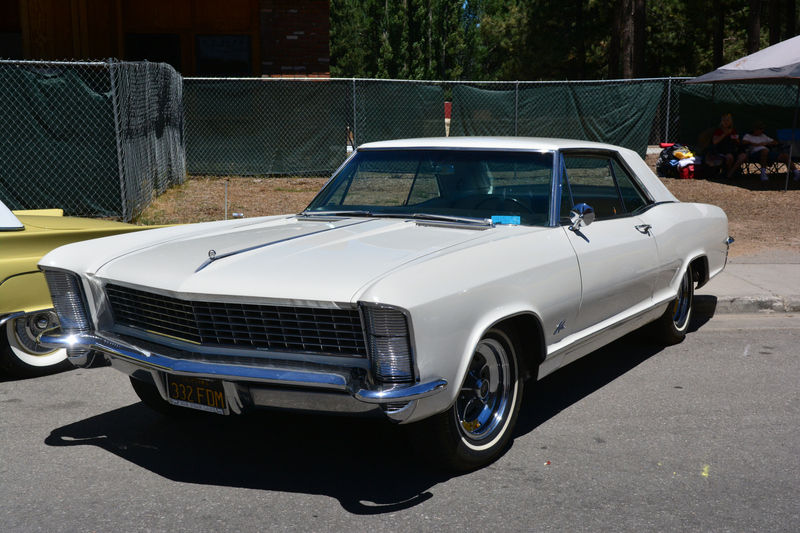 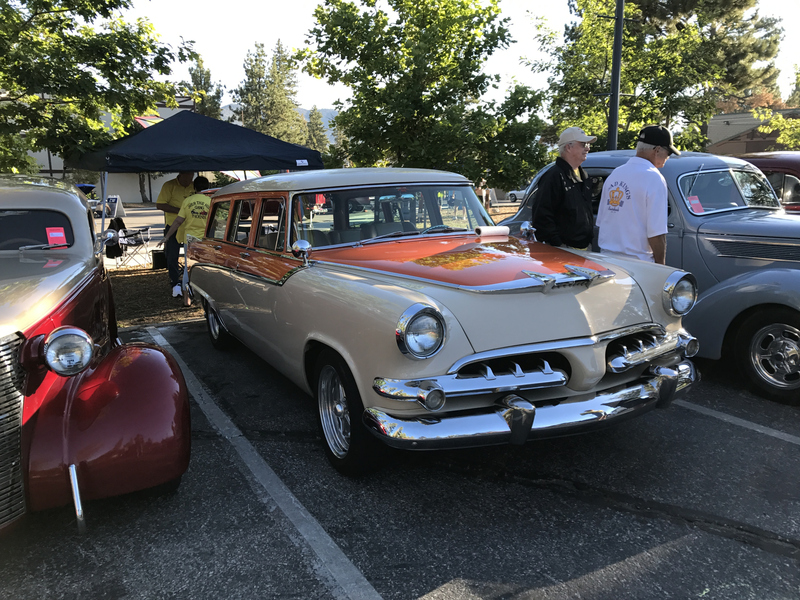 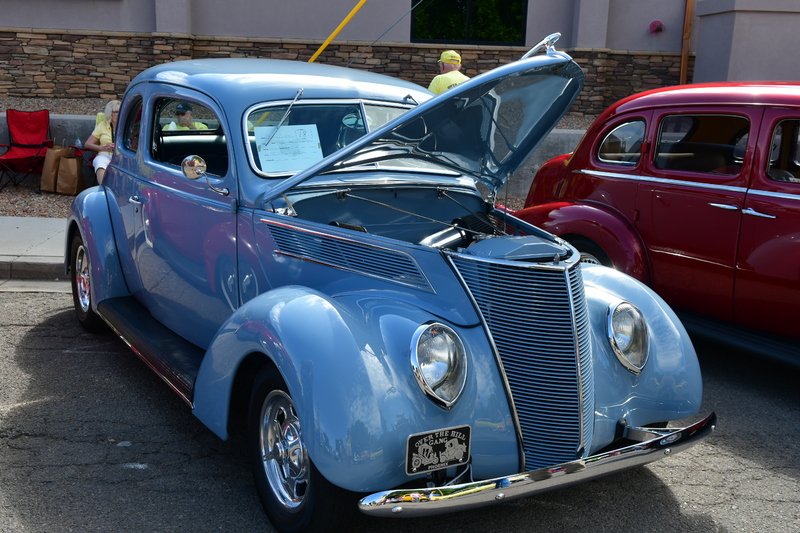 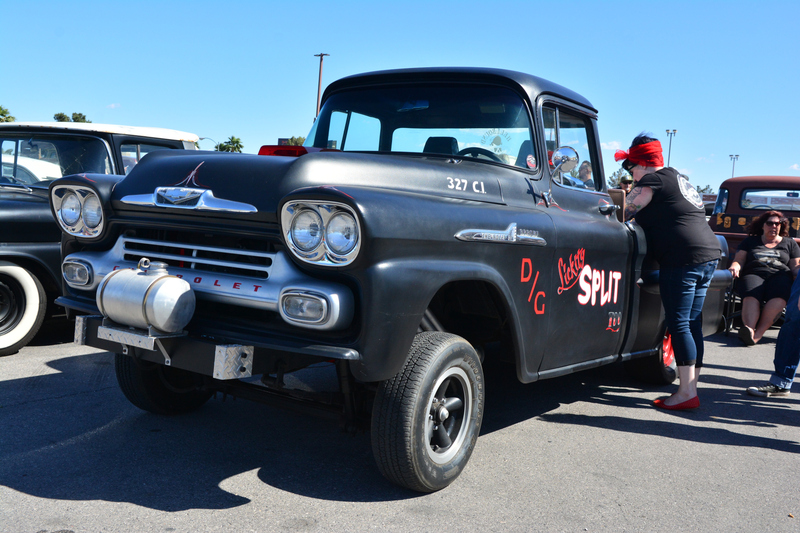 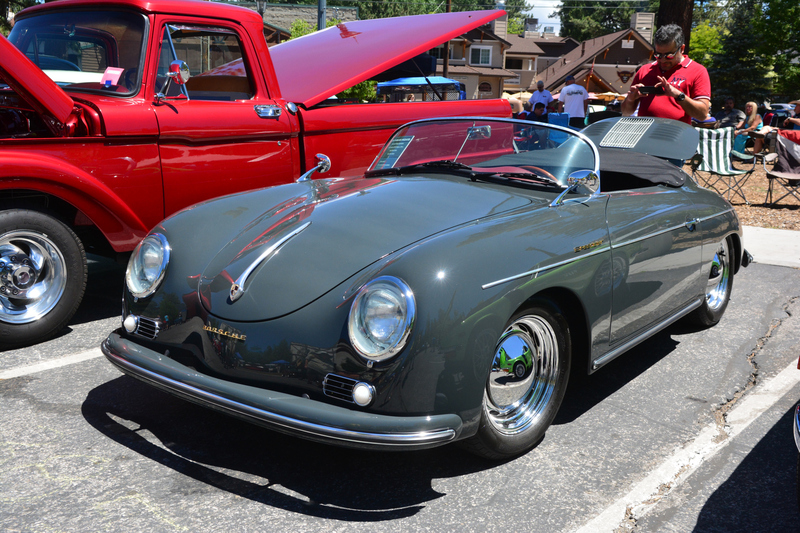 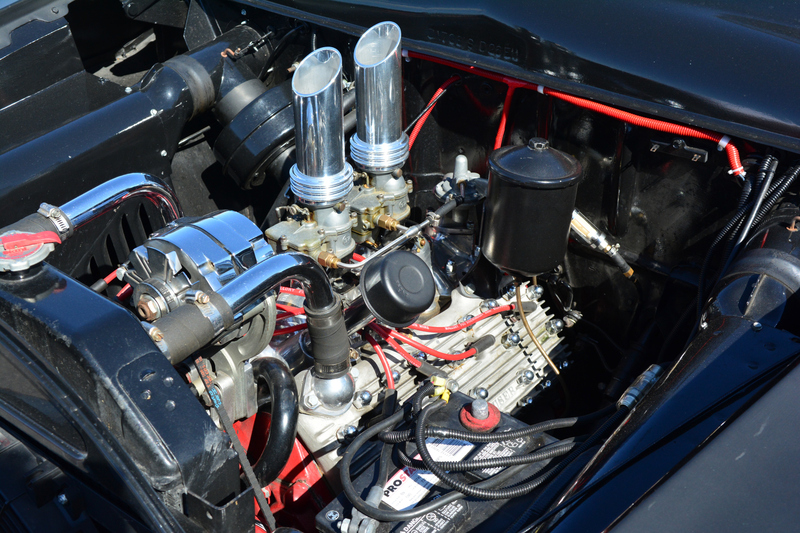 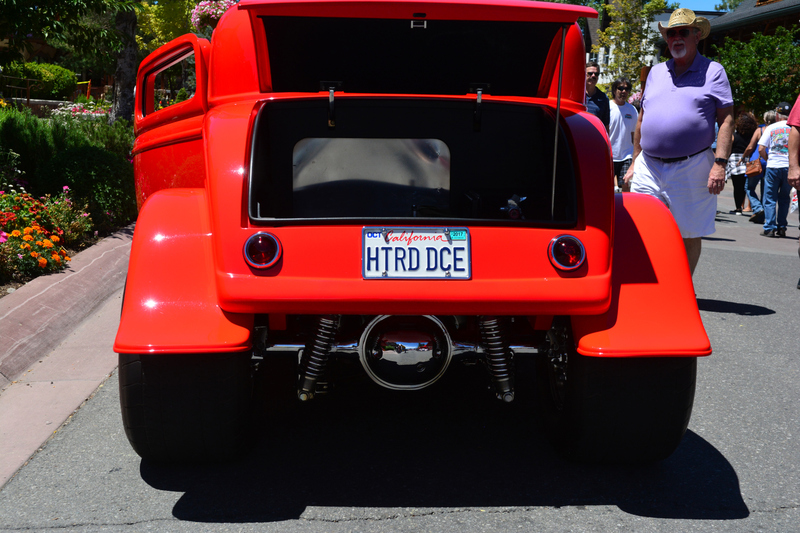 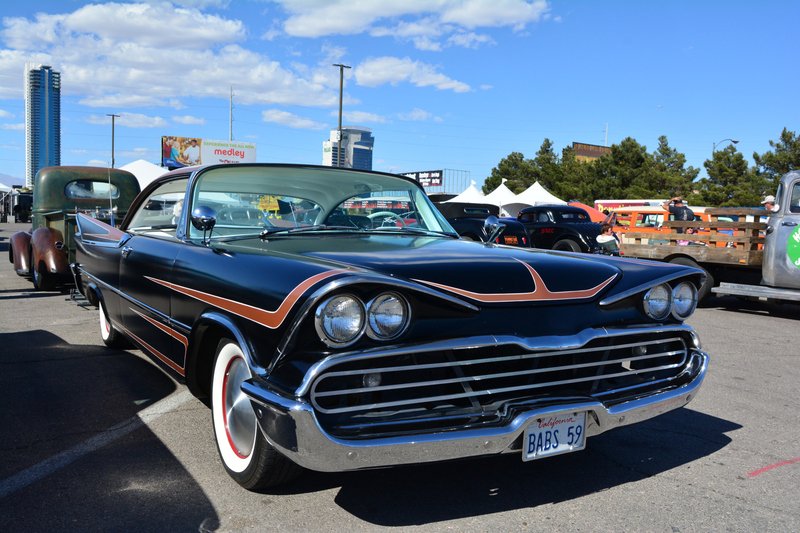 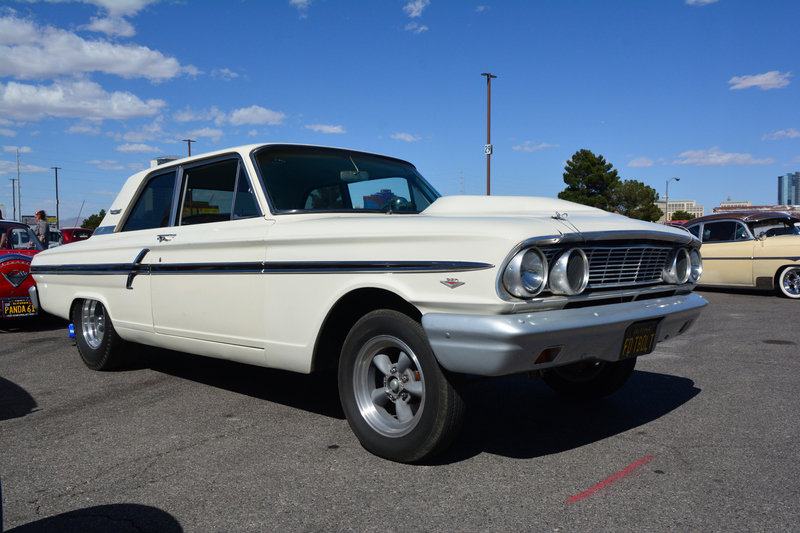 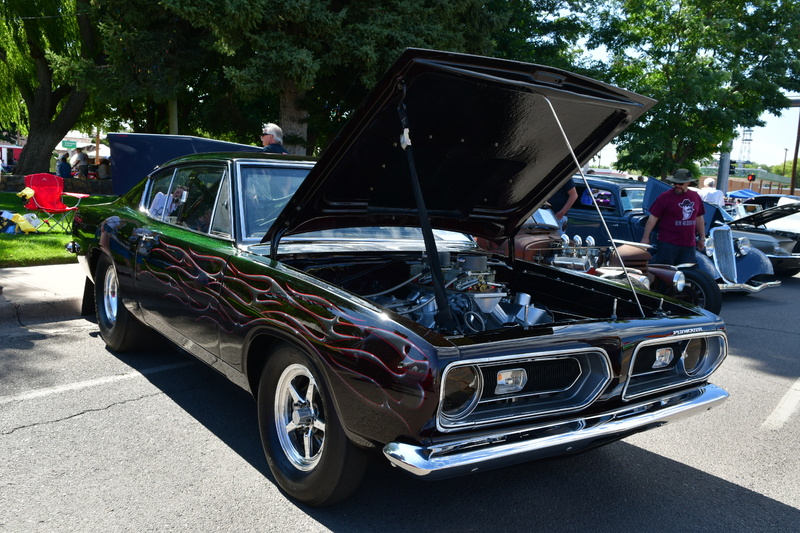 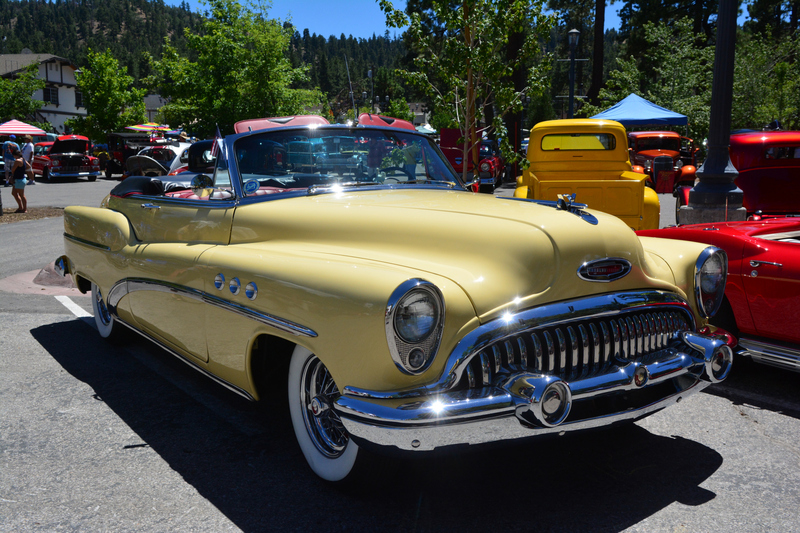 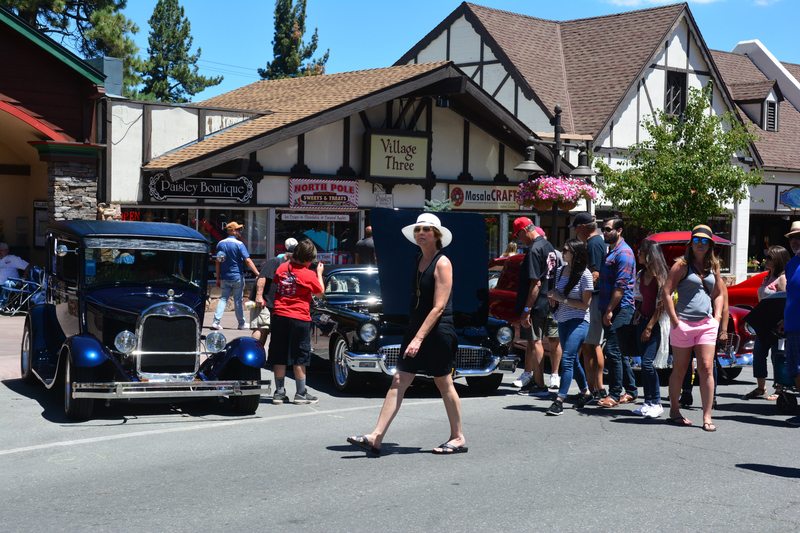 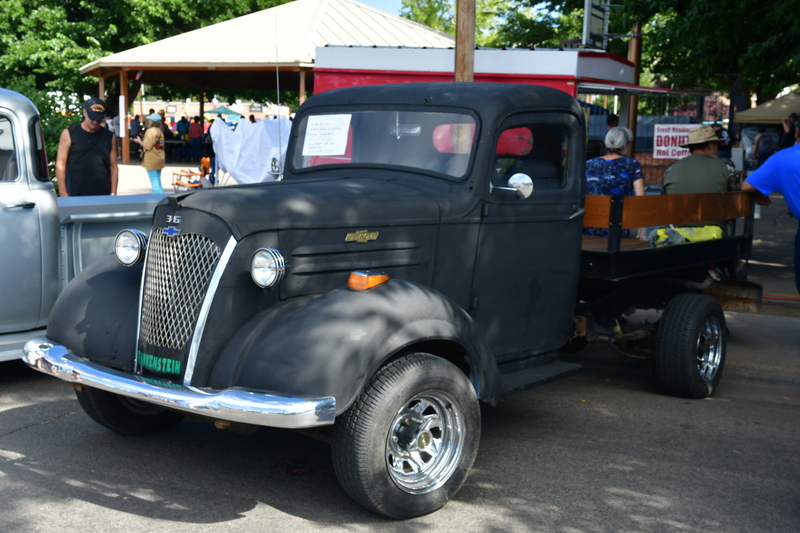 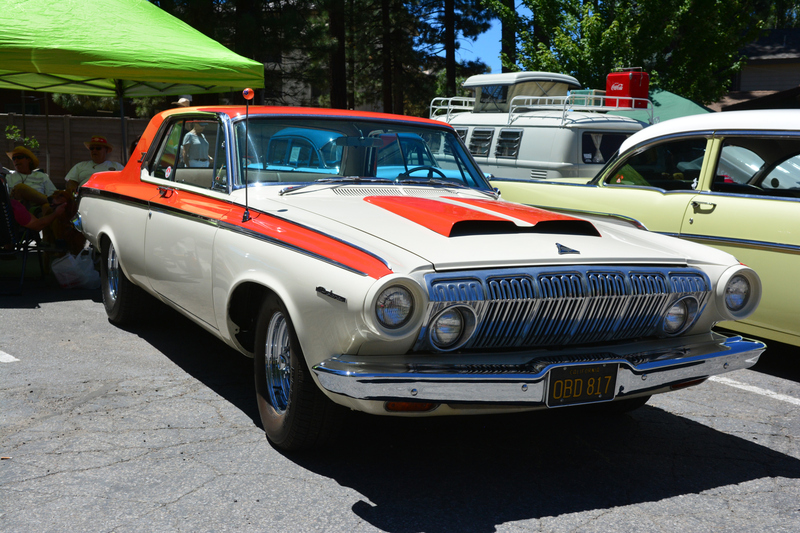 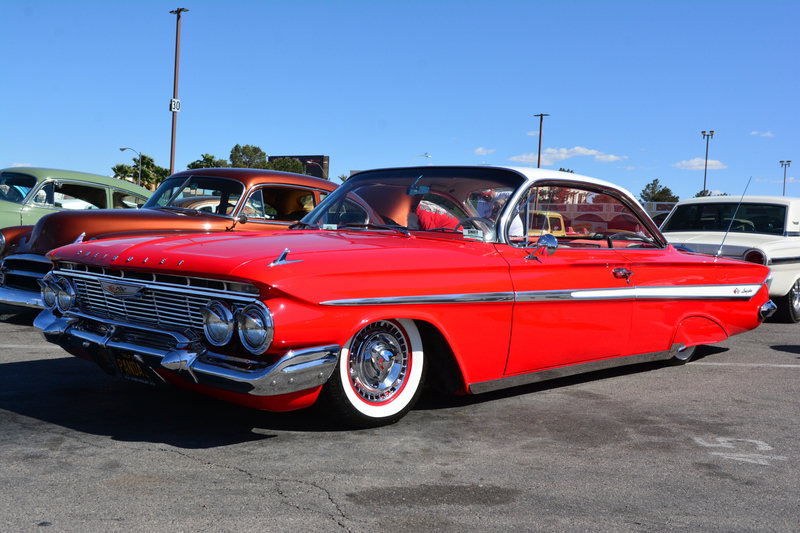 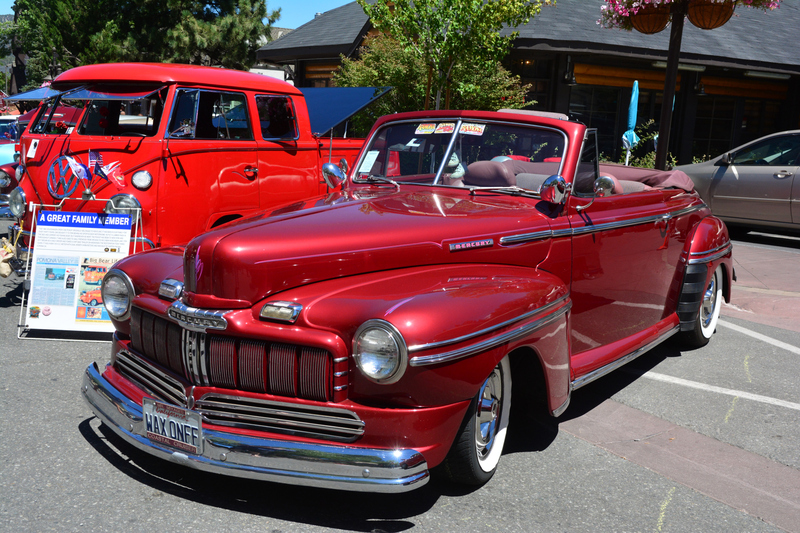 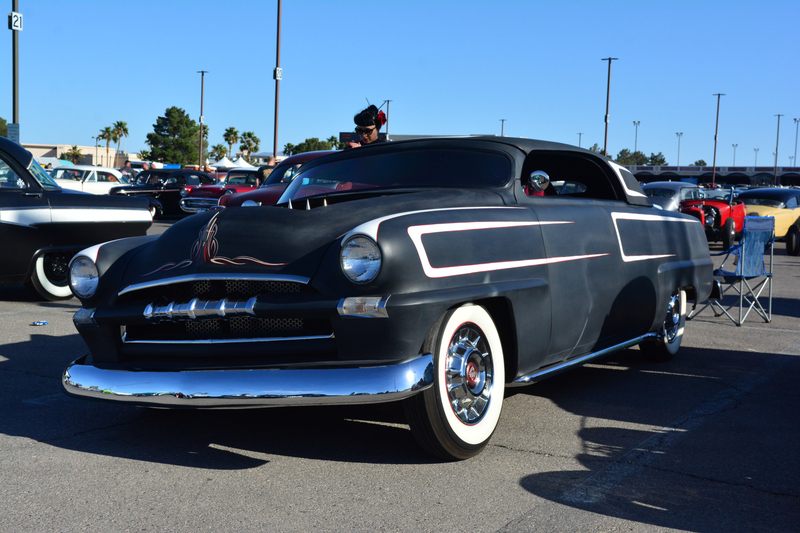 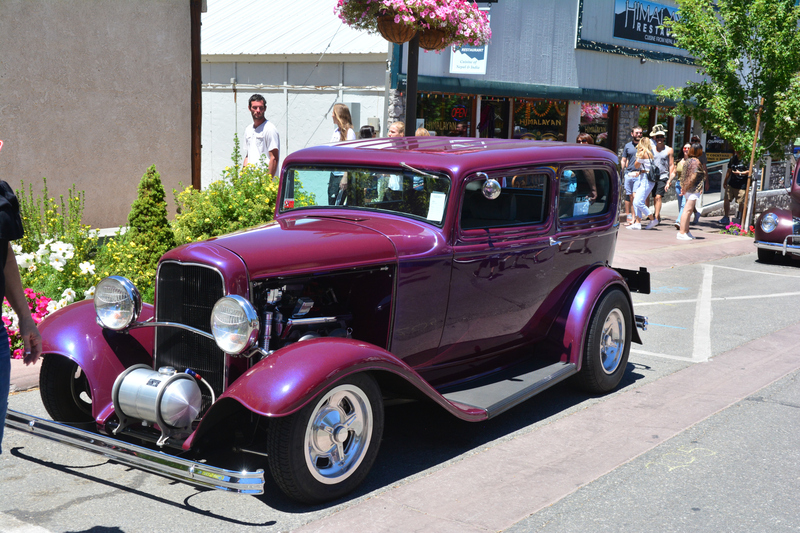 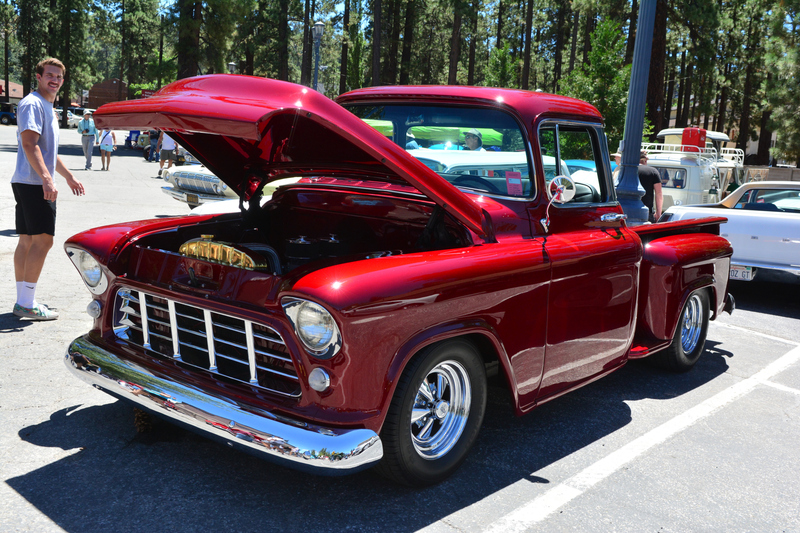 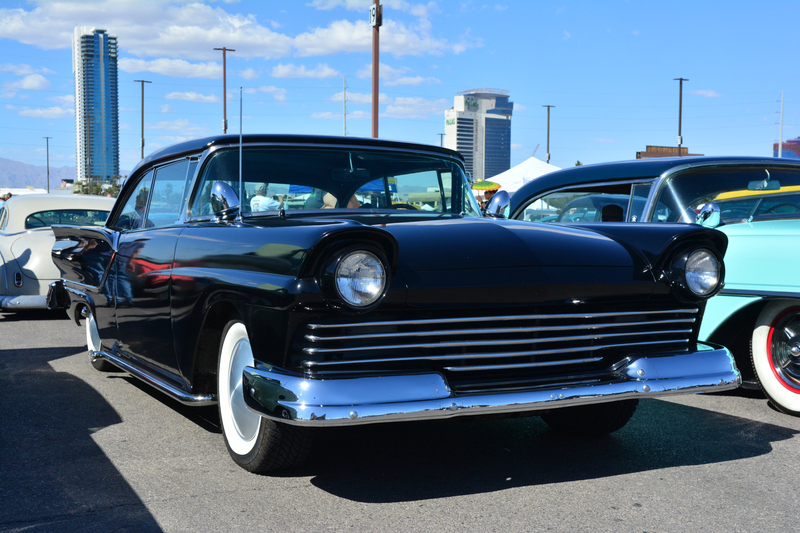 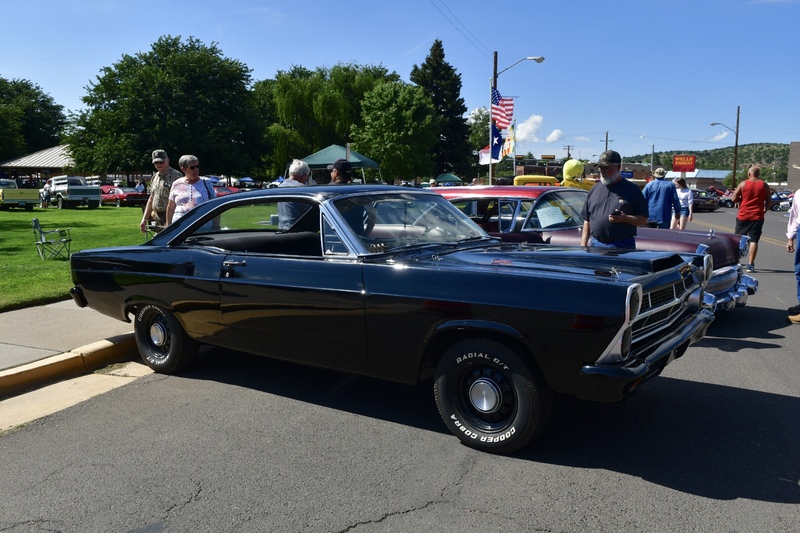 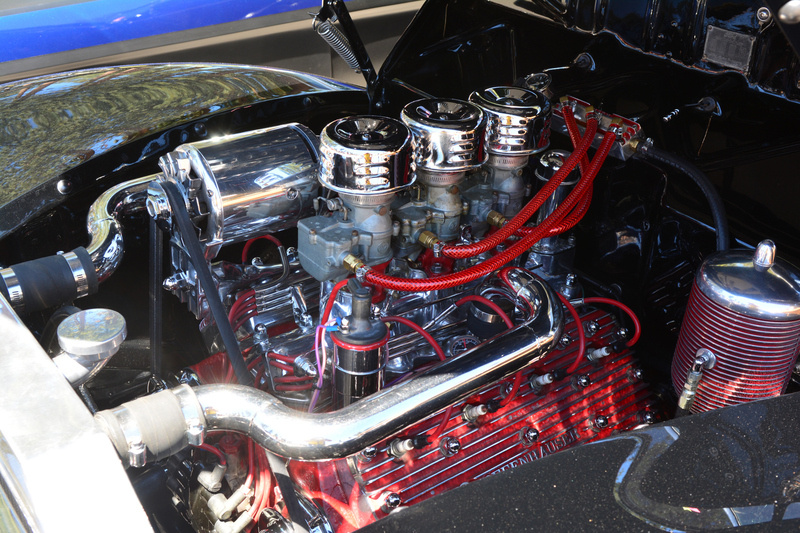 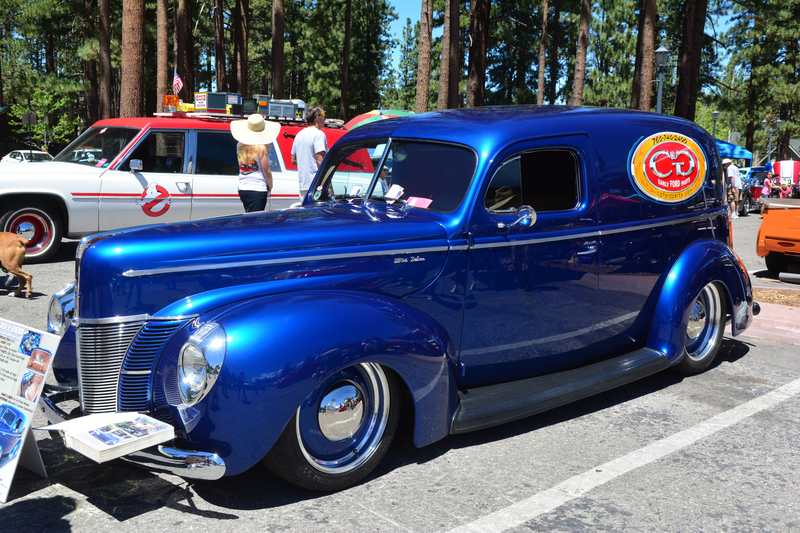 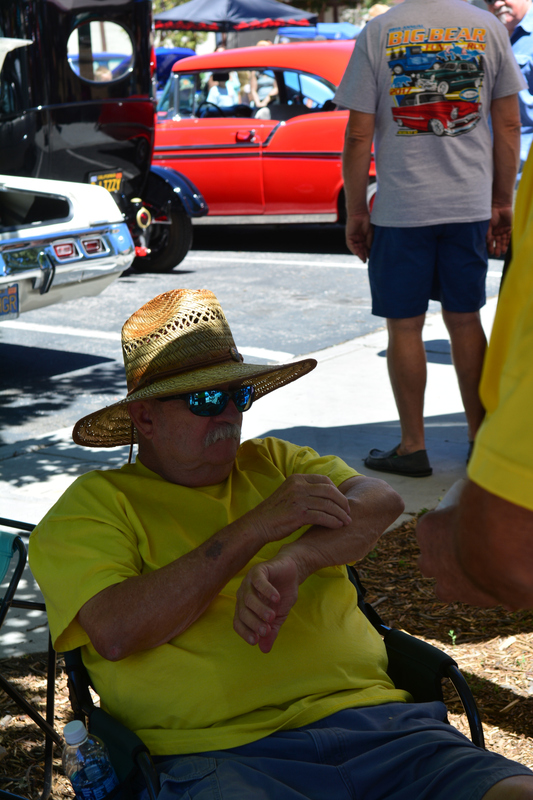 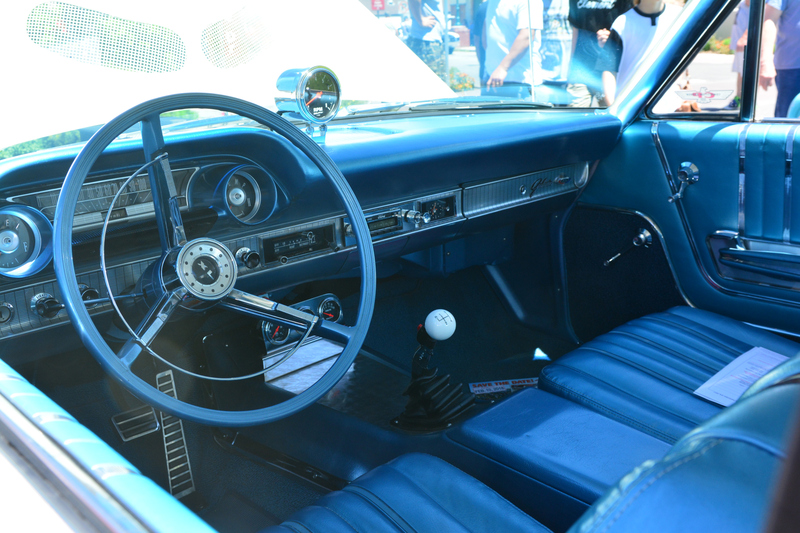 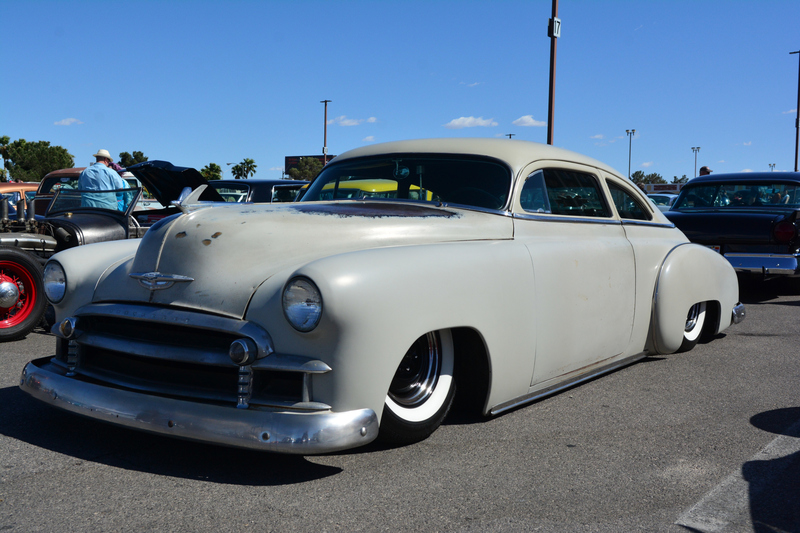 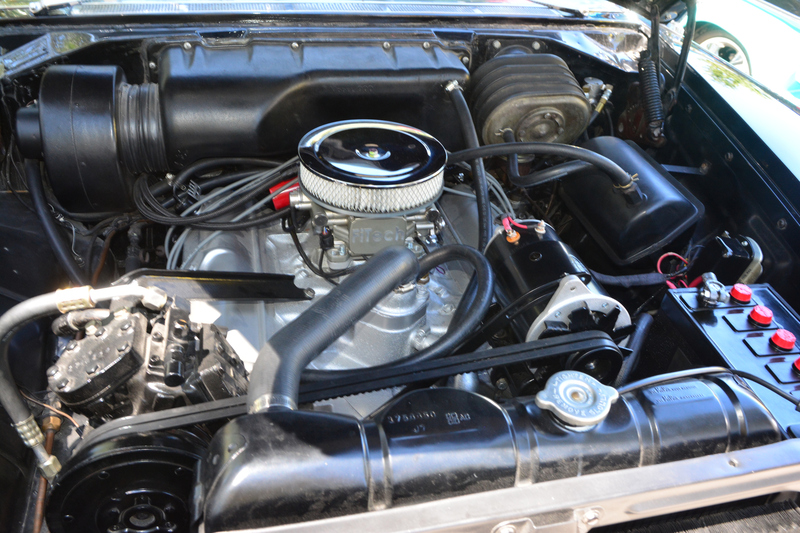 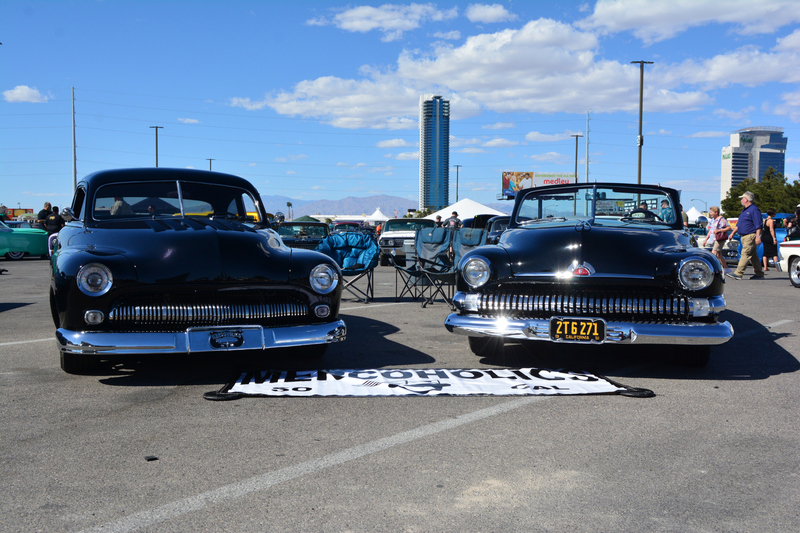 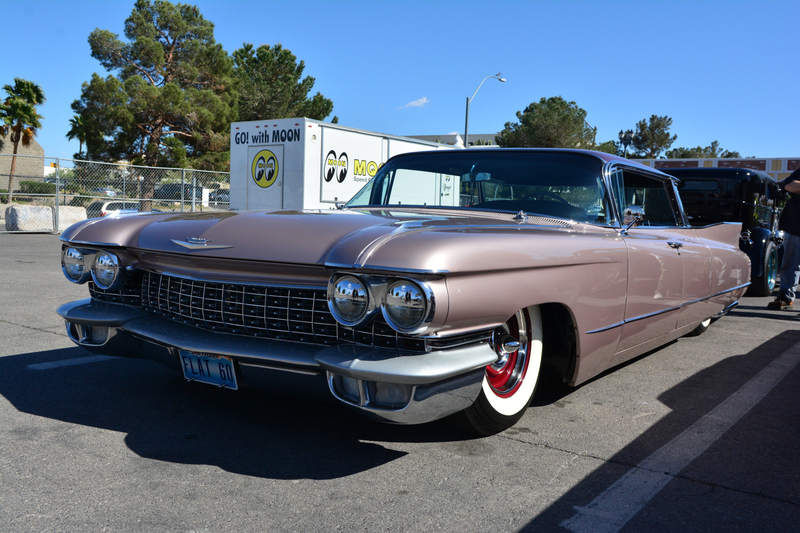 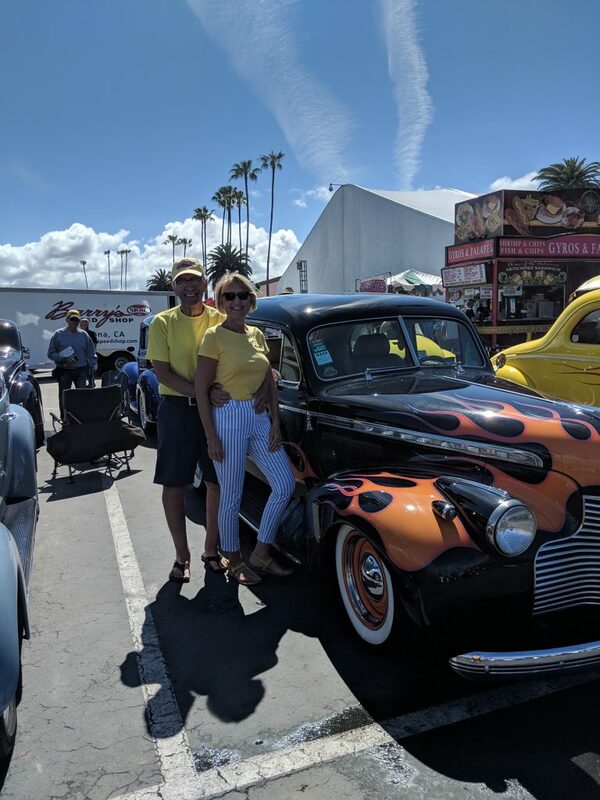 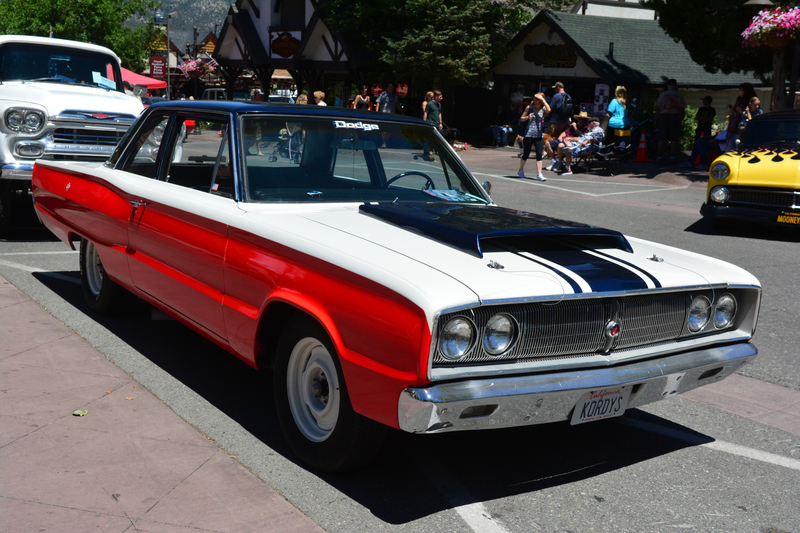 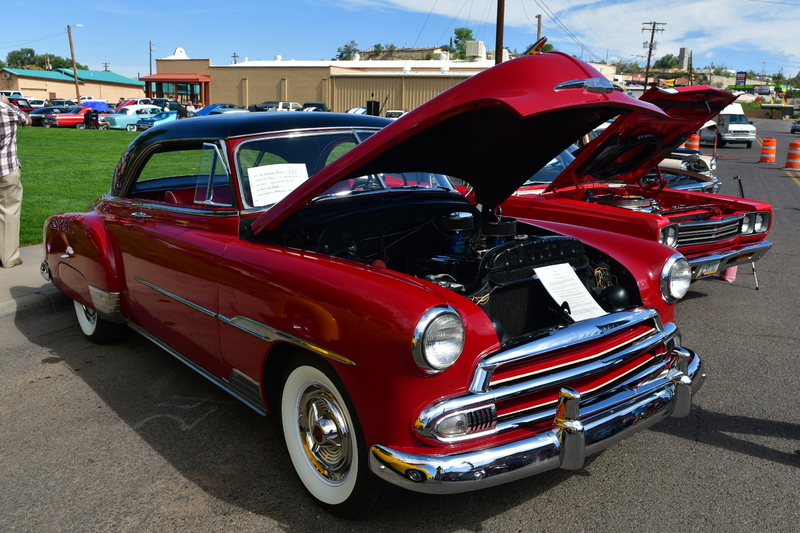 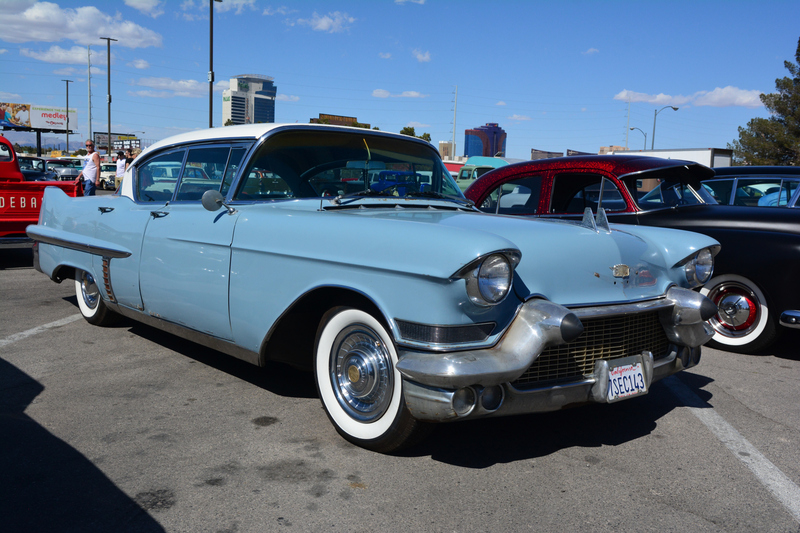 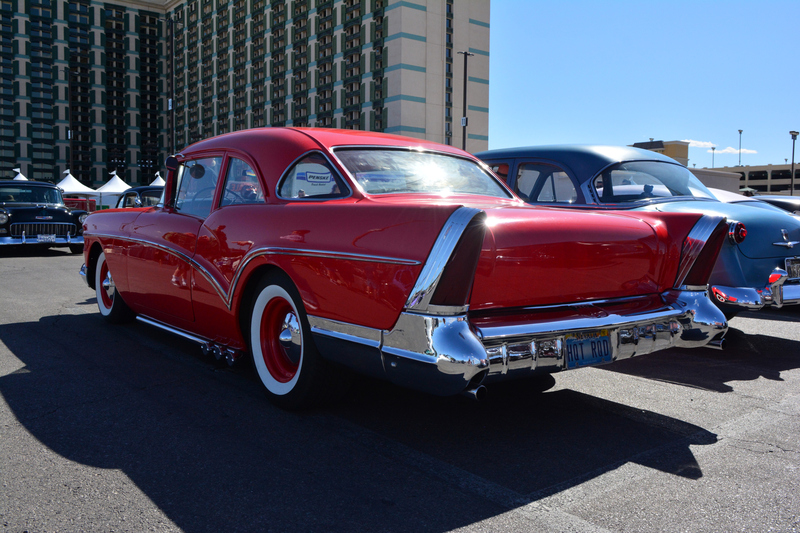 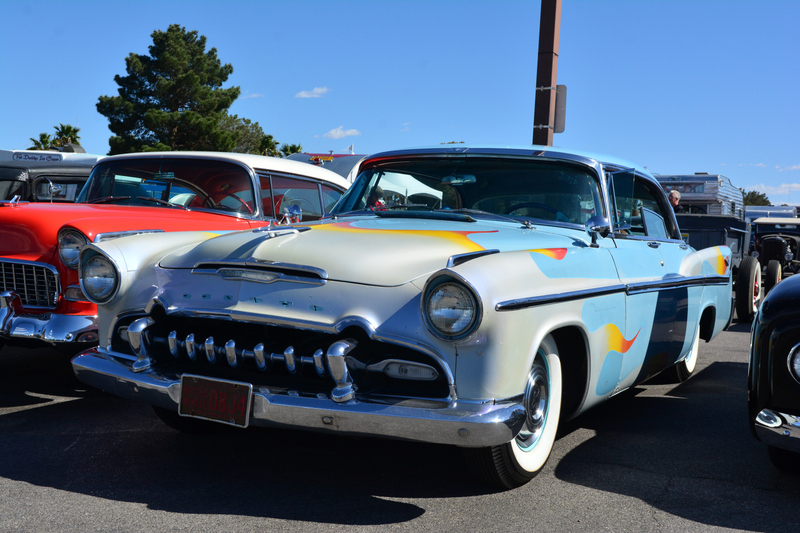 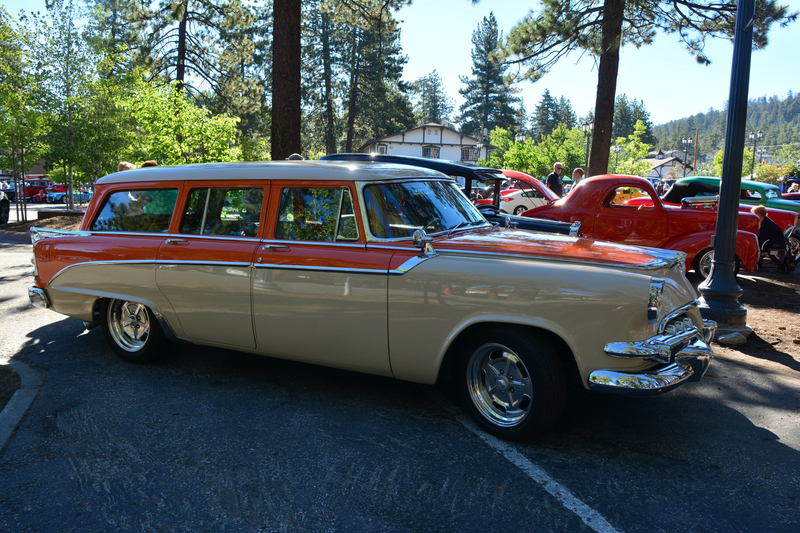 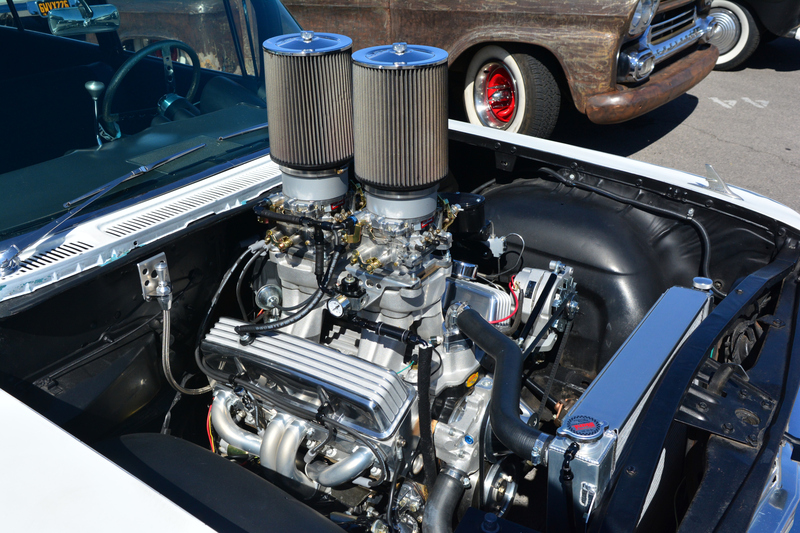 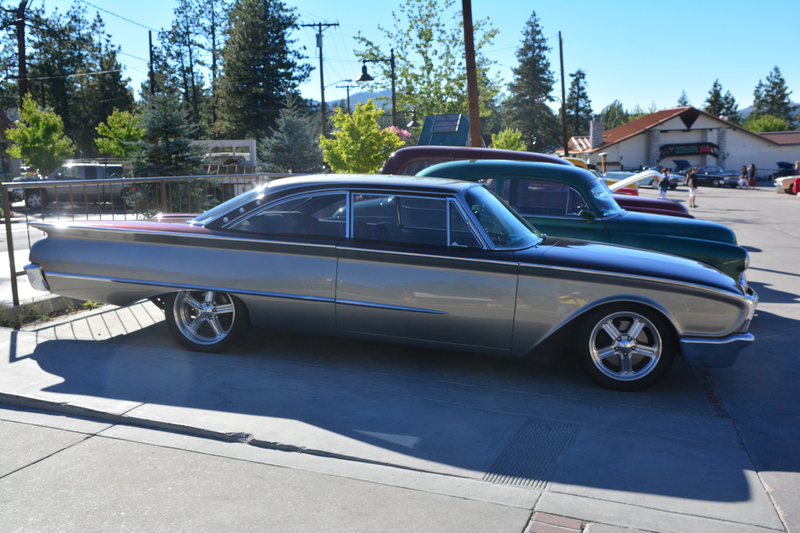 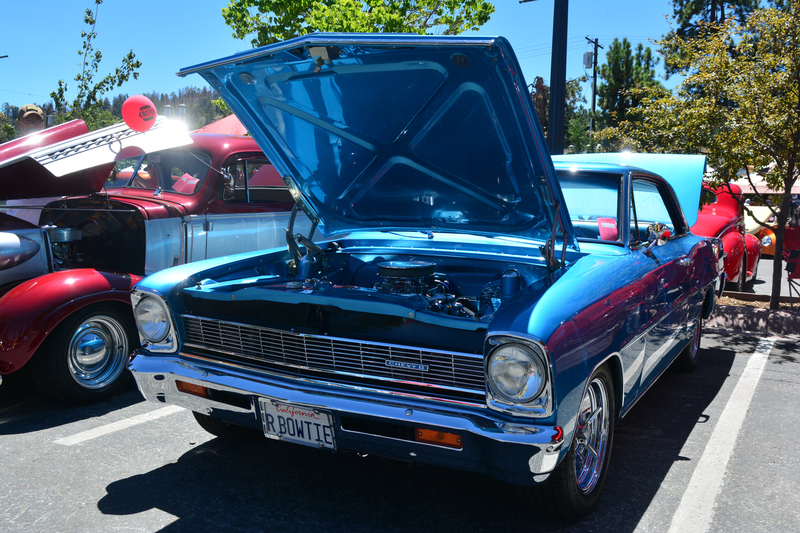 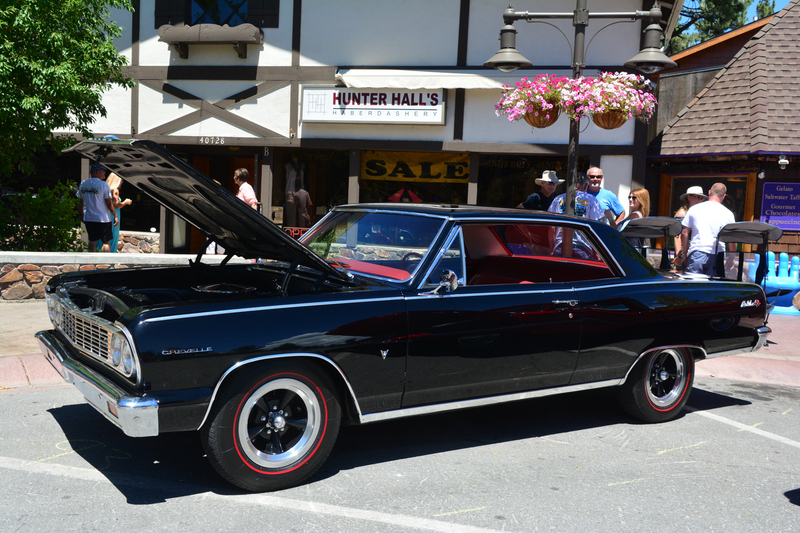 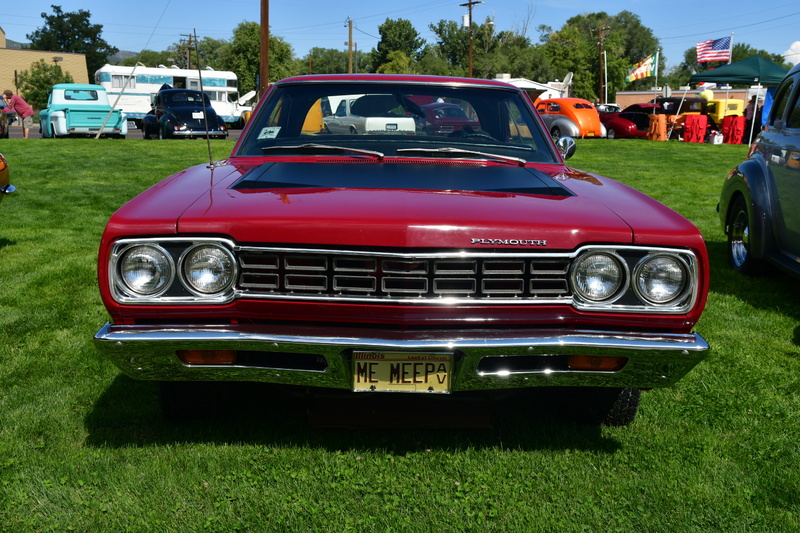 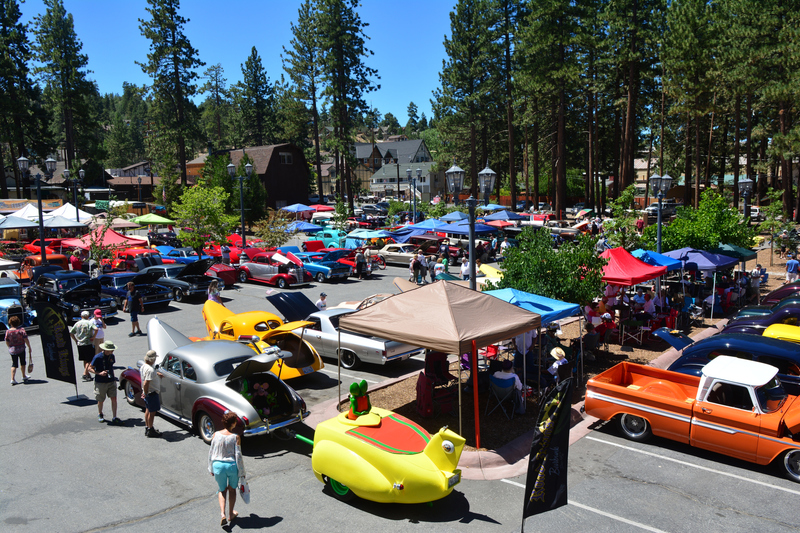 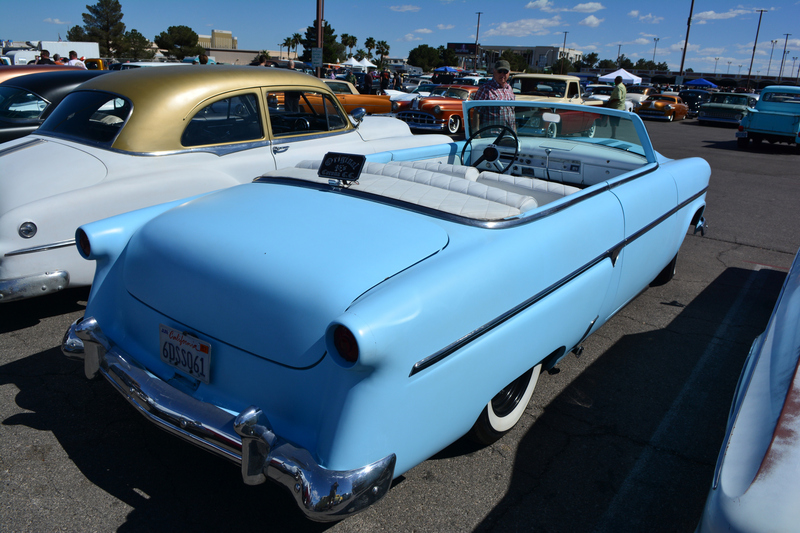 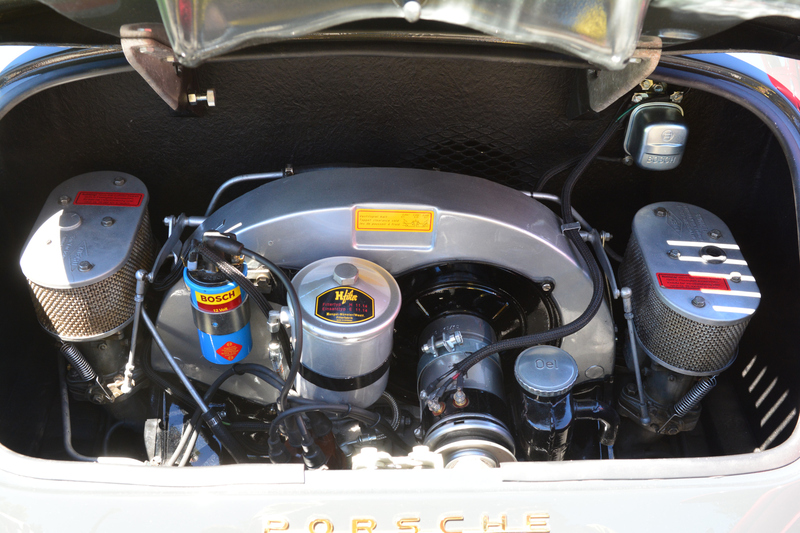 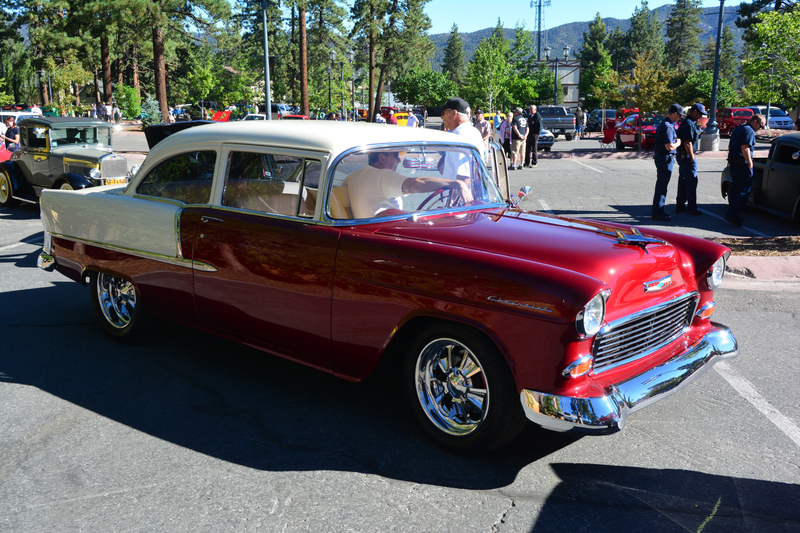 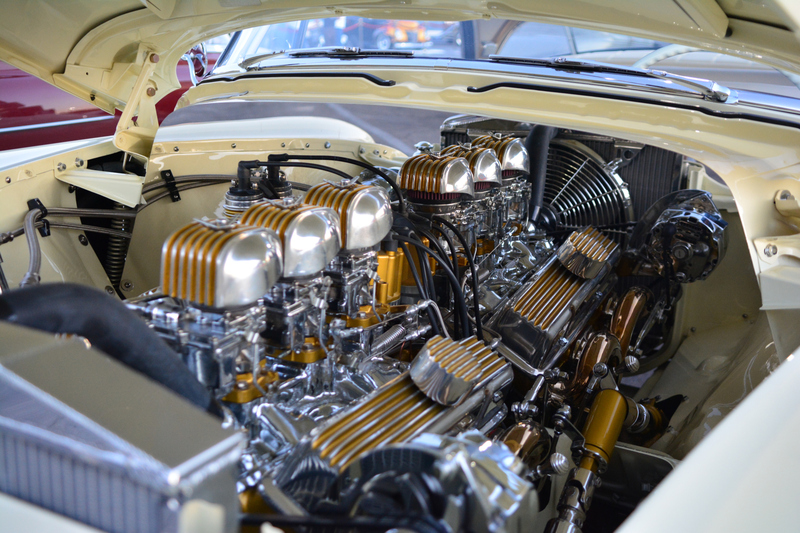 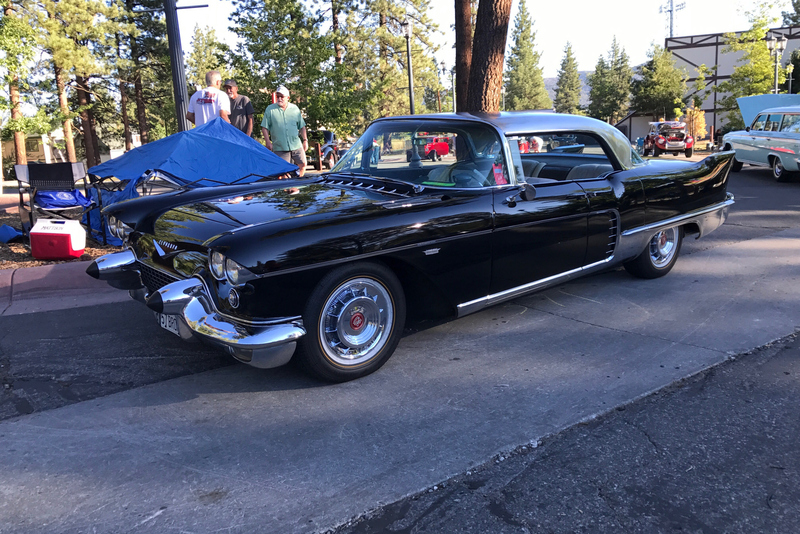 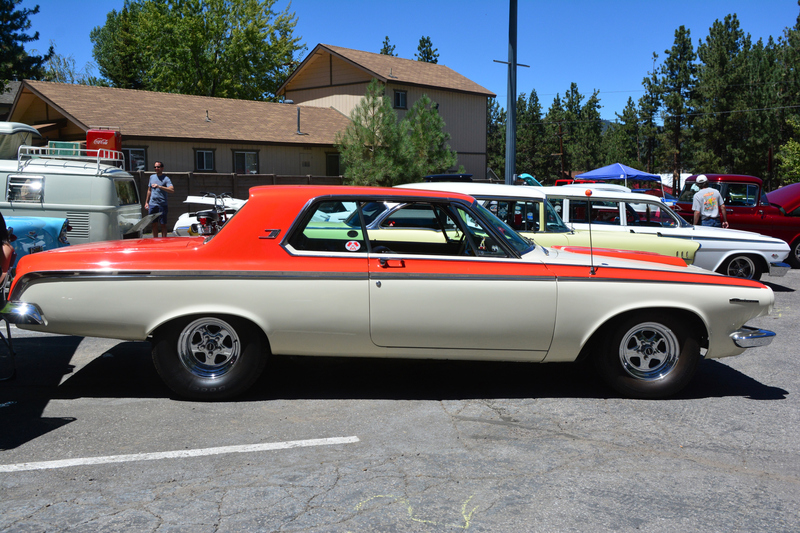 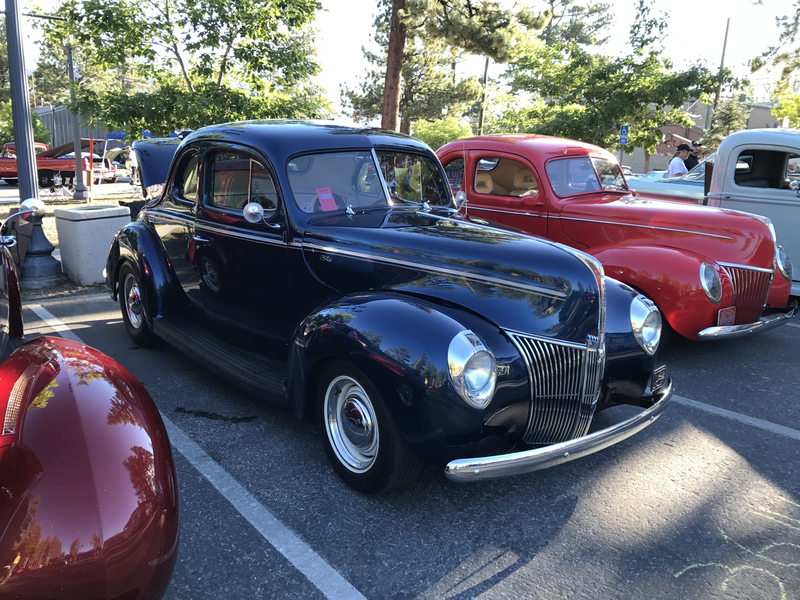 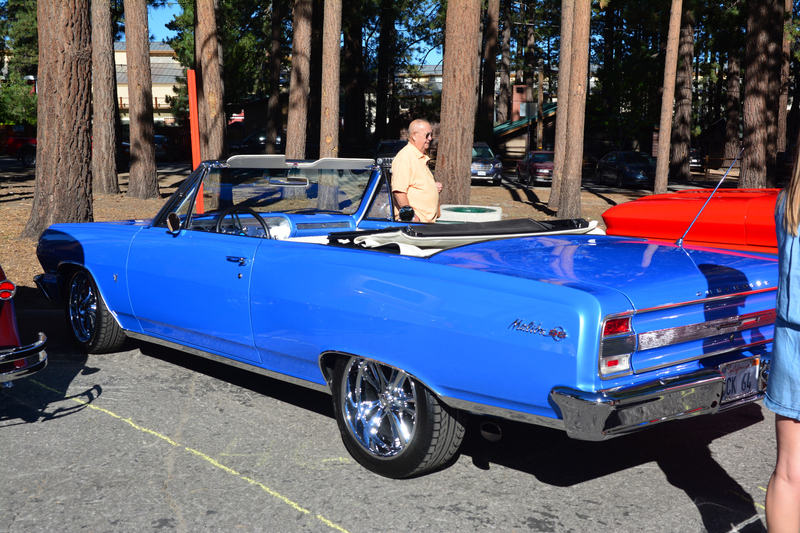 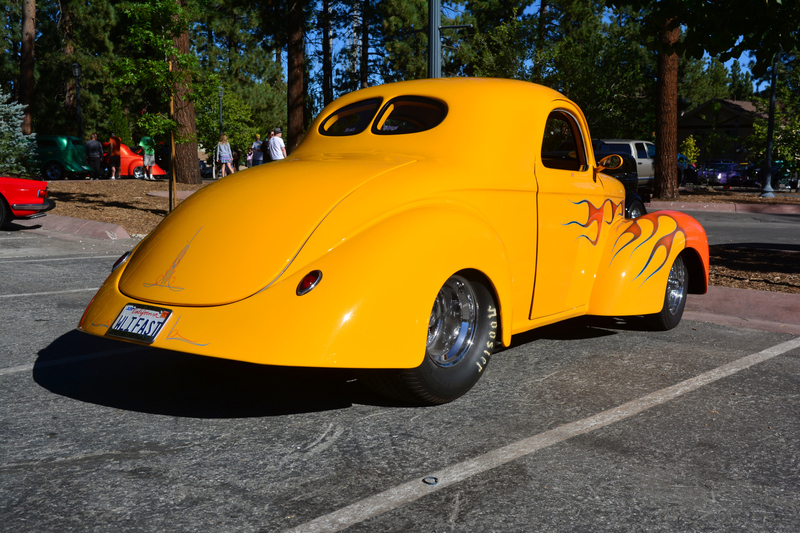 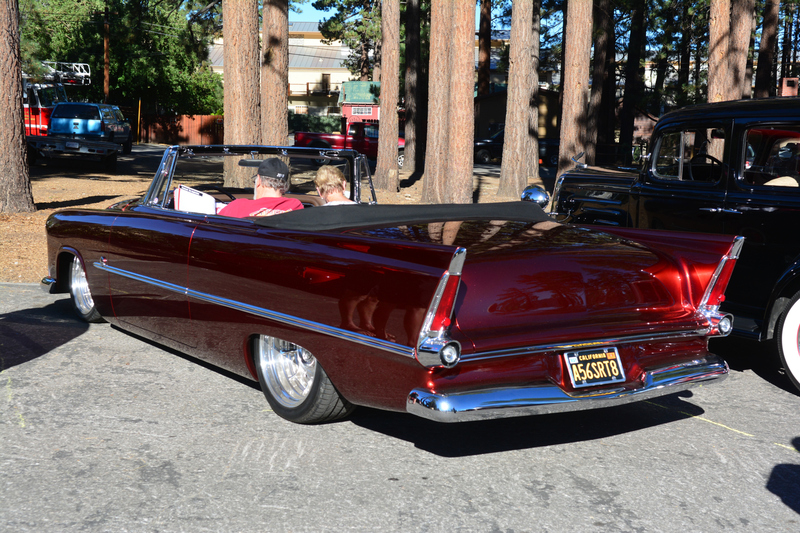 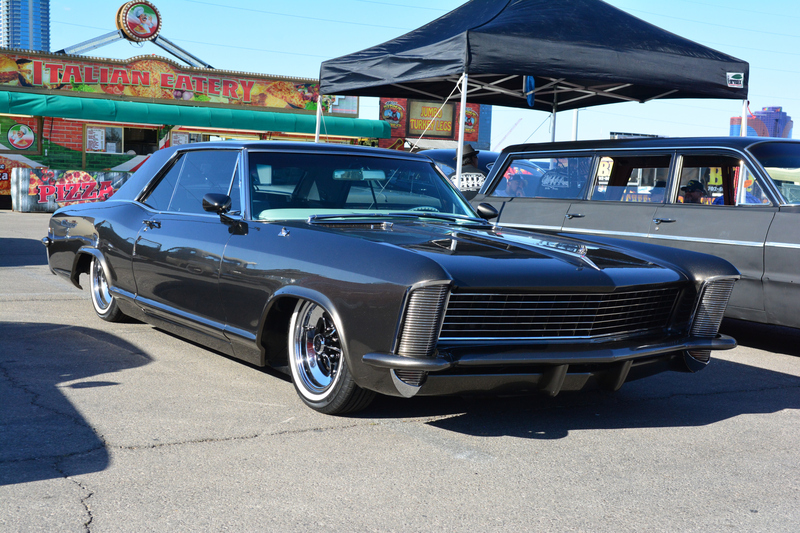 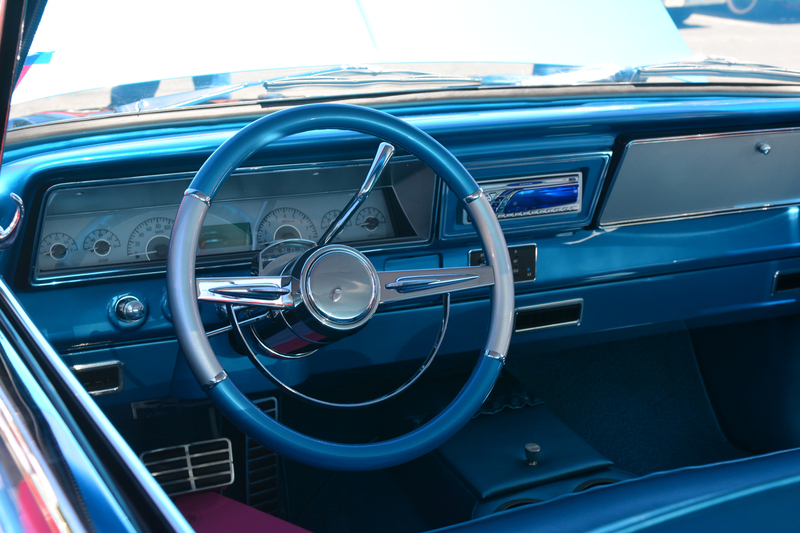 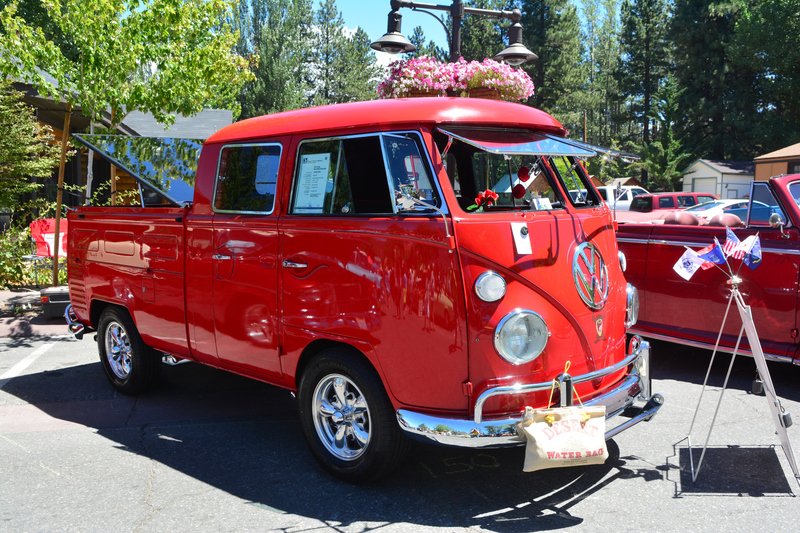 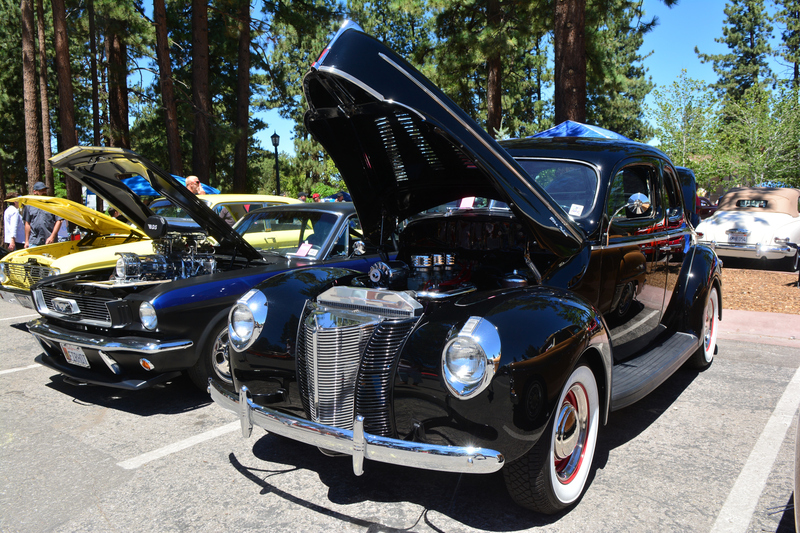 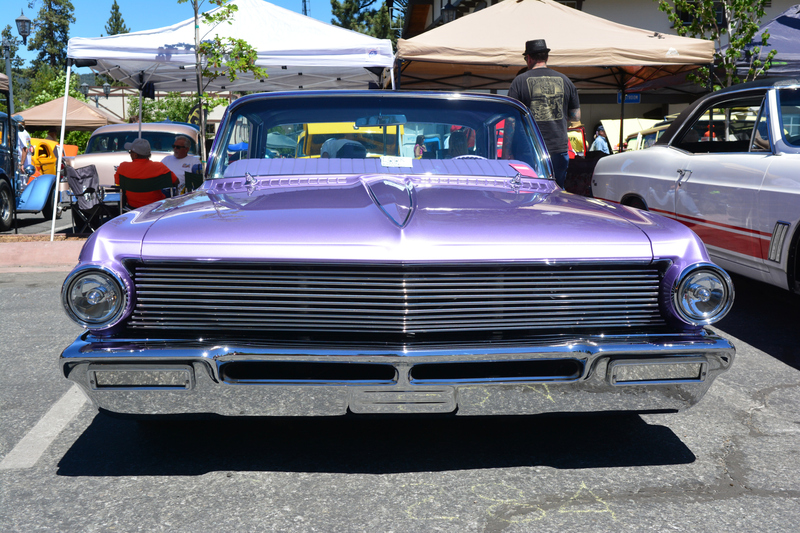 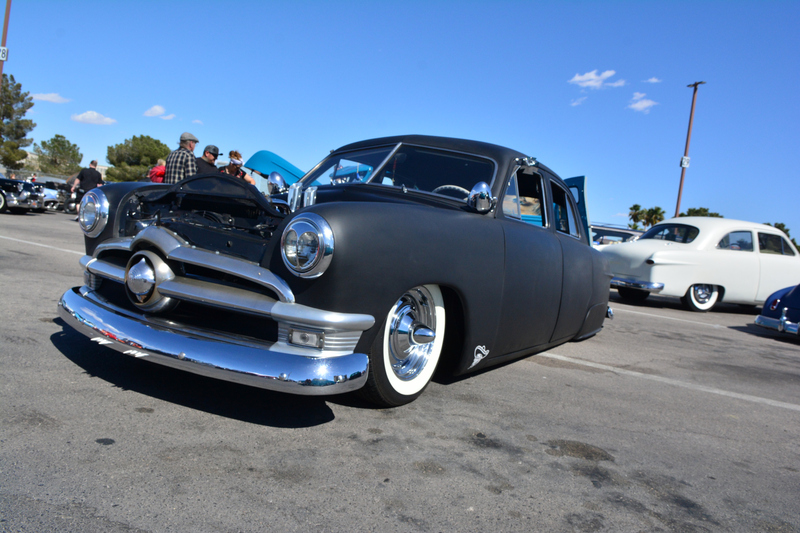 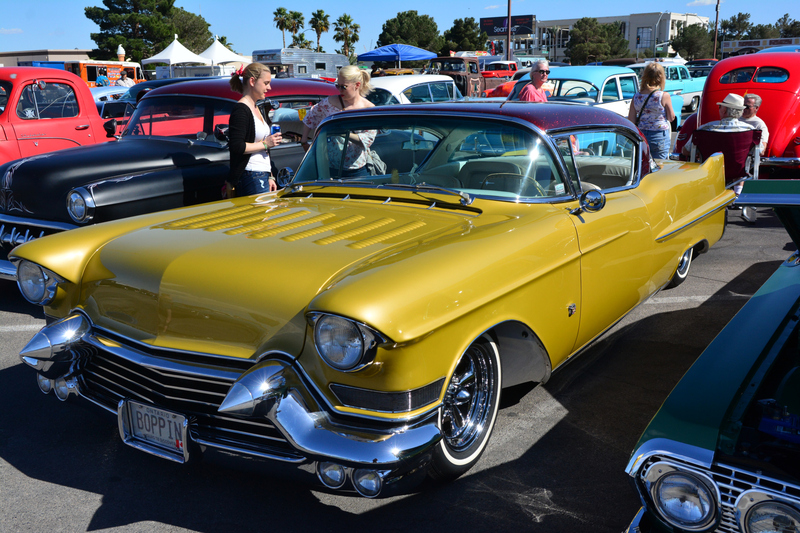 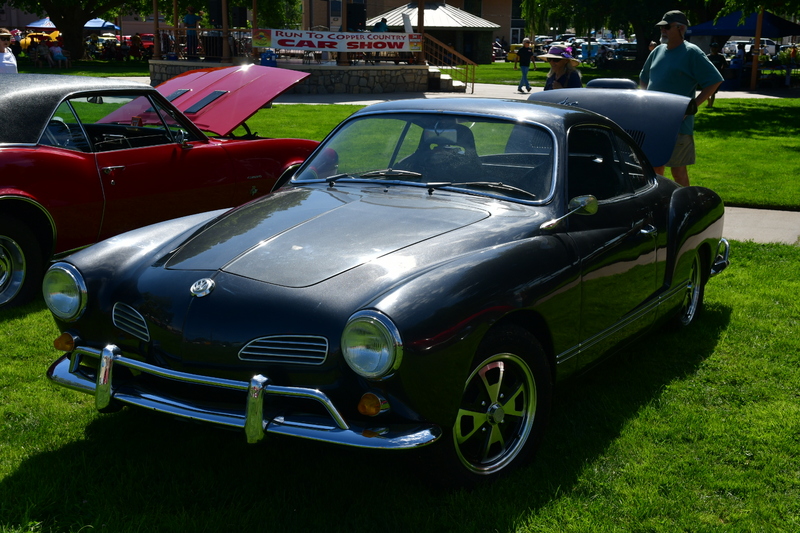 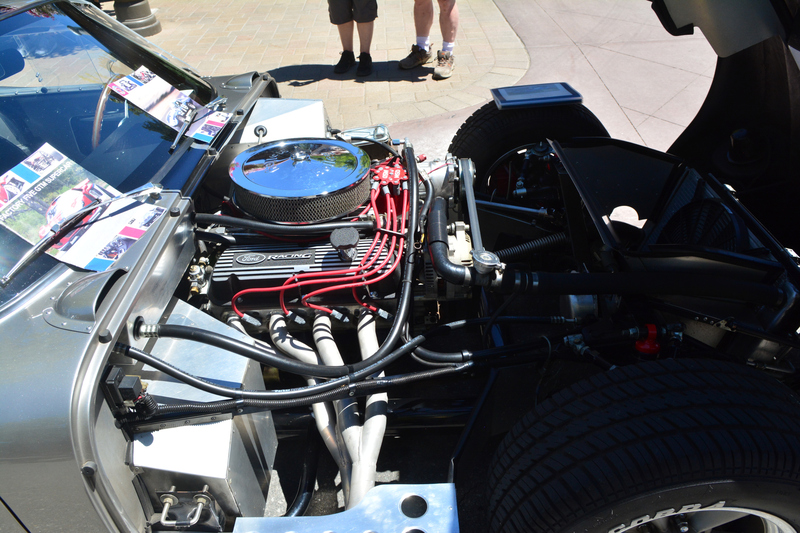 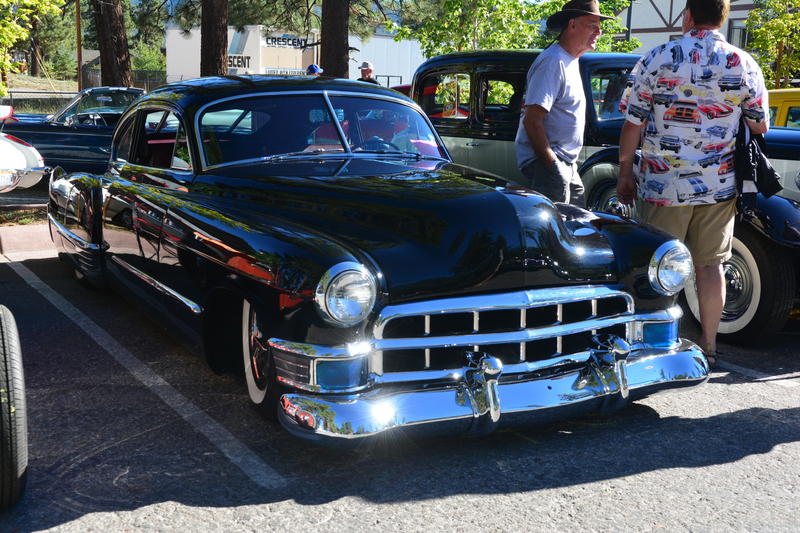 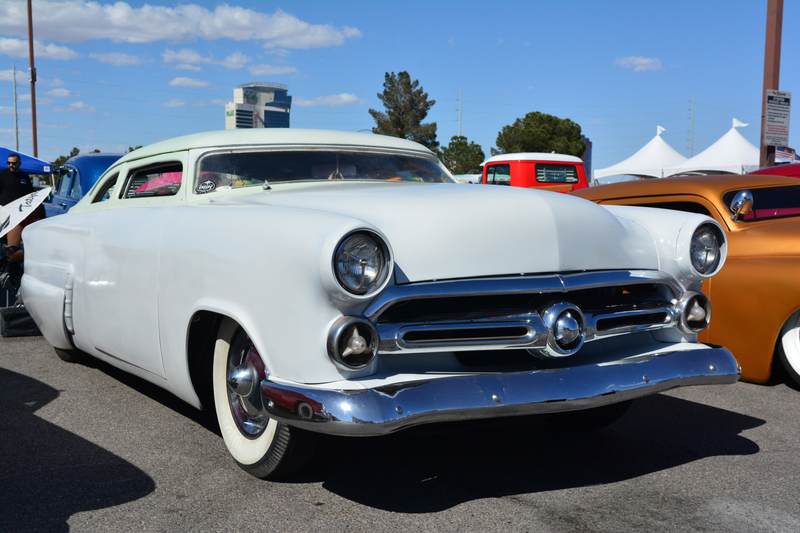 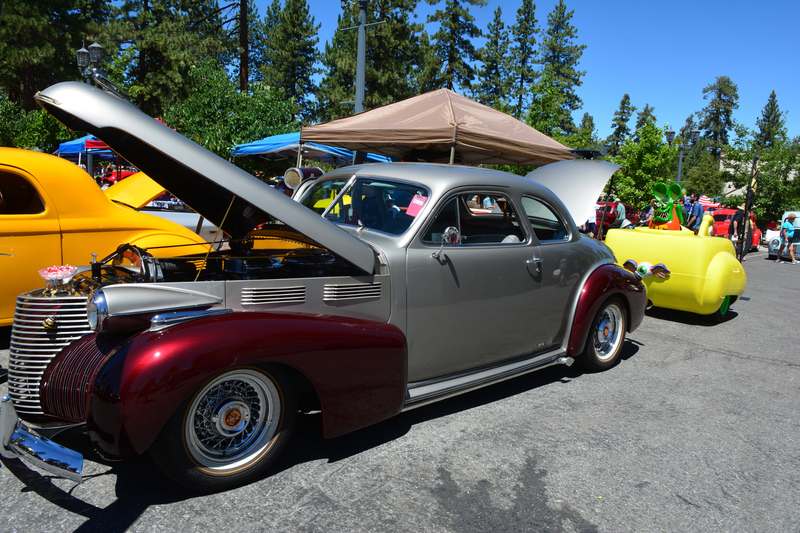 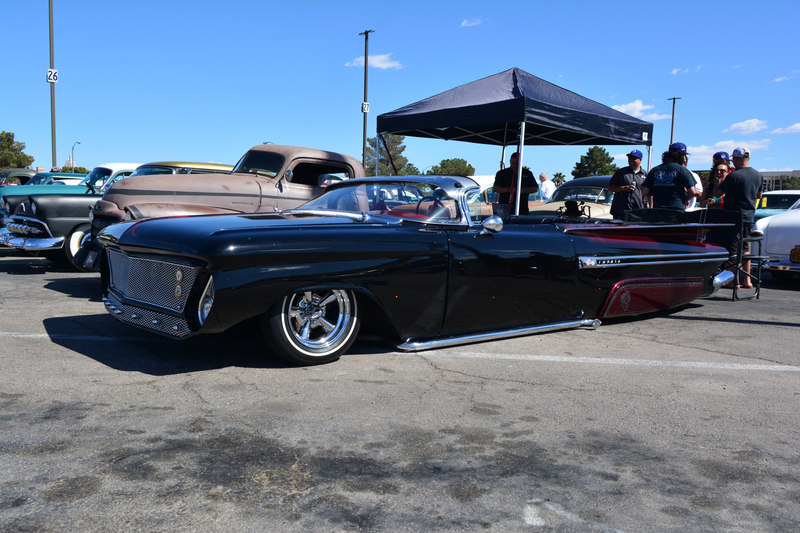 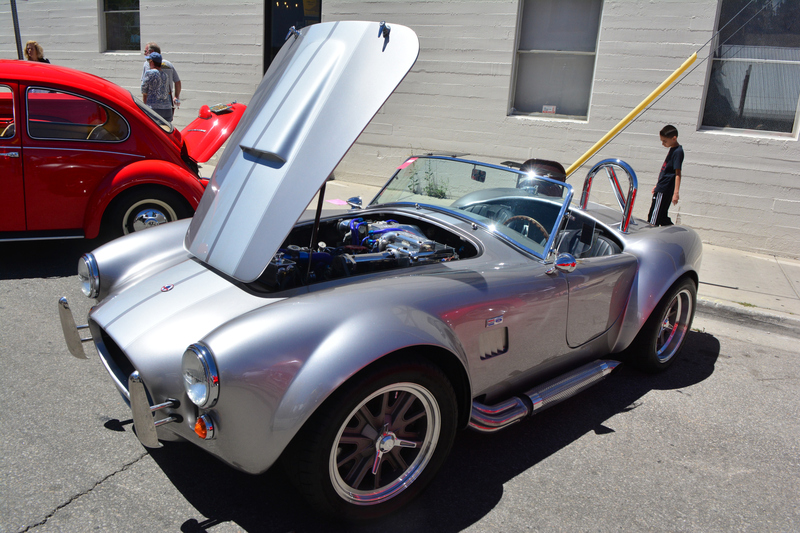 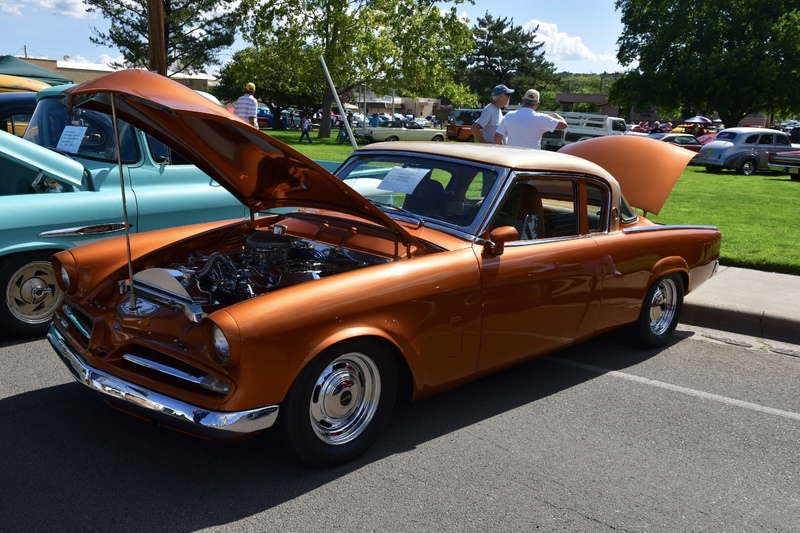 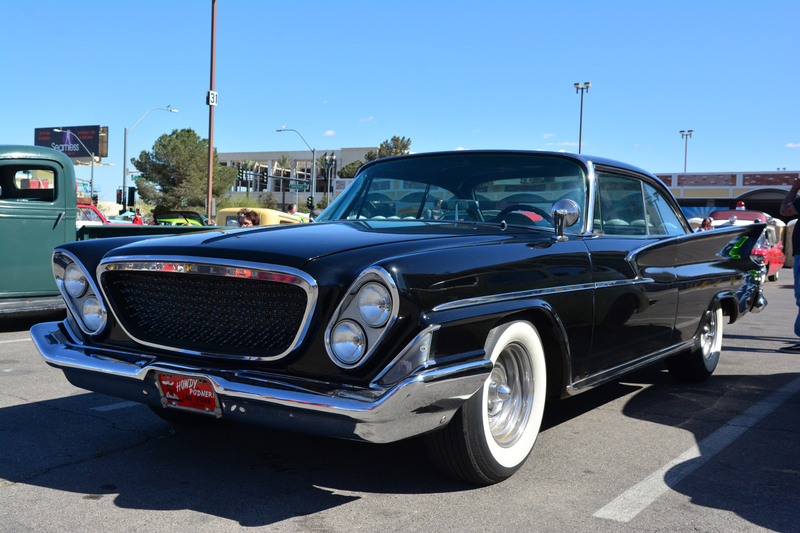 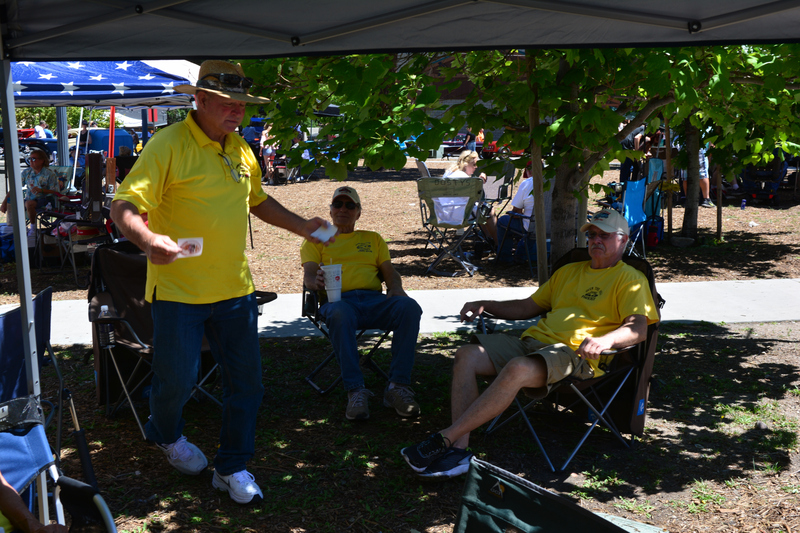 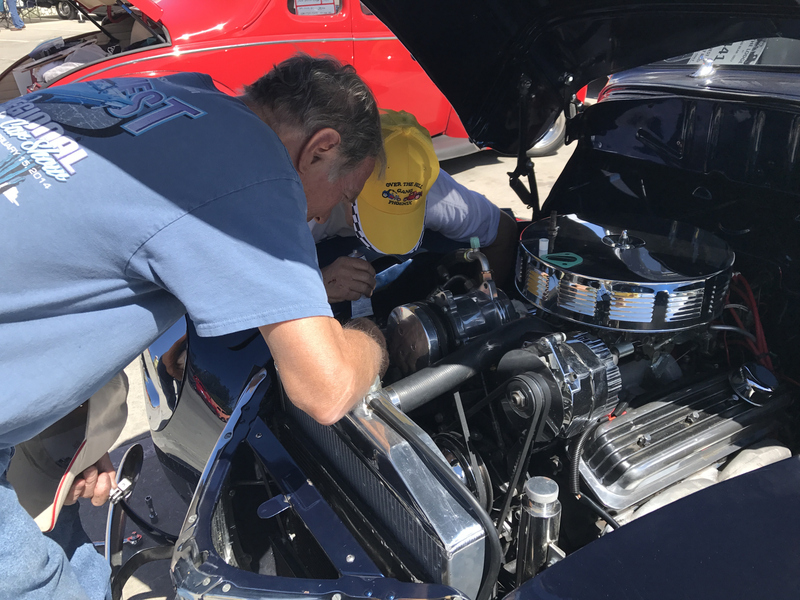 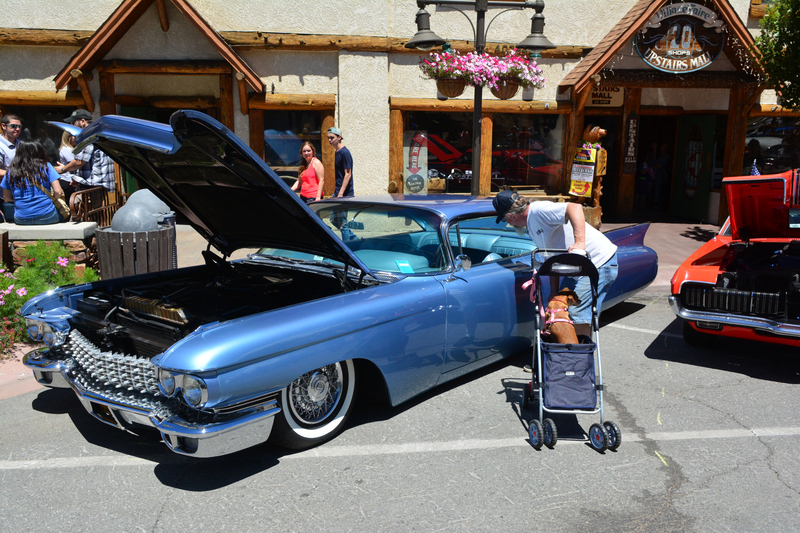 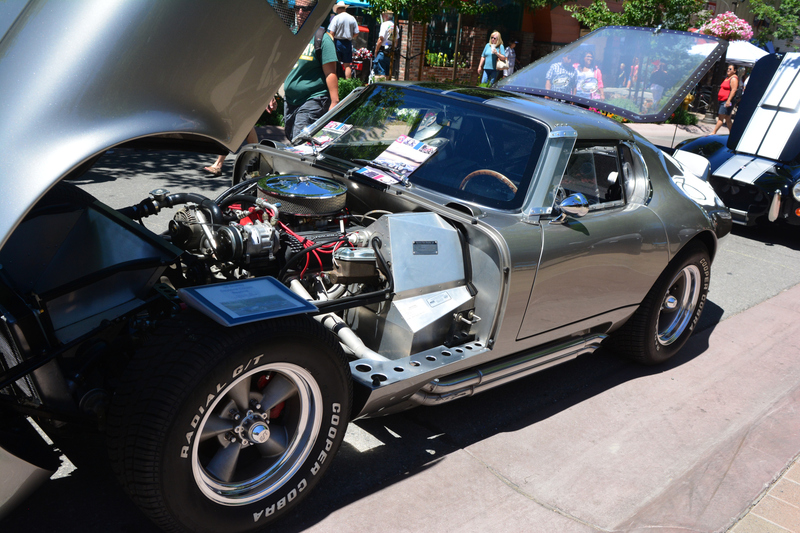 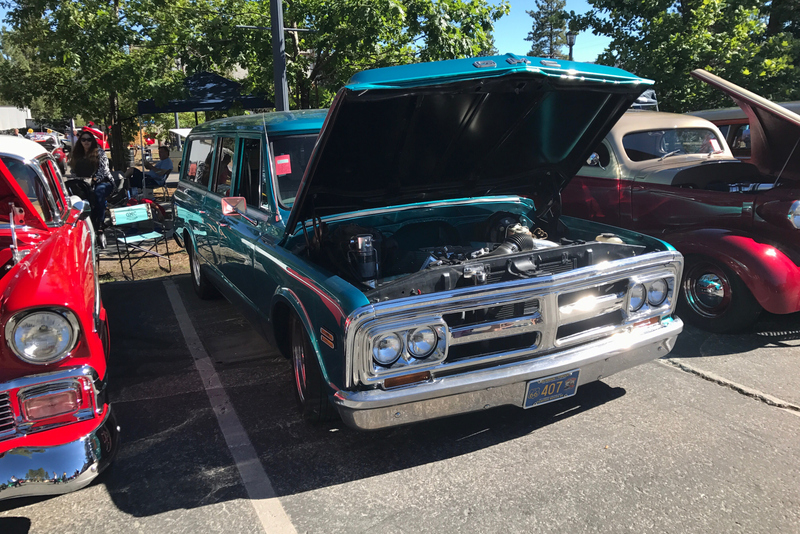 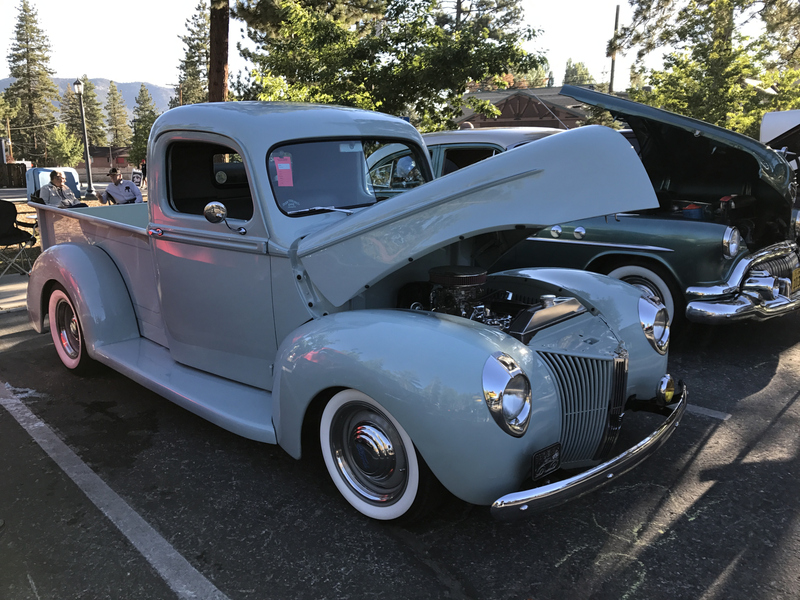 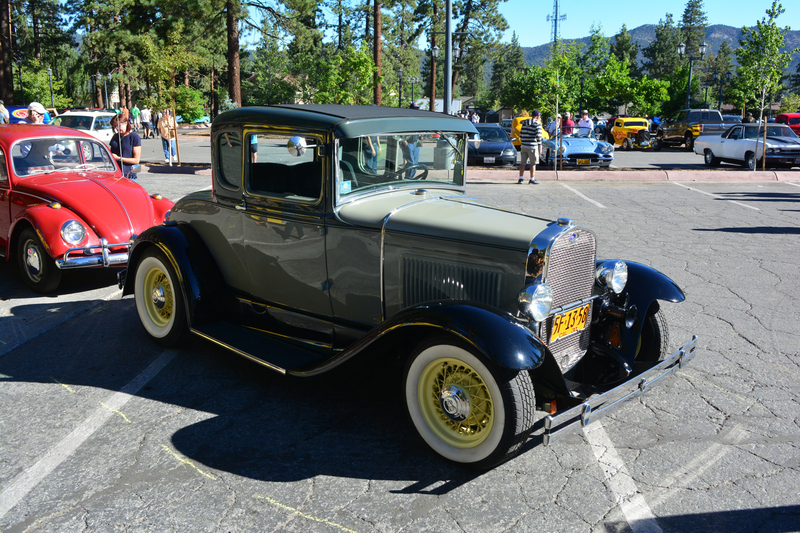 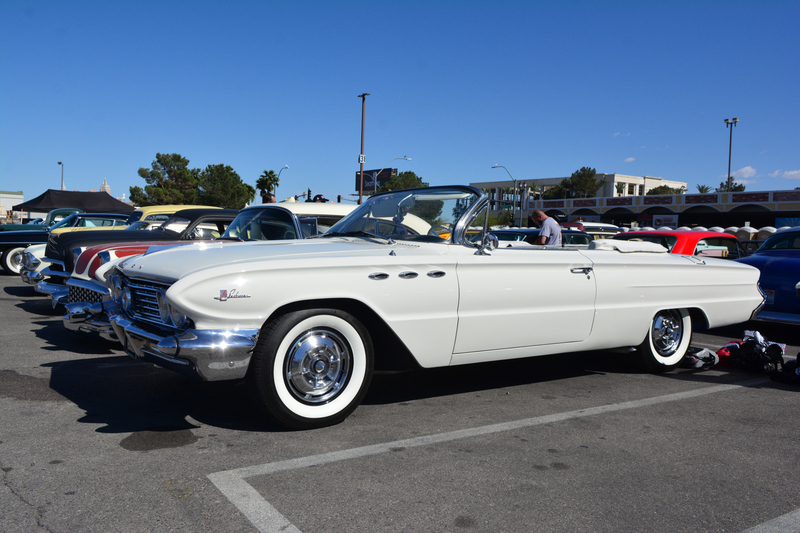 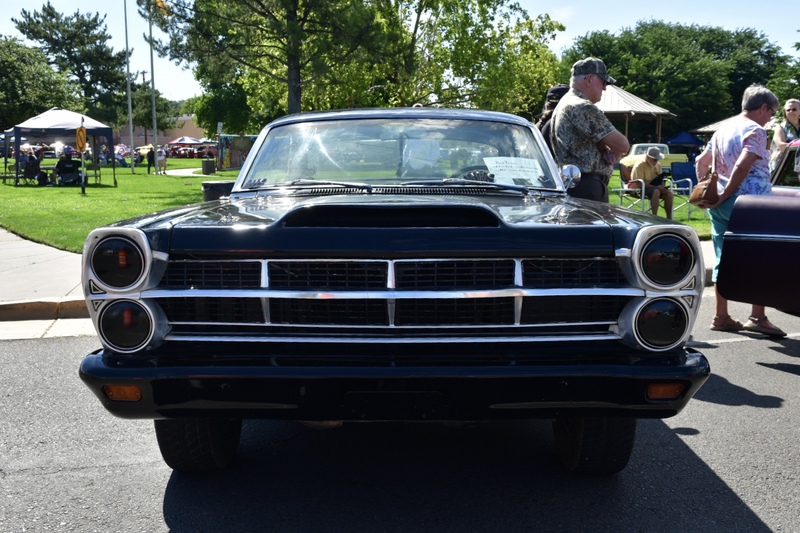 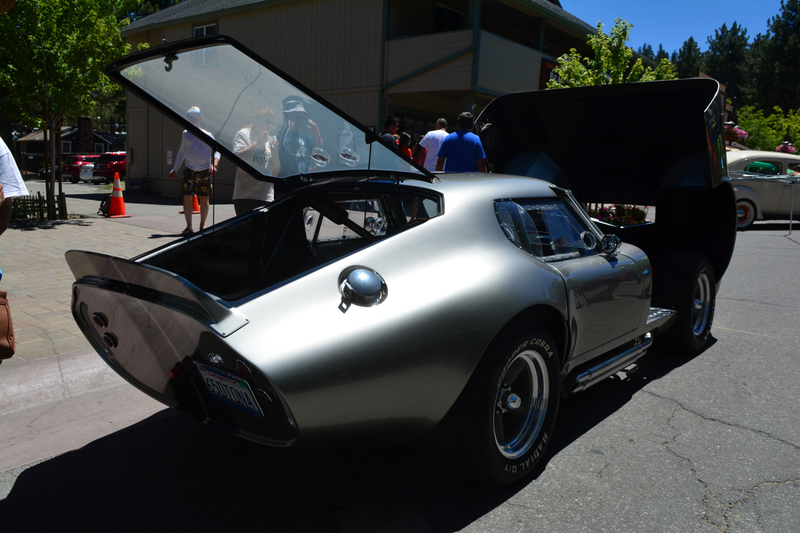 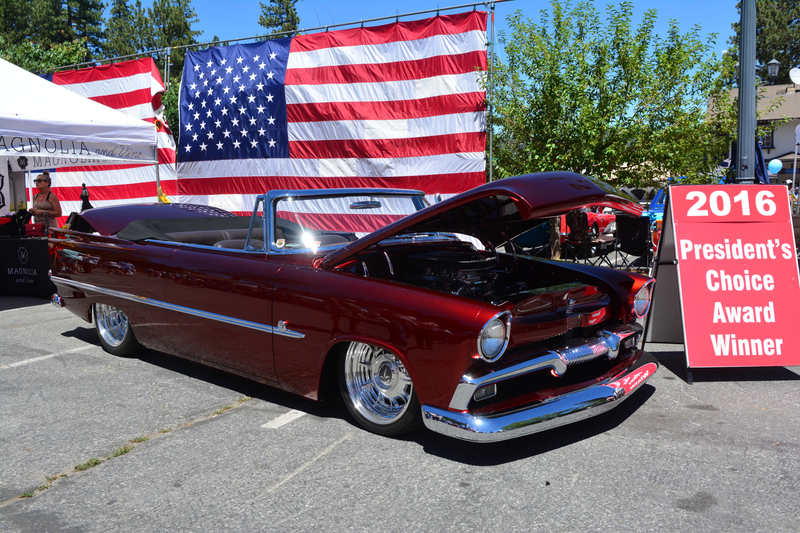 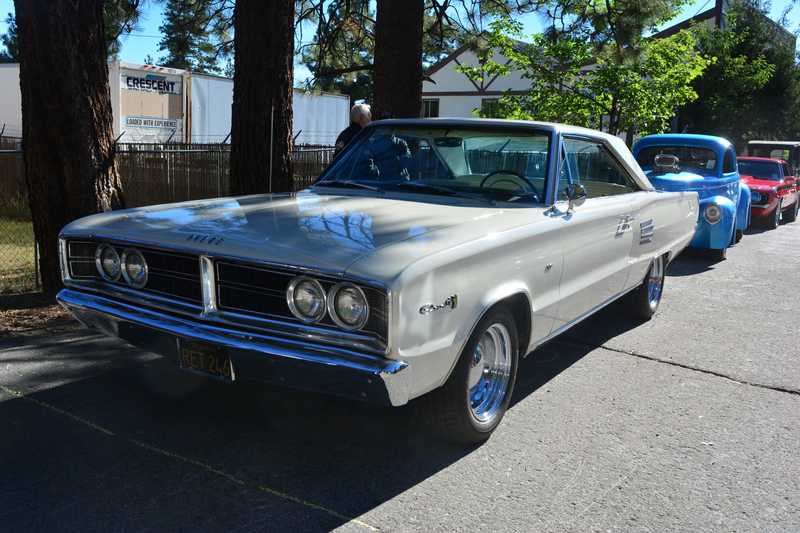 I think I heard that there were over 300 cars on the grounds with a wide variety of types and styles from hot rods, to customs, street rods, stock, modified, trucks and they even had a half dozen Tuners. 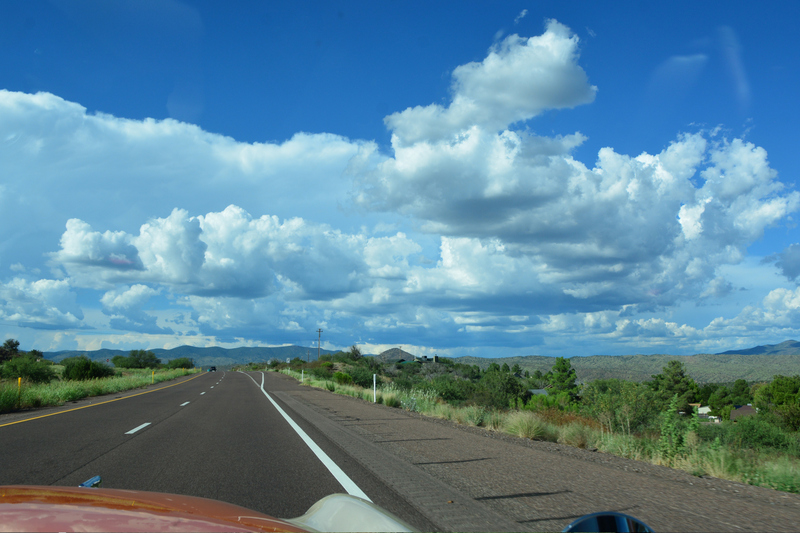 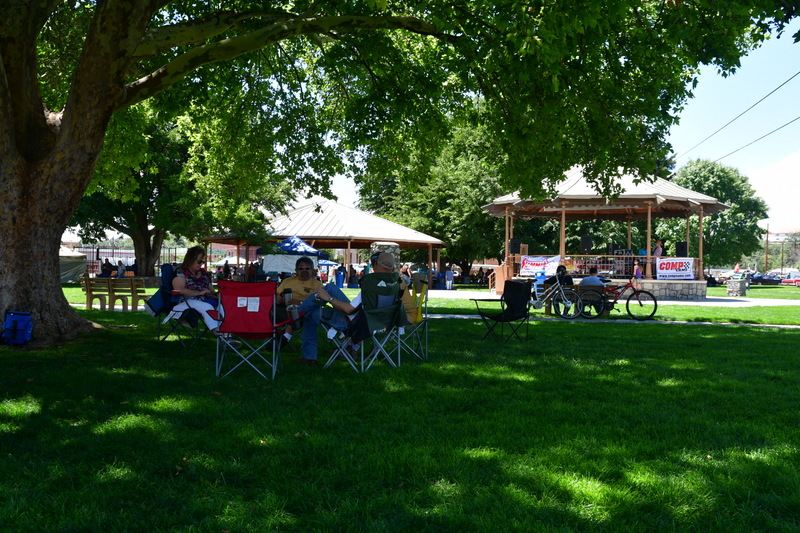 The weather was what you would expect up on the high plains in the spring. 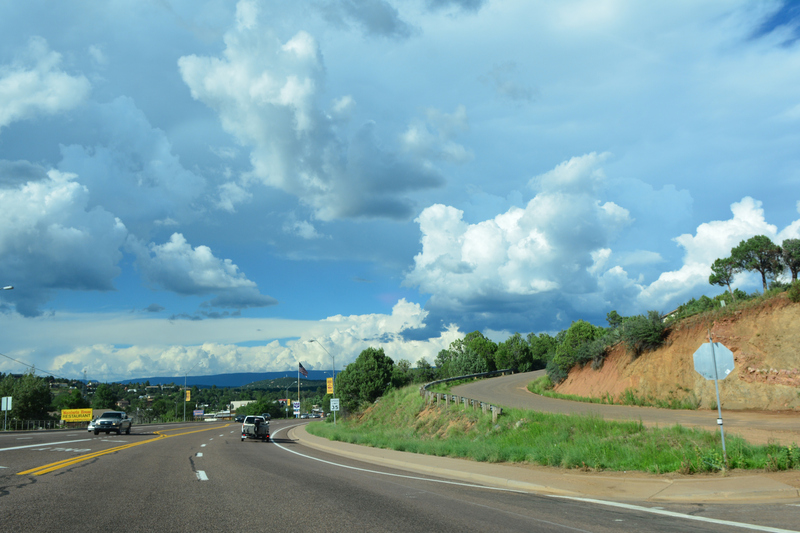 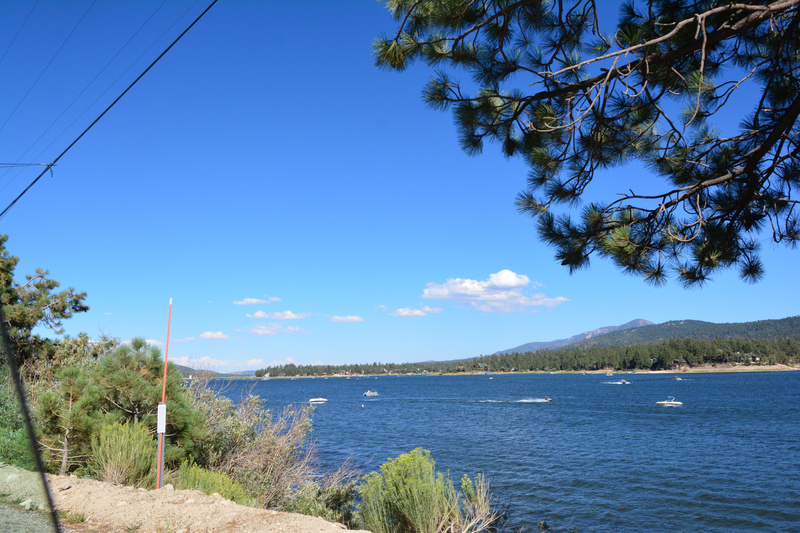 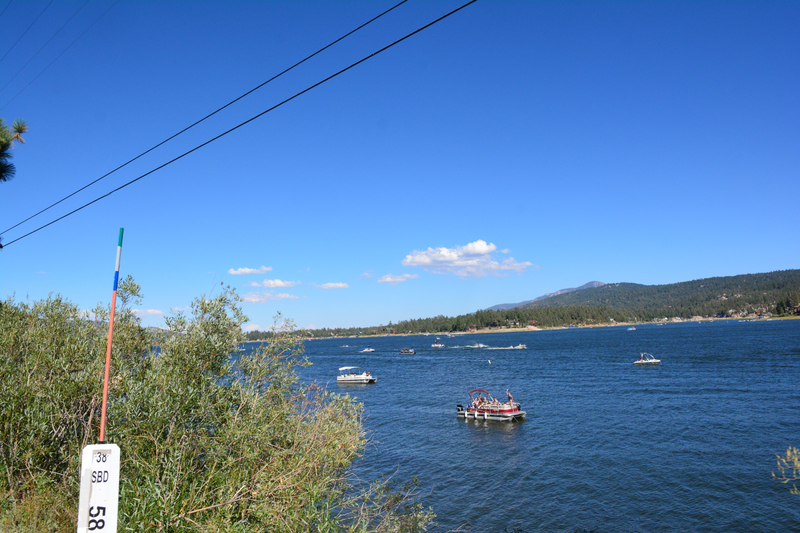 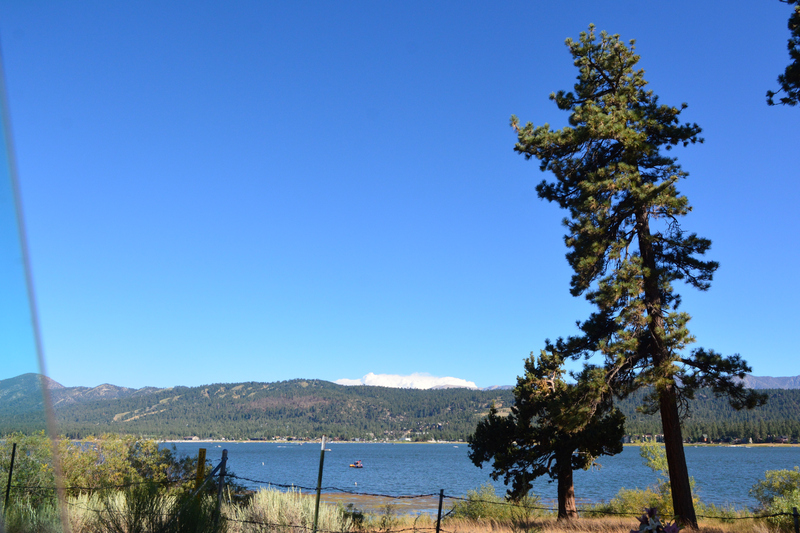 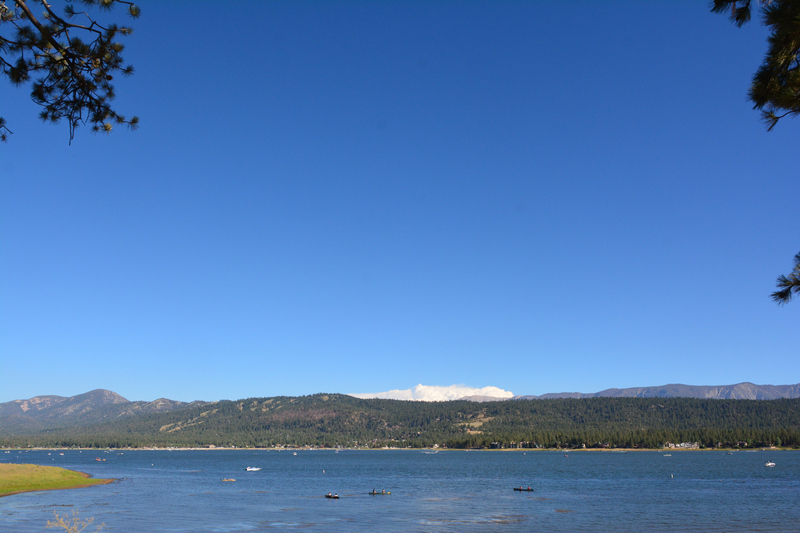 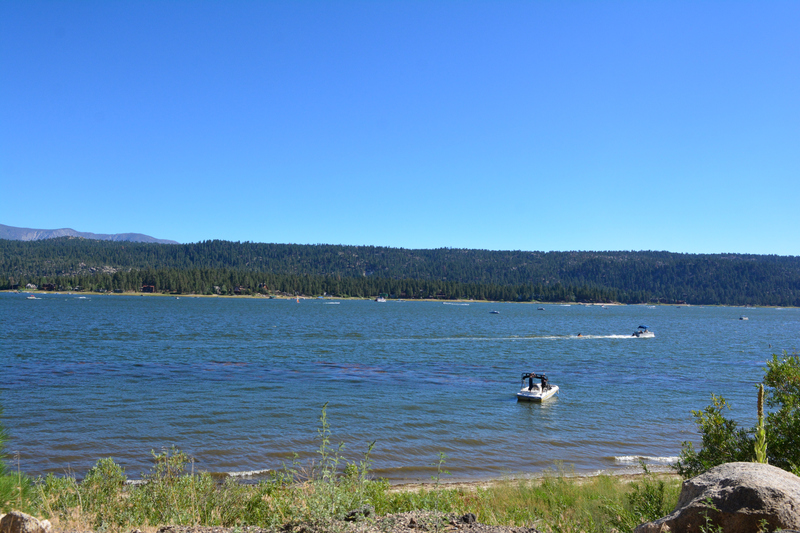 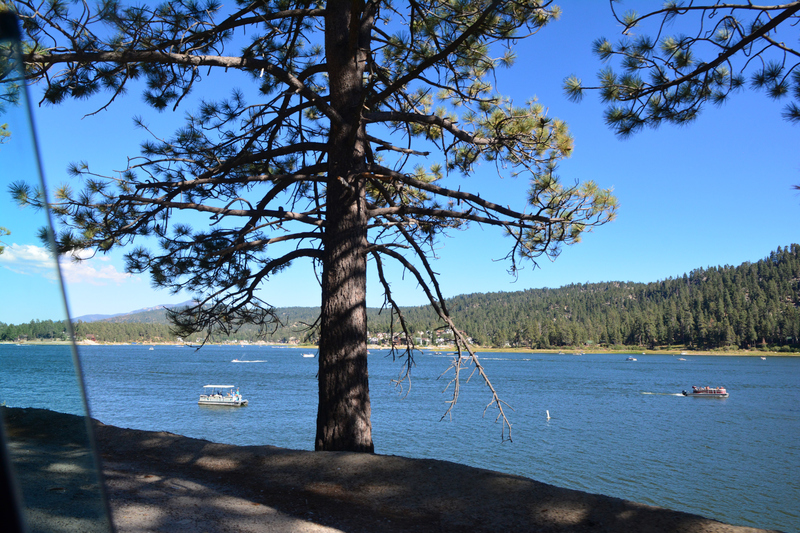 High winds, some clouds, some sun and temps in the 70s. 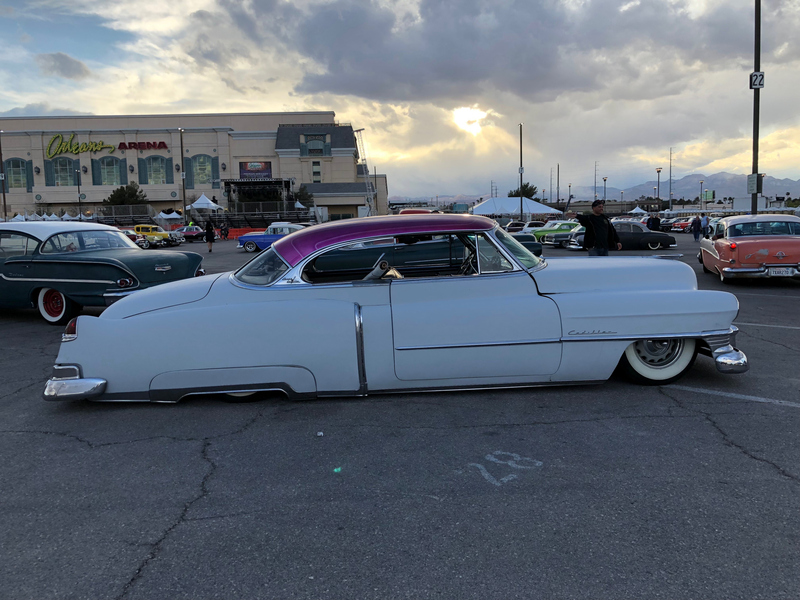 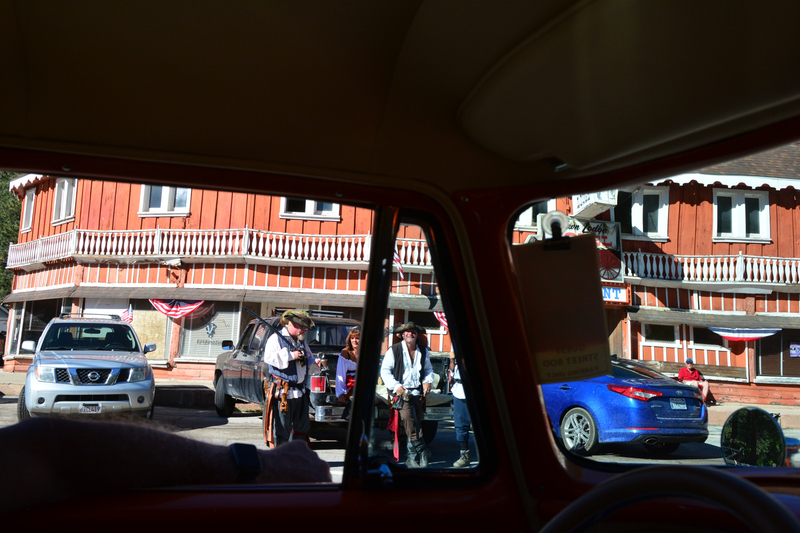 Having more than half of the cars inside was a good deal since it gave us a chance to get out of the wind and sun for awhile. 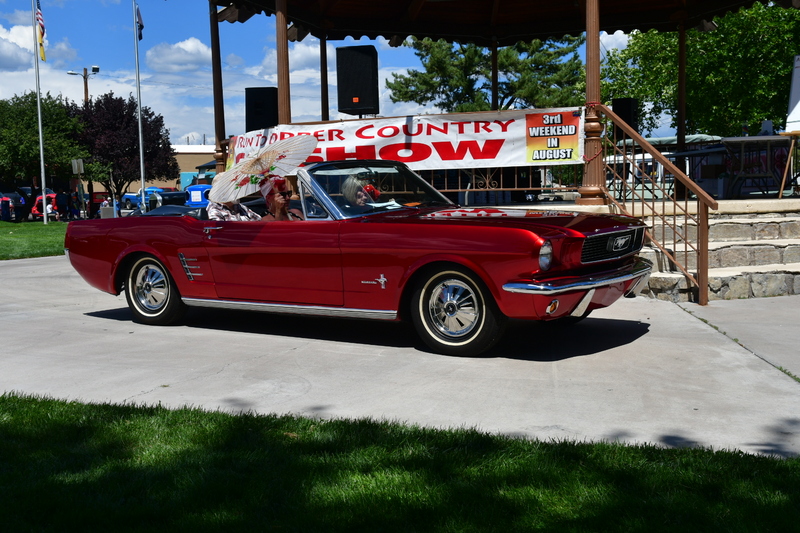 Another nice part of the show was that they had some decent live entertainment on stage for much of the time. 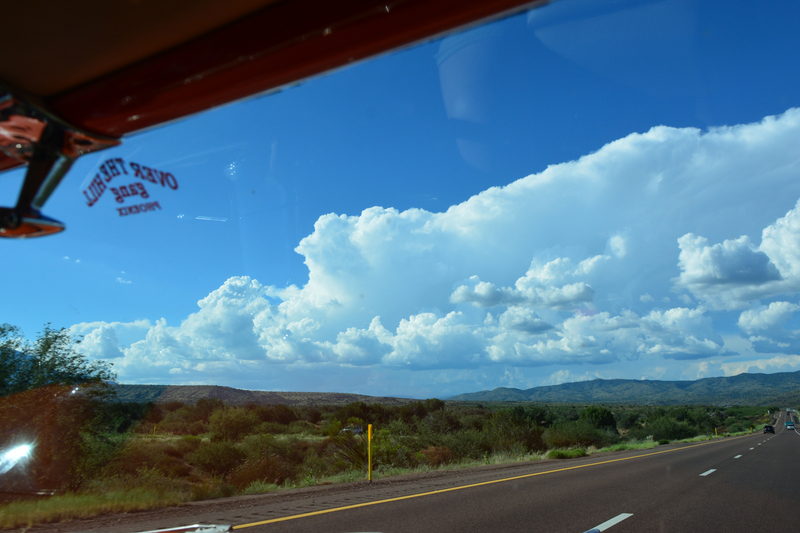 By 3:00 PM on Saturday the winds had picked up, dust was flying and the clouds looked pretty ominous so we high tailed it to the hotel. 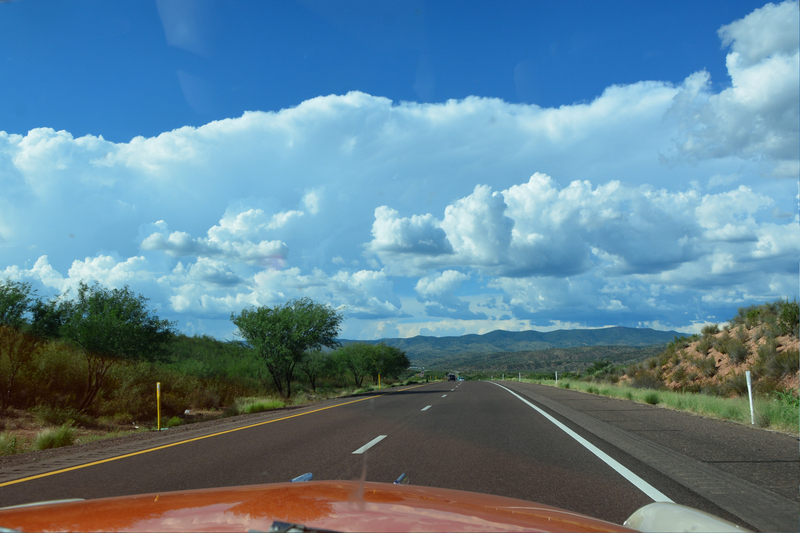 Fortunately, it blew through rather quickly and we were treated to a nice evening. 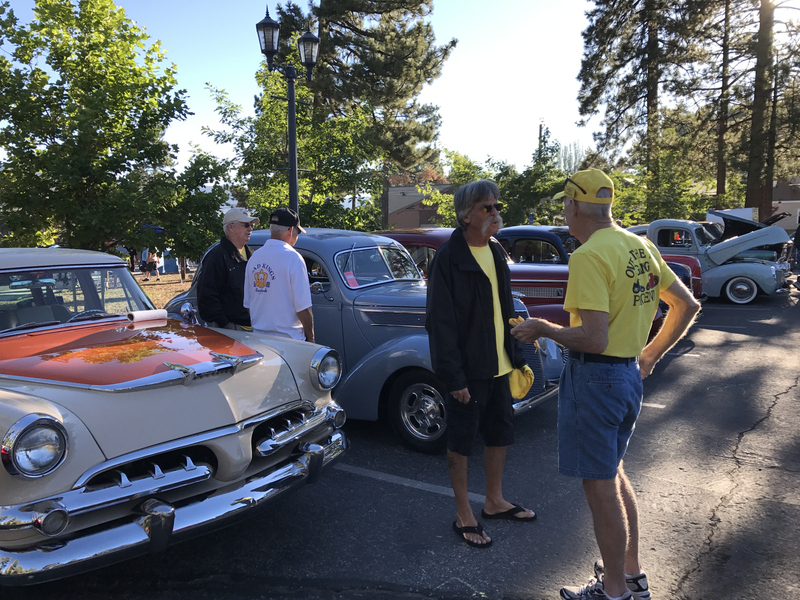 The awards were handed out on Sunday in a very nicely organized way with the winners walking up a ramp to the stage for the presentation and photos. 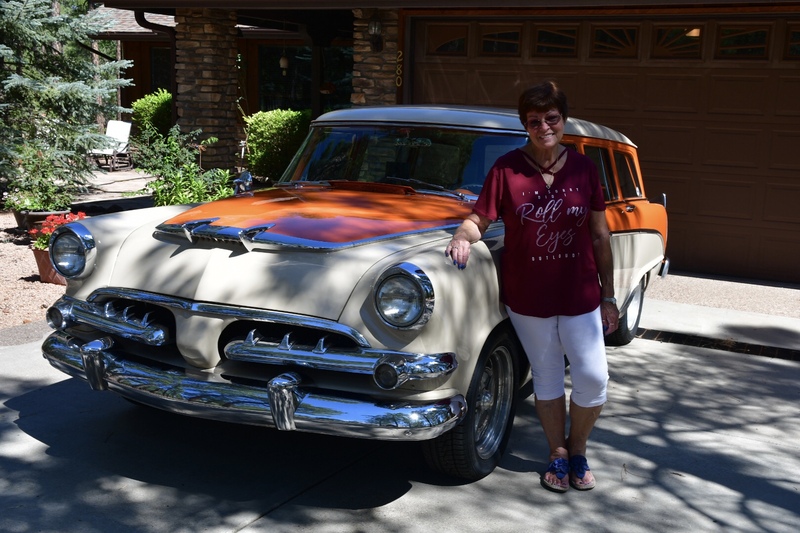 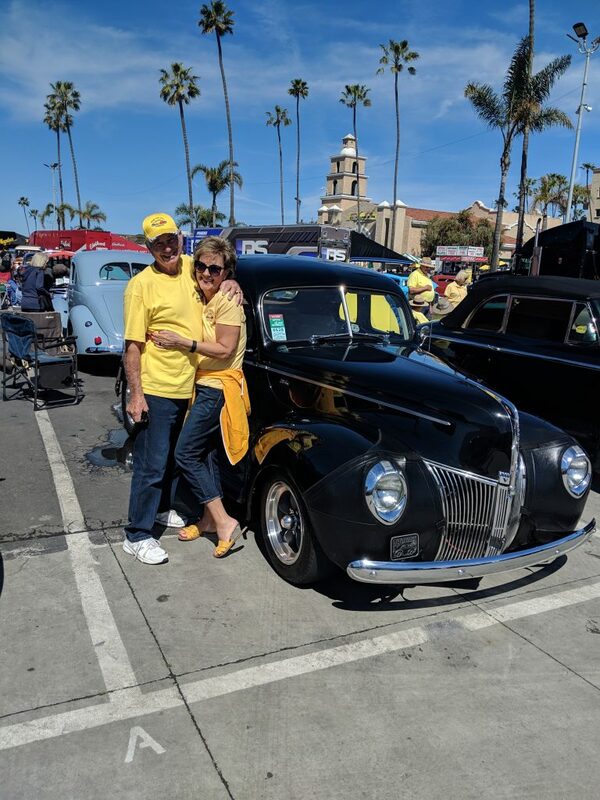 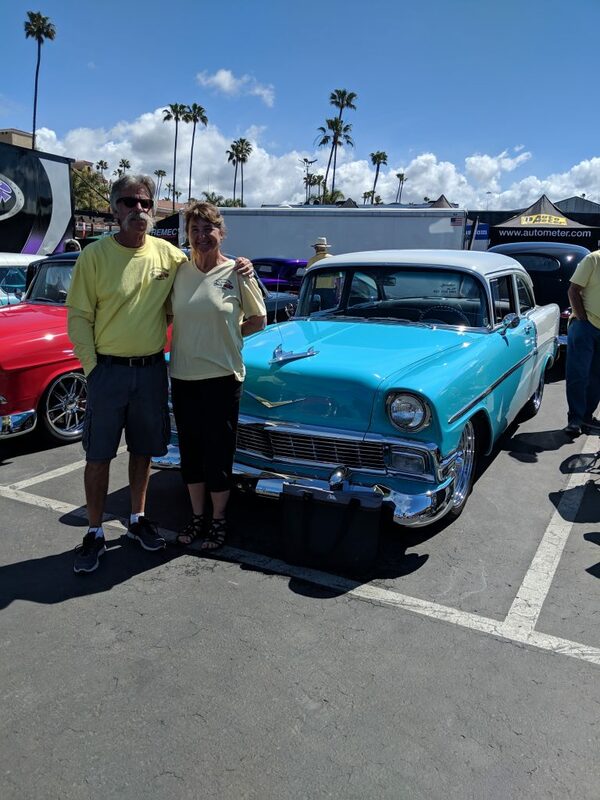 Frank & Rose picked up an award in the Pre 1959 Custom & Modified Class and more importantly the Long Distance Award which included picking up the cost of their hotel room for both nights! 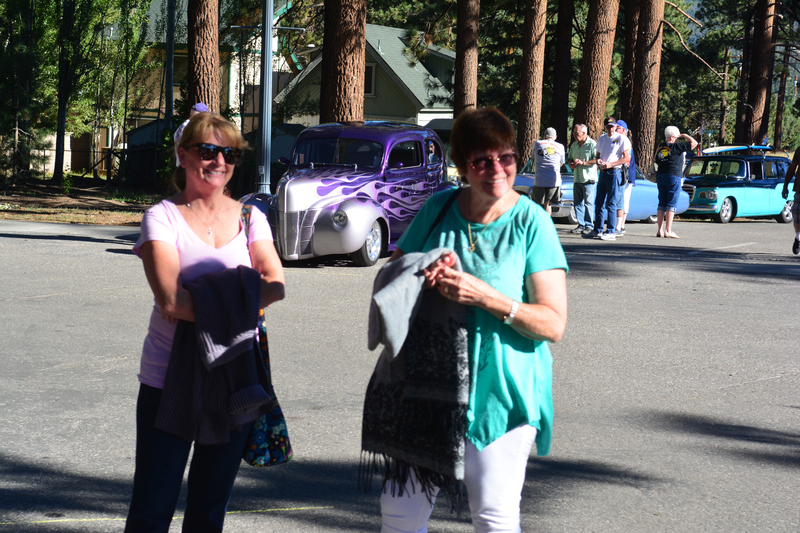 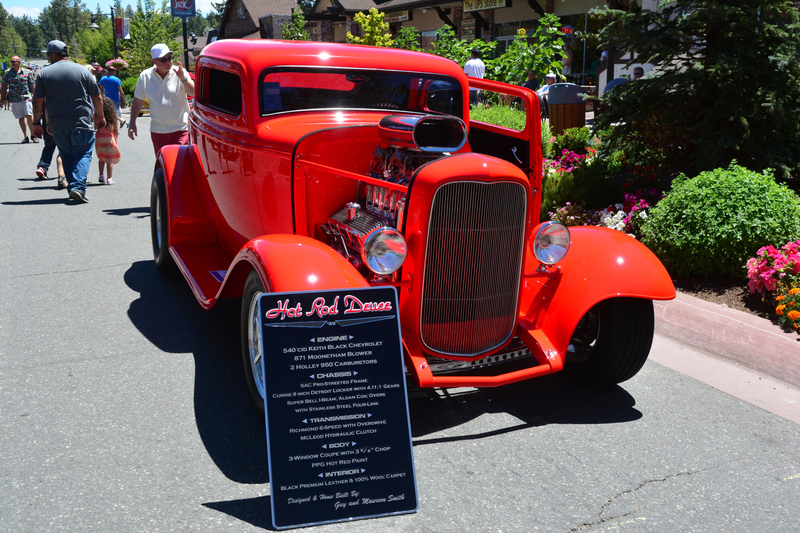 Michele & I were shocked to learn that we got an award for Street Rod Sedan class, our old driver rarely gets a nod. 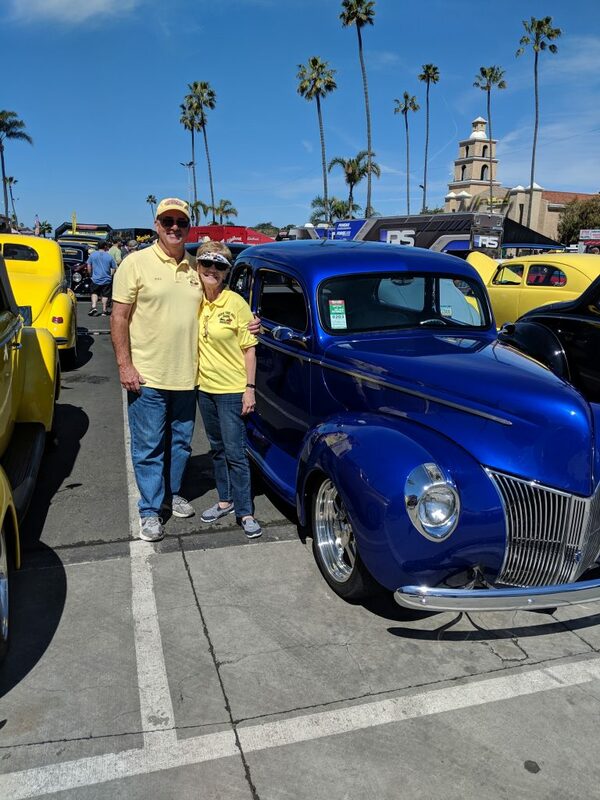 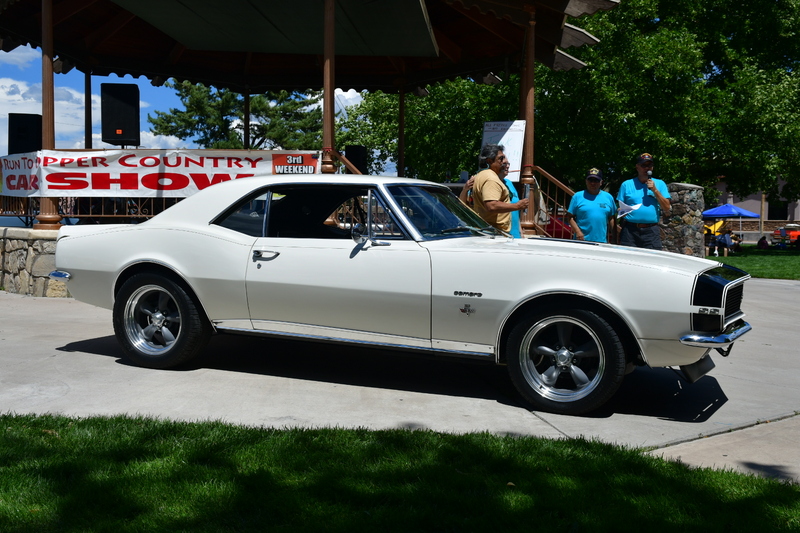 Al & BJ received an award in the pre 1970 Muscle Car class, Phil and Linda were awarded a trophy in the pre 1970 Stock class. 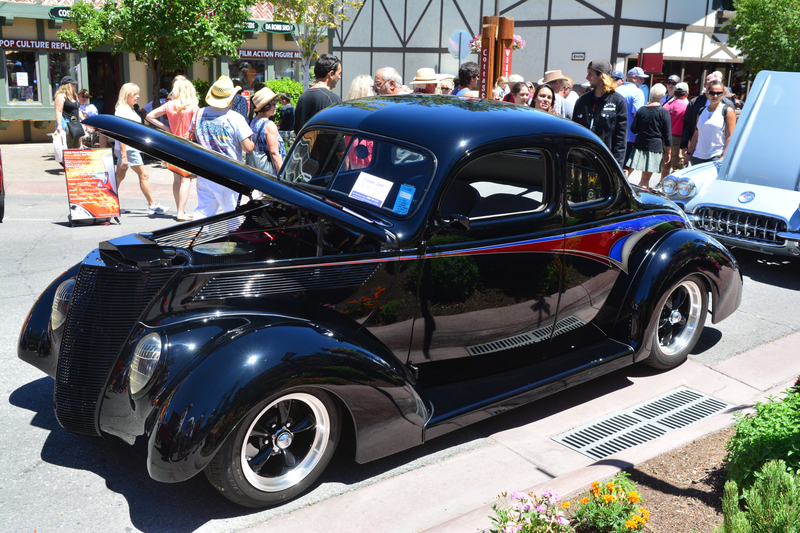 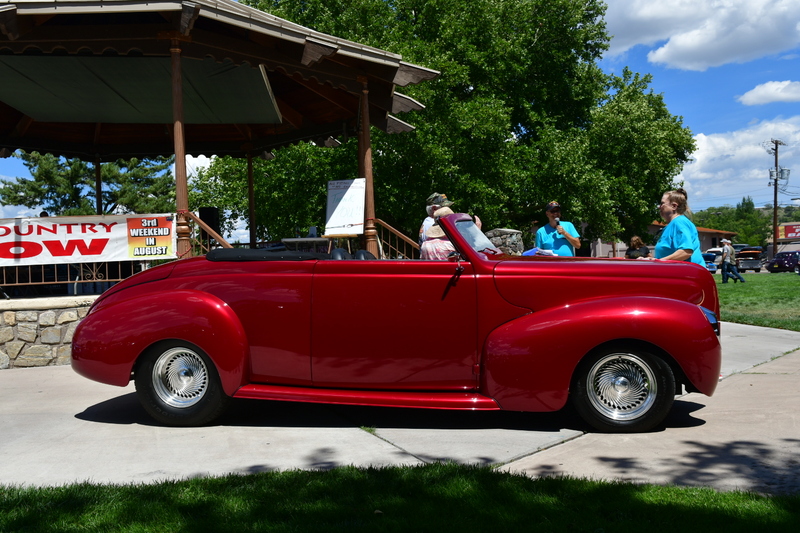 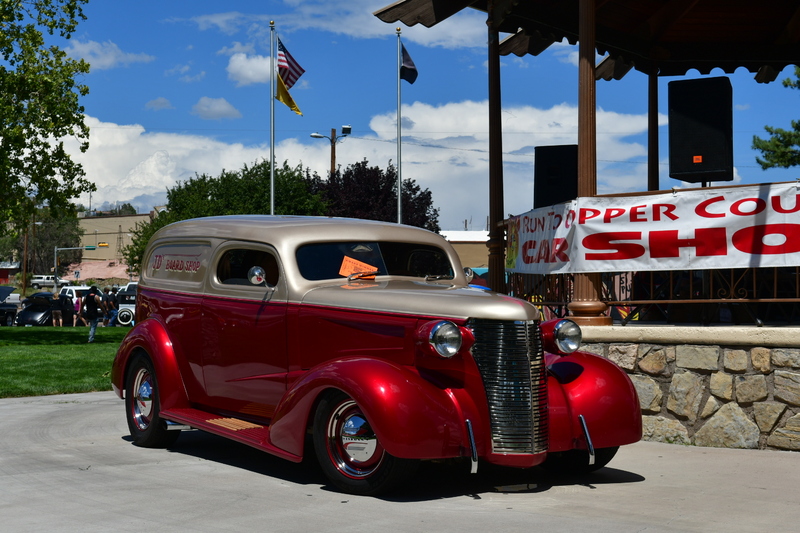 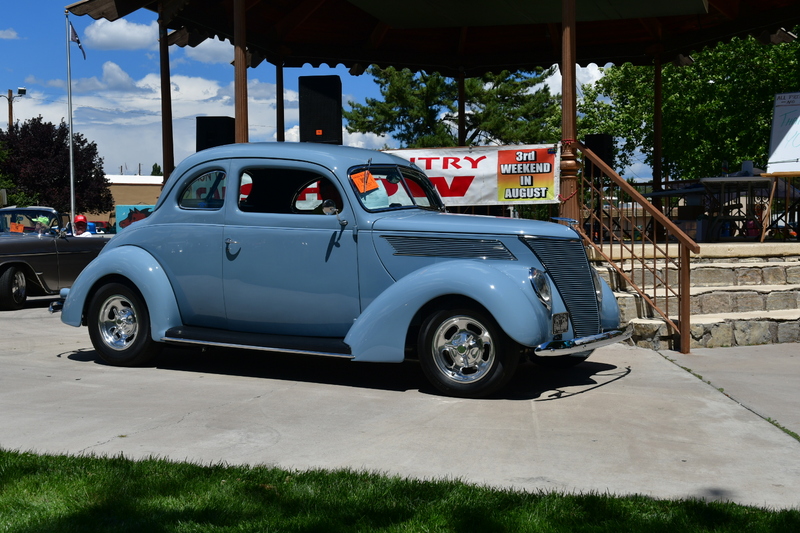 Bob & Ona’s 1938 Ford was the Goodguys Rep Pick and they also received the Horsepower Ranch Pick (one of the larger hot rod shops in Farmington). 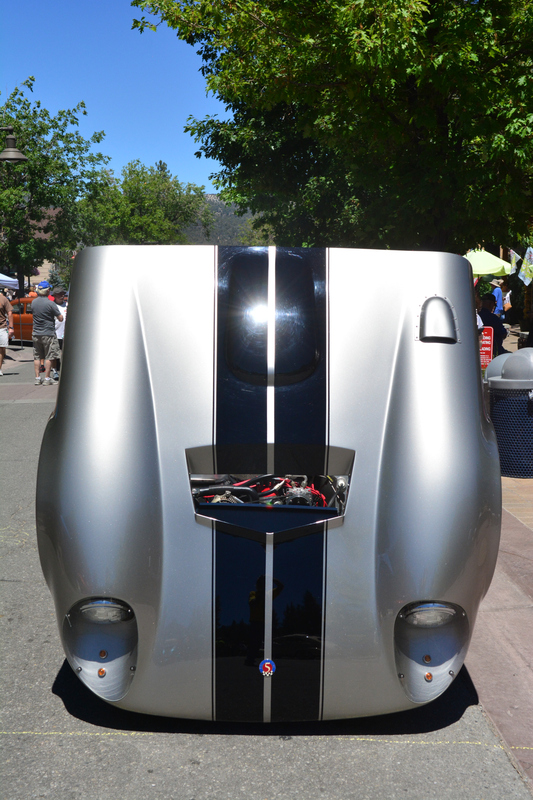 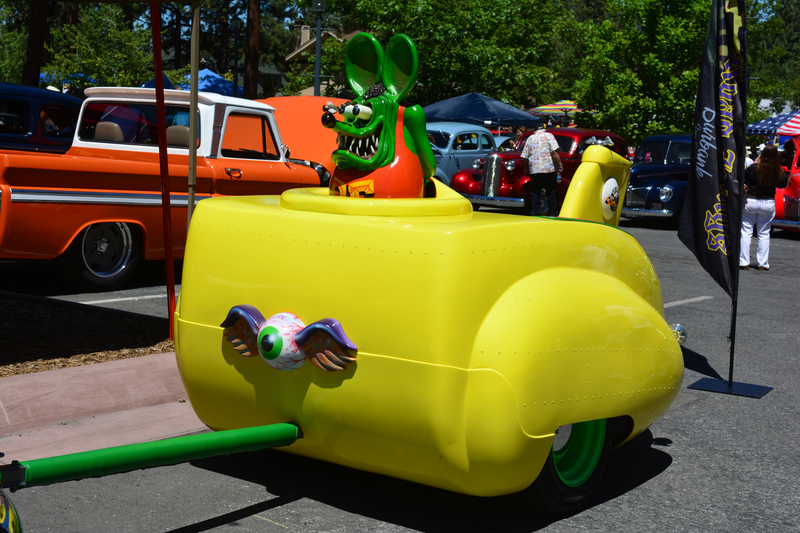 The owner’s comment was that Bob built the car like he would. 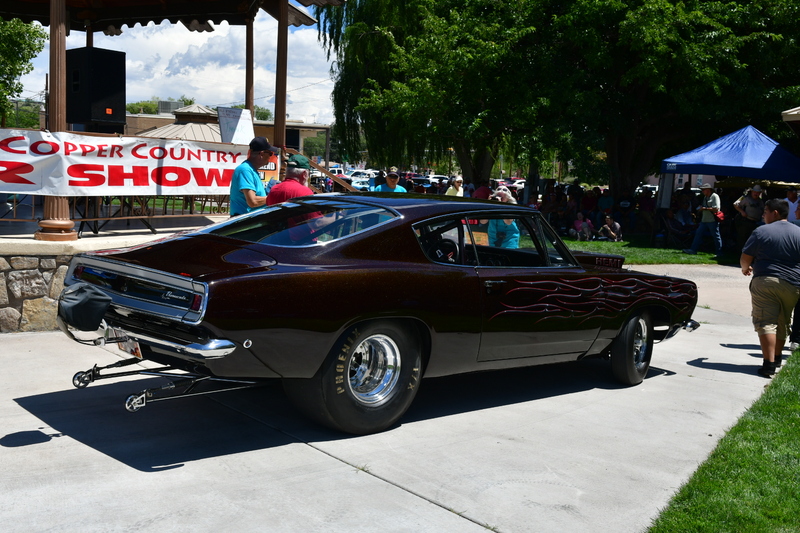 In my opinion this was a very well organized and run show. 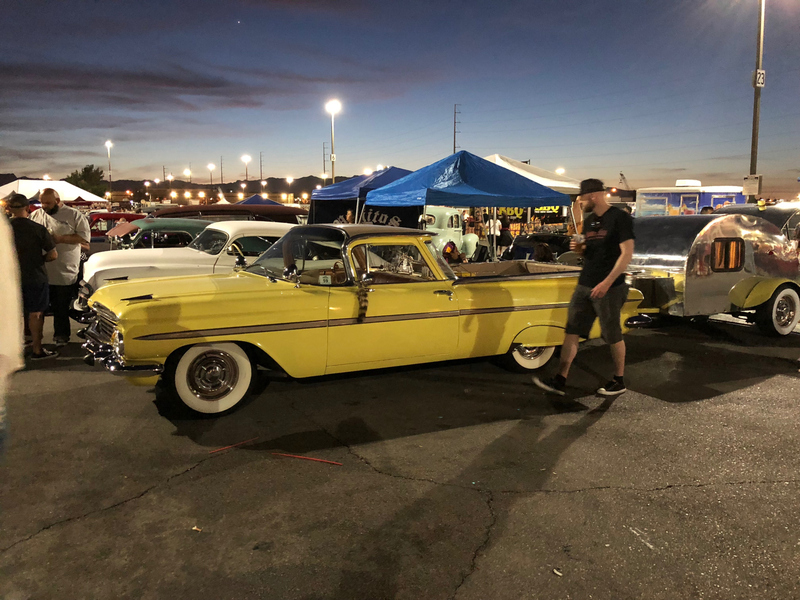 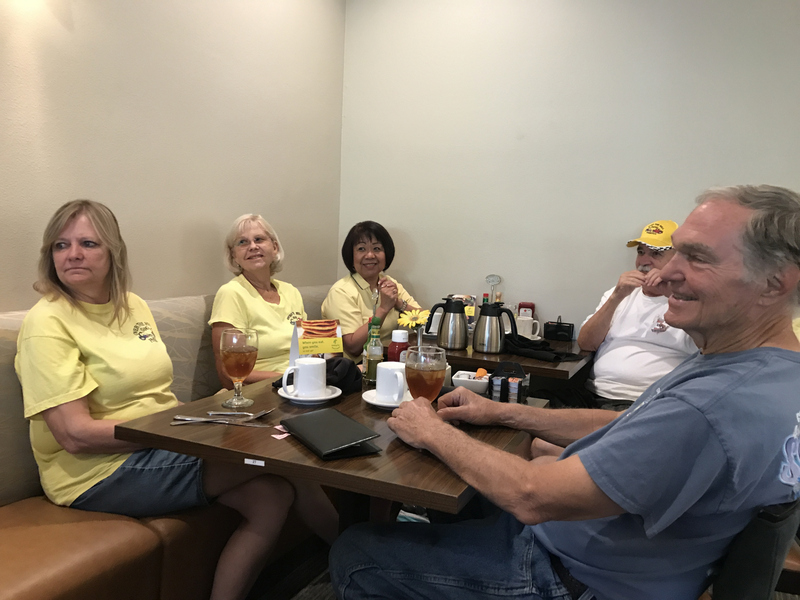 Everyone was very courteous and helpful and all four of us yellow shirts had numerous people come up to us and thank us for making the trek up to Farmington and they all really appreciate the time and effort that the club puts in at Scottsdale Goodguys which is their favorite big shows to attend. 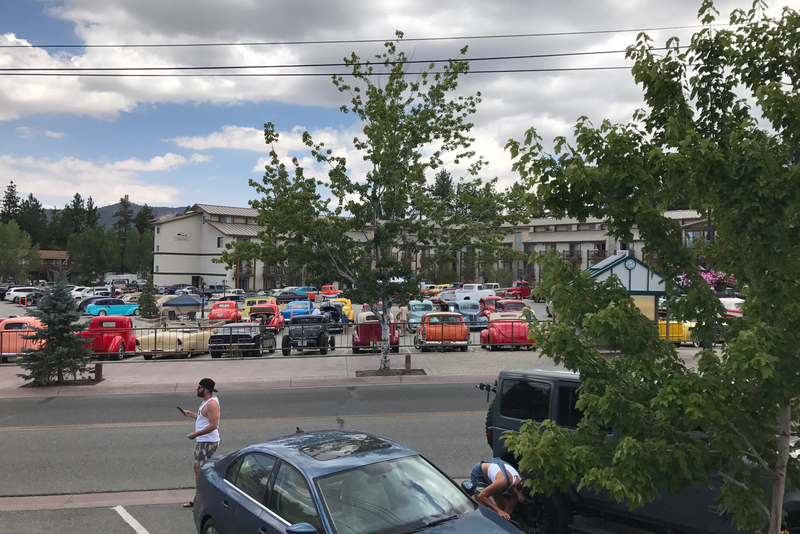 For those of you in the club that are looking for shows to attend outside of California, you should give this one a try! 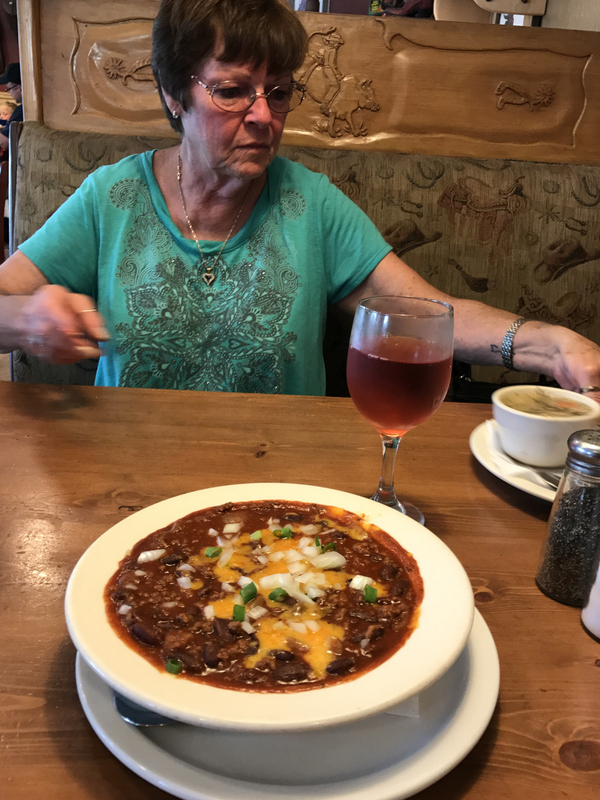 Oh, by the way the food that they had on offer was excellent! 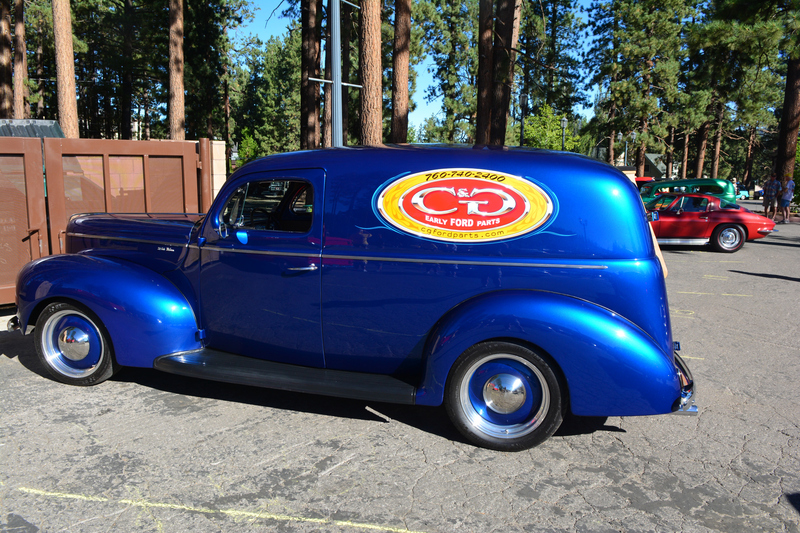 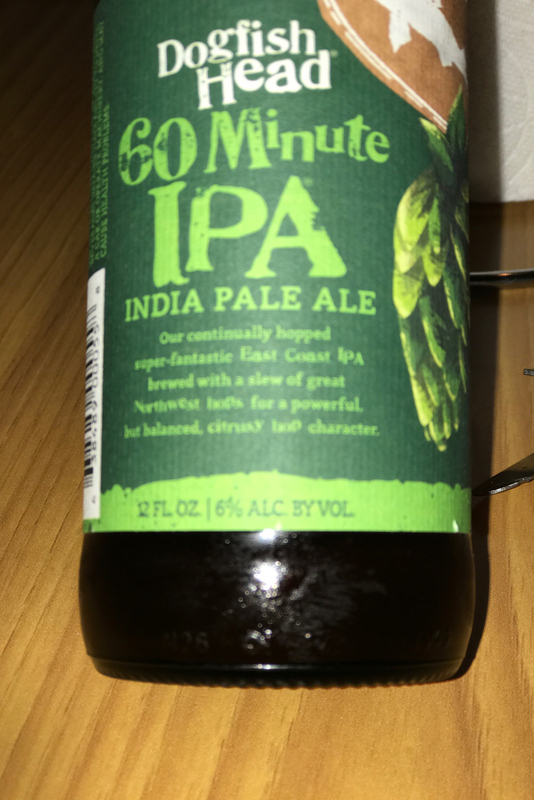 The breakfast burrito is outstanding as is their burgers, and unlike Goodguys, reasonably priced!